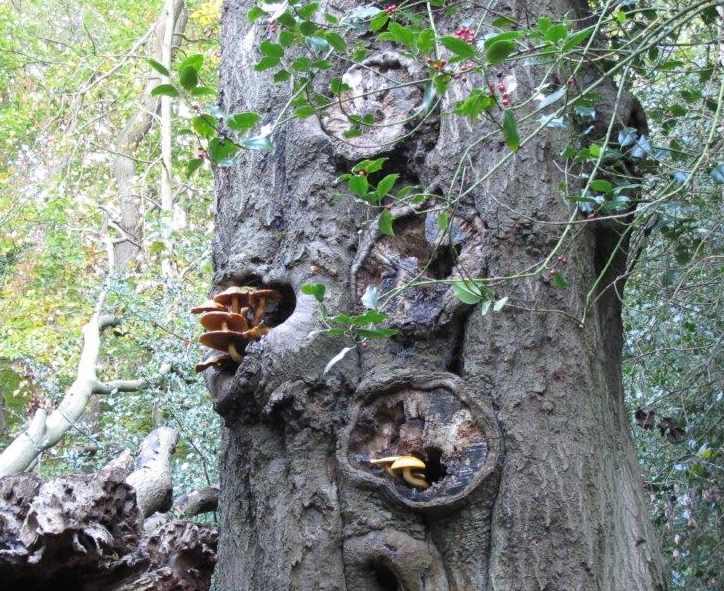 We have a booklet entitled "Selsdon Wood Nature Reserve - Its history and Management: Some records of Flora and Fauna" which was produced in 1978 by Jack Penry-Jones on behalf of the Croydon Natural History and Scientific Society. 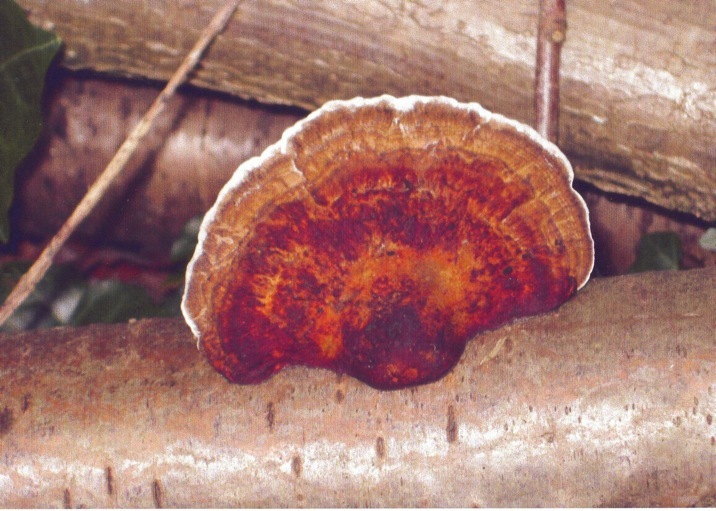 This lists the fungi seen in a survey of 1976 - these observations were undated so we do not know the month. 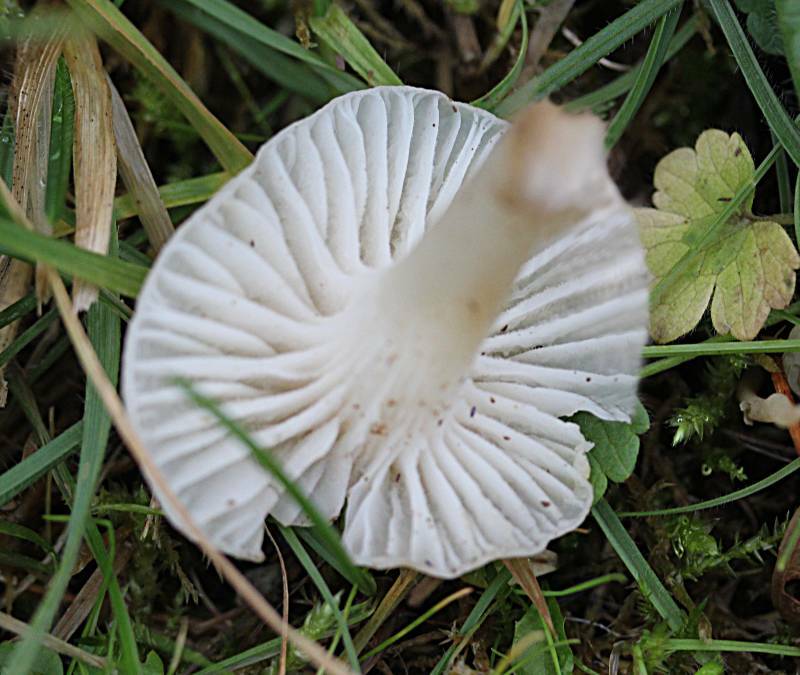 Regular observations began in 2010 and a full species list is available as a downloadable pdf from the link below. 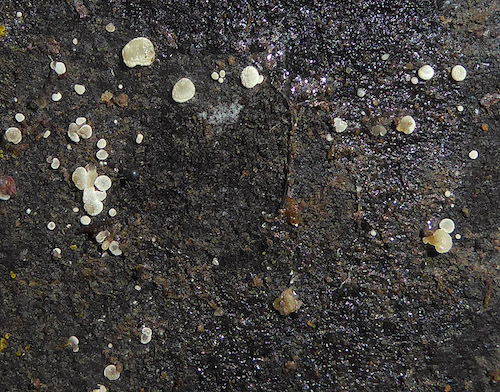 The galleries below show all the species that we have photographed. 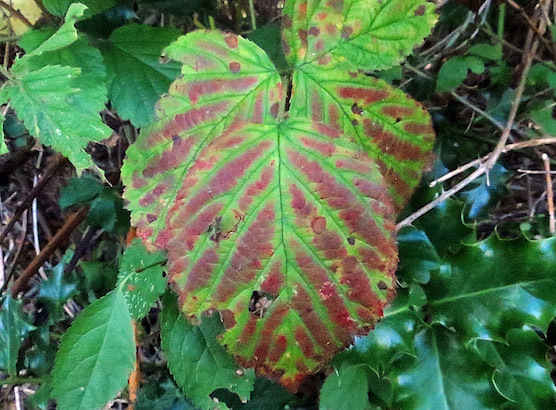 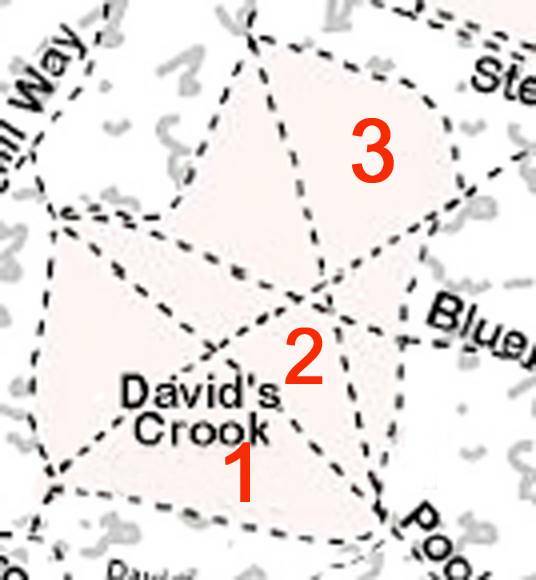 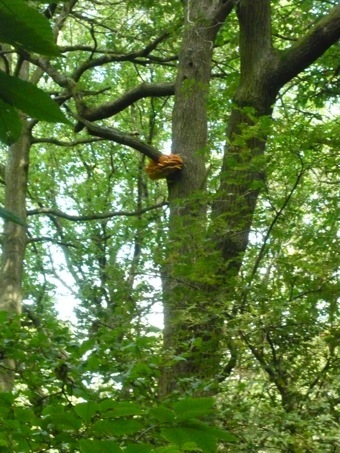 Species that have been observed but not photographed in Selsdon Wood are shown in red text in the listings. 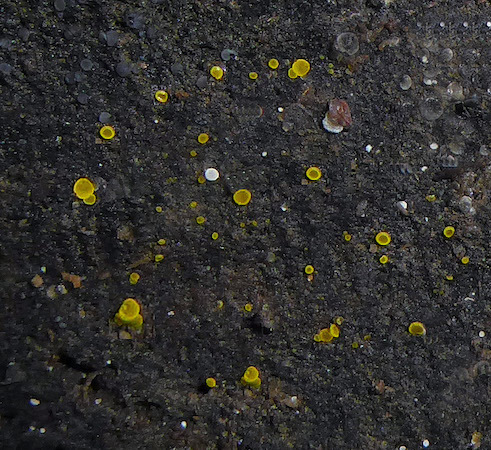 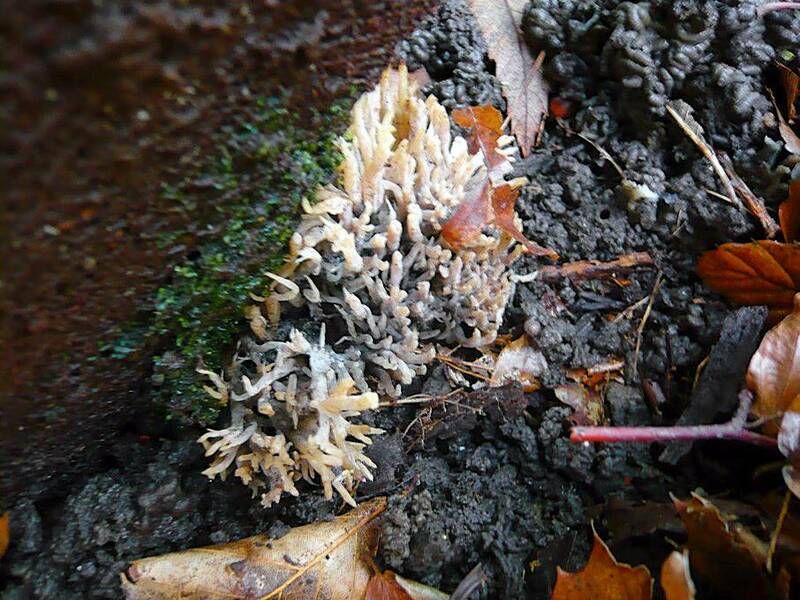 Although lichens and slime moulds are unrelated, both are related to algae which is why they have been grouped here. 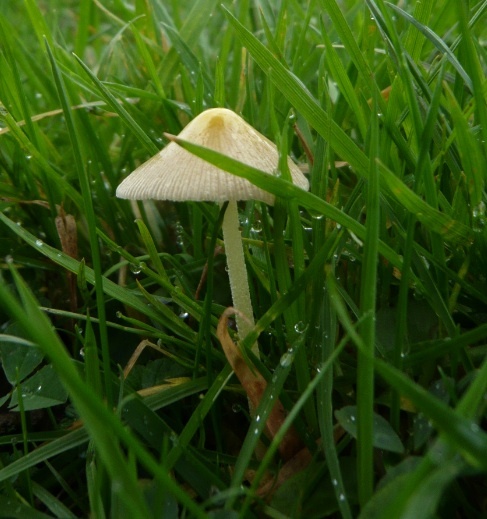 No observations of any of these were recorded in the 1978 Penry-Jones booklet. 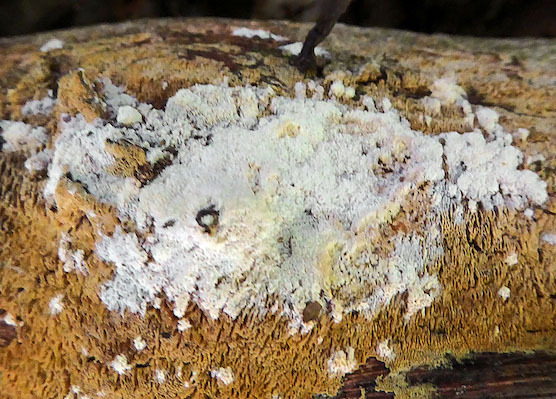 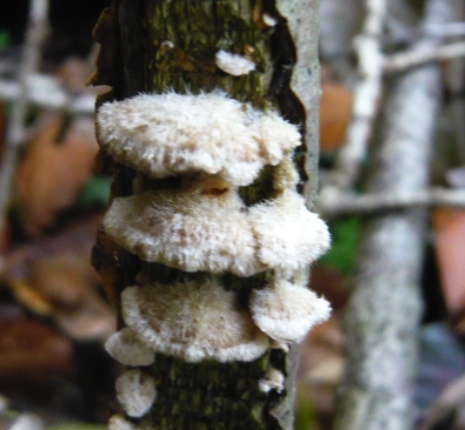 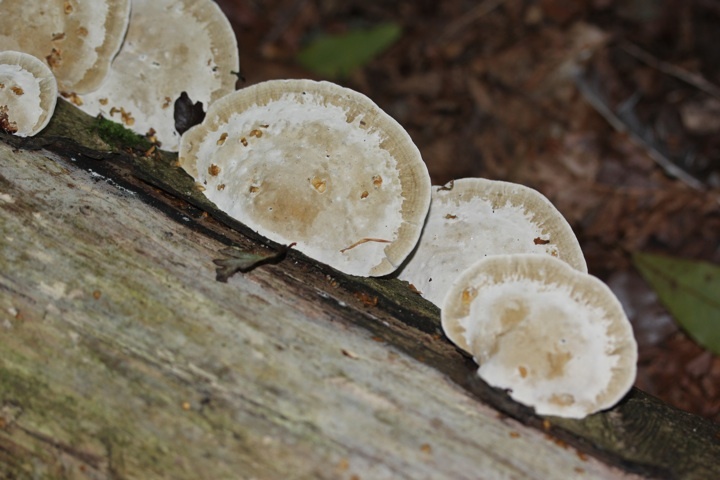 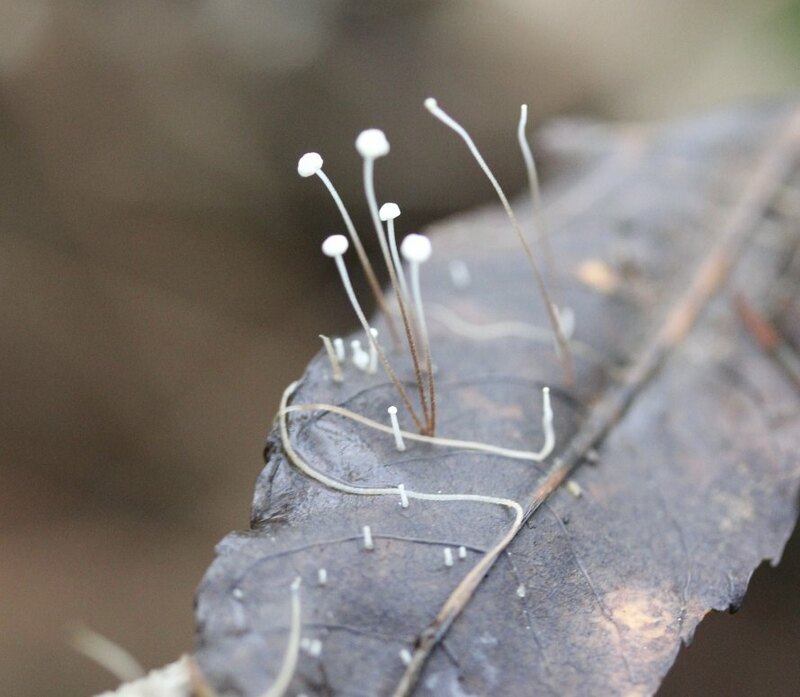 The precise identification of fungi is a complex process. 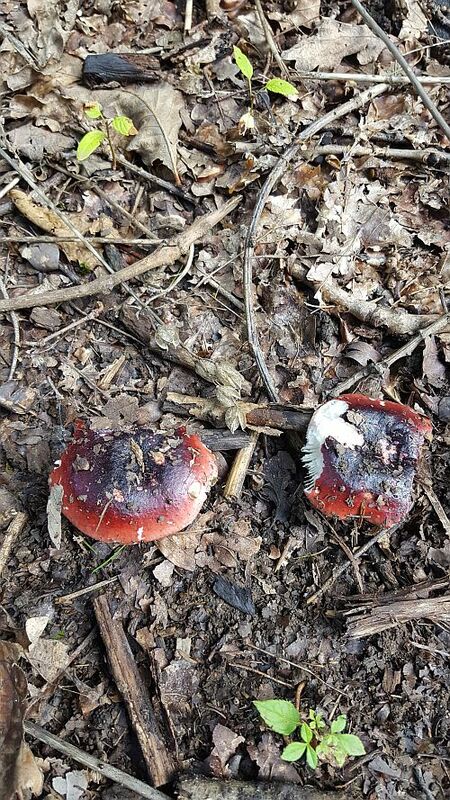 We have done our best but we are not experts and we thus advise caution in the use of our photographs as an identification guide since we cannot guarantee the accuracy. 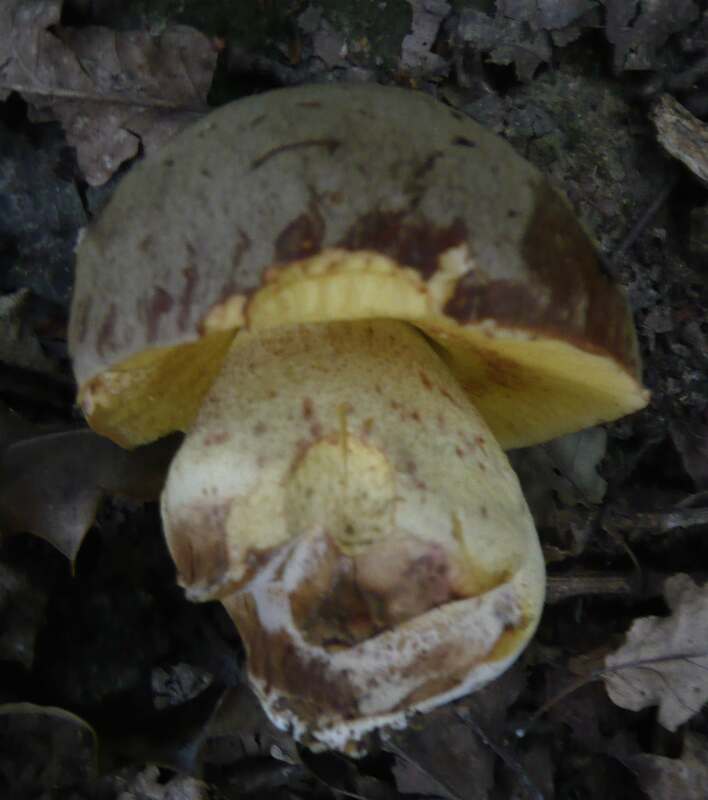 Hover over each image for information or click to see an enlarged version. 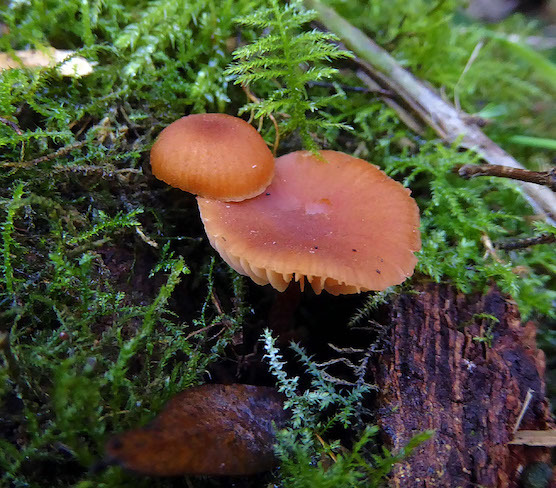 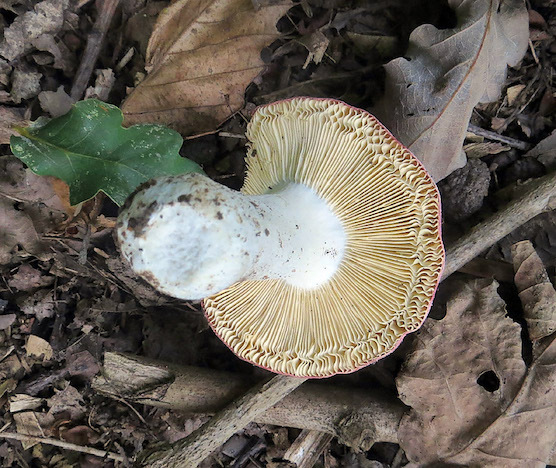 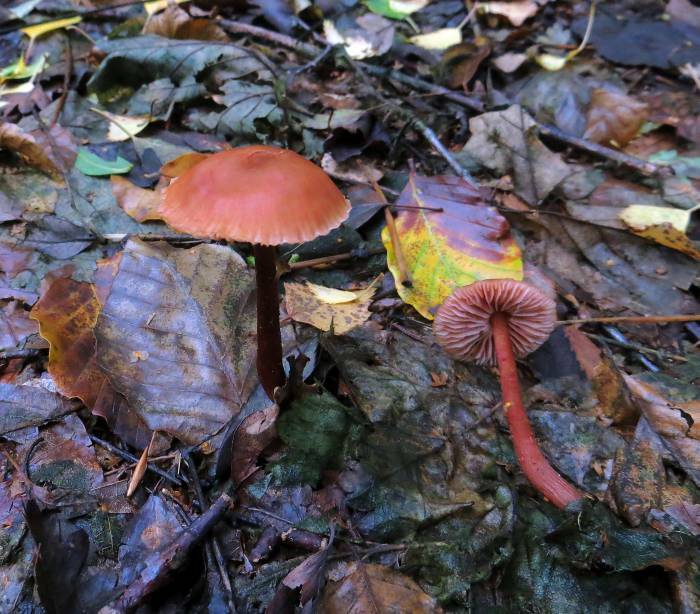 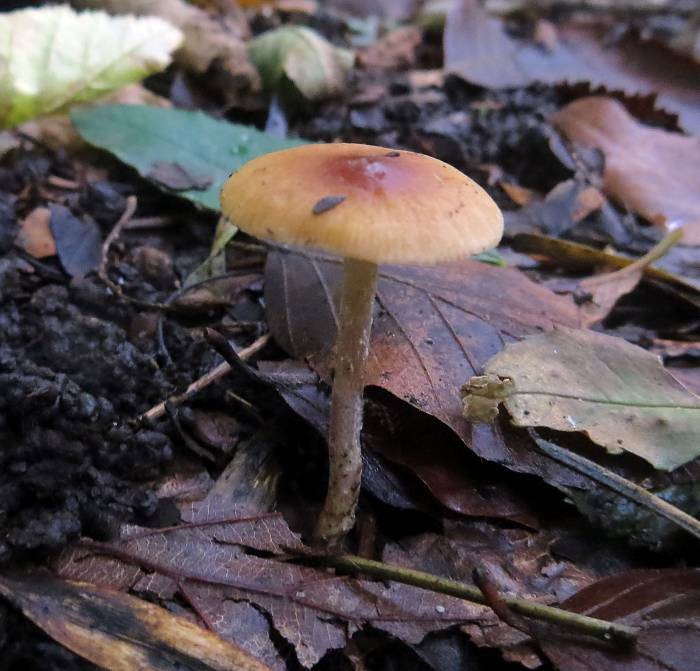 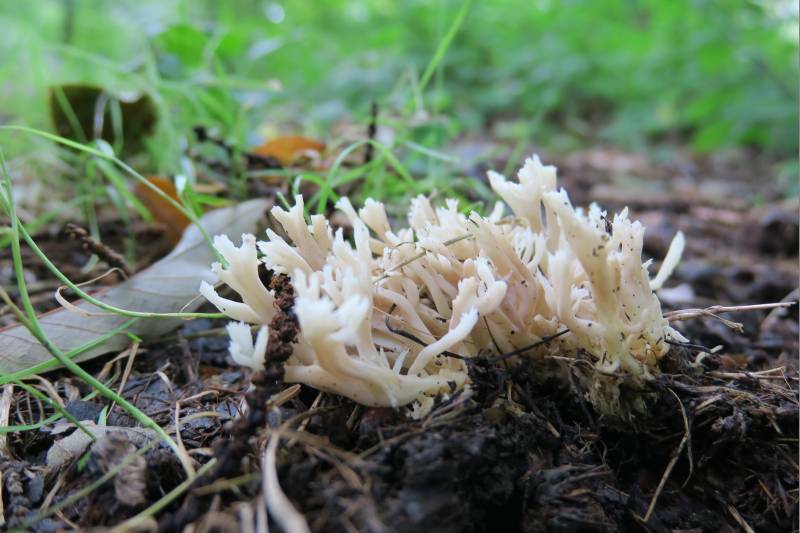 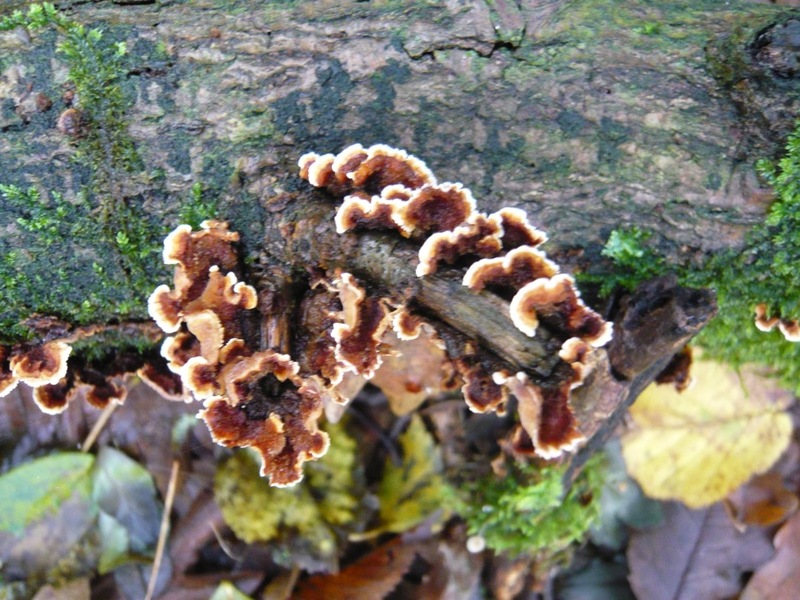 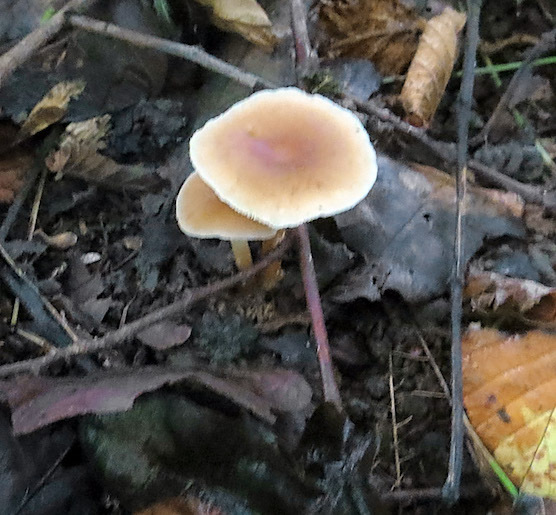 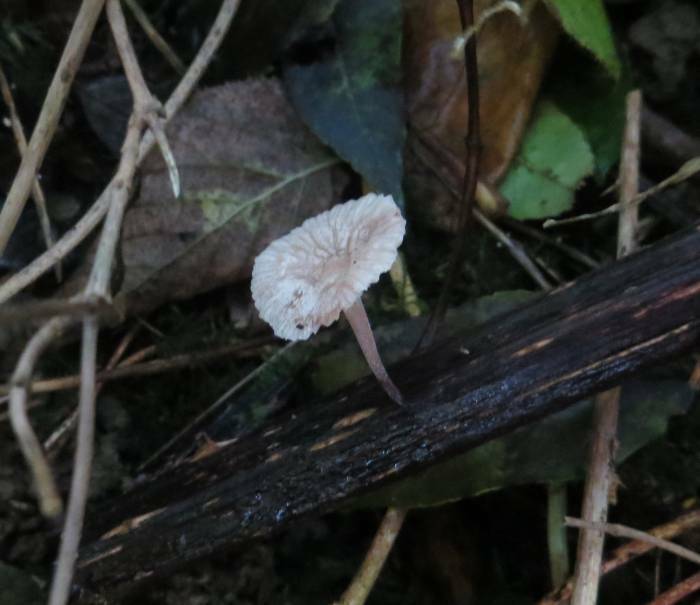 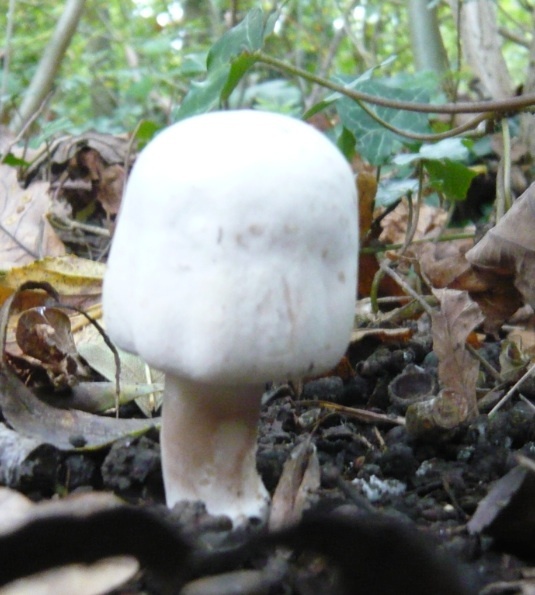 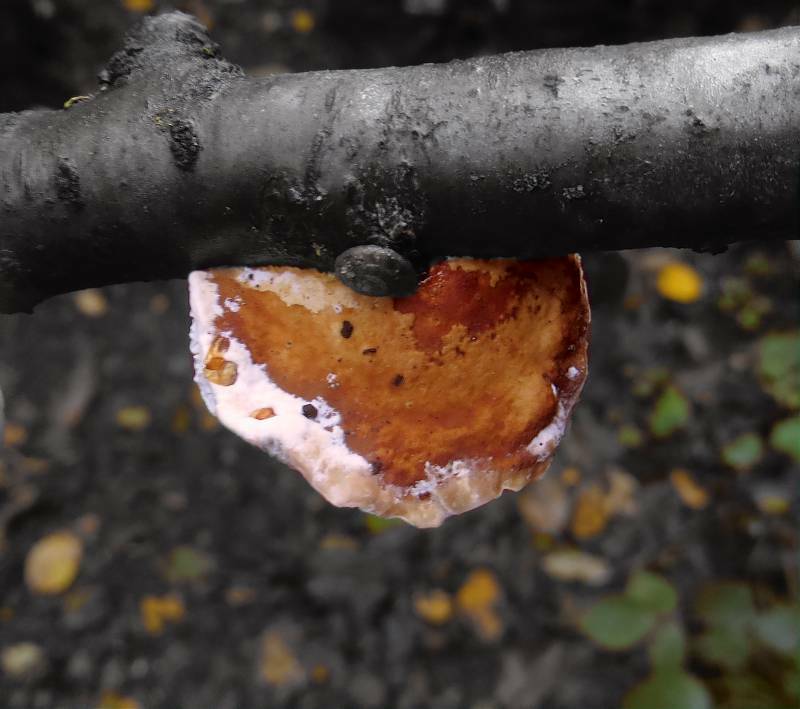 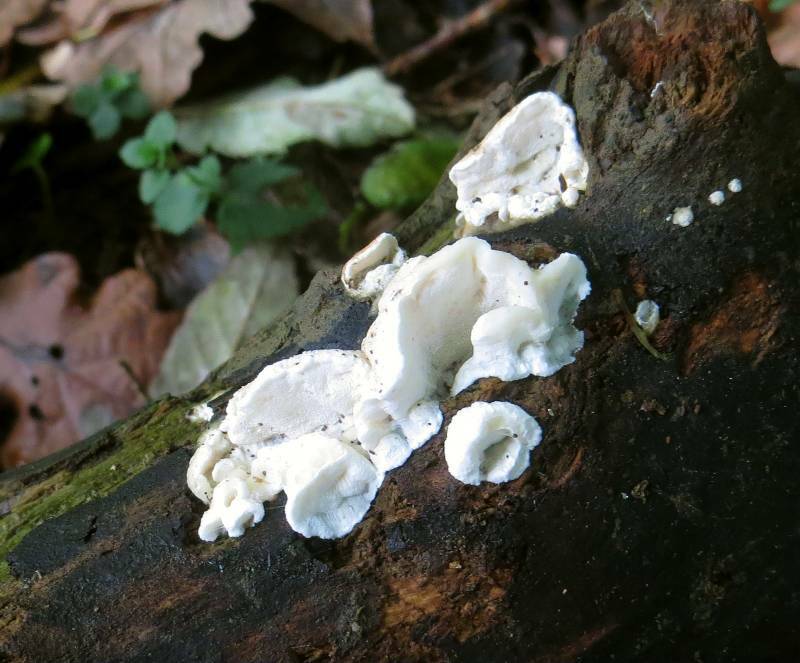 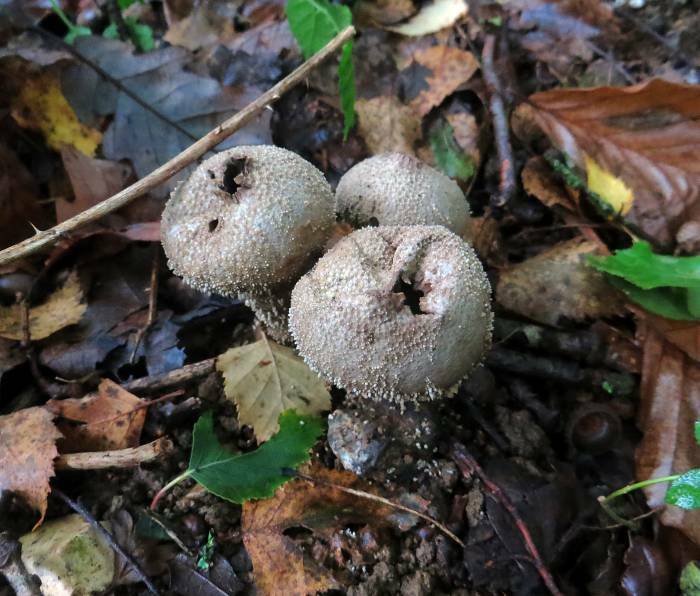 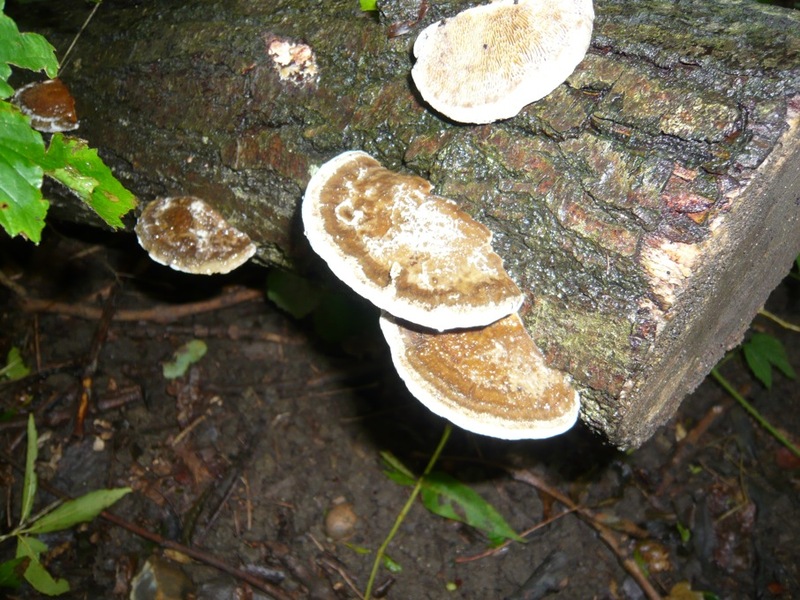 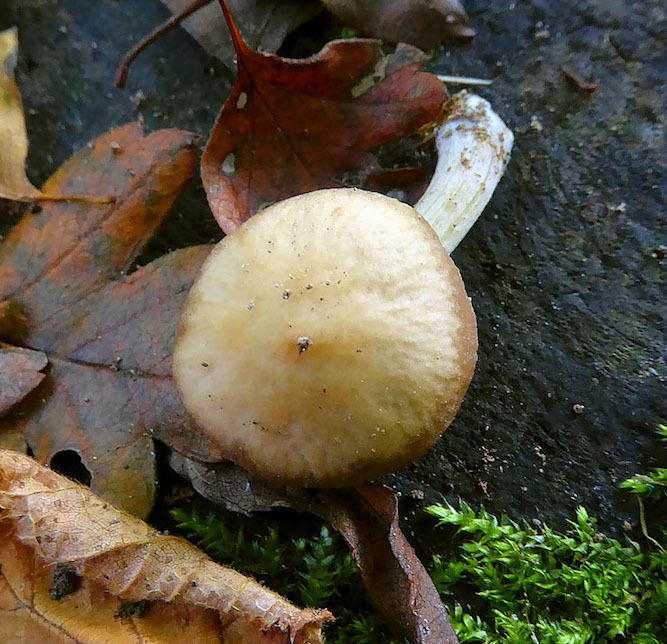 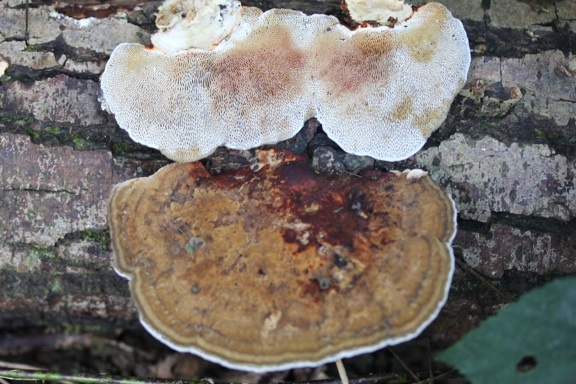 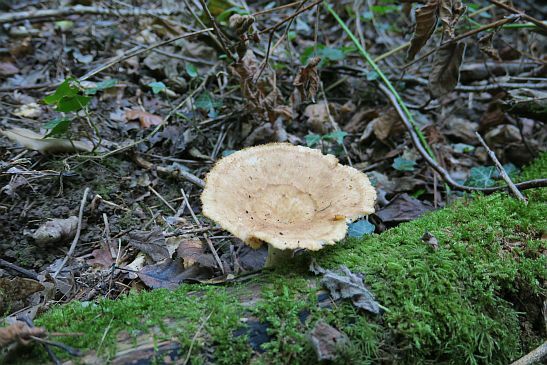 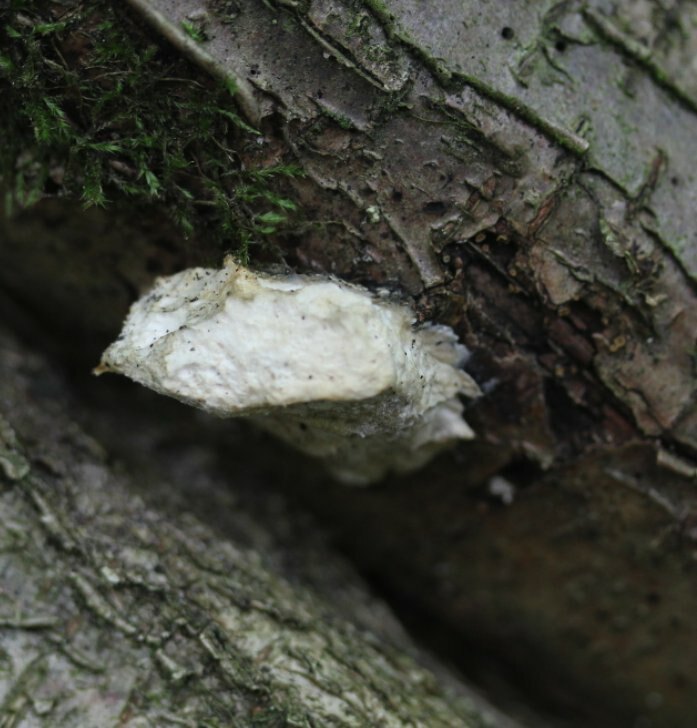 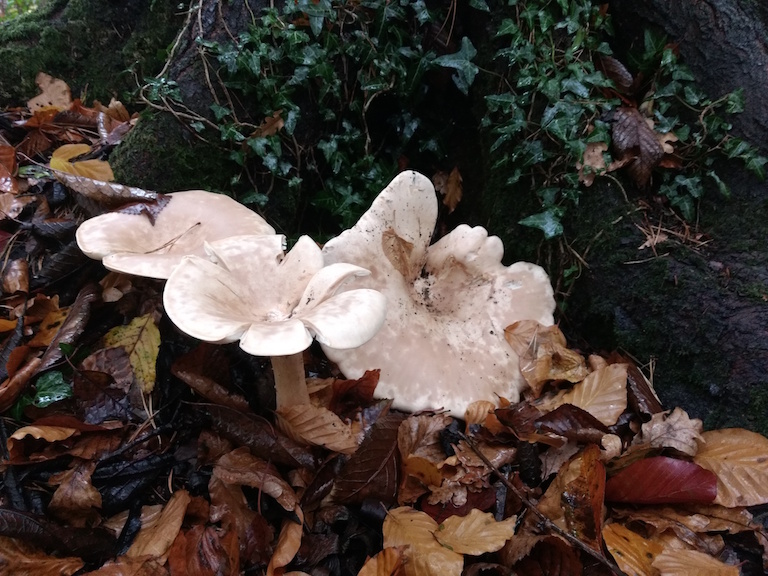 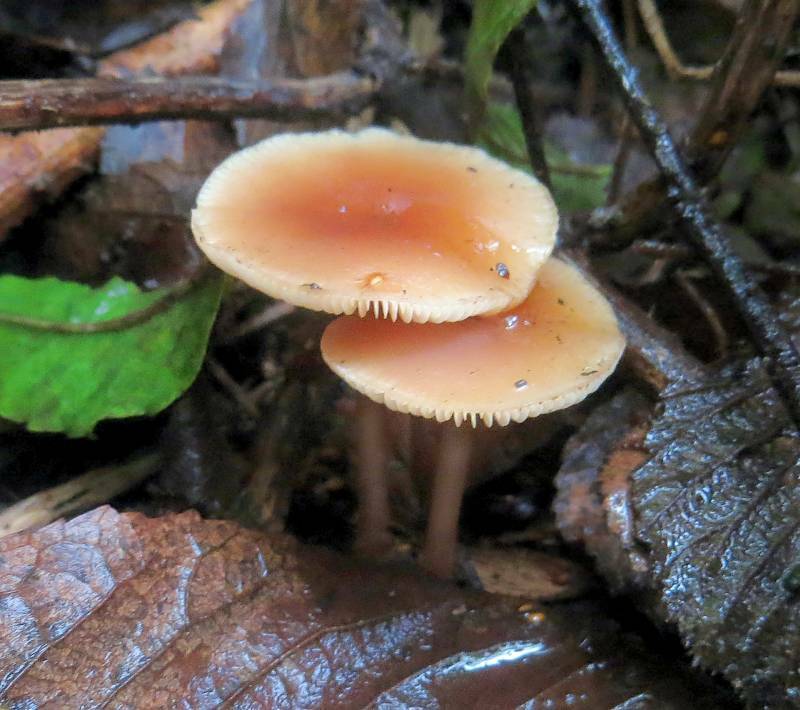 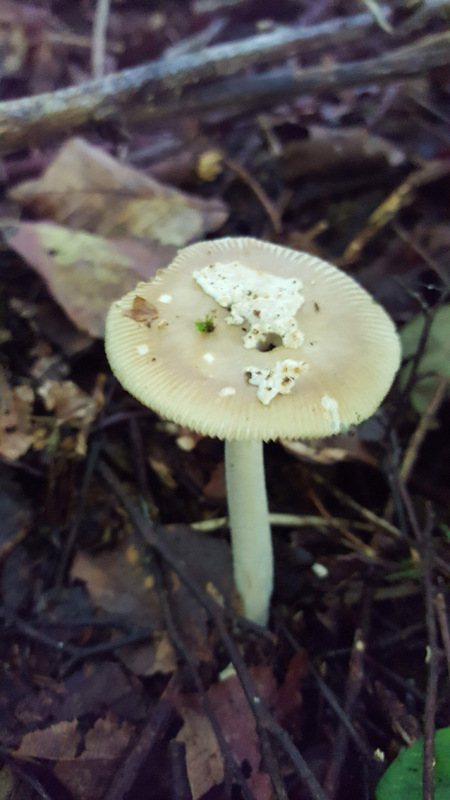 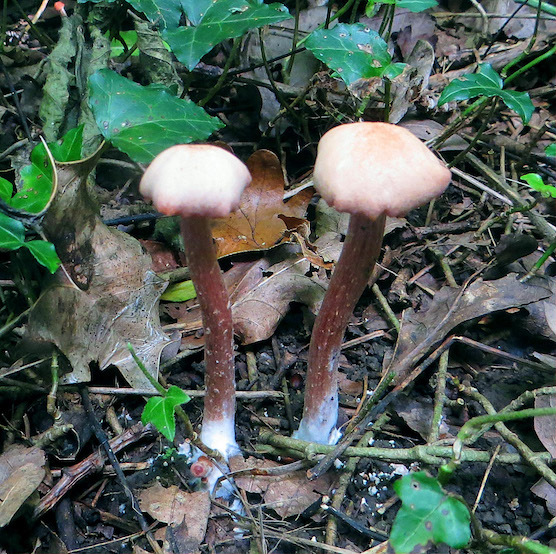 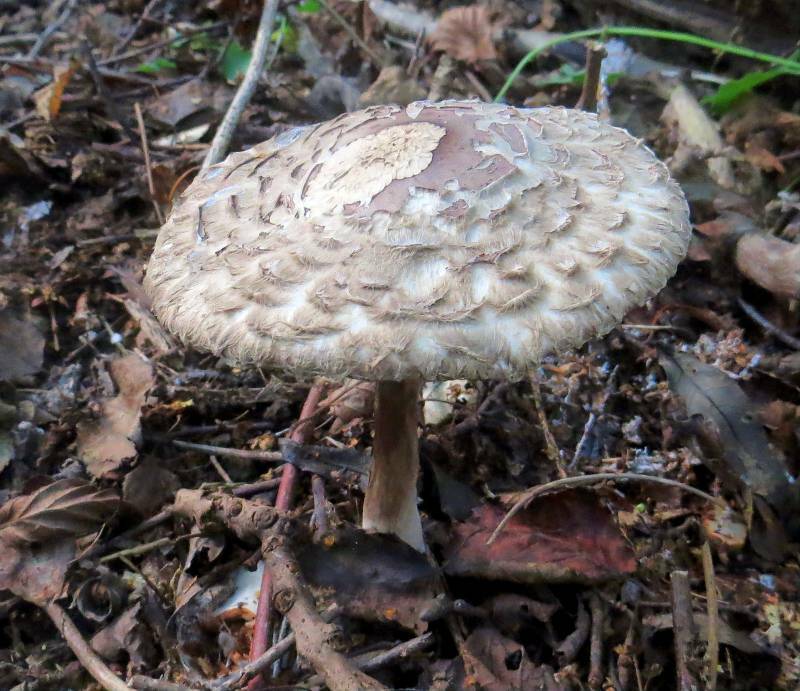 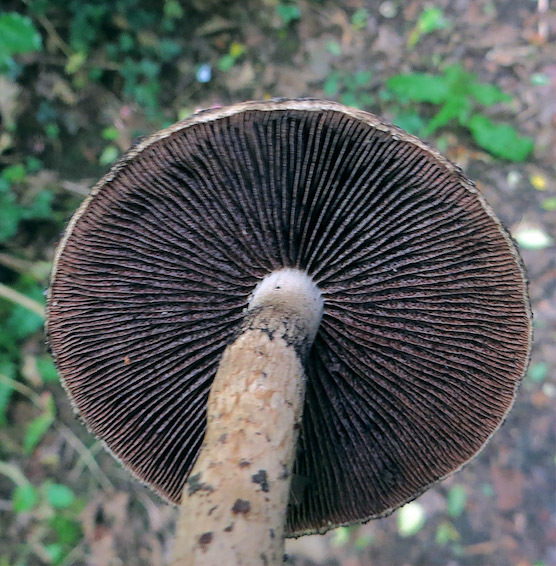 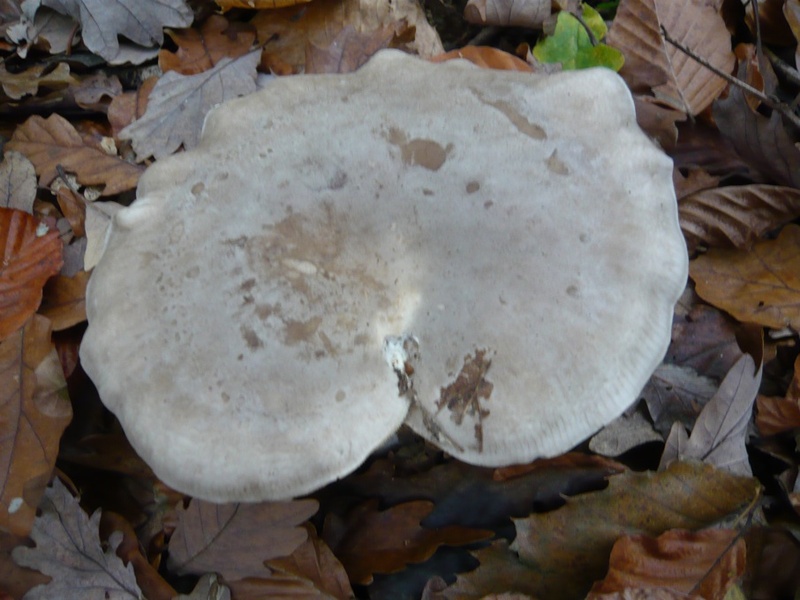 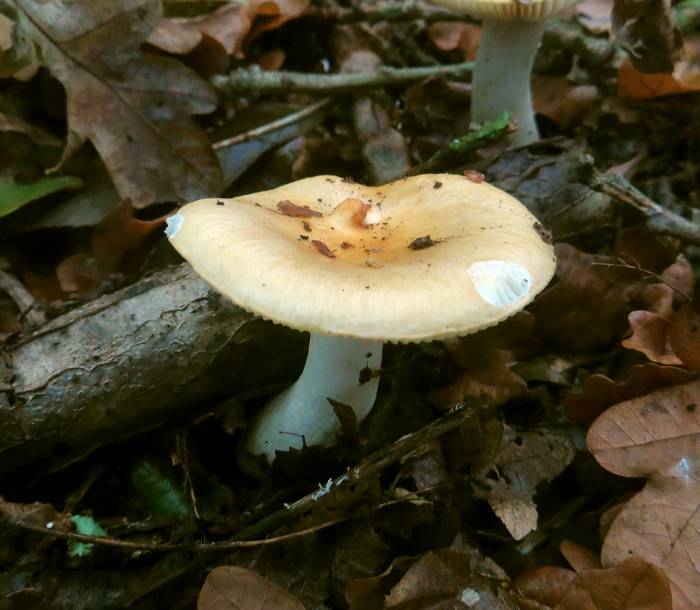 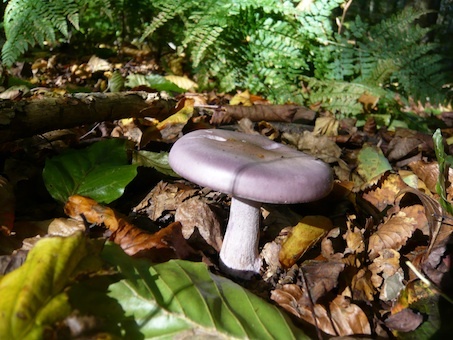 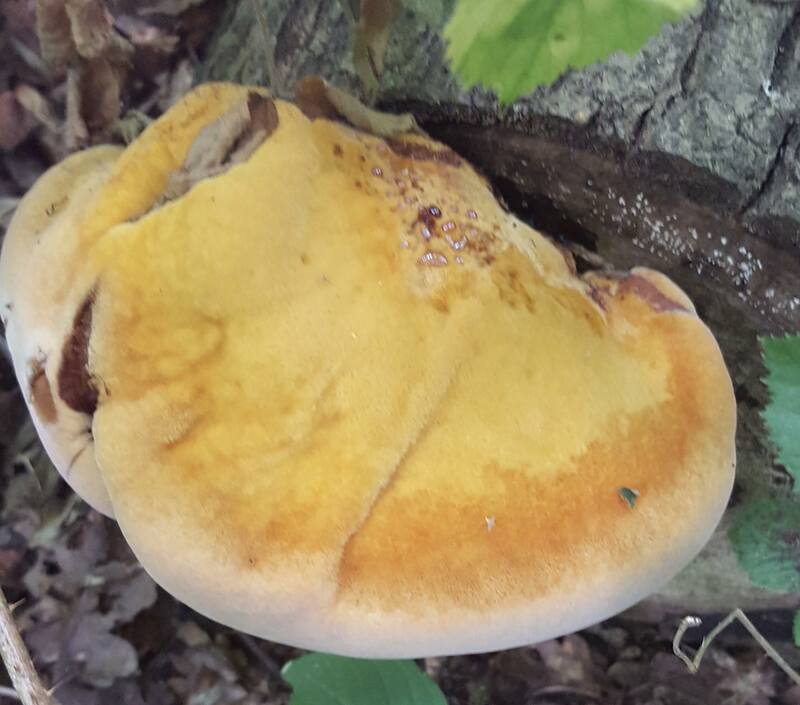 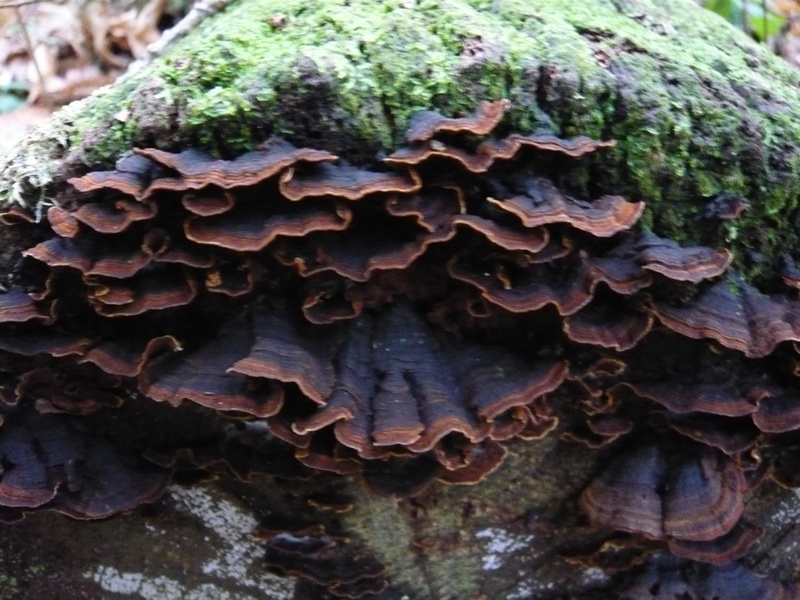 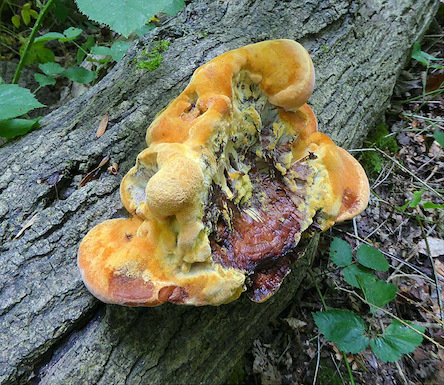 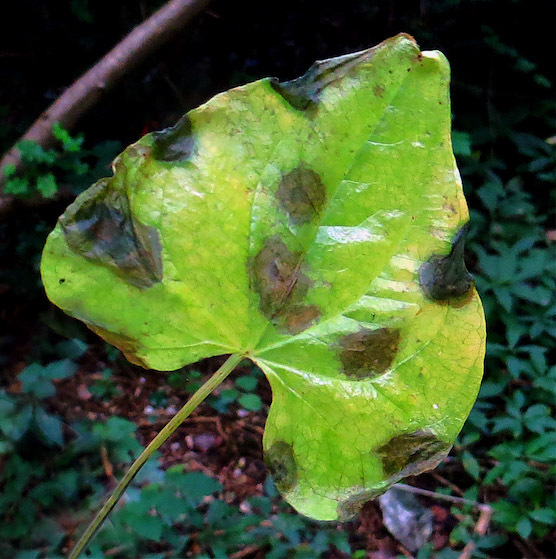 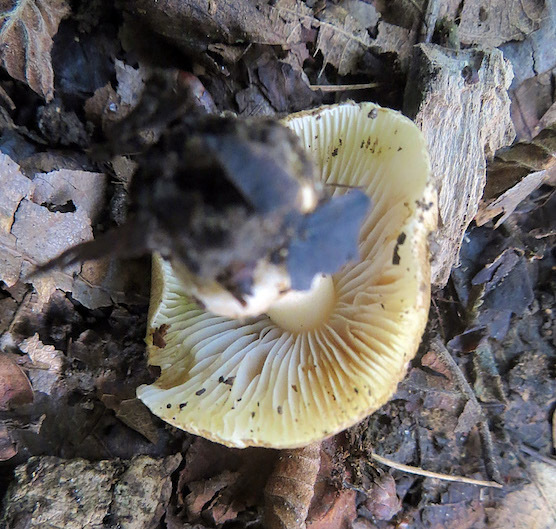 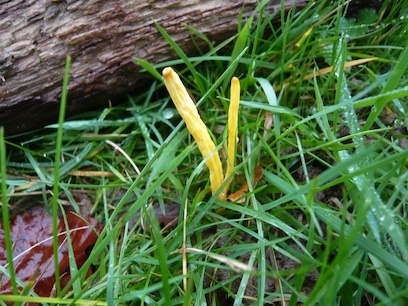 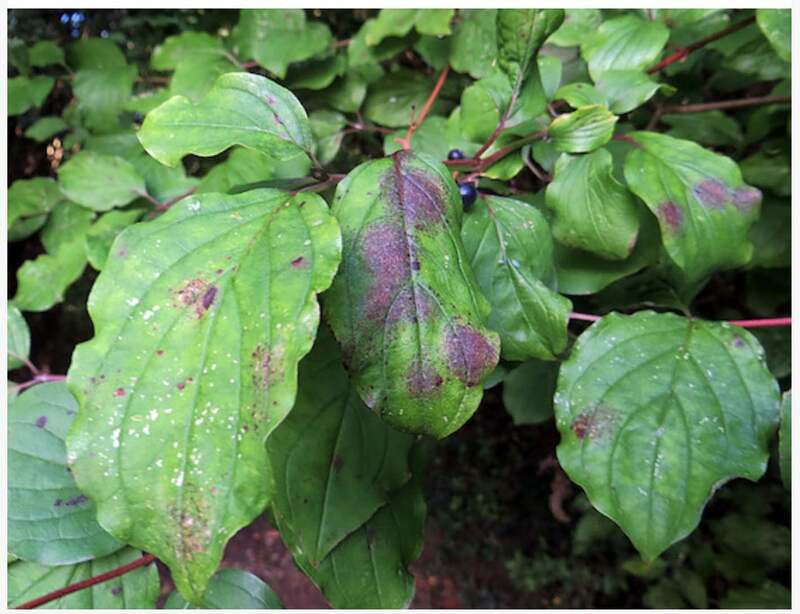 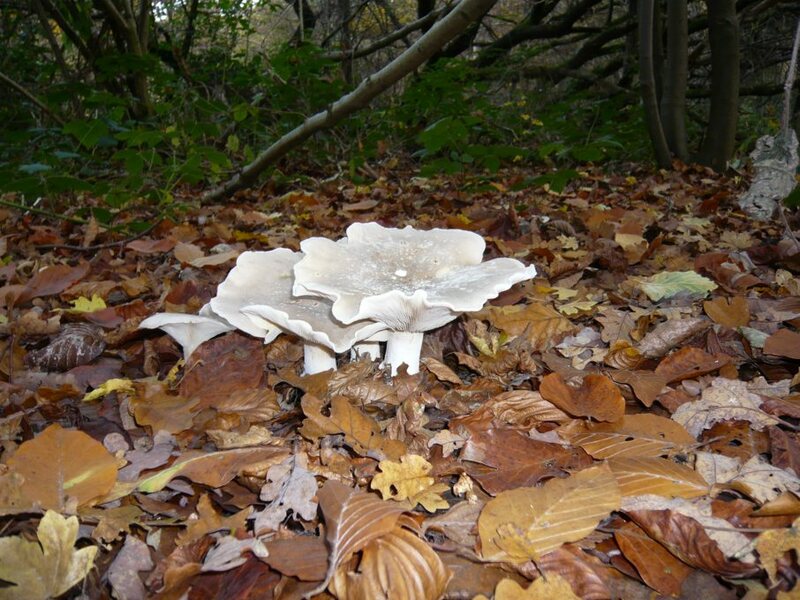 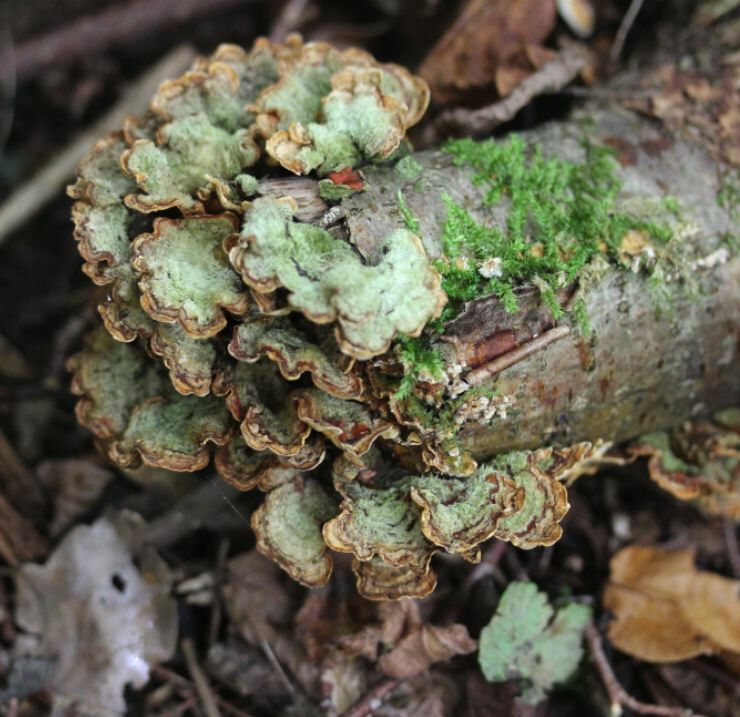 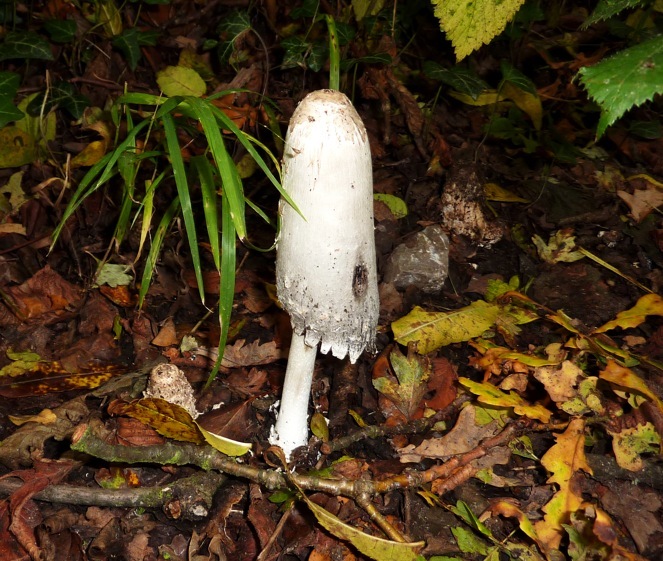 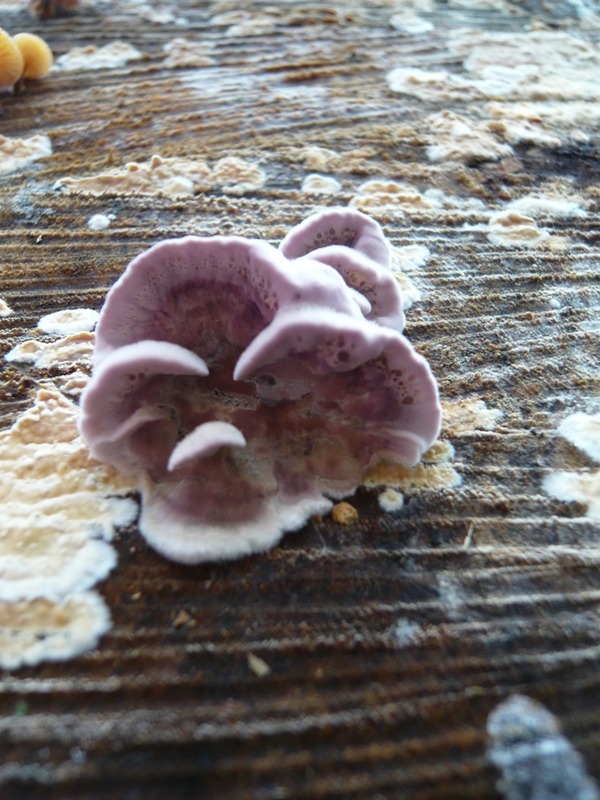 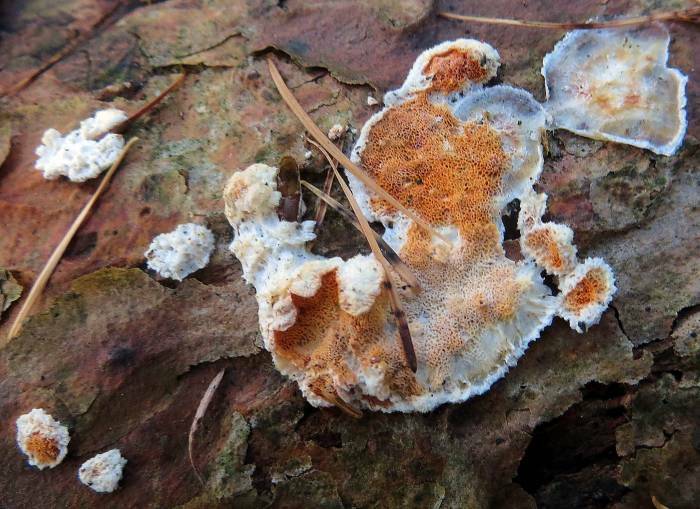 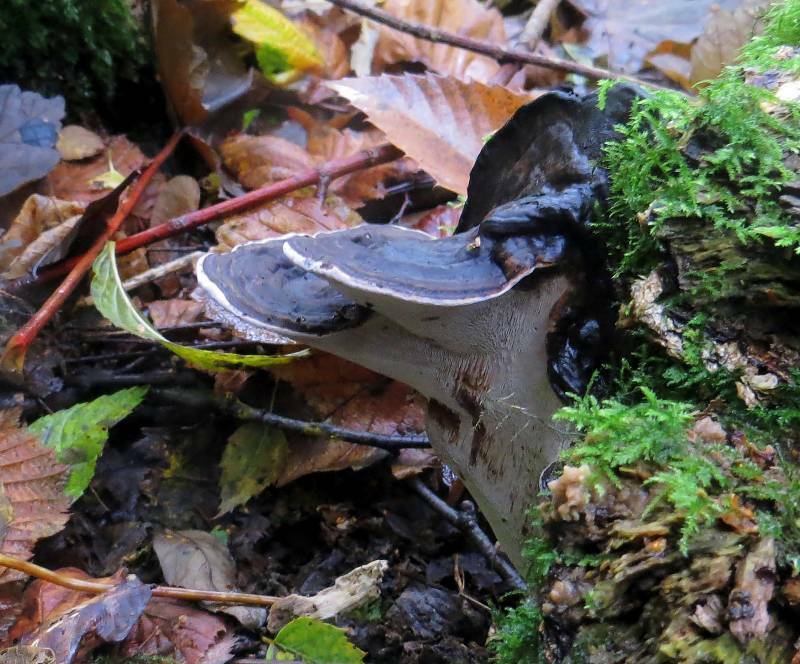 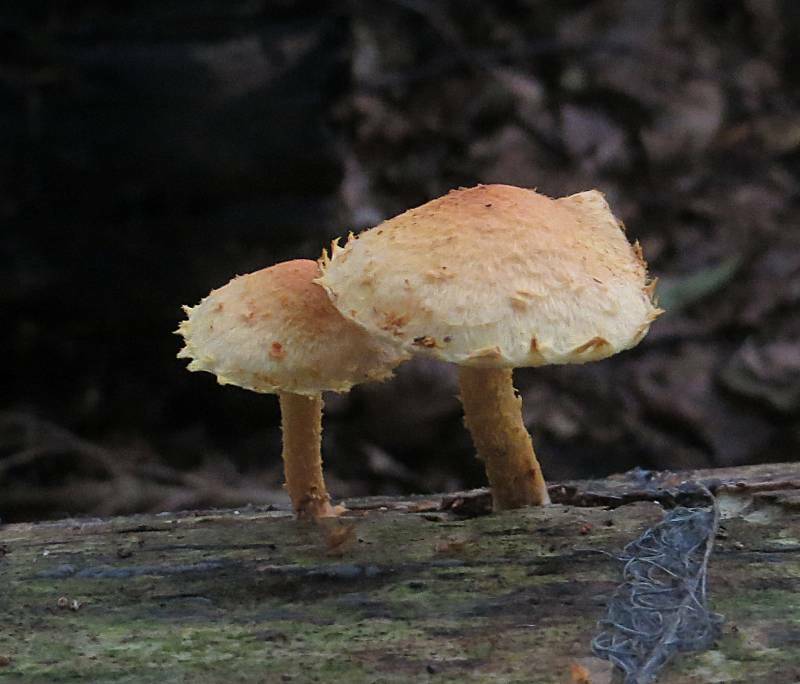 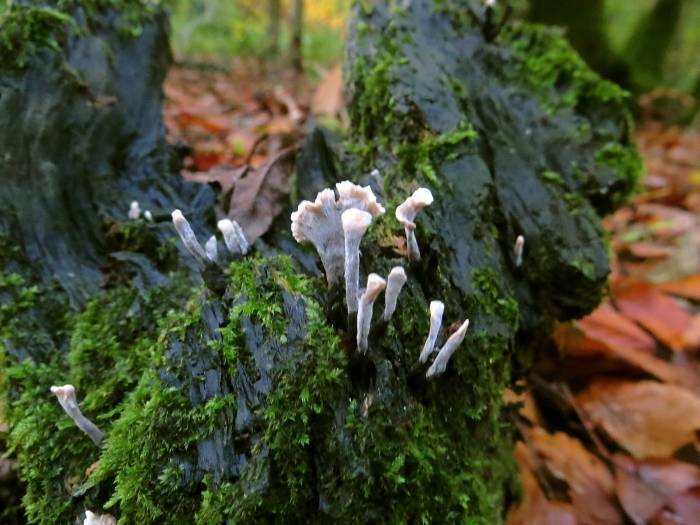 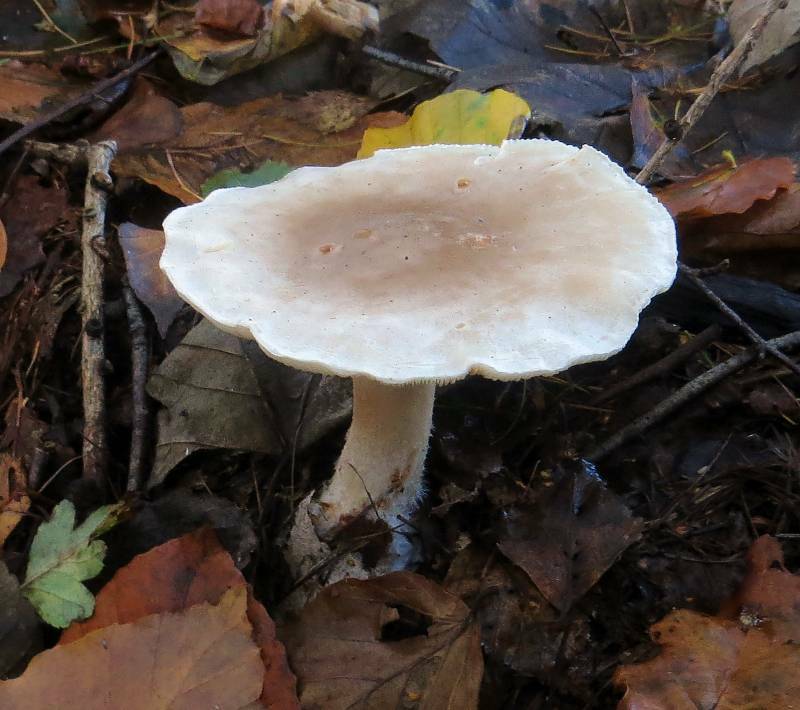 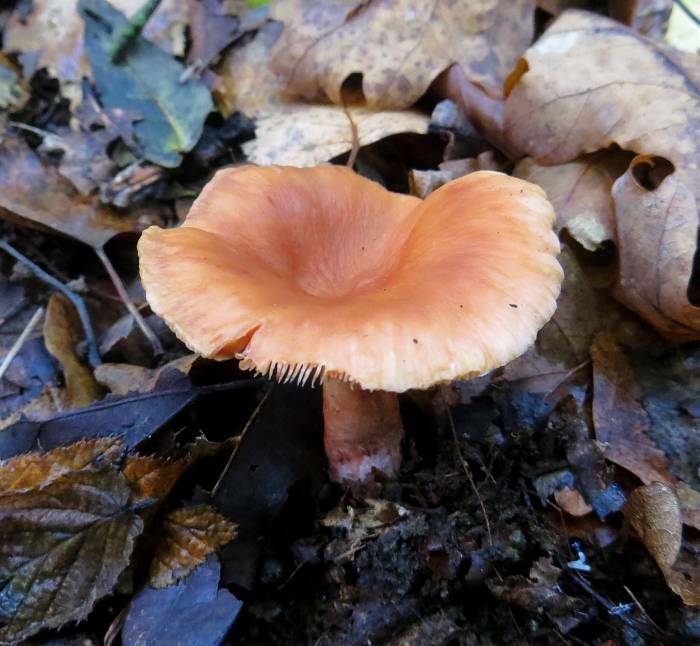 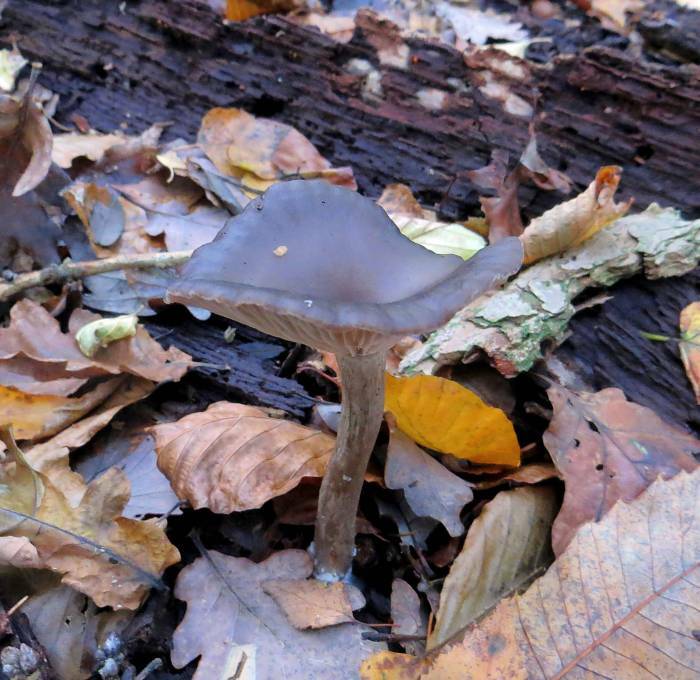 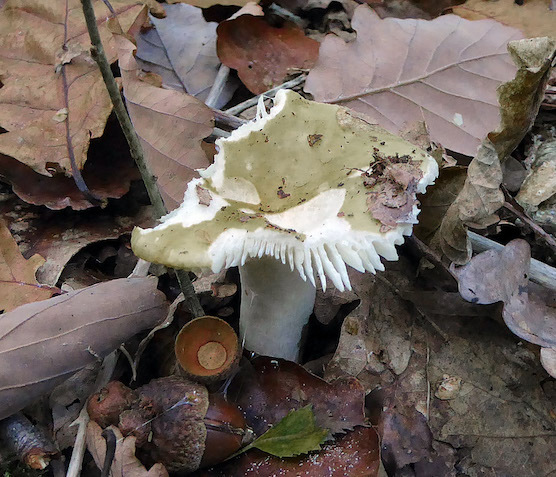 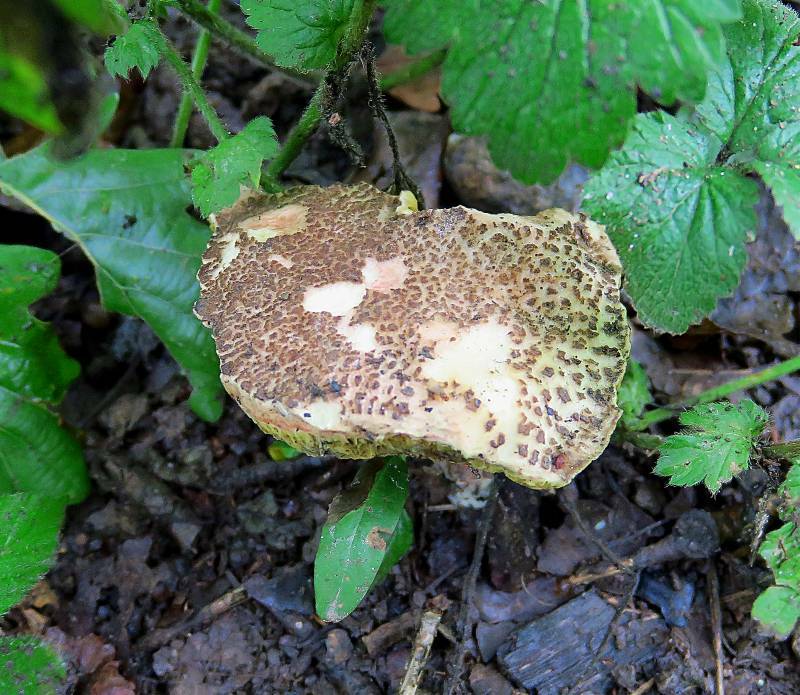 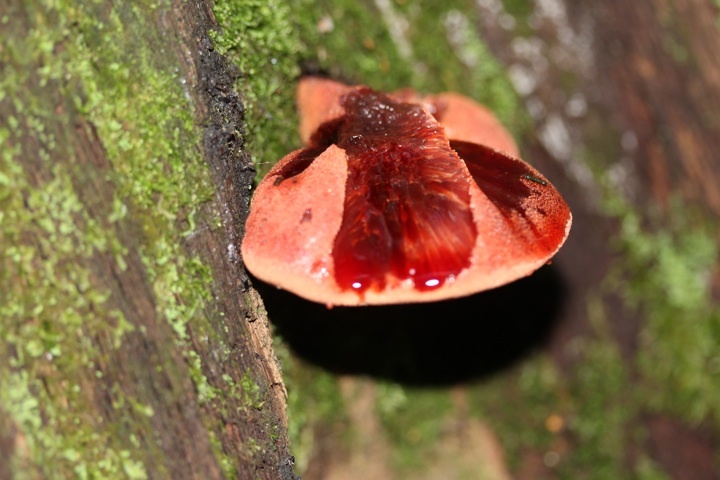 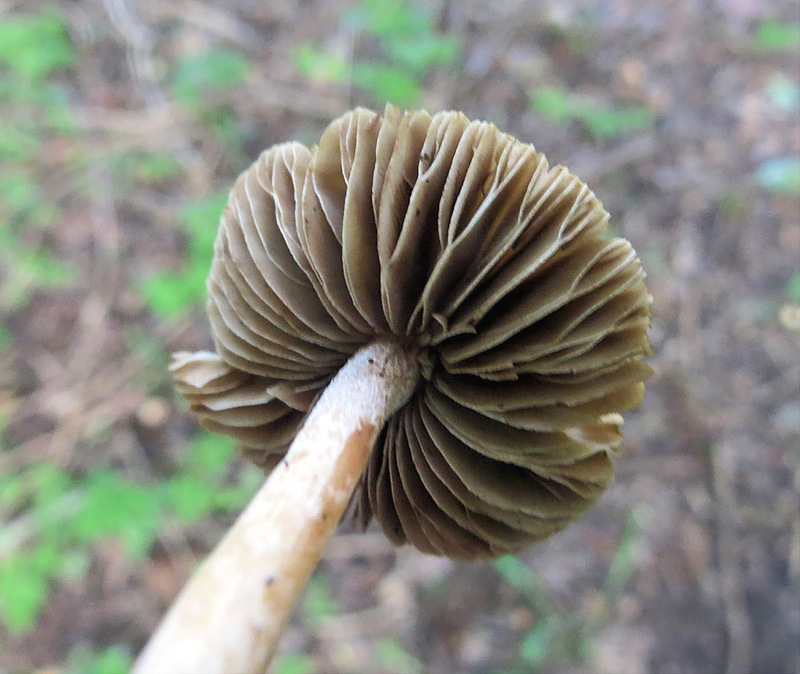 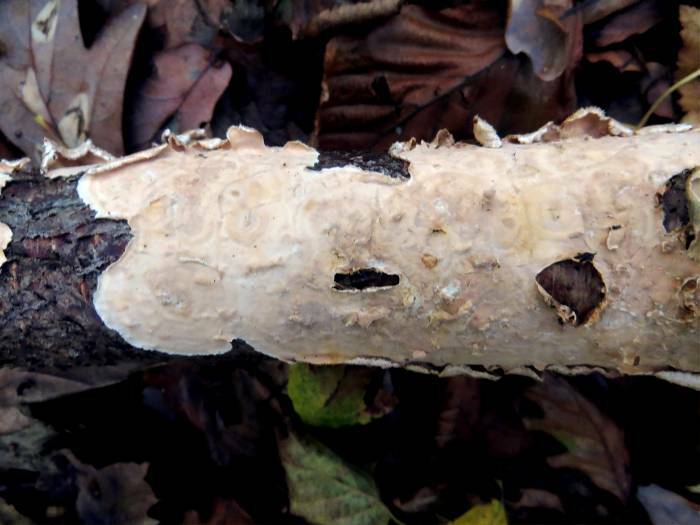 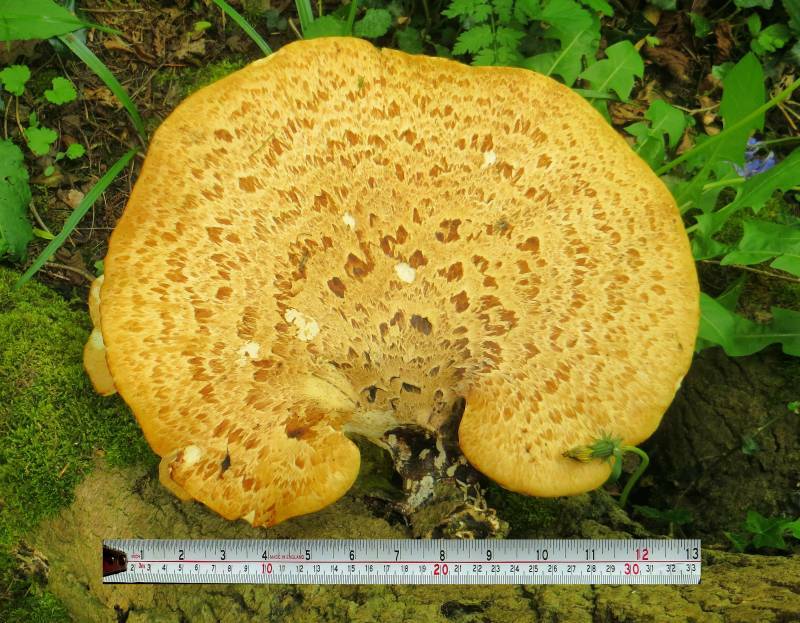 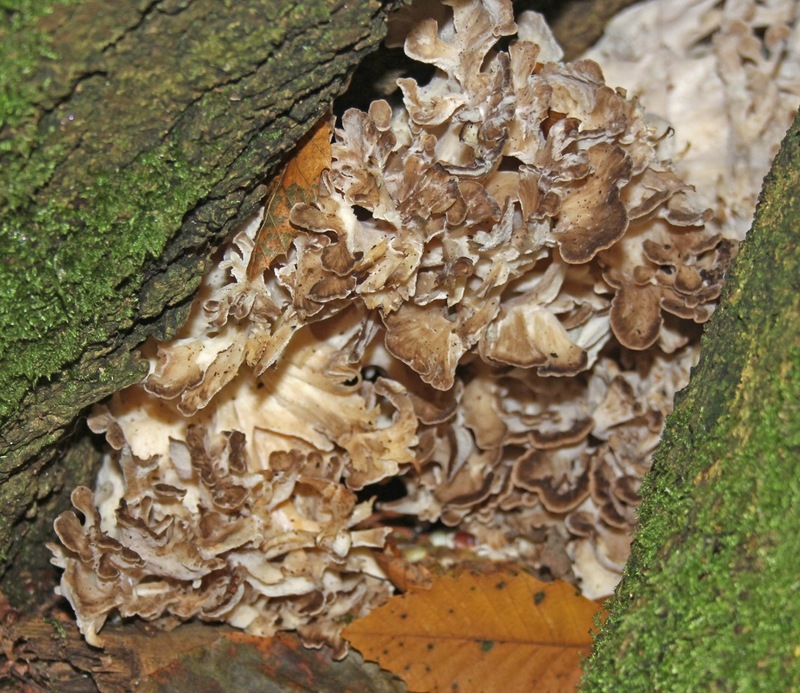 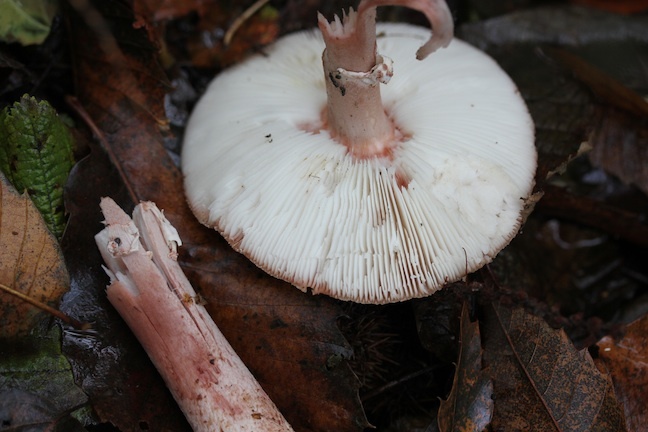 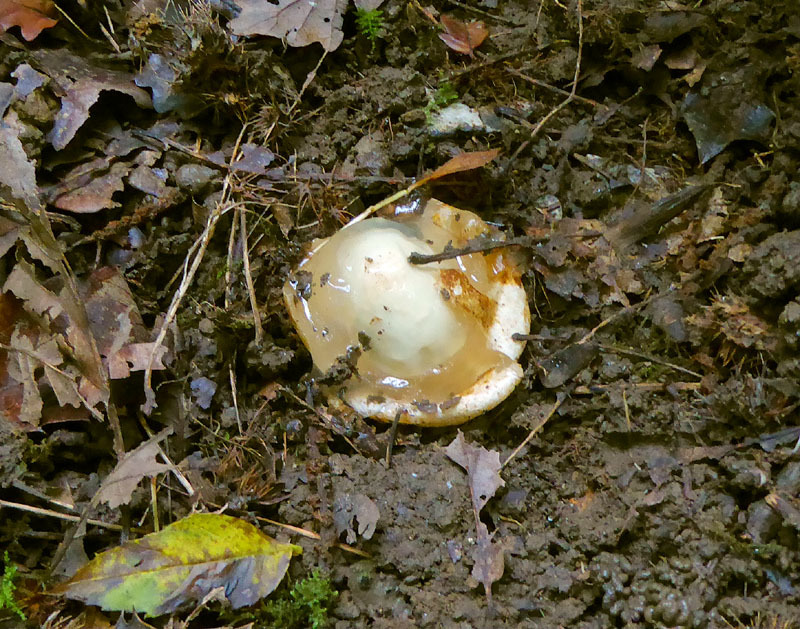 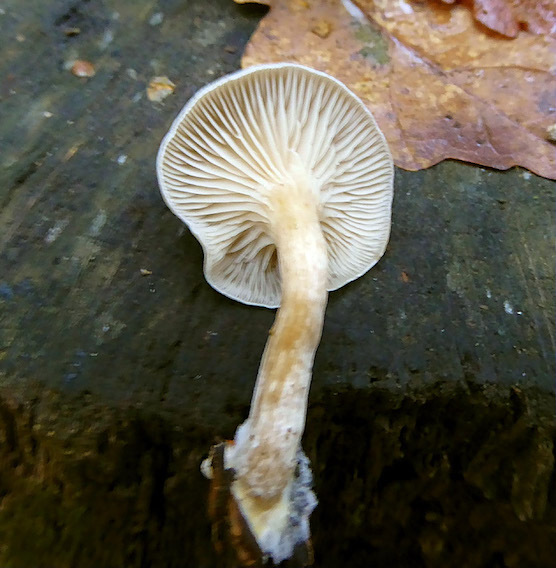 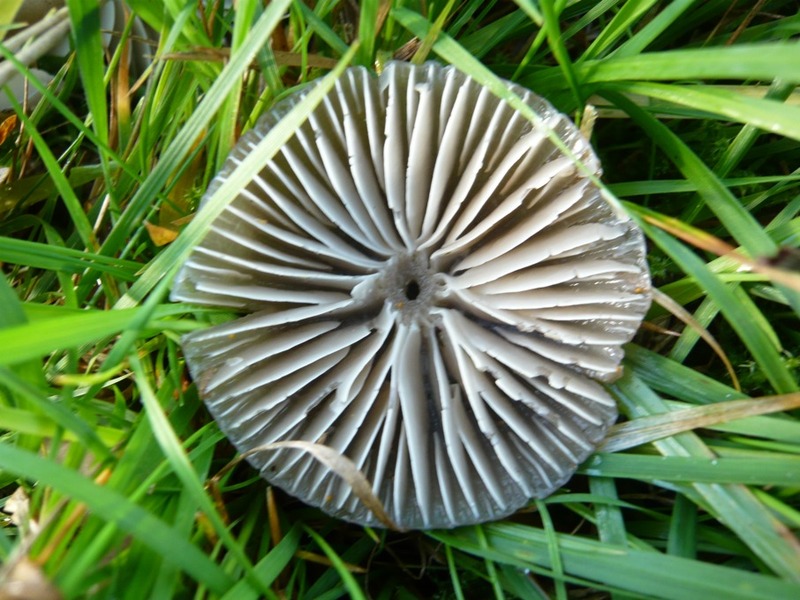 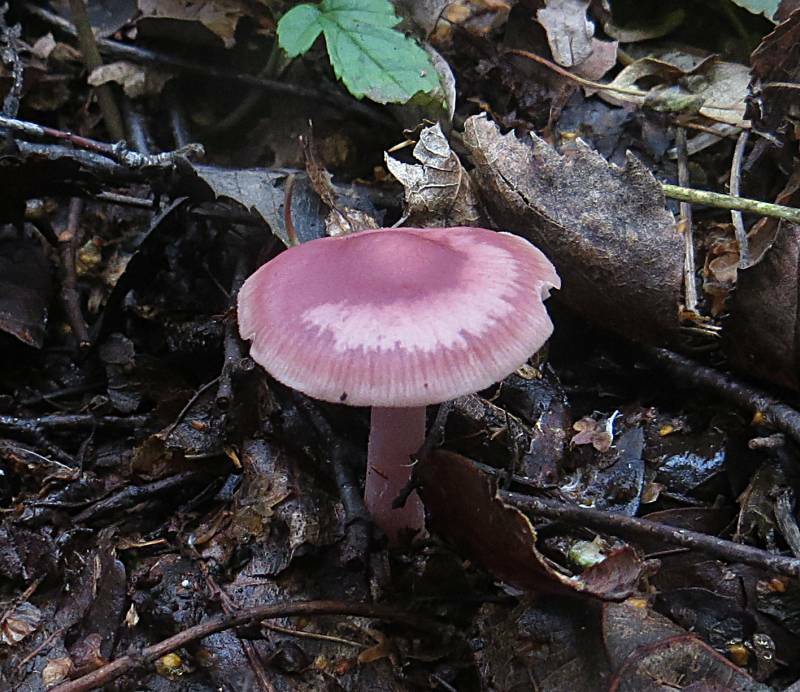 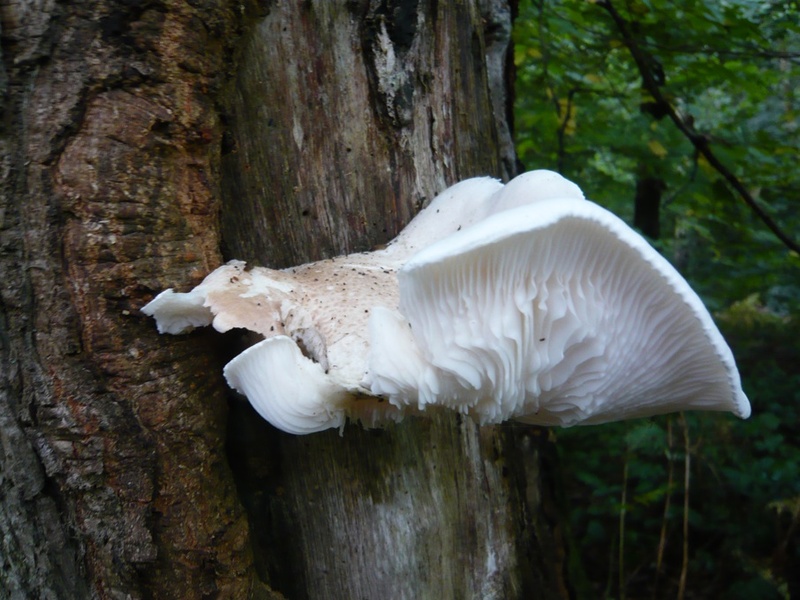 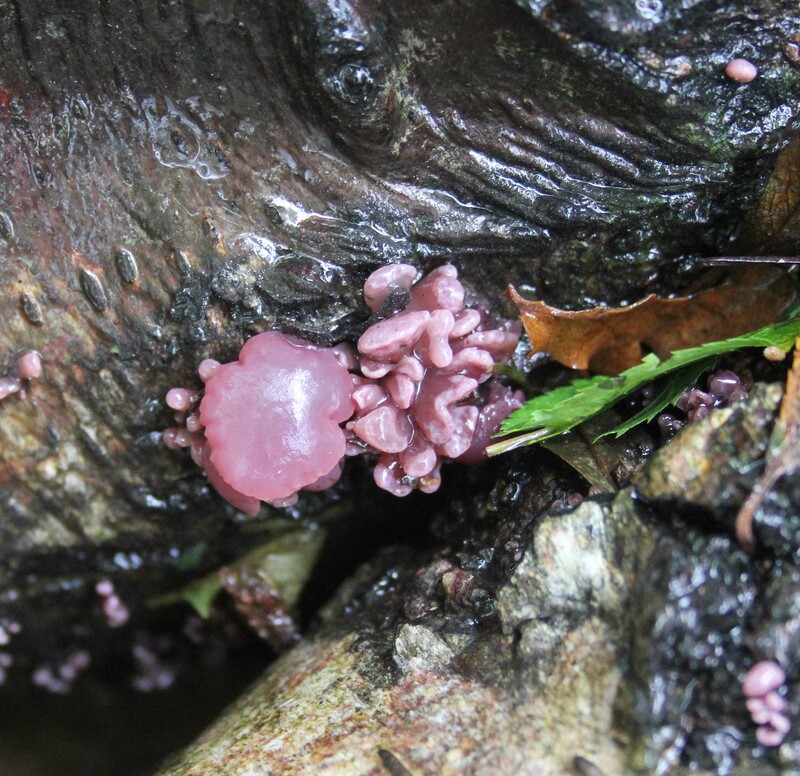 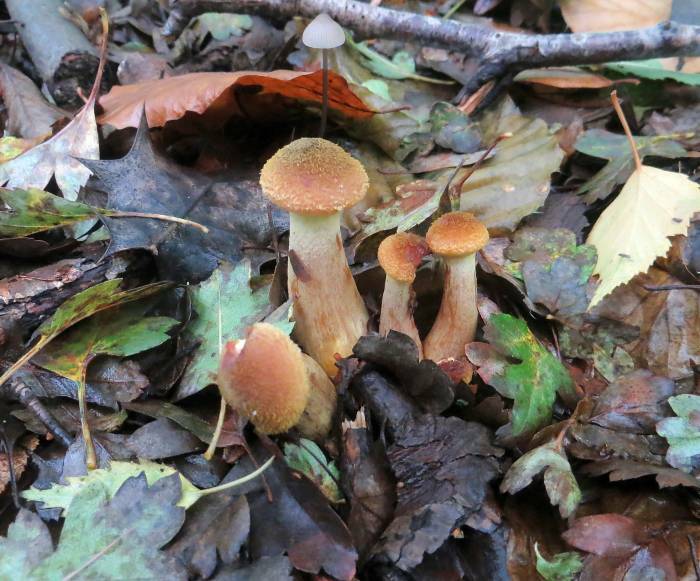 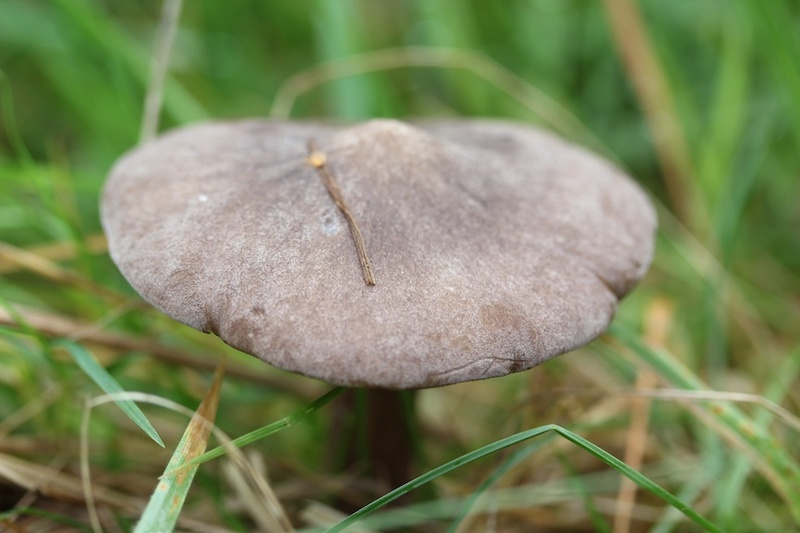 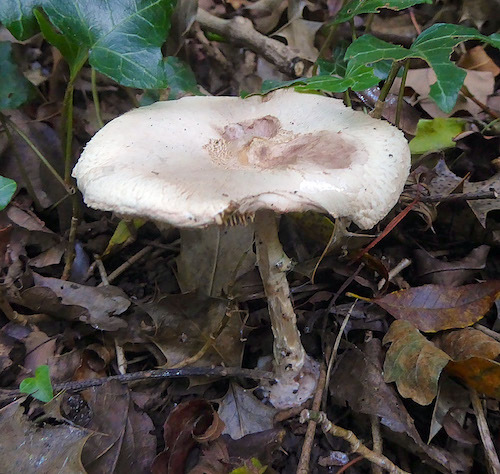 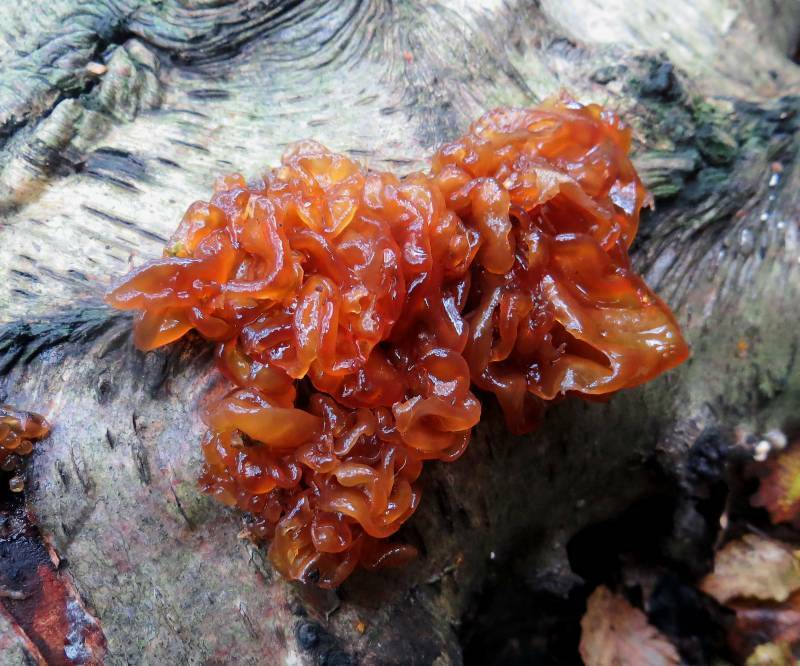 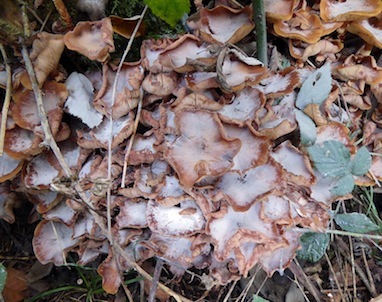 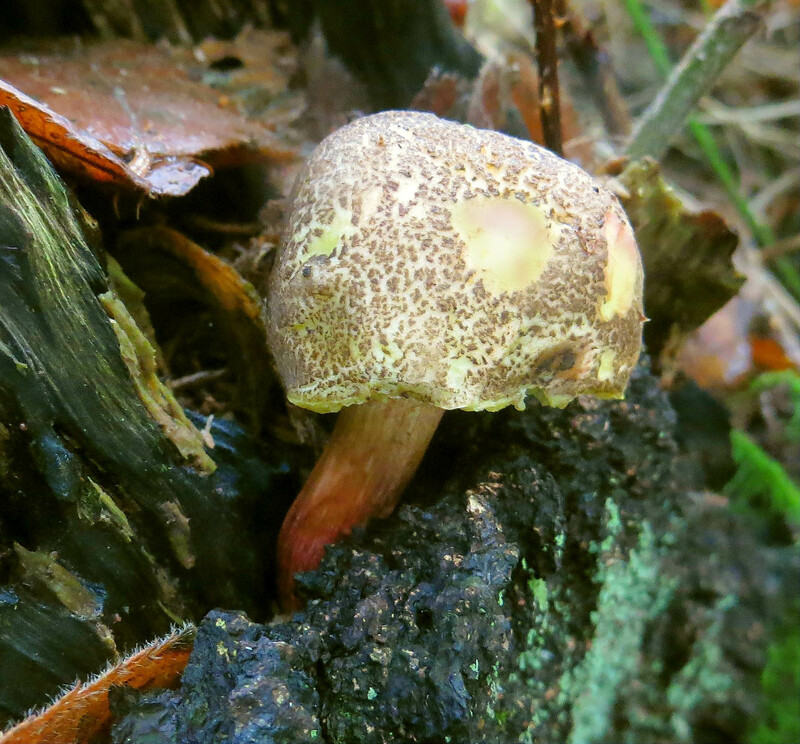 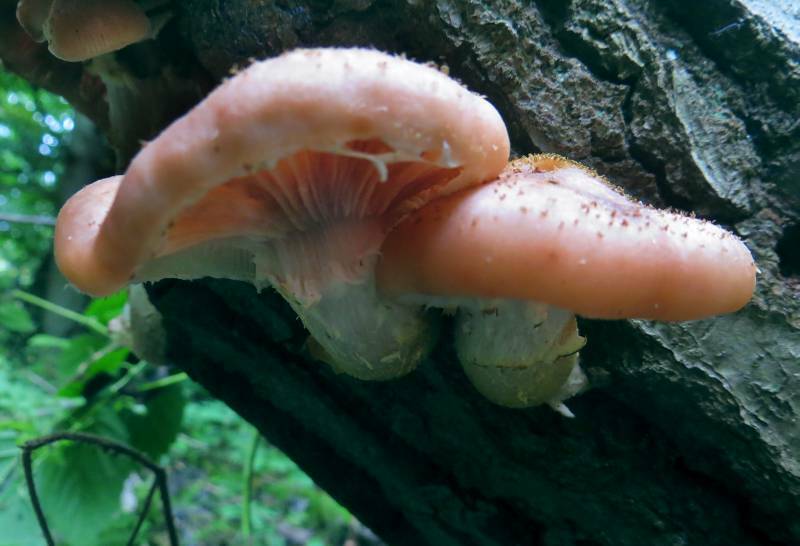 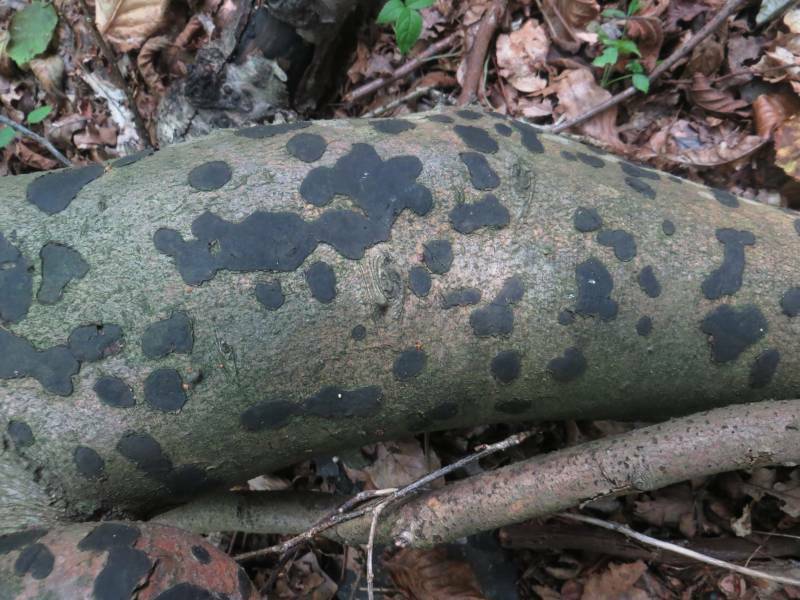 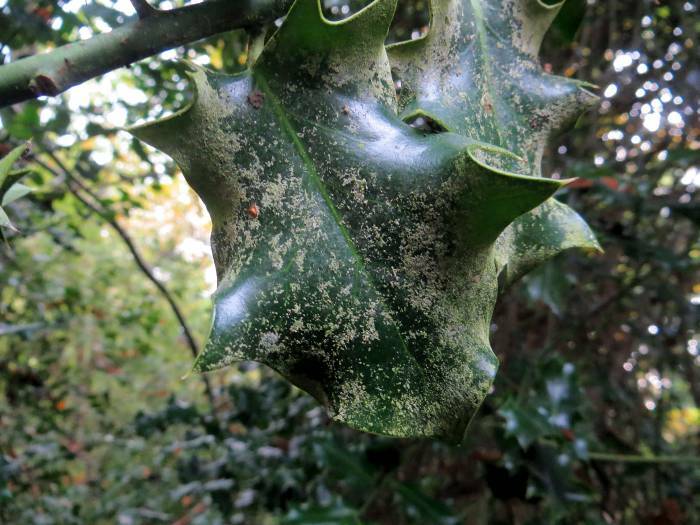 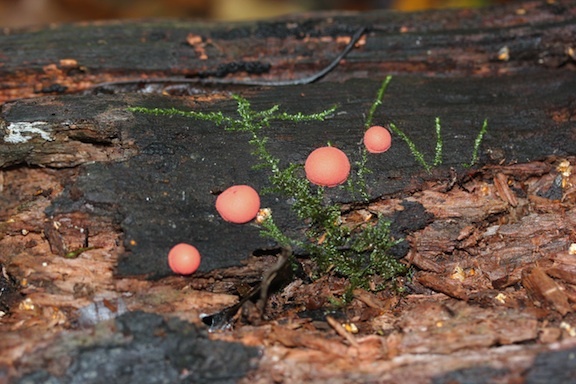 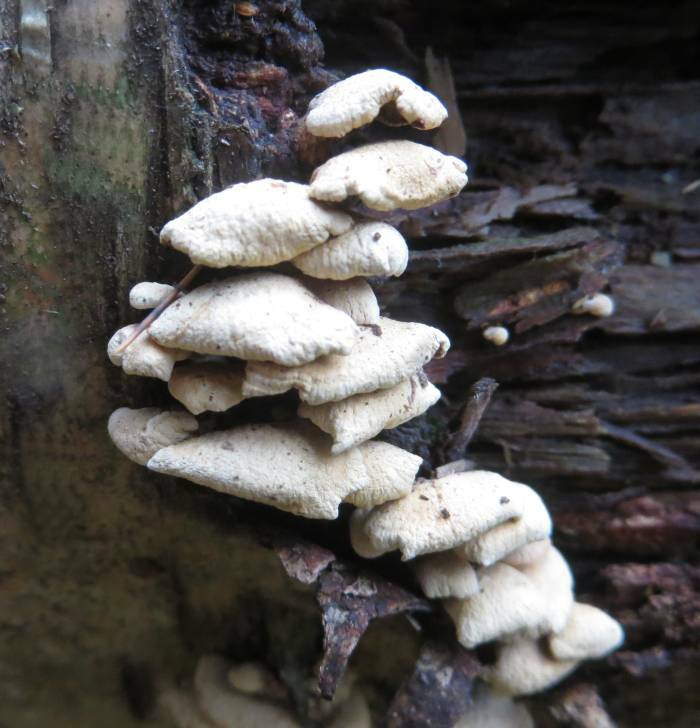 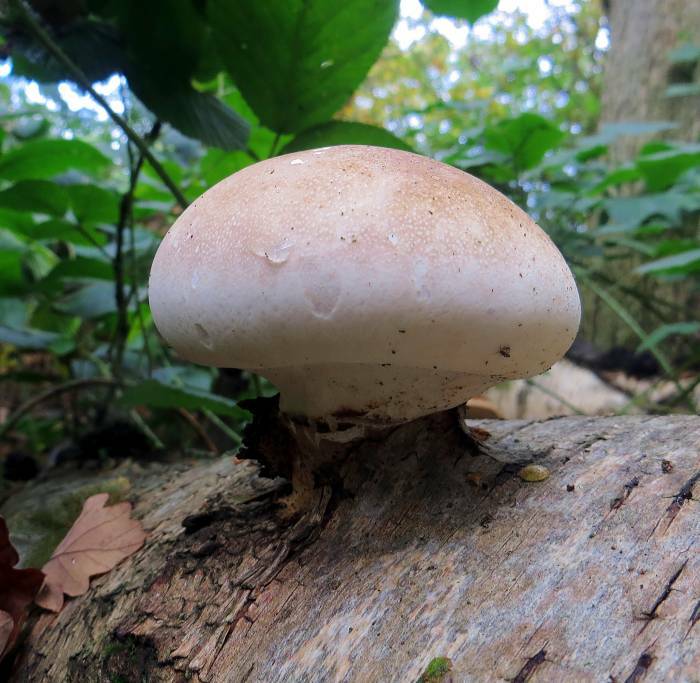 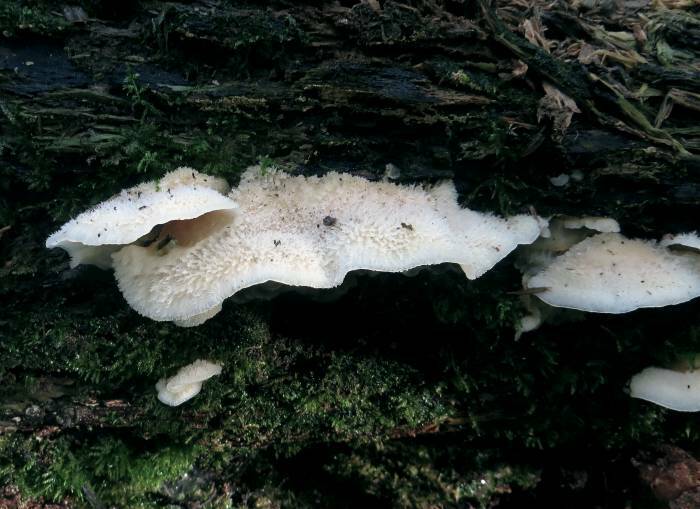 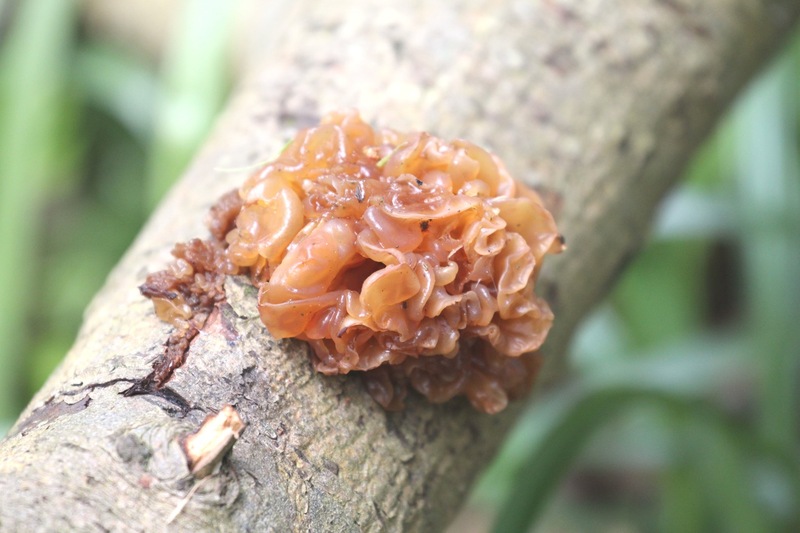 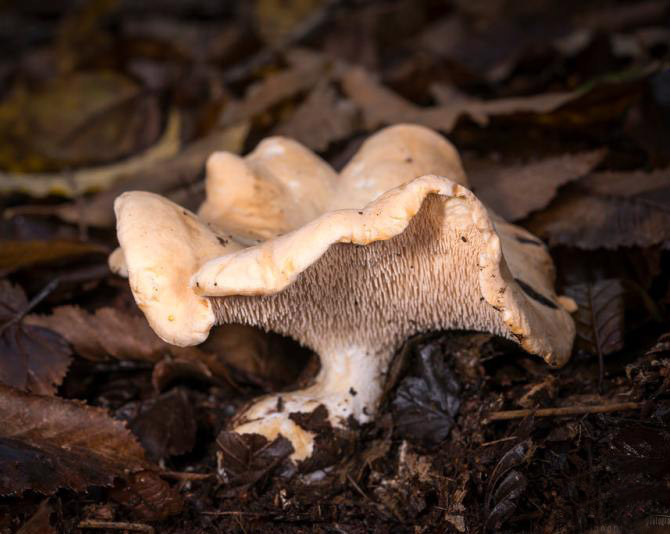 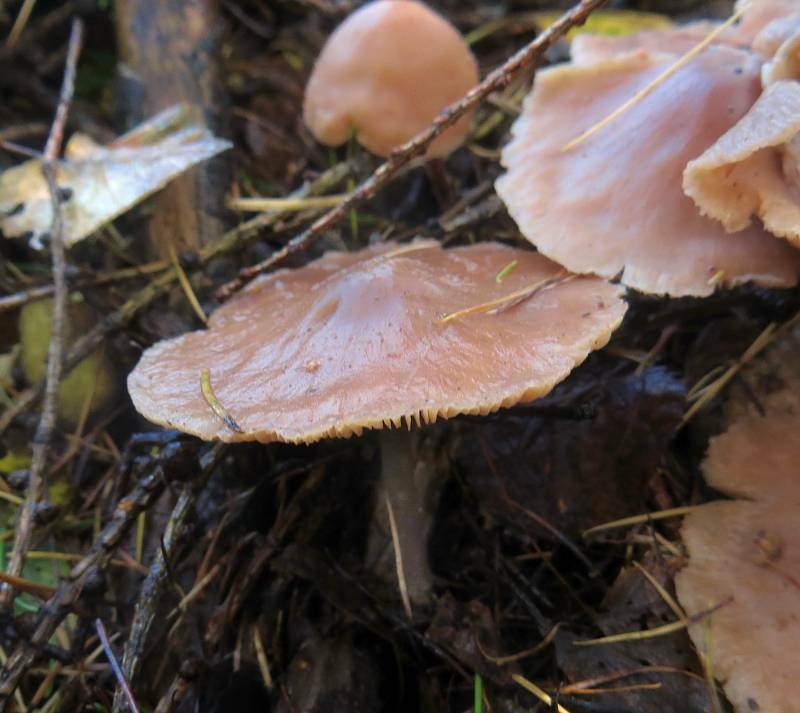 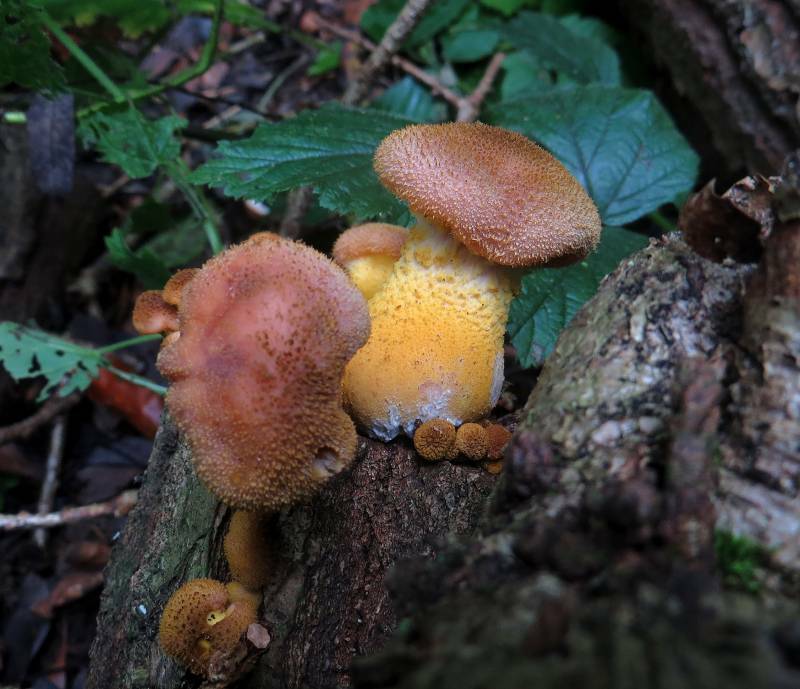 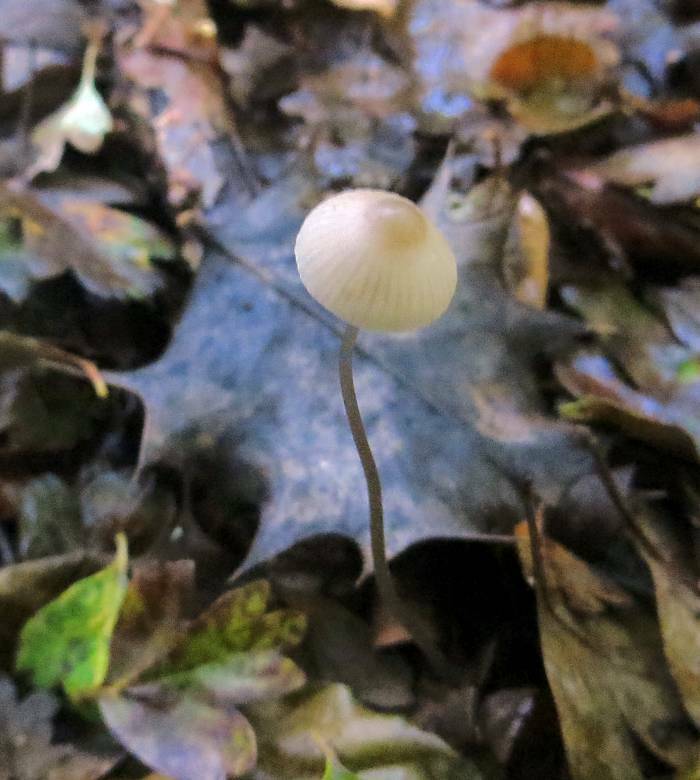 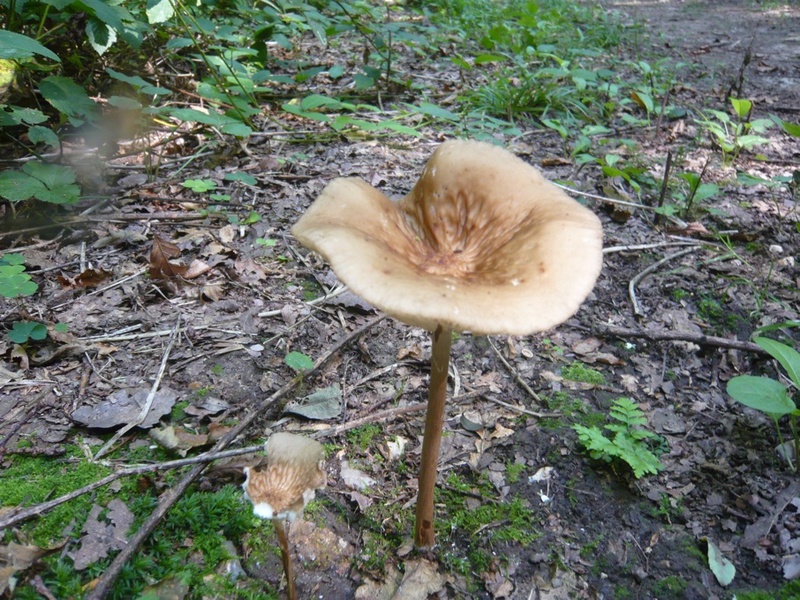 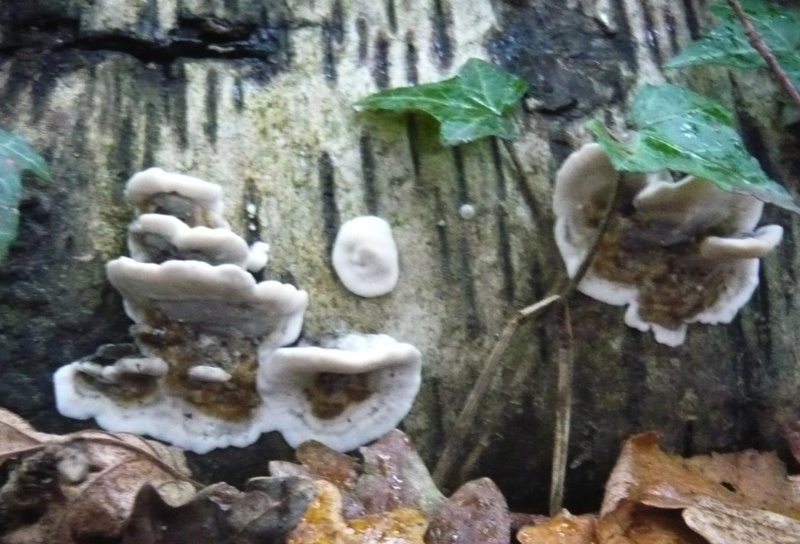 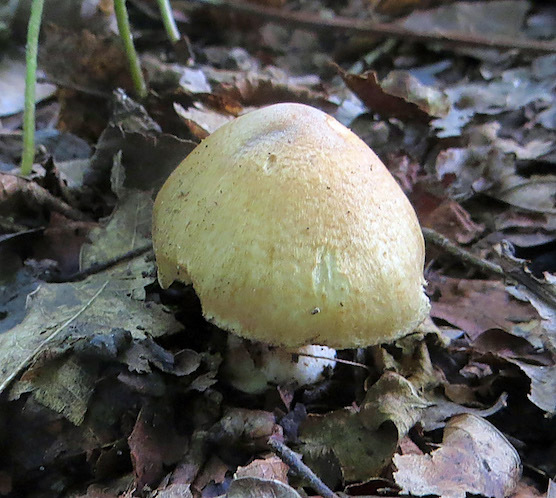 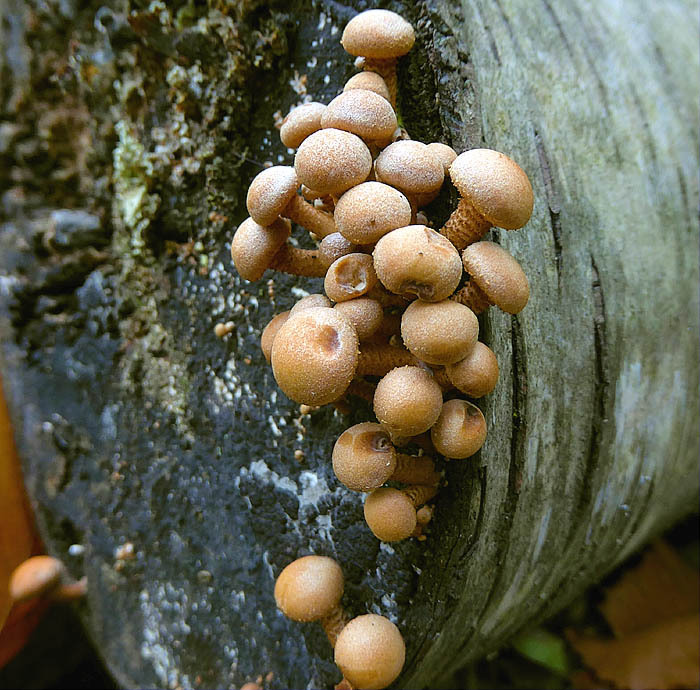 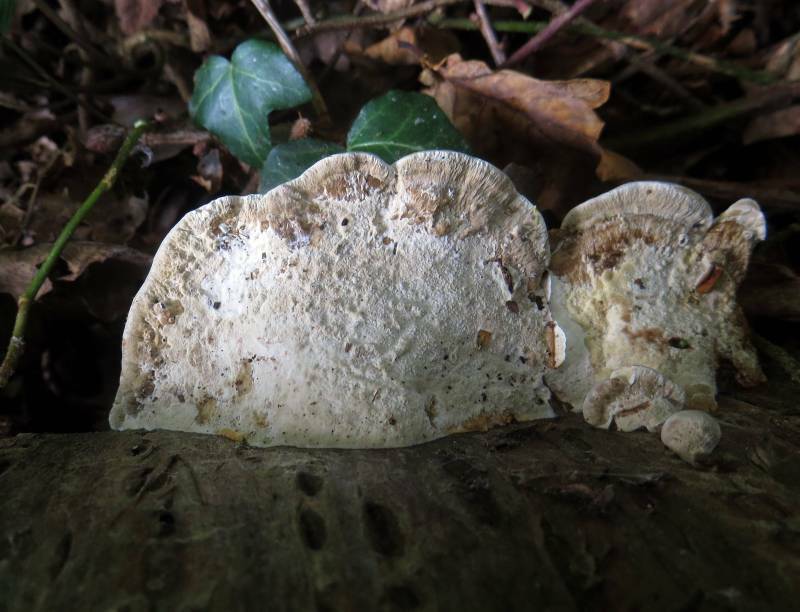 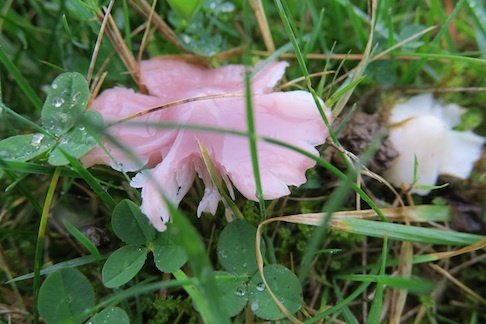 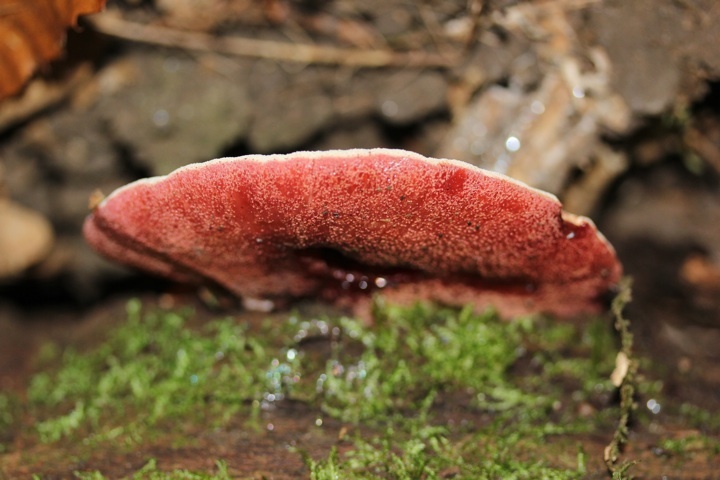 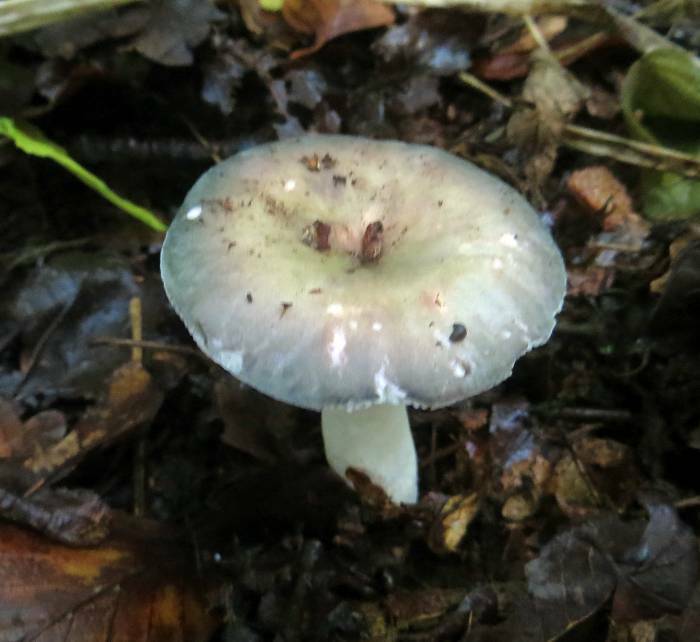 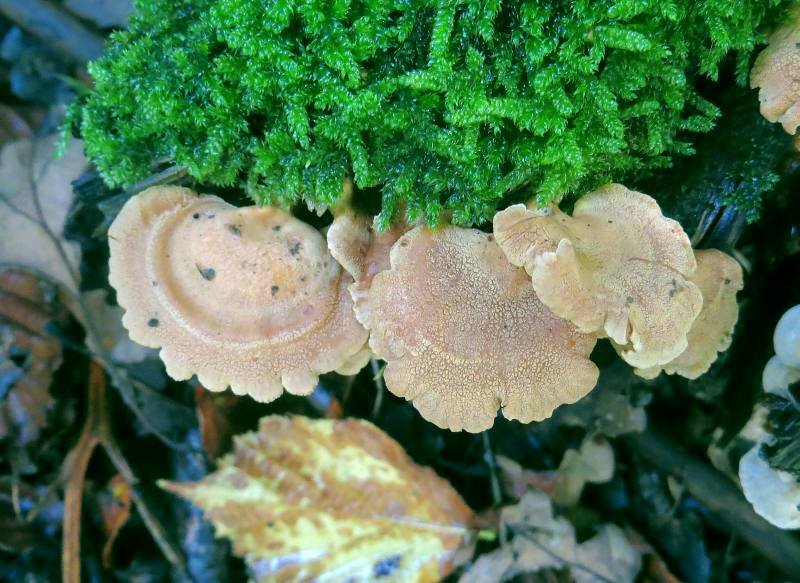 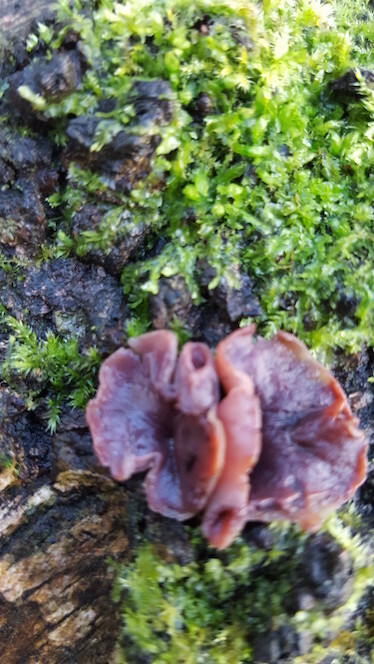 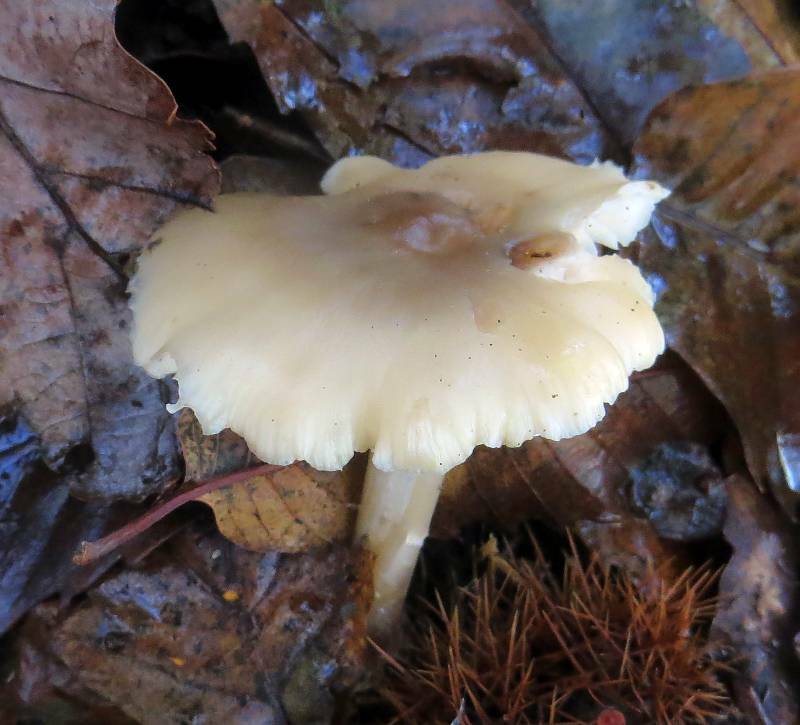 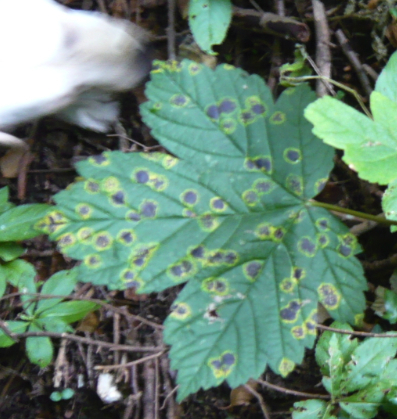 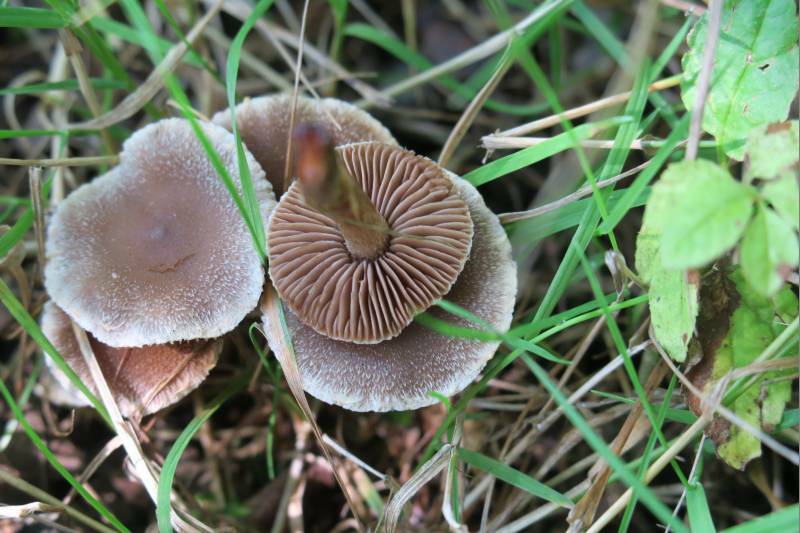 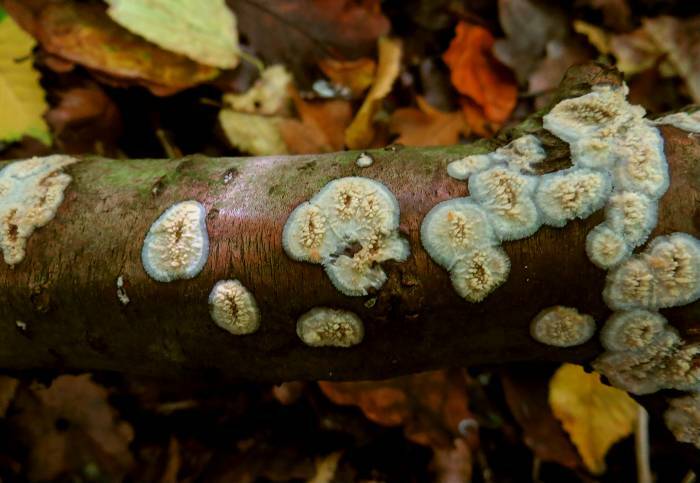 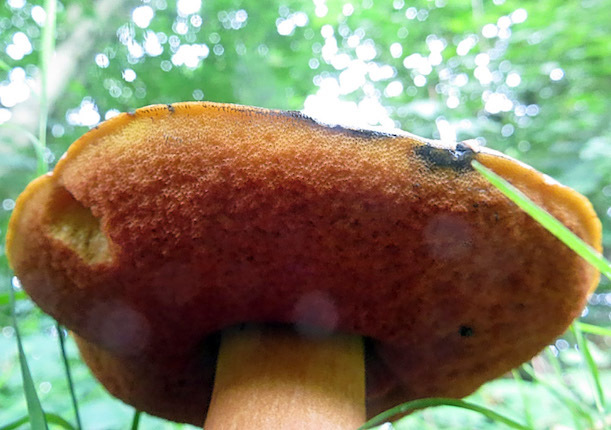 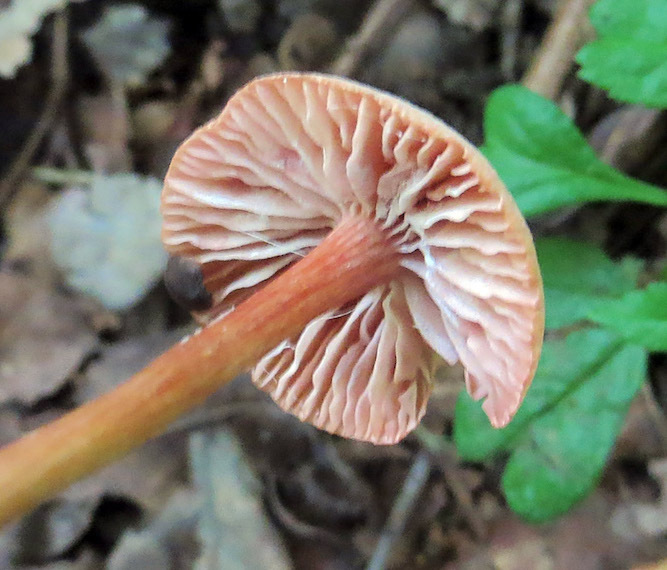 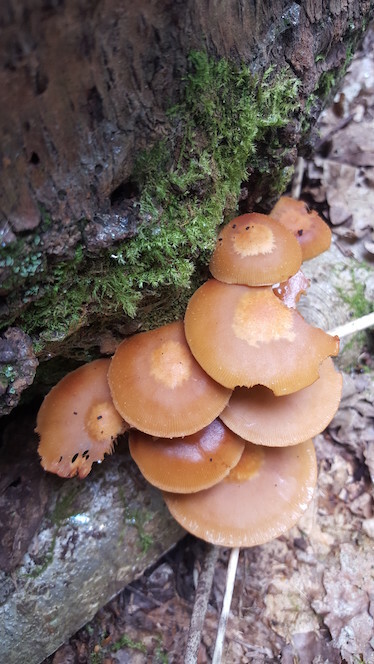 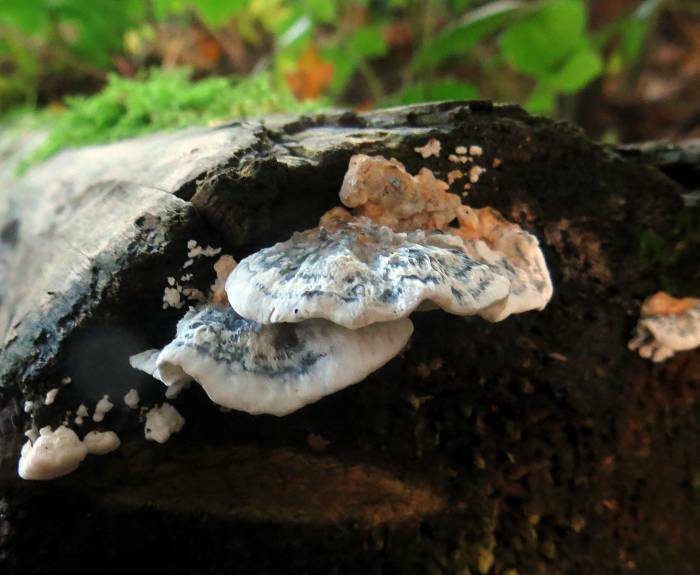 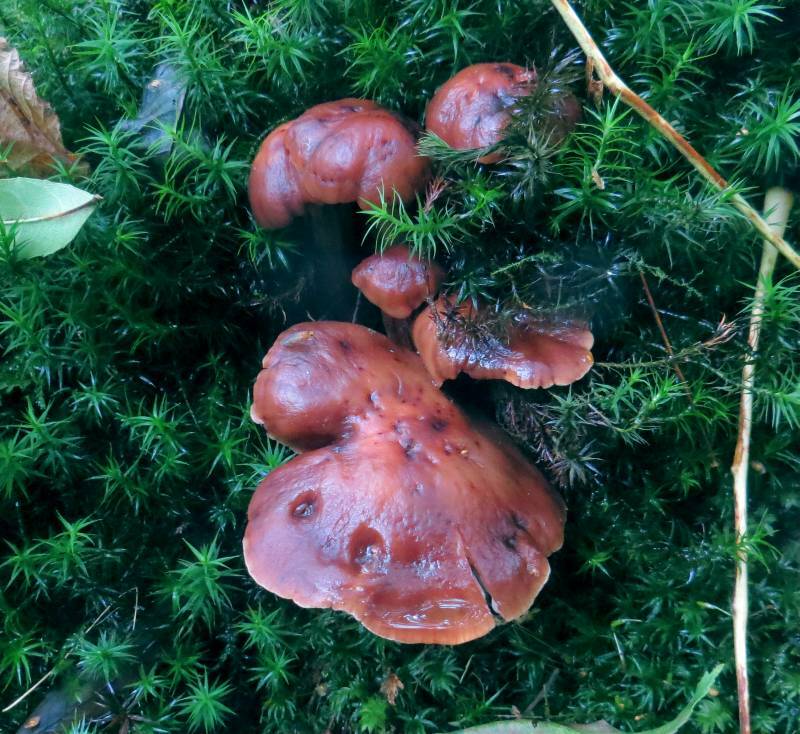 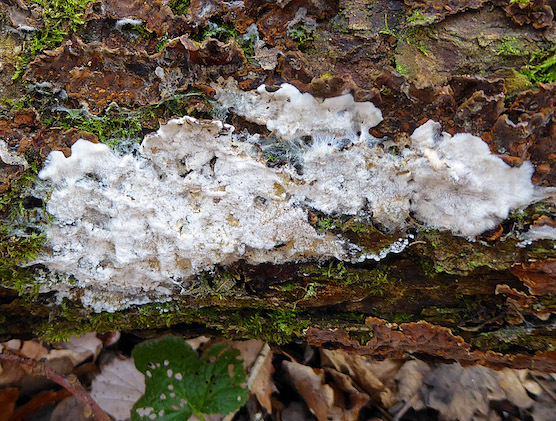 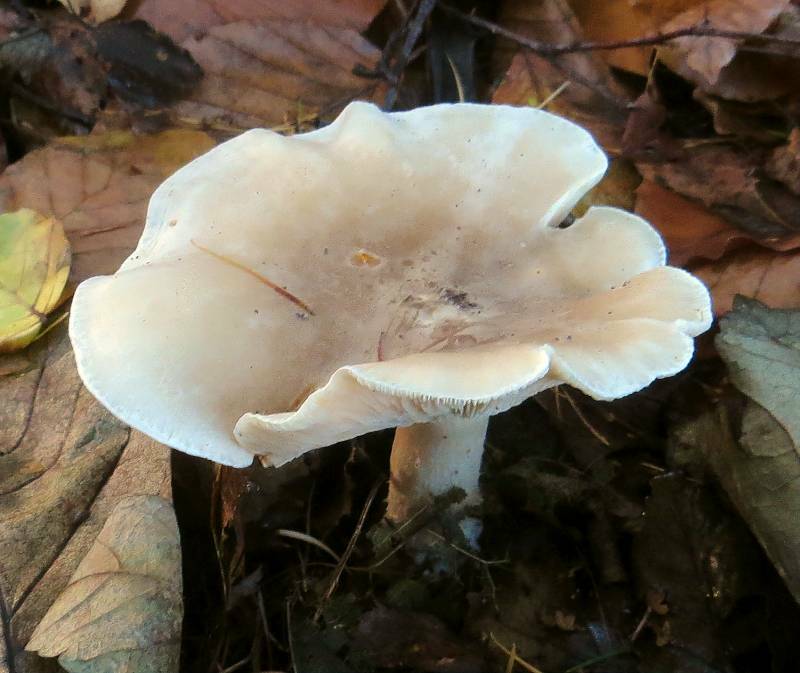 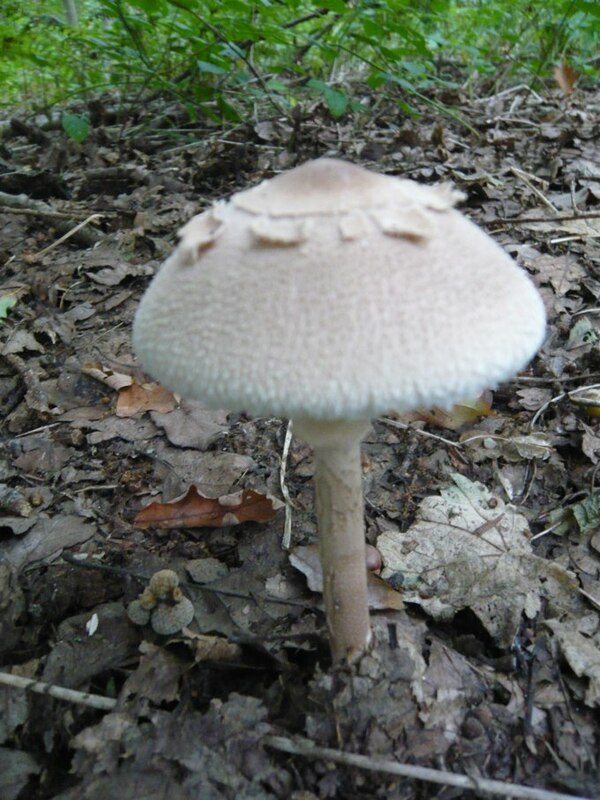 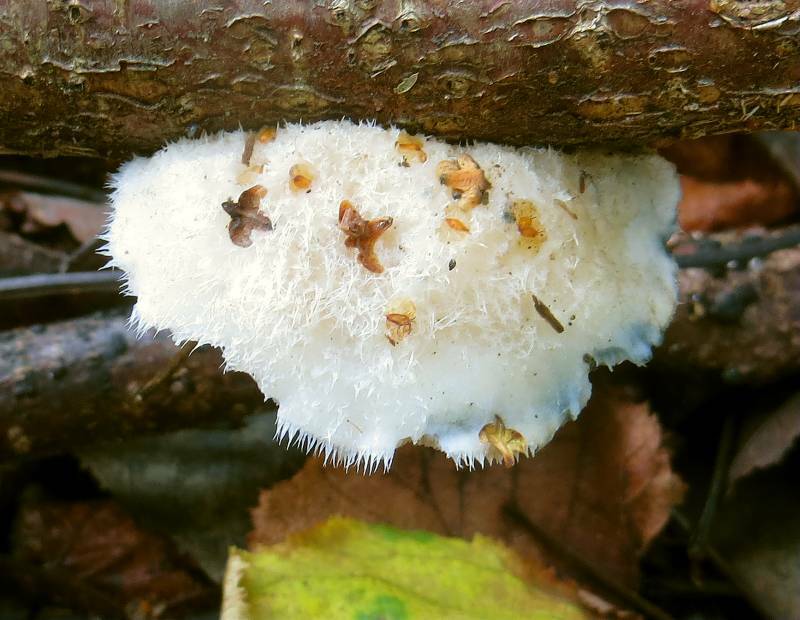 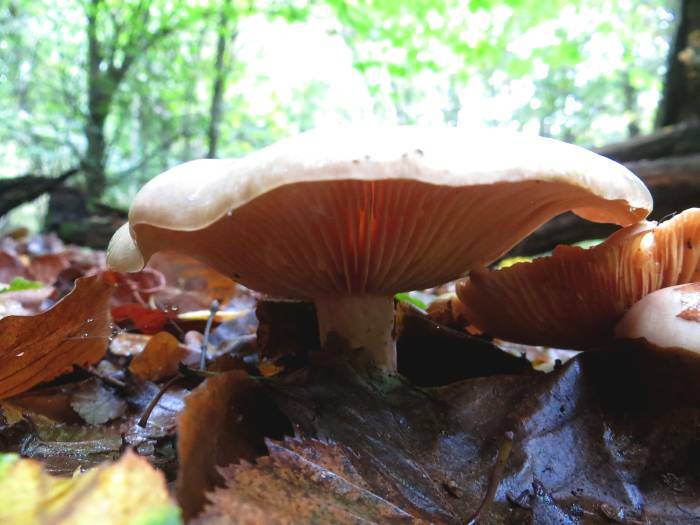 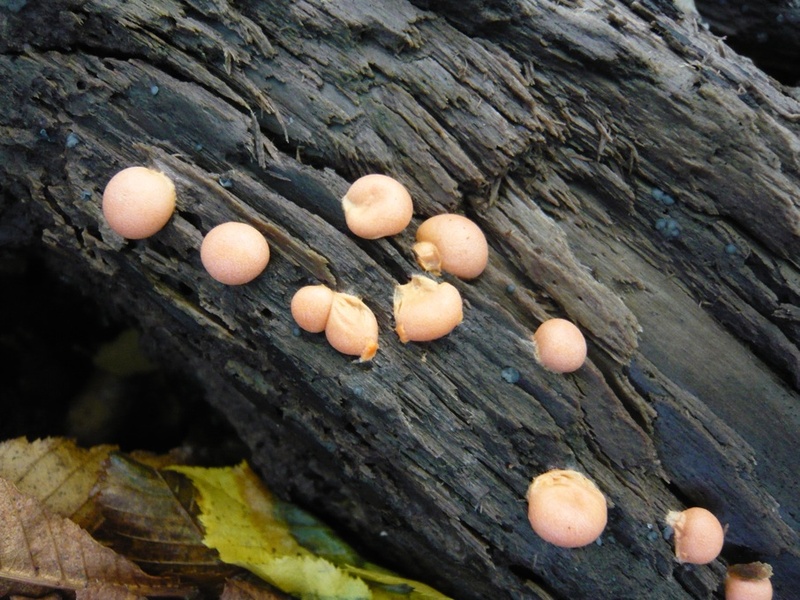 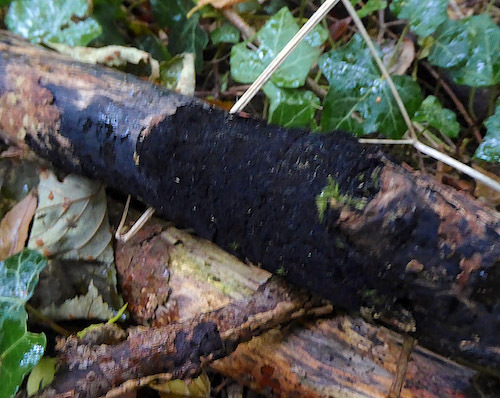 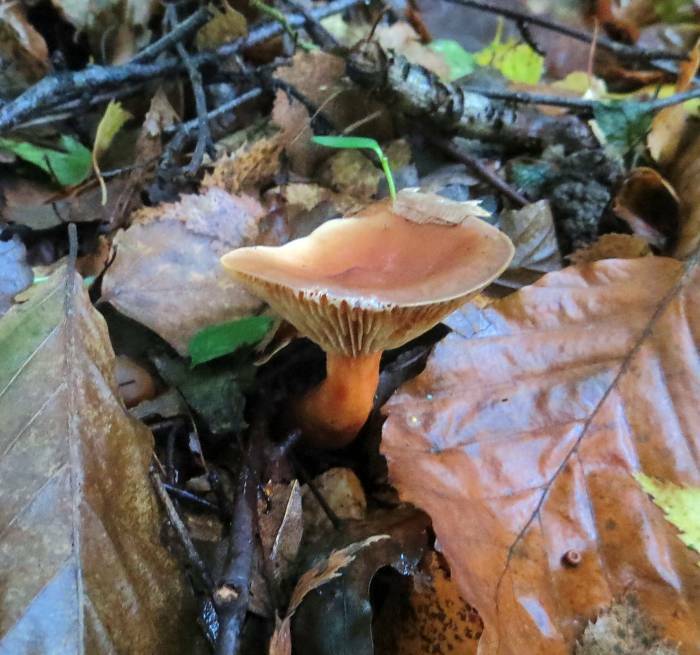 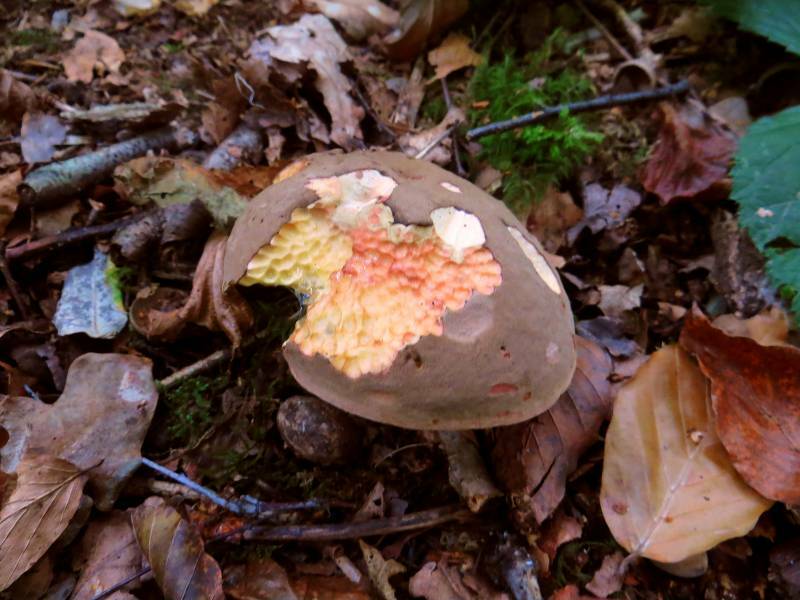 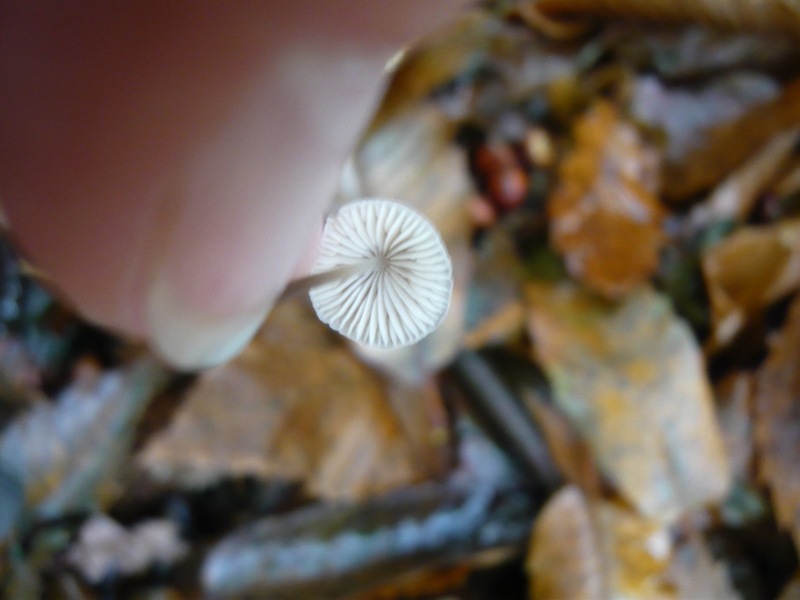 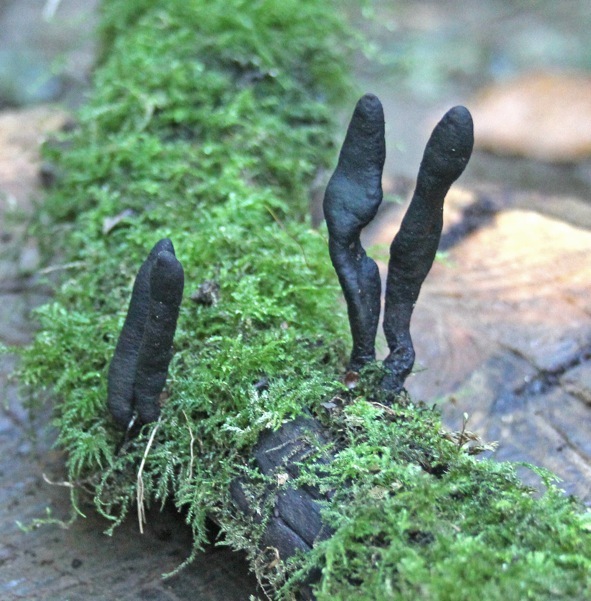 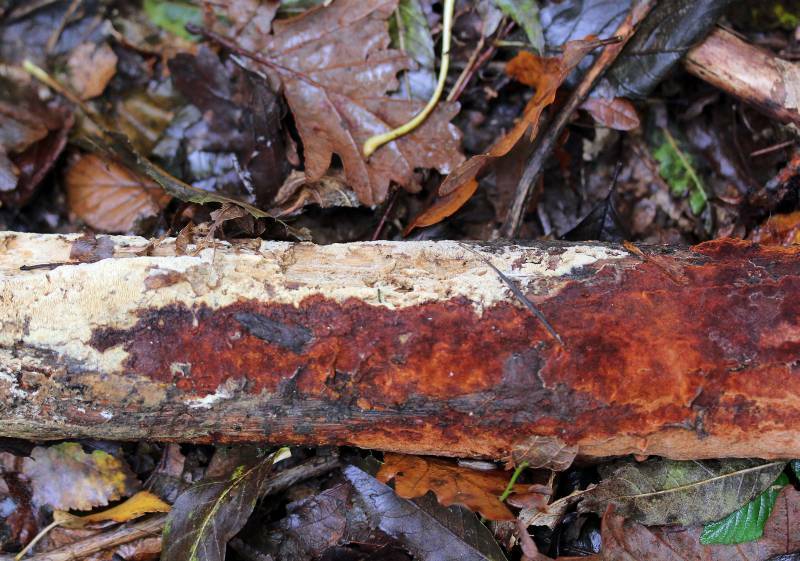 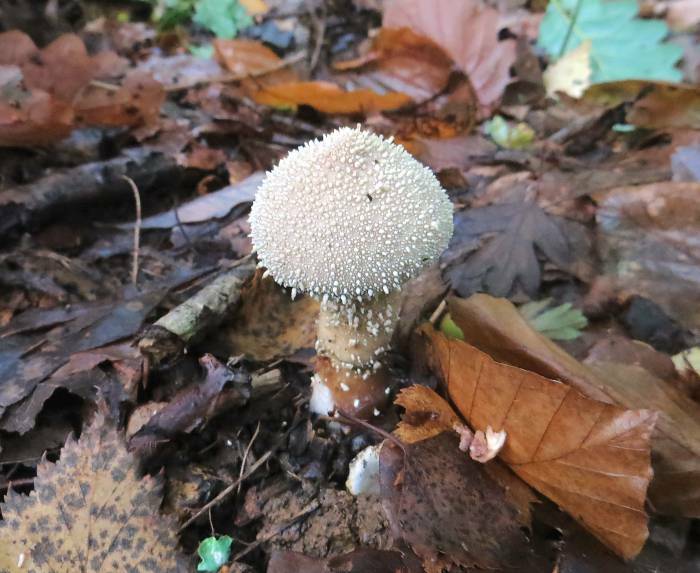 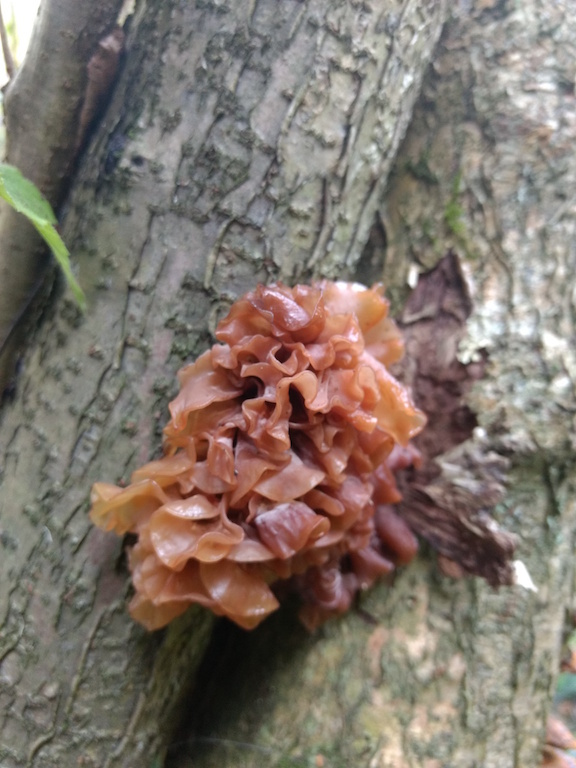 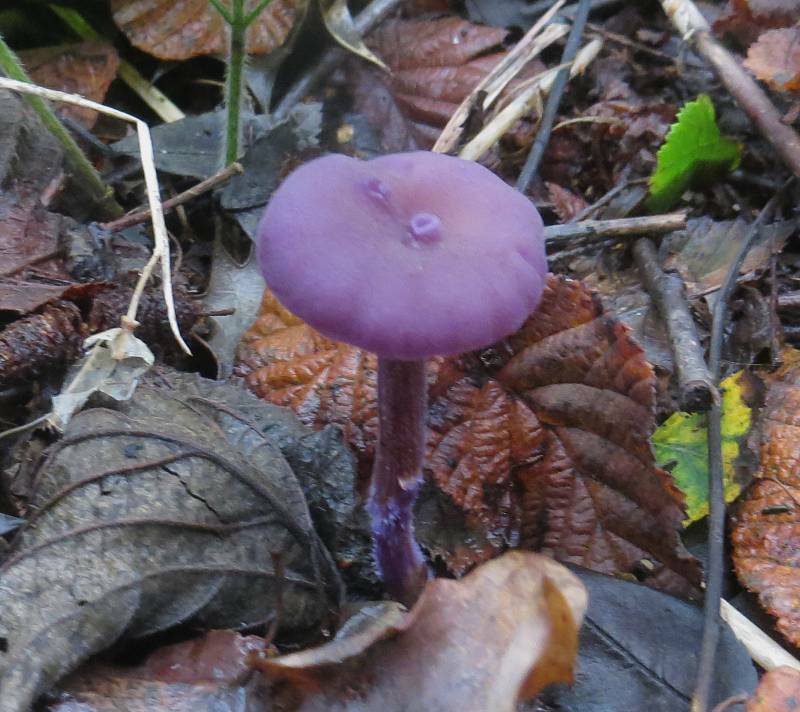 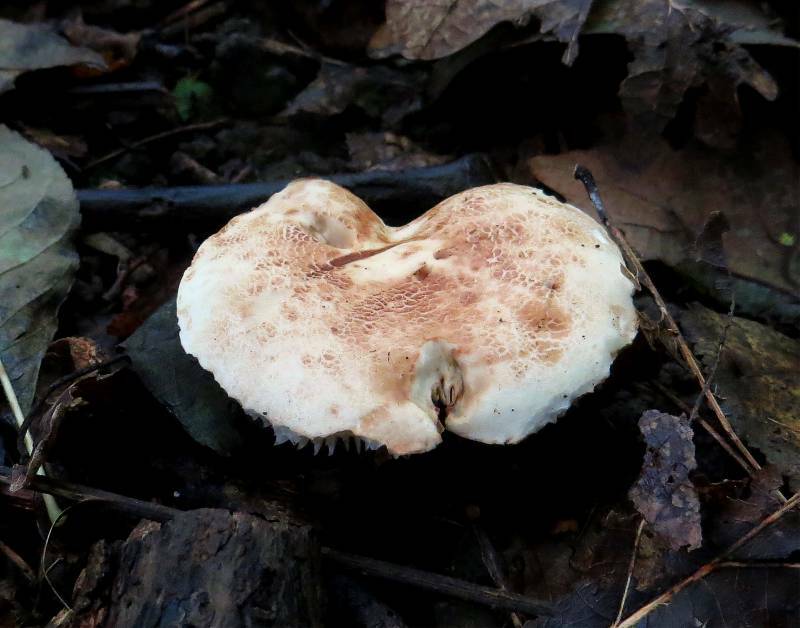 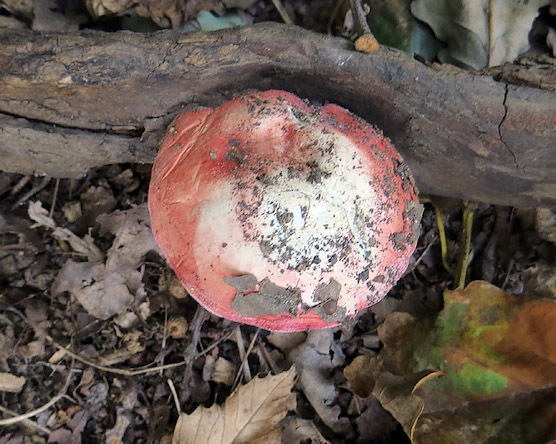 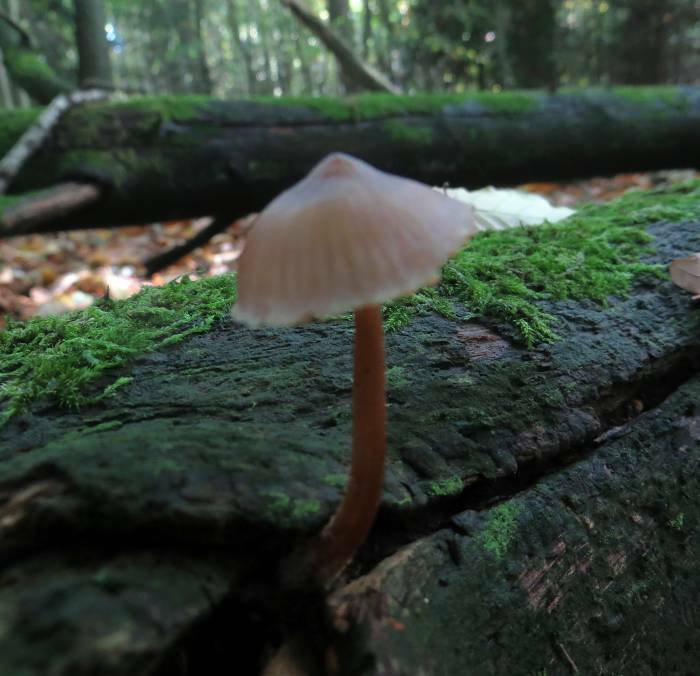 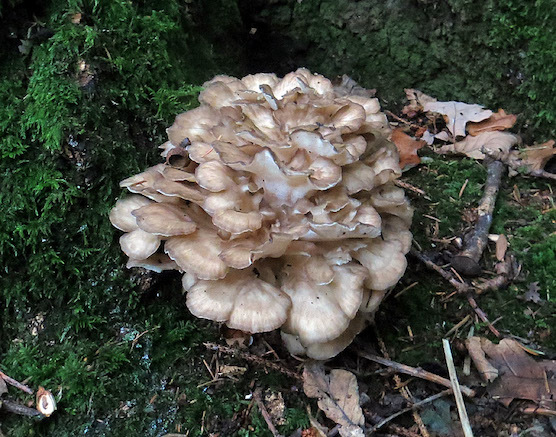 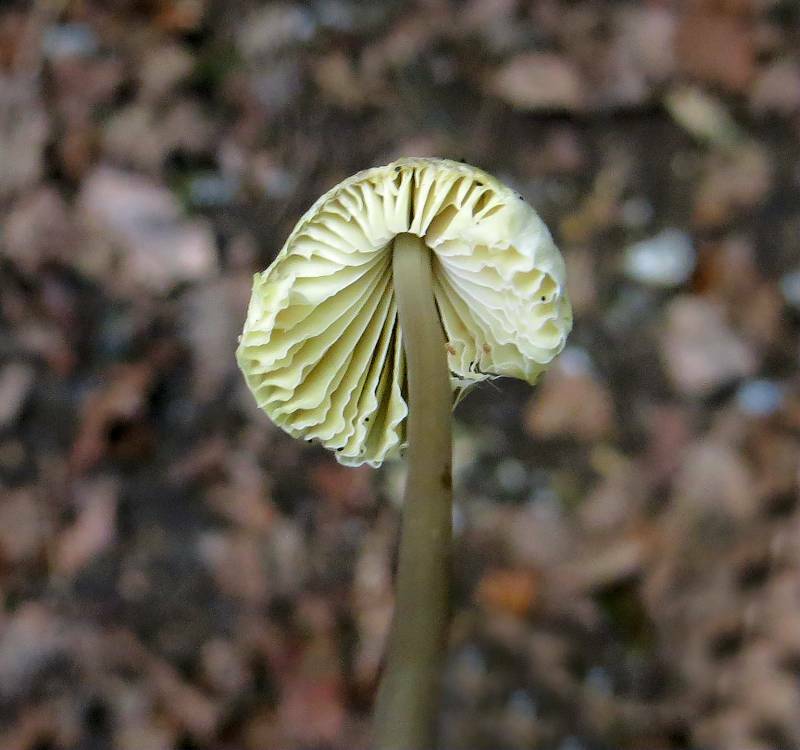 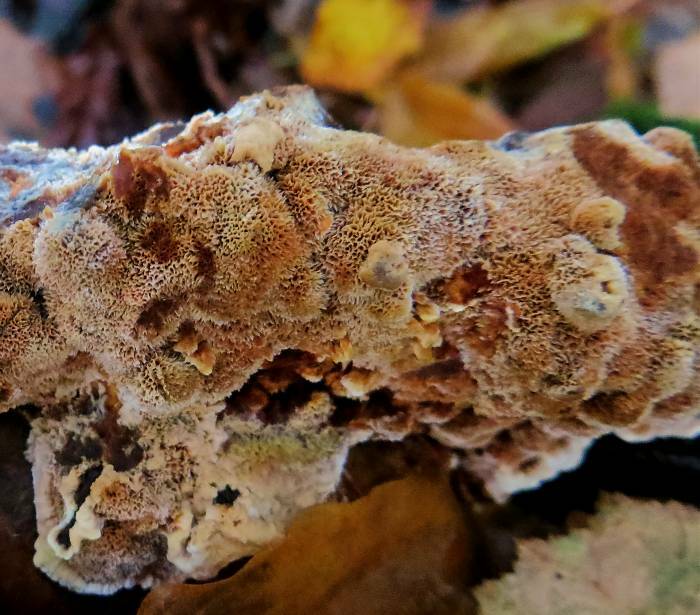 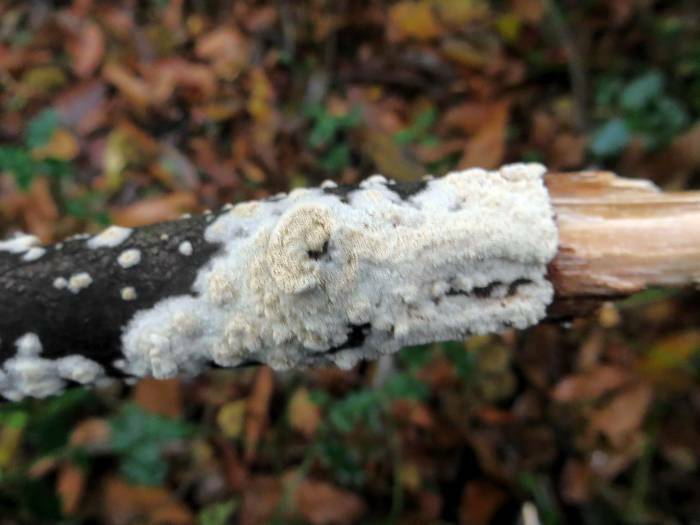 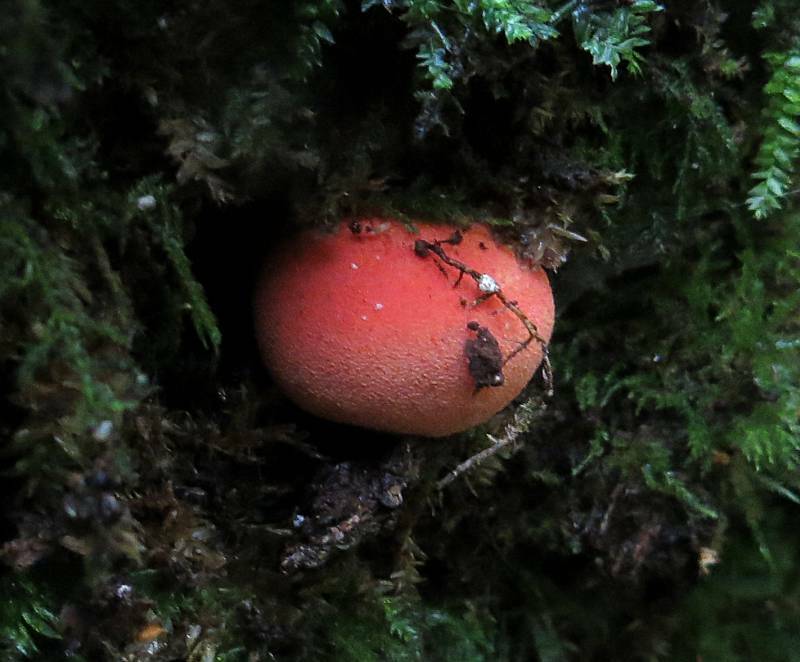 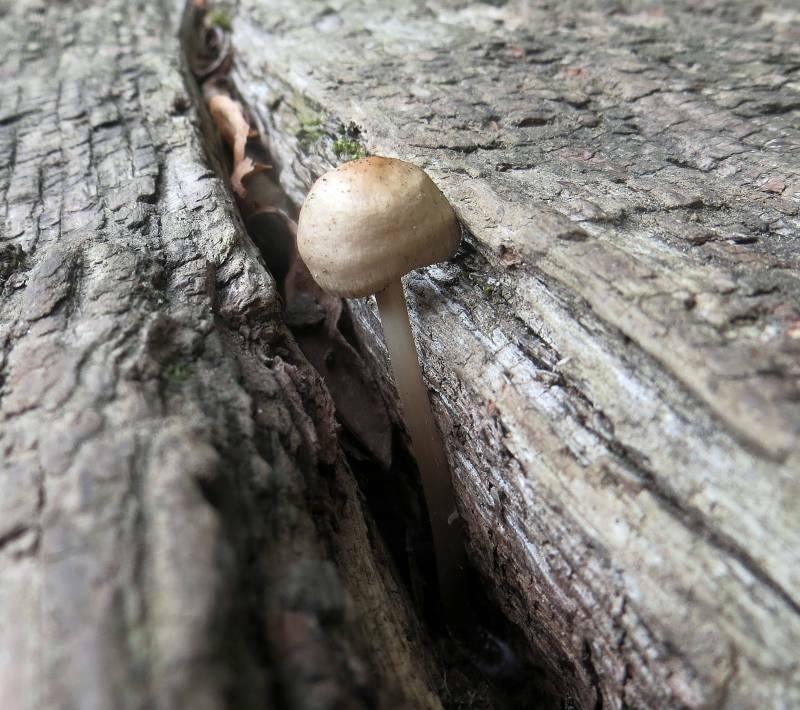 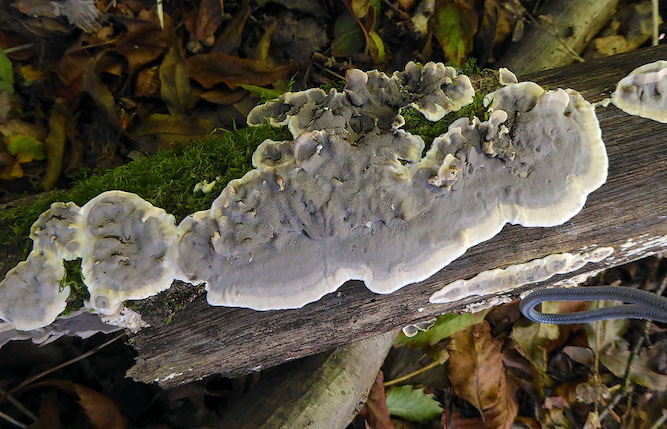 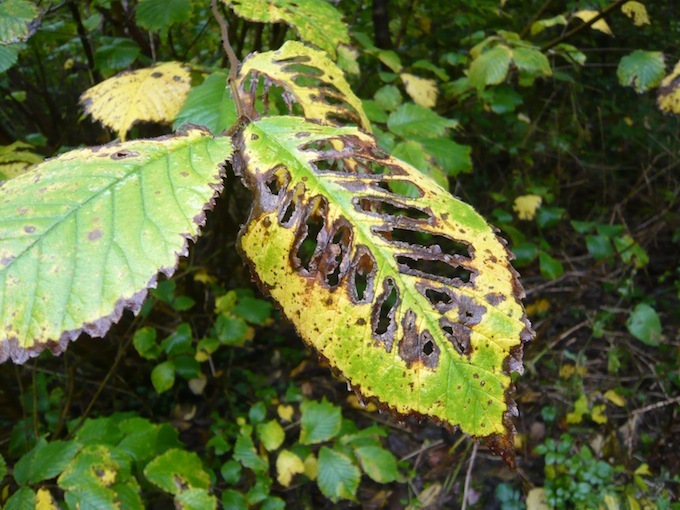 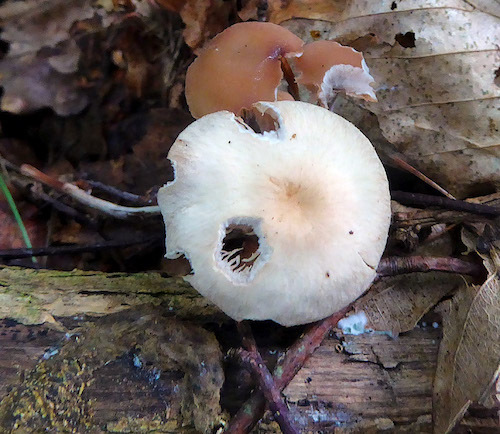 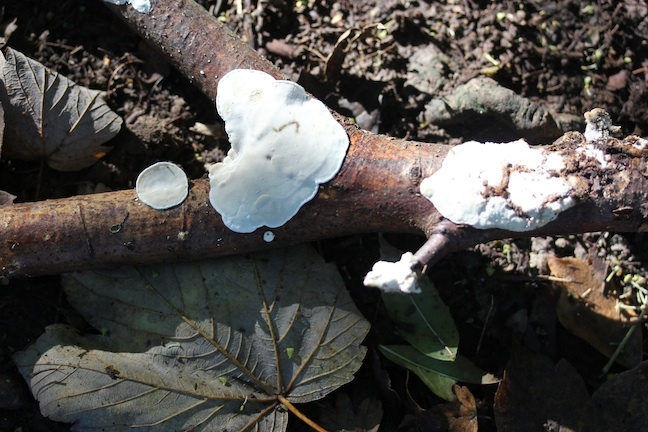 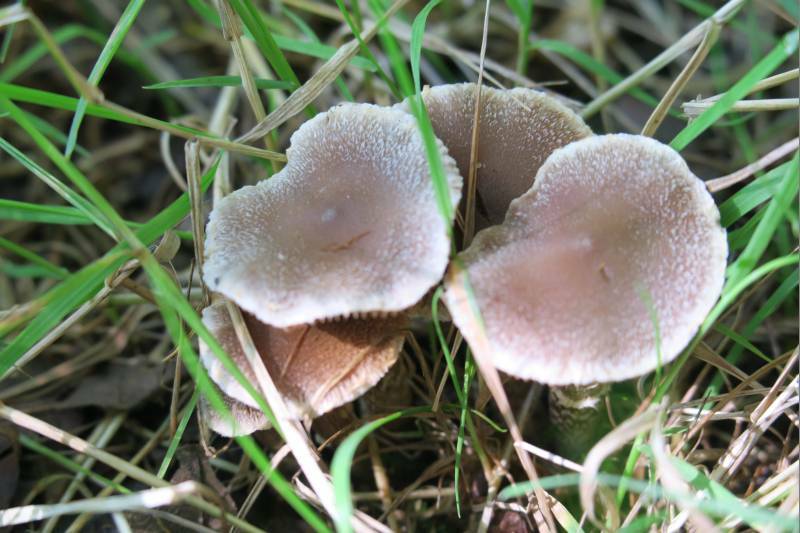 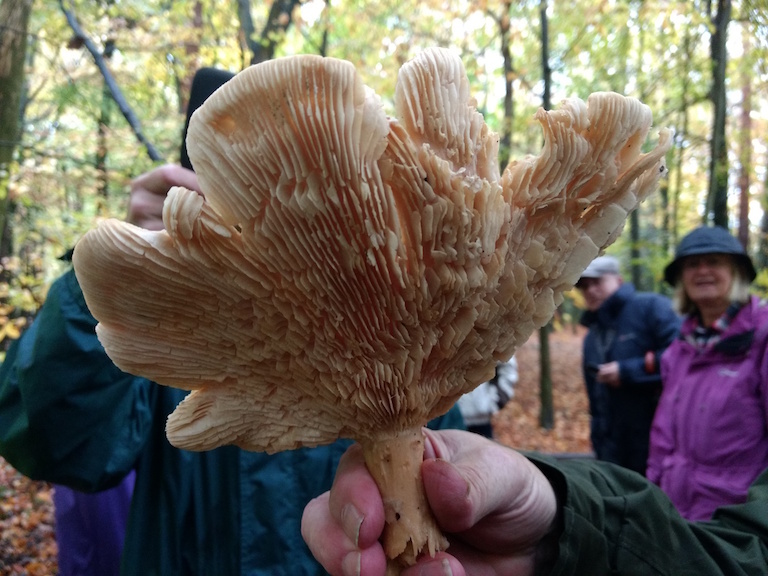 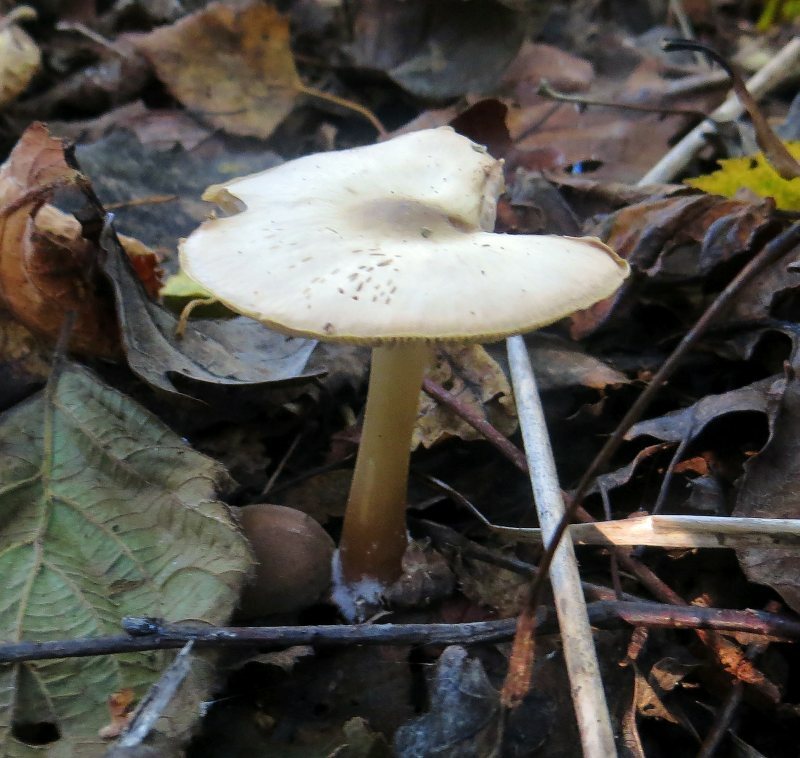 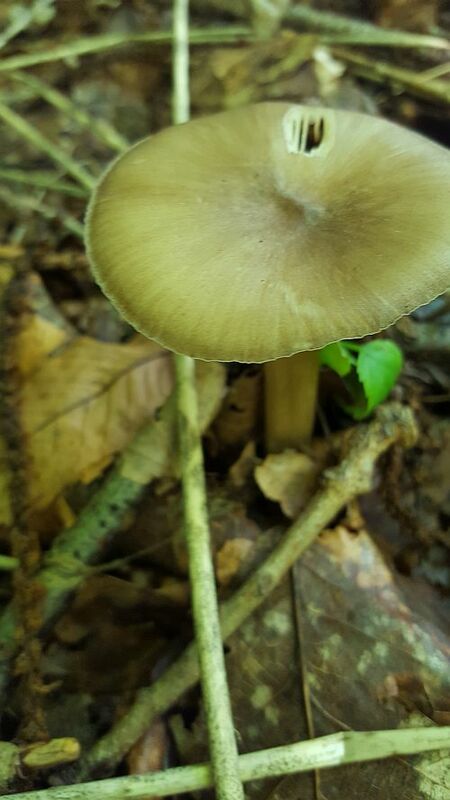 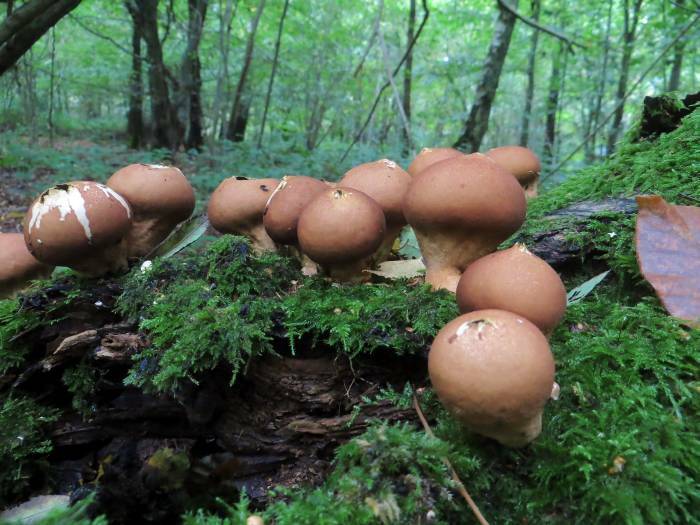 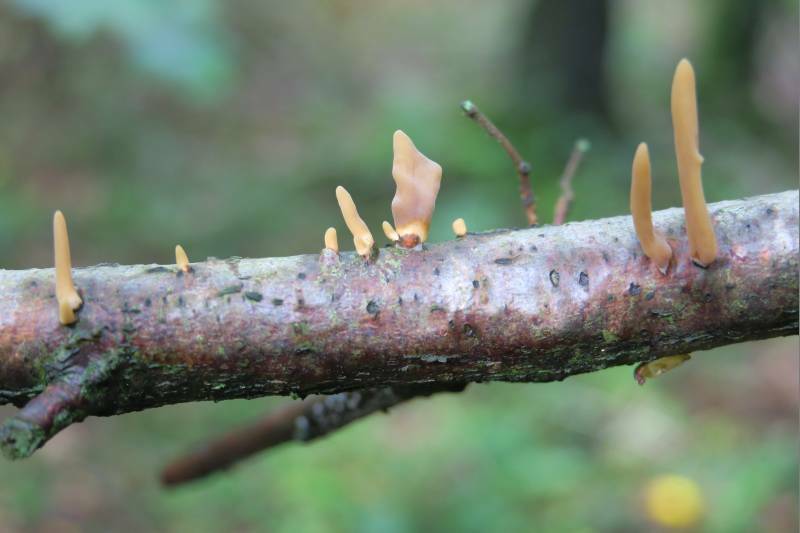 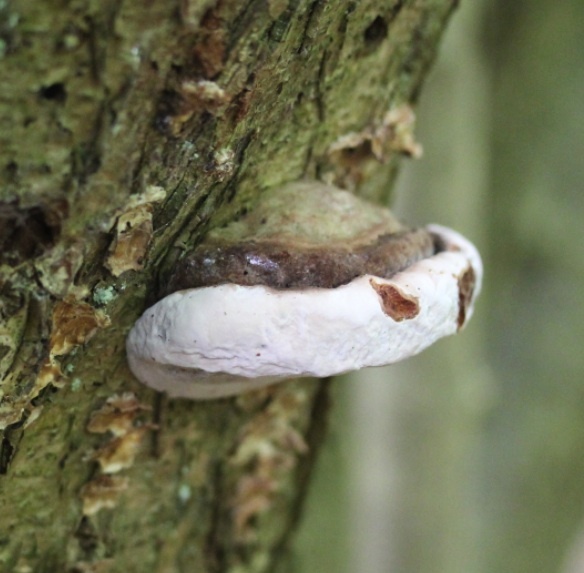 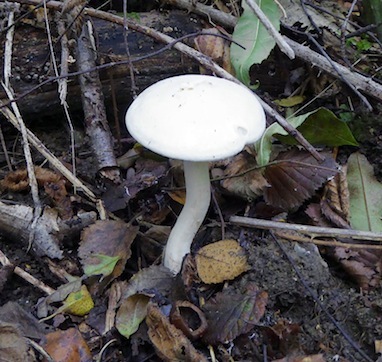 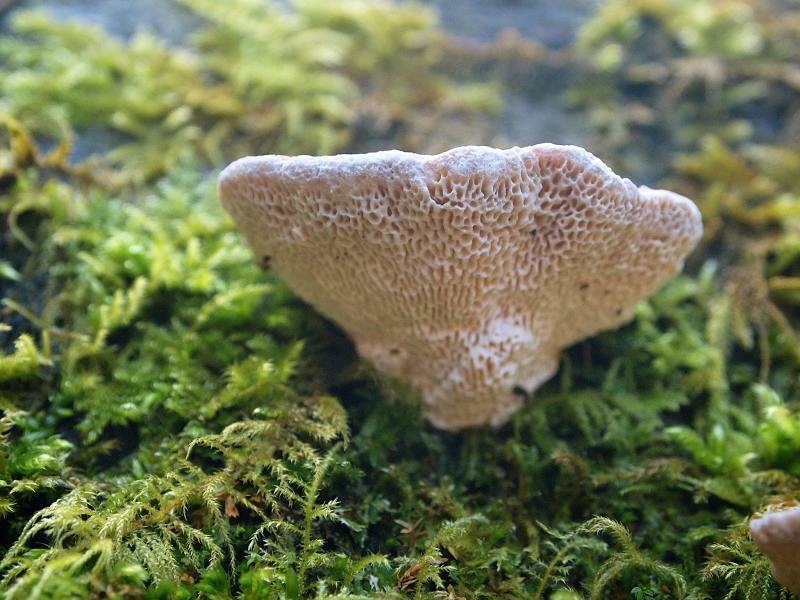 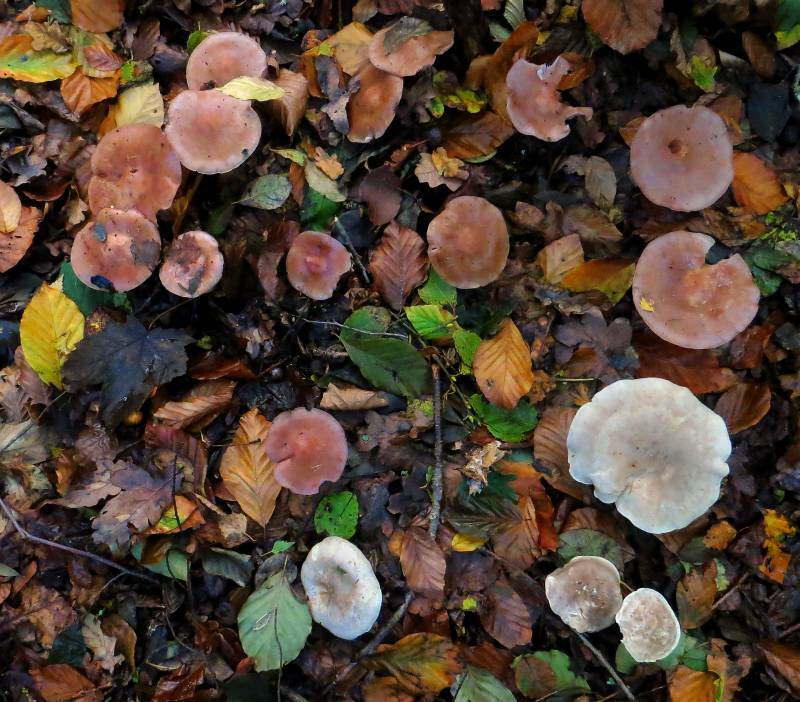 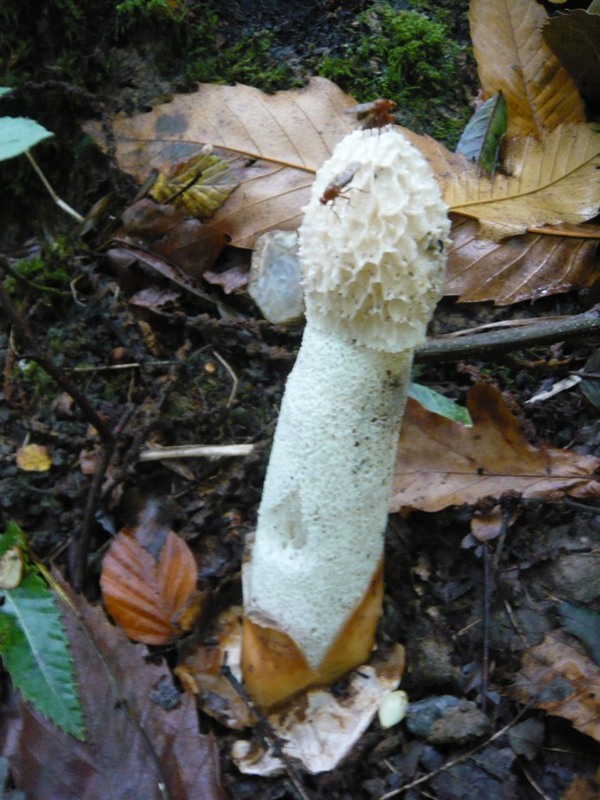 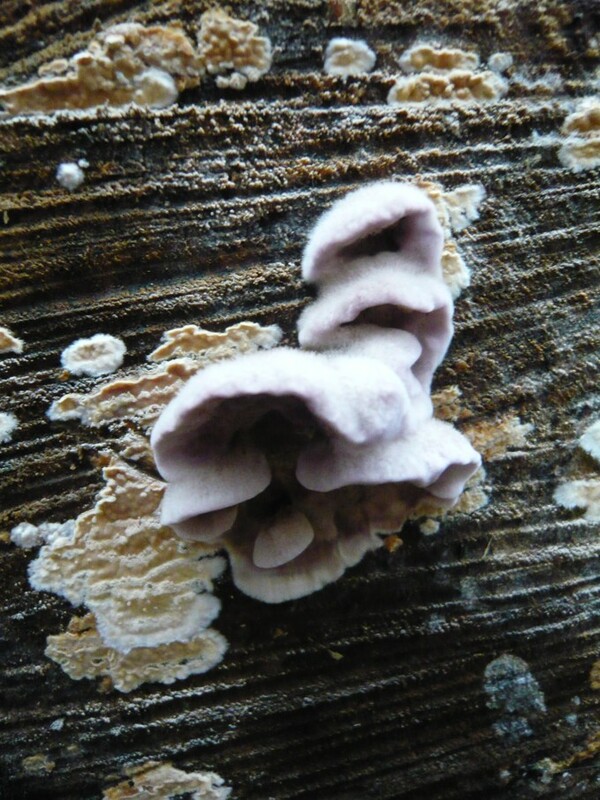 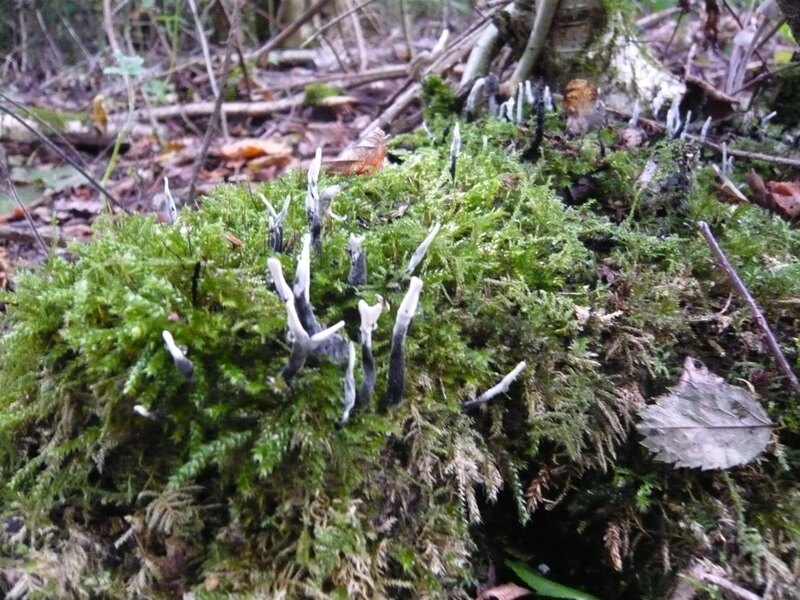 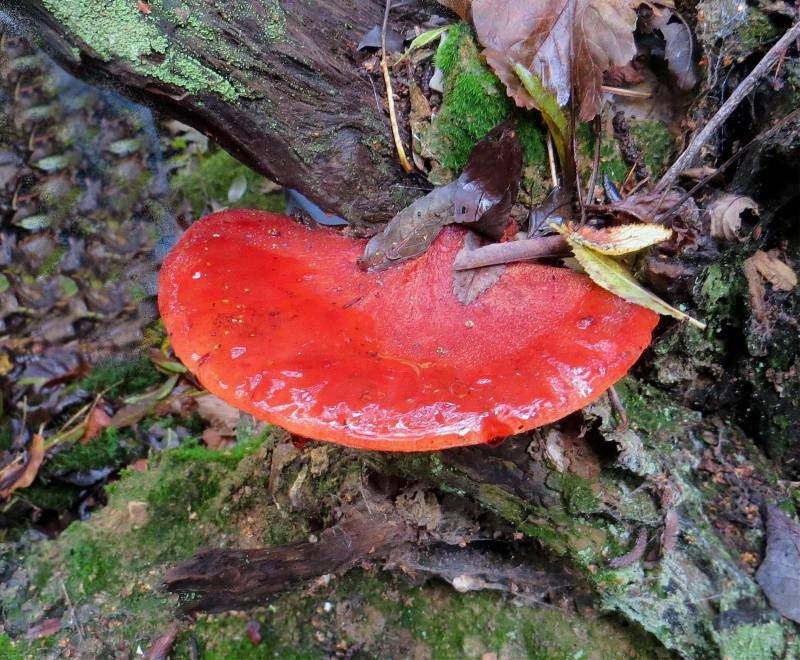 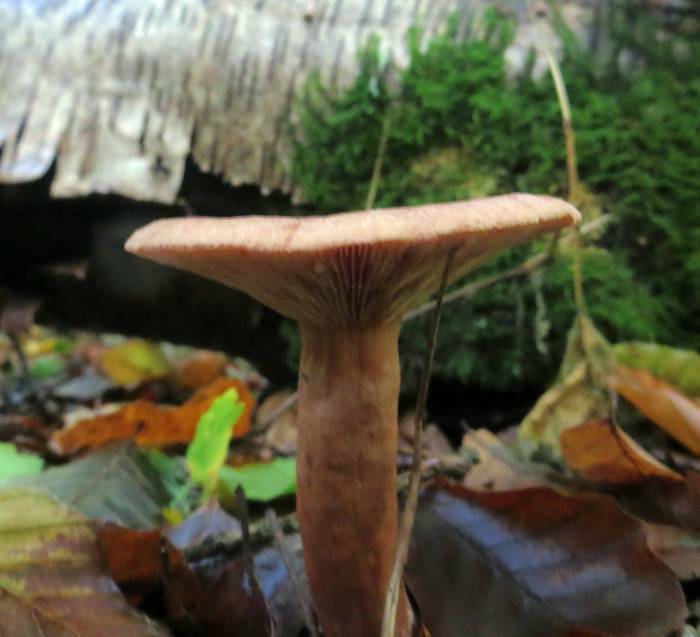 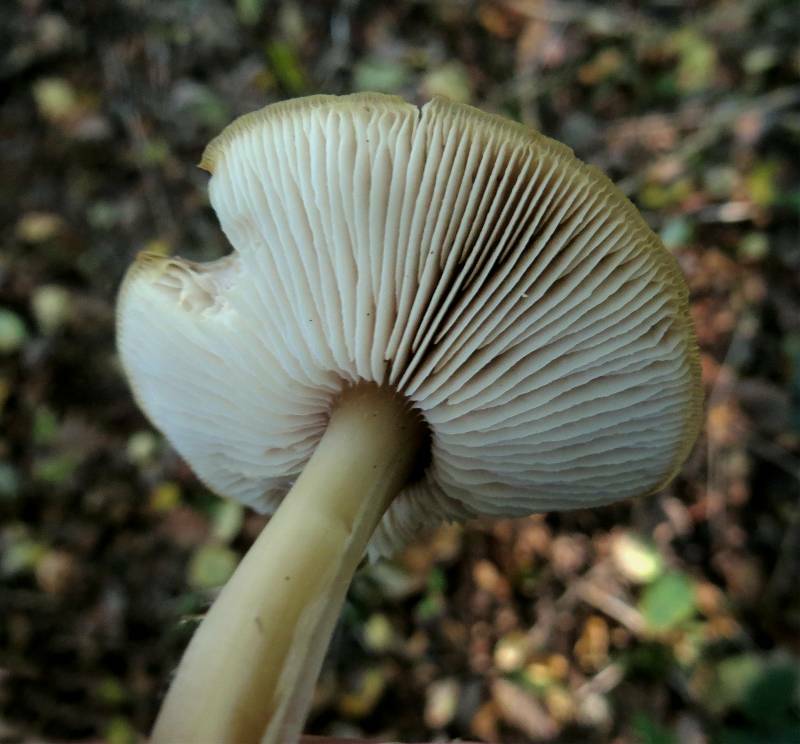 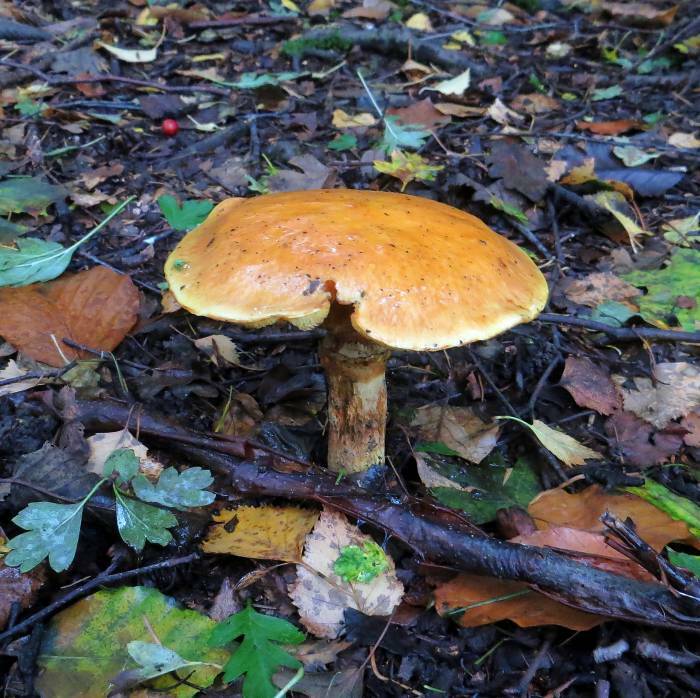 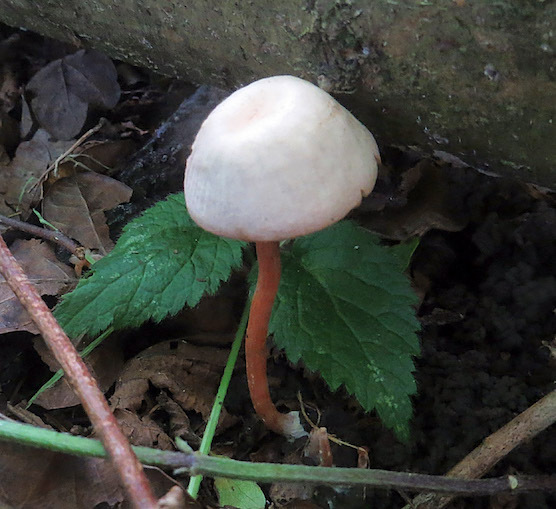 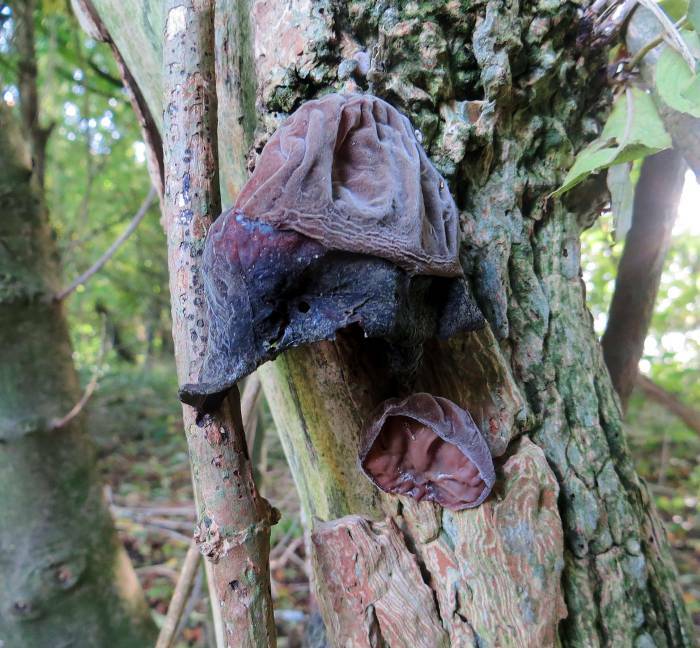 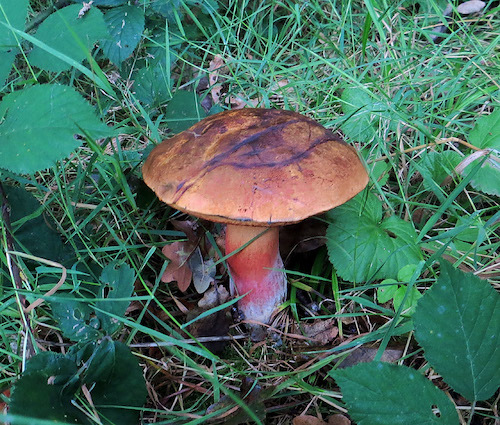 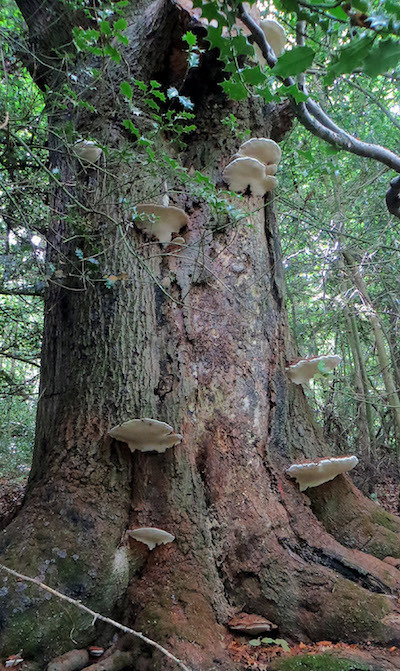 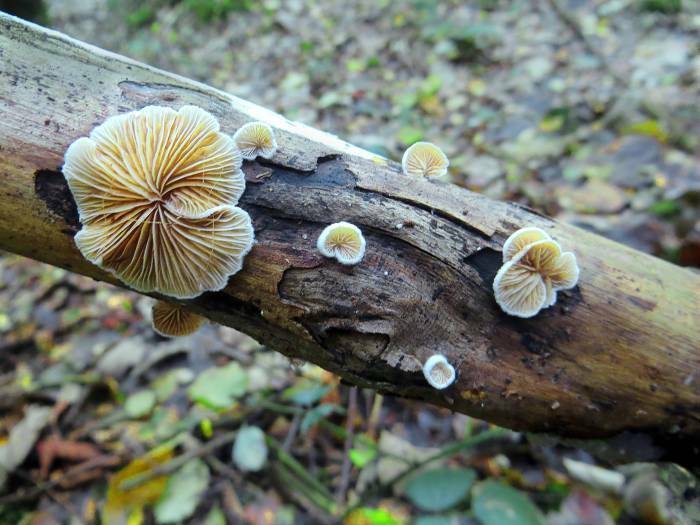 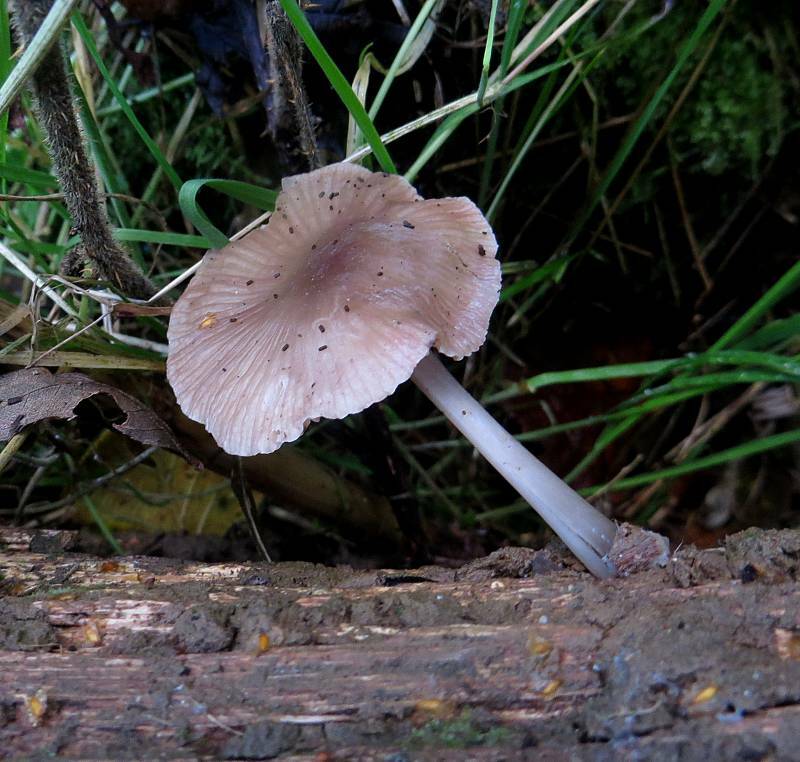 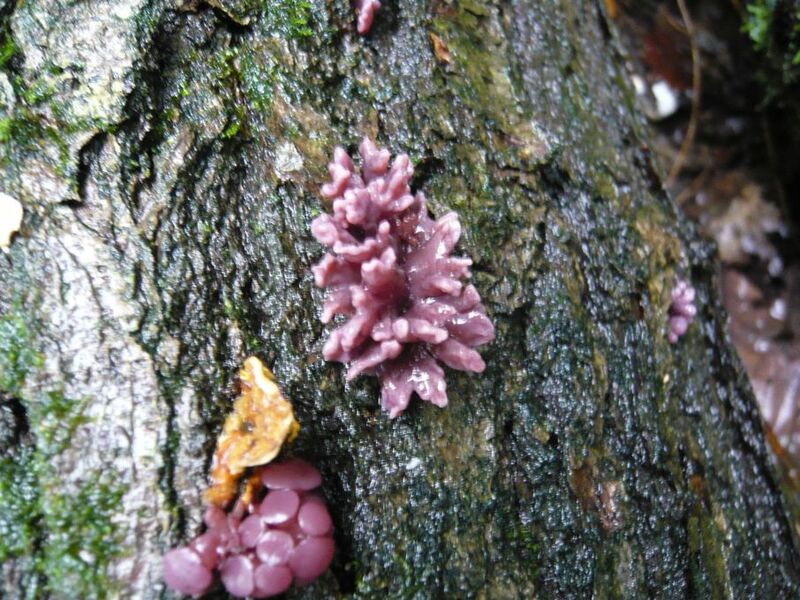 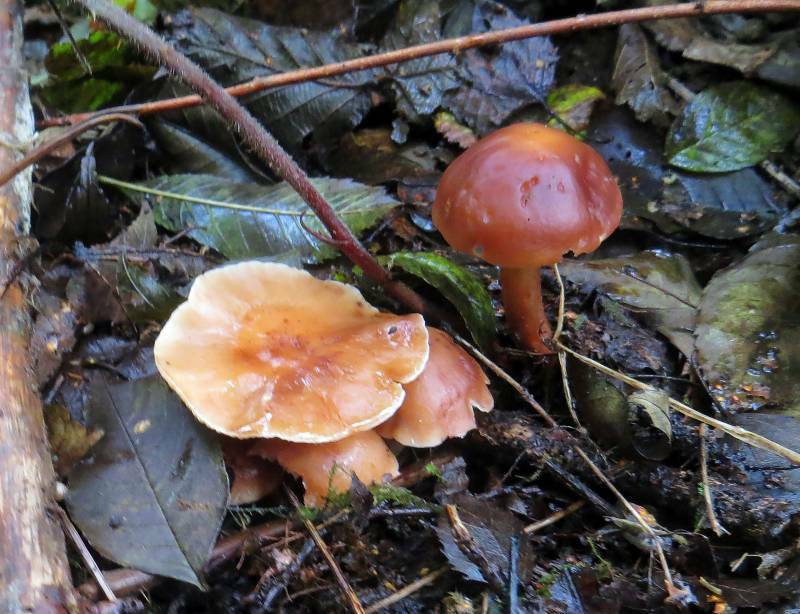 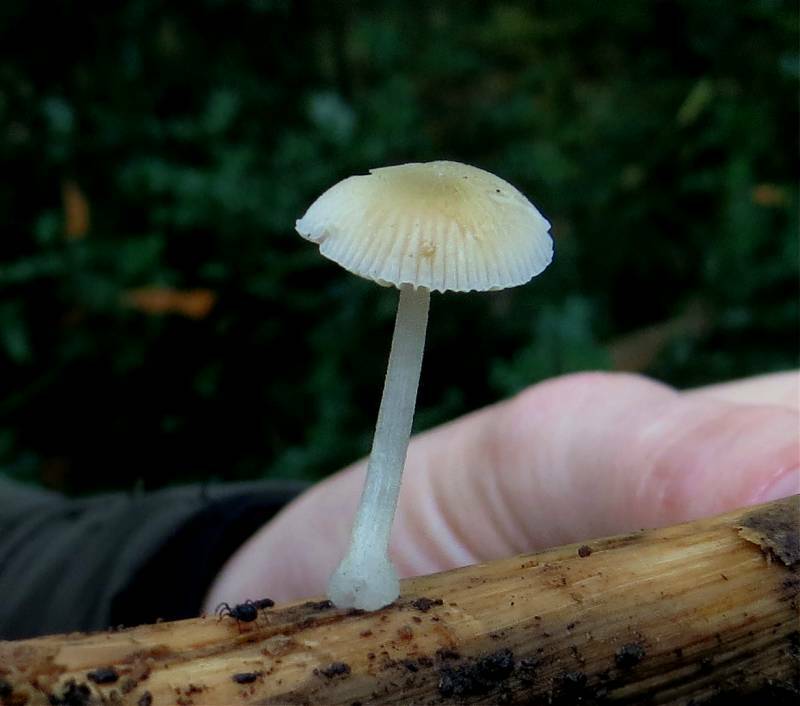 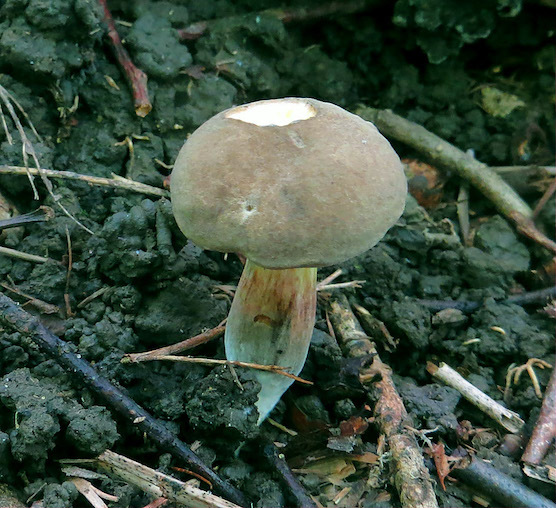 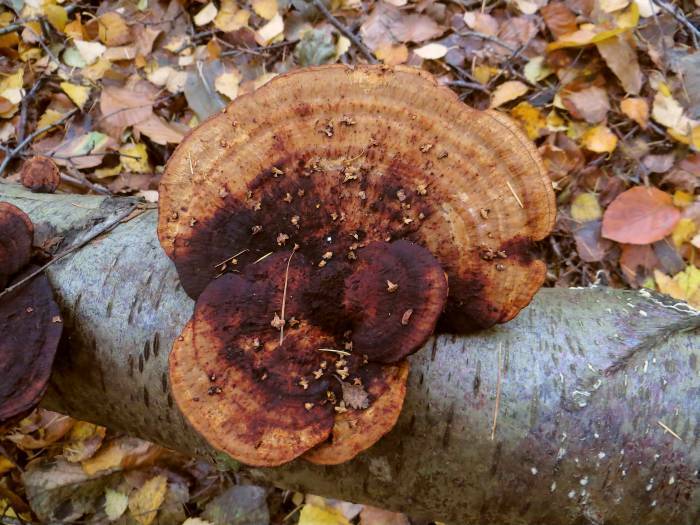 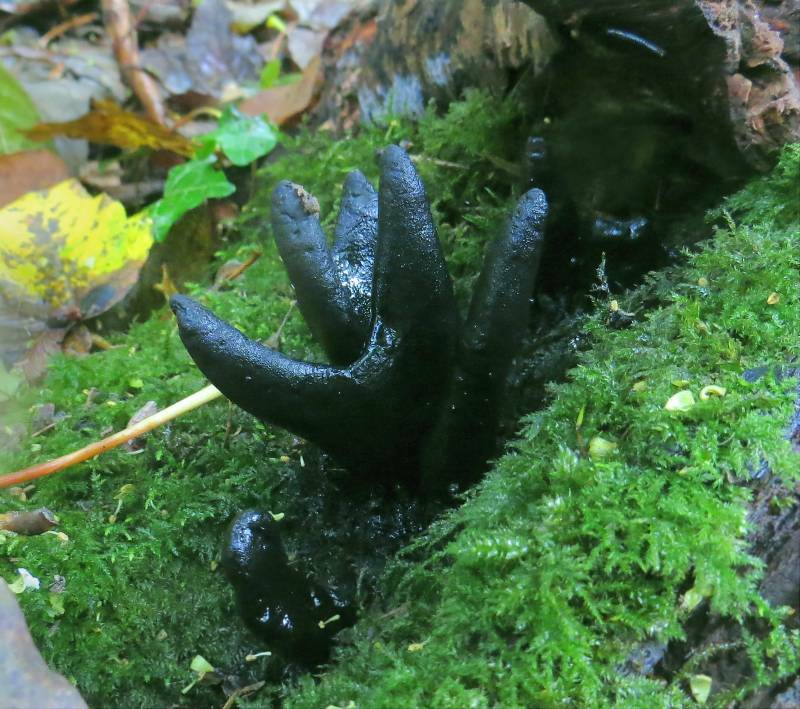 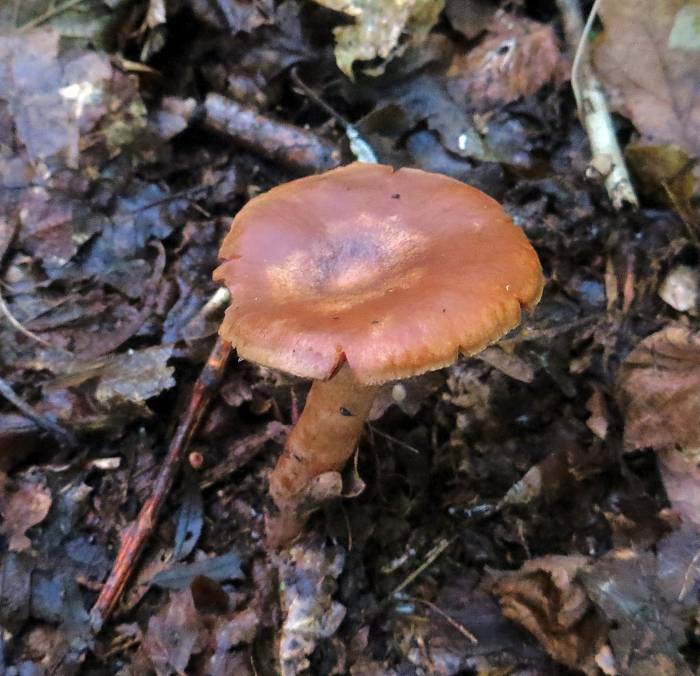 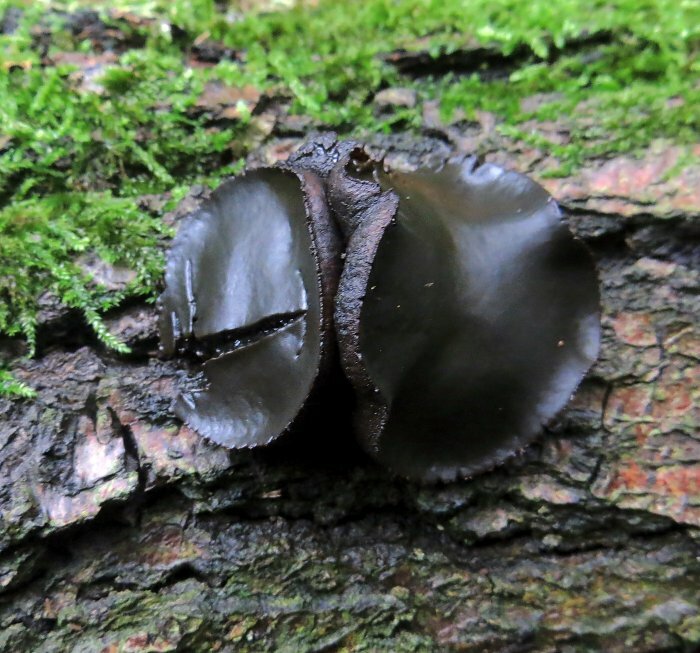 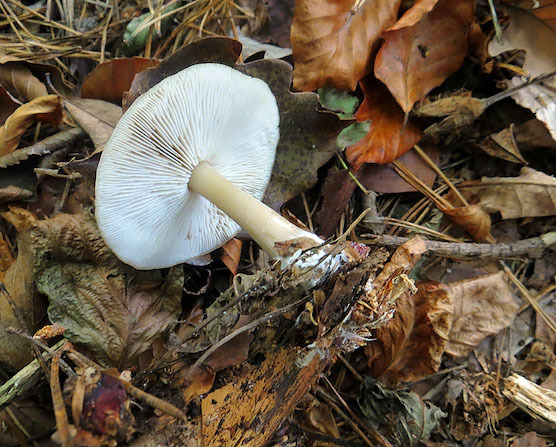 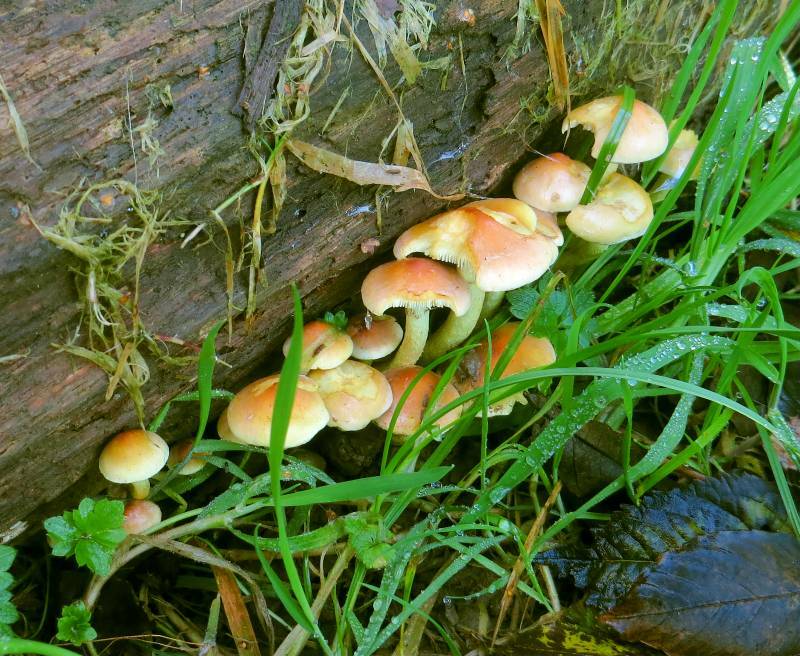 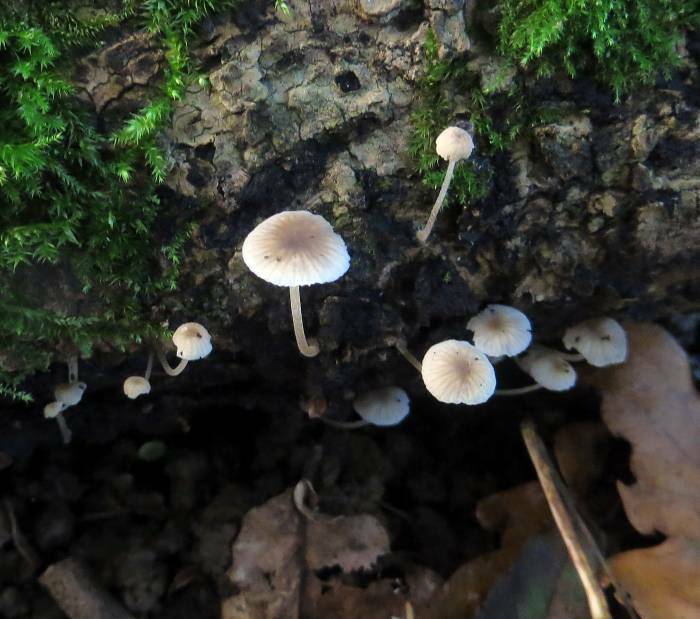 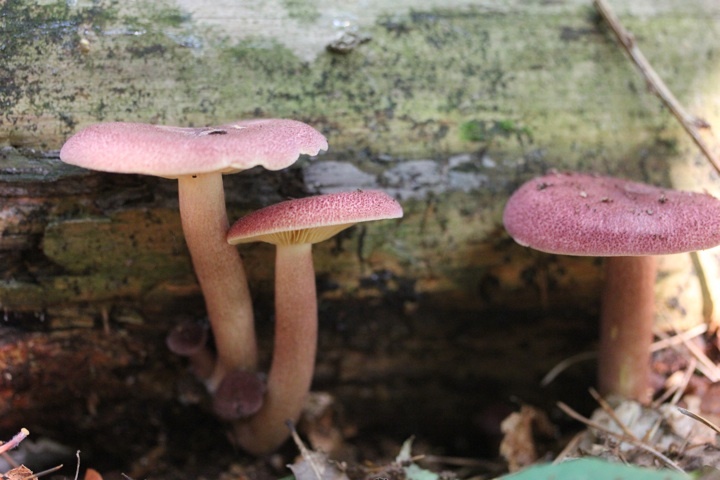 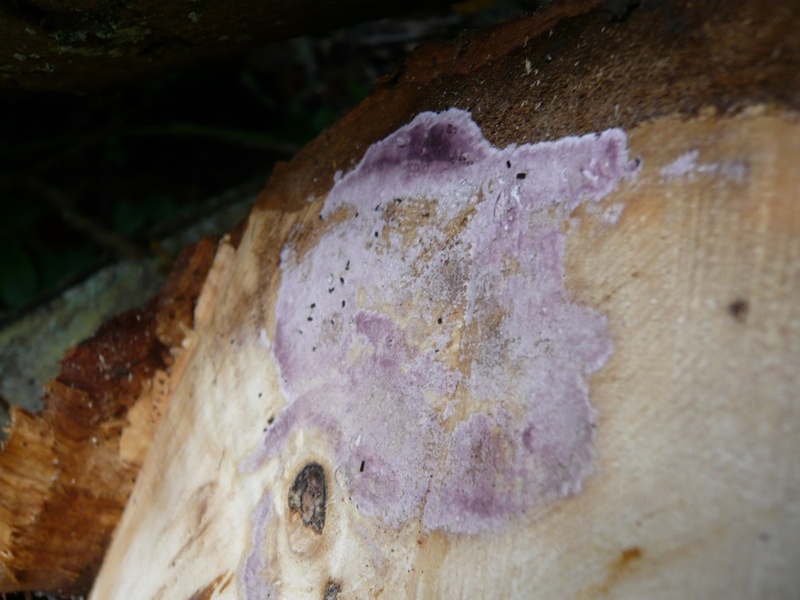 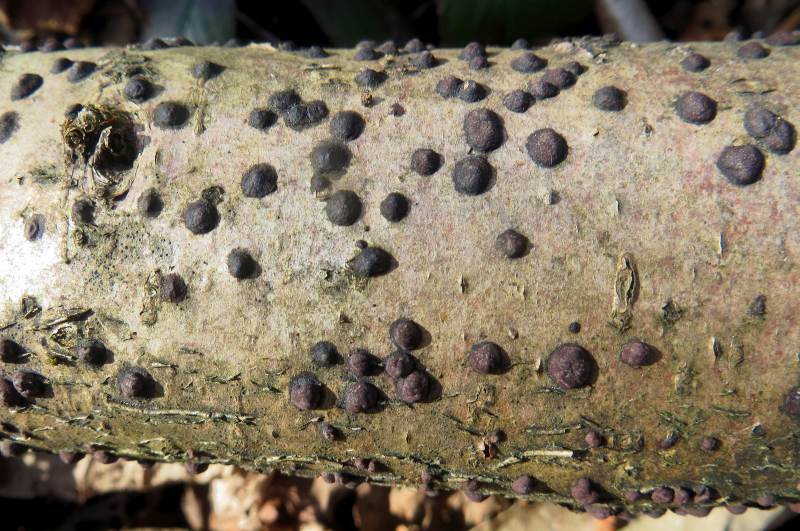 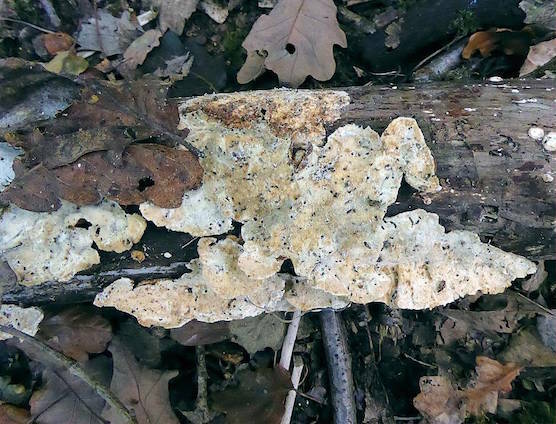 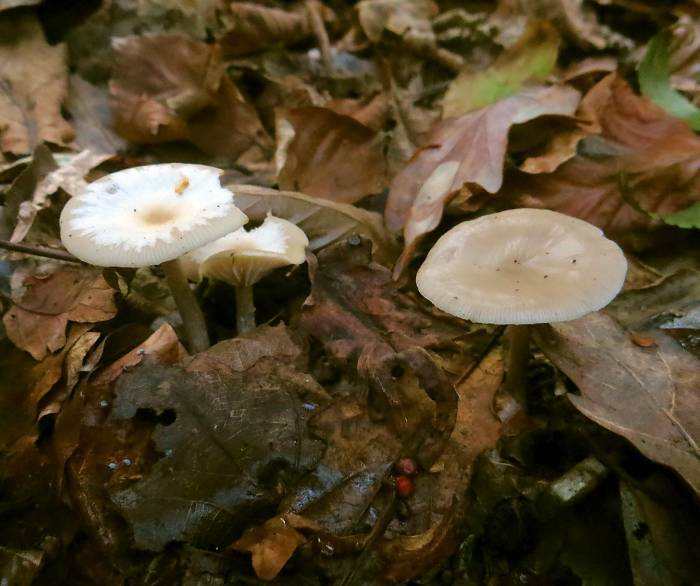 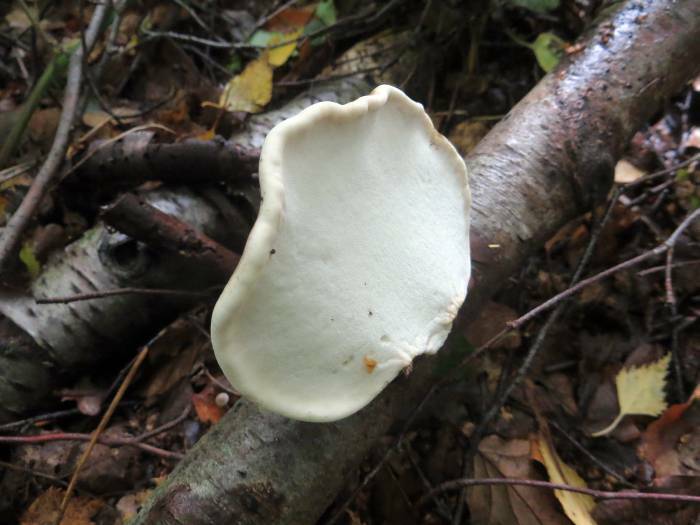 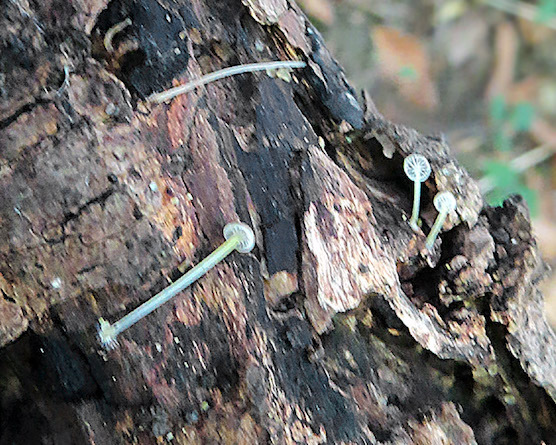 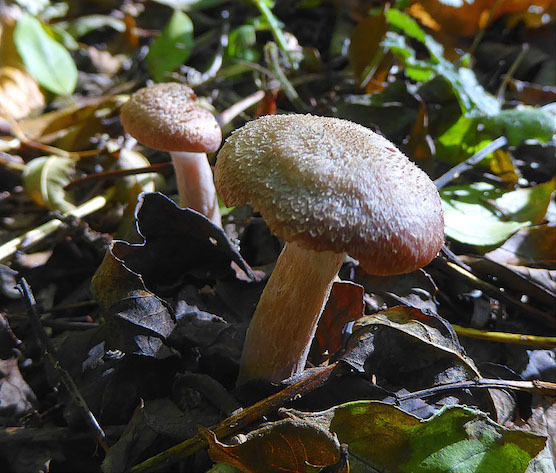 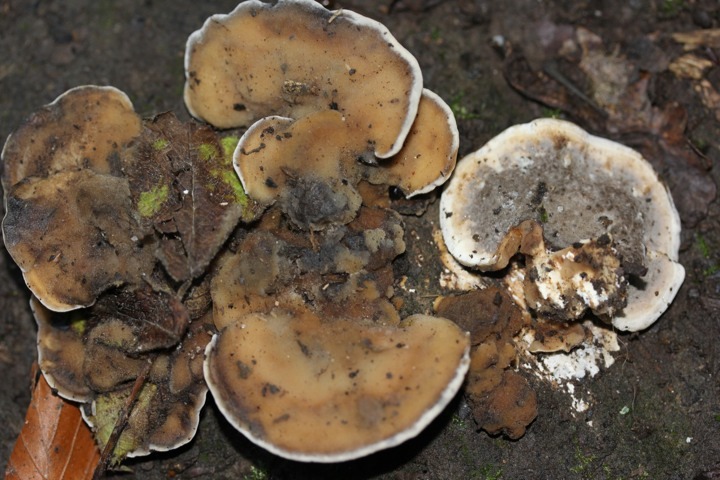 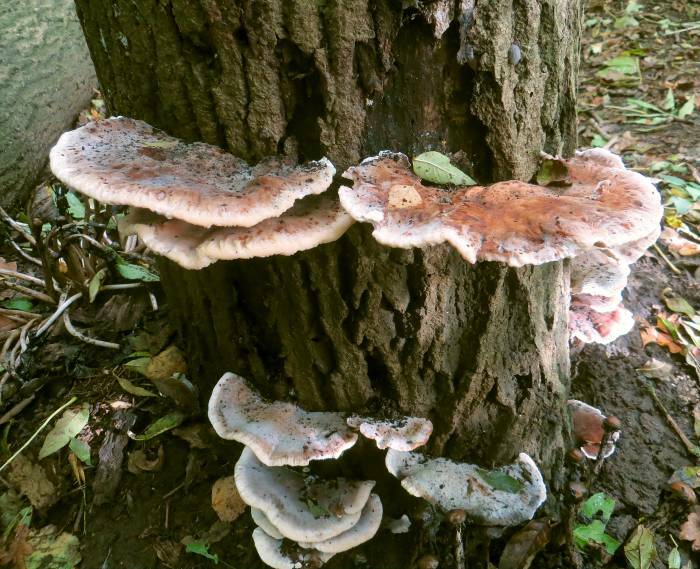 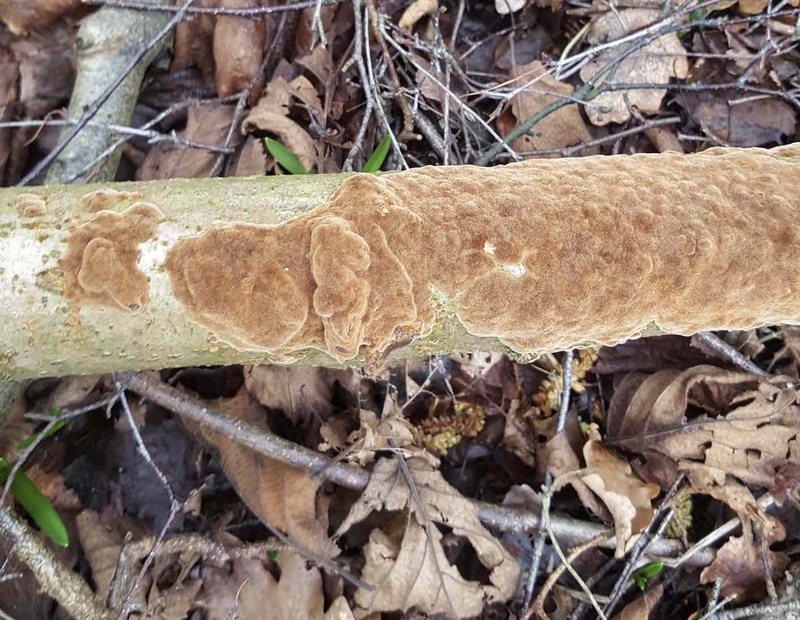 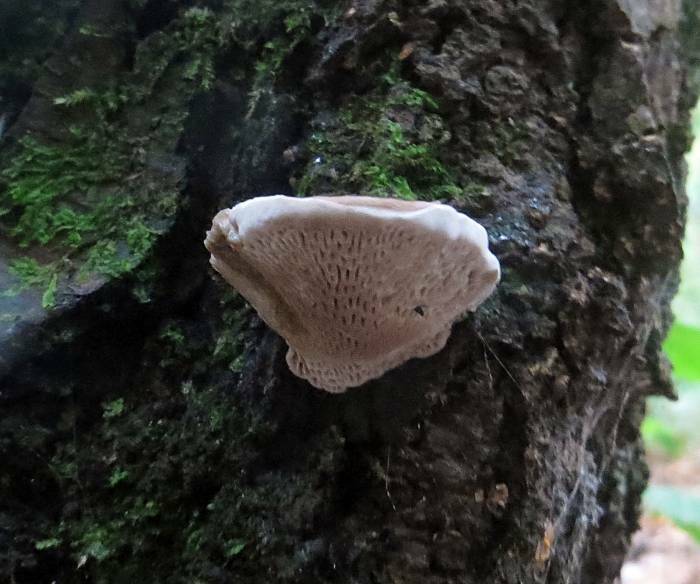 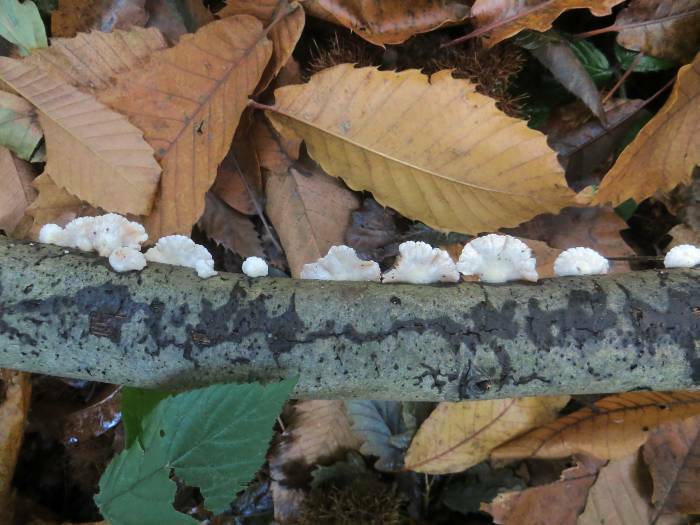 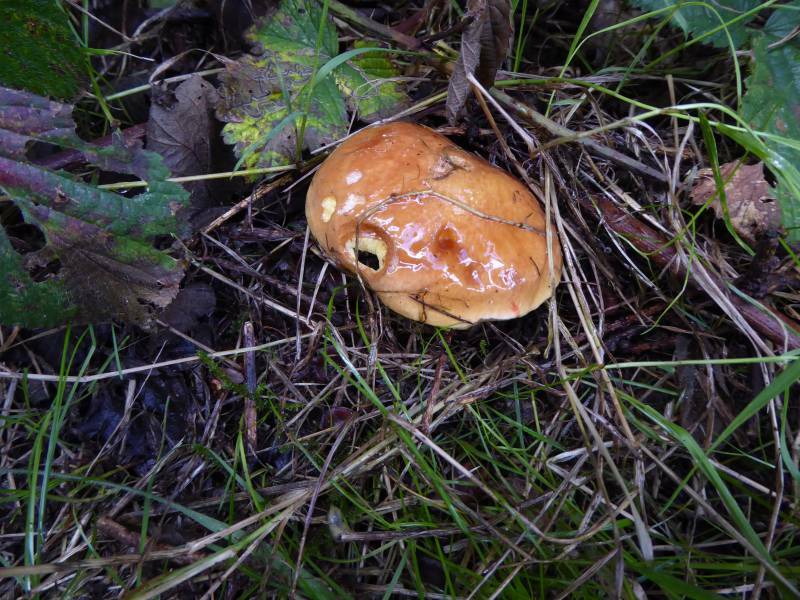 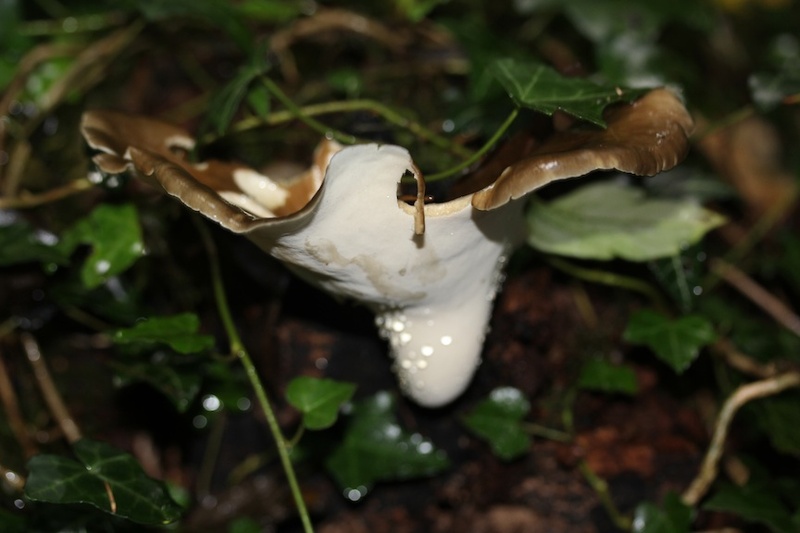 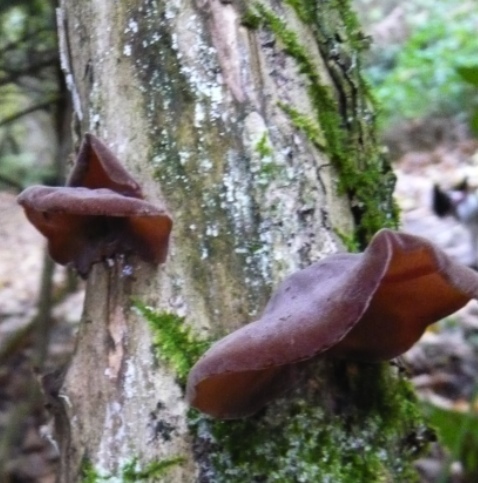 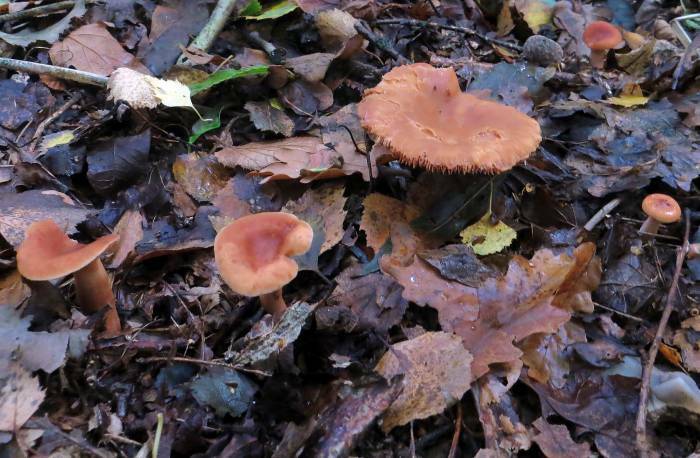 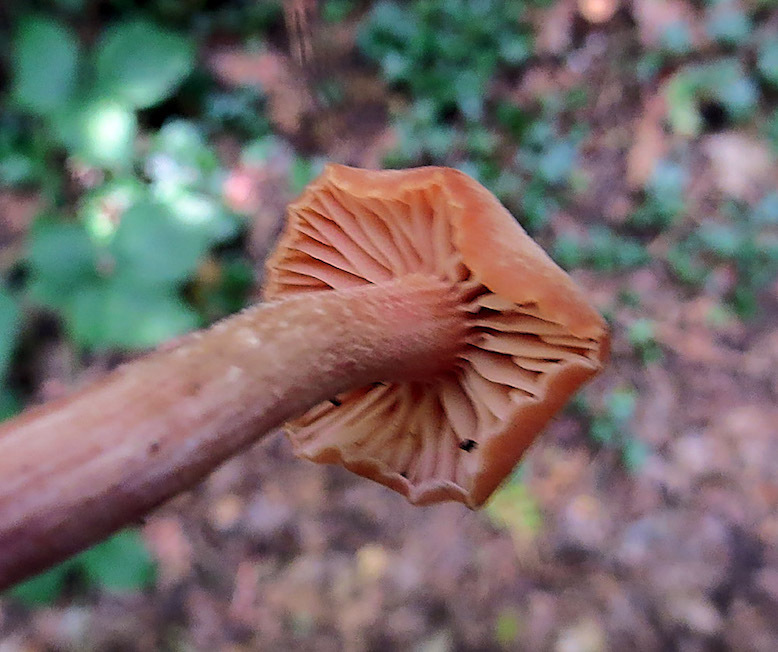 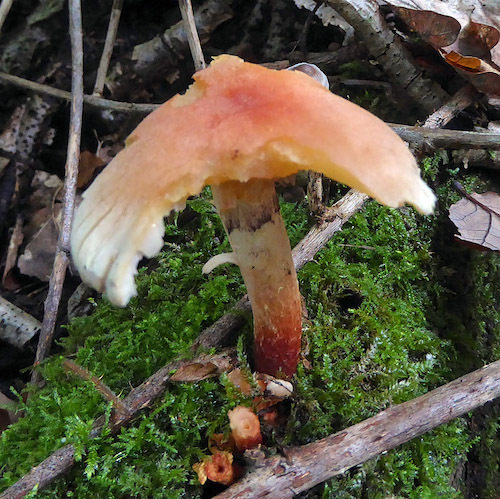 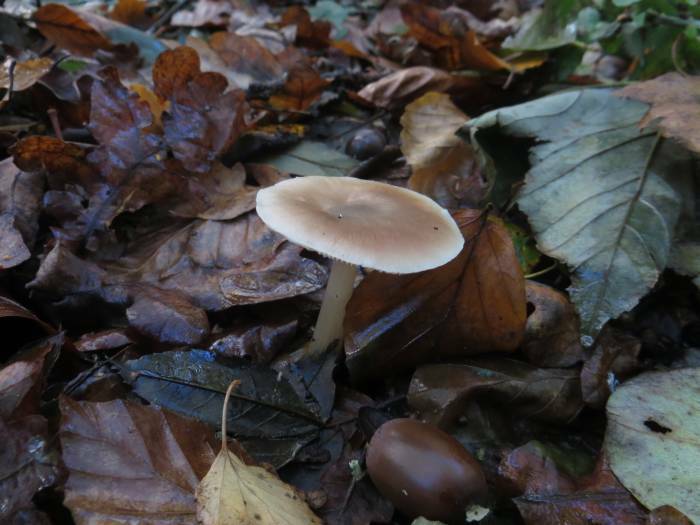 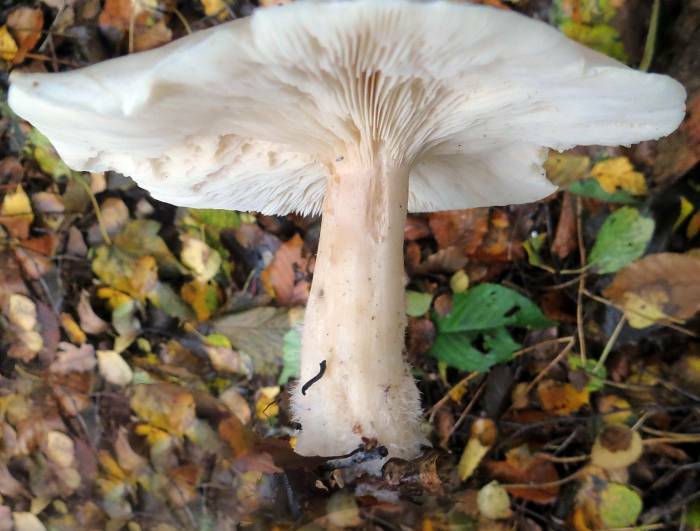 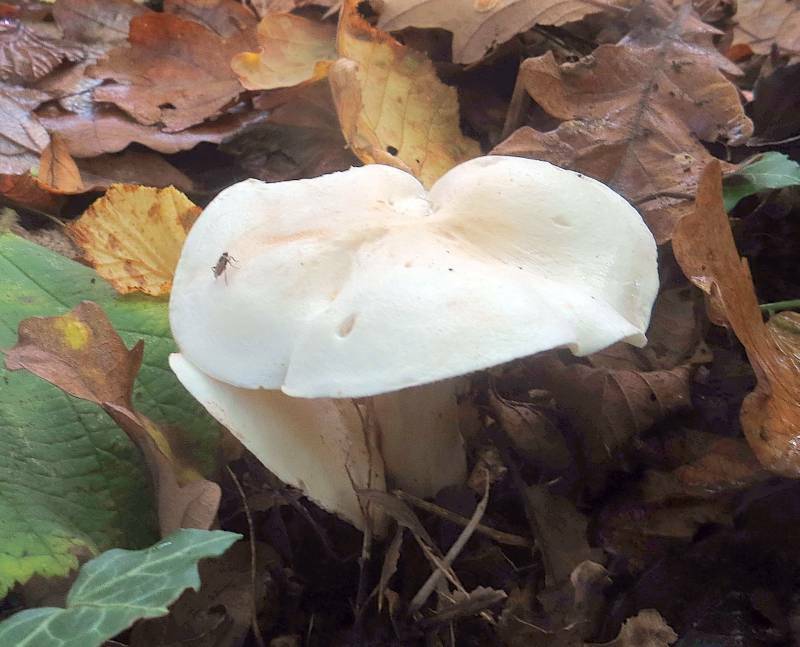 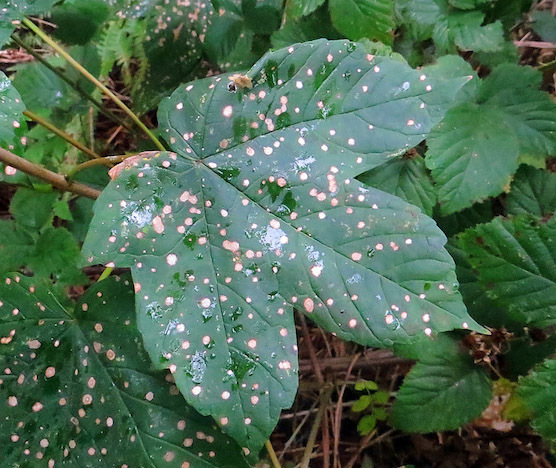 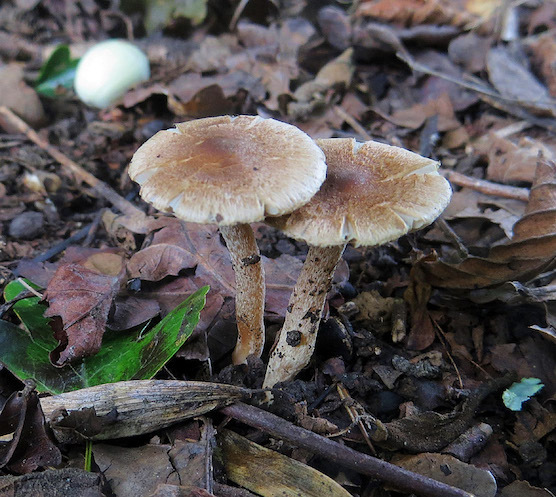 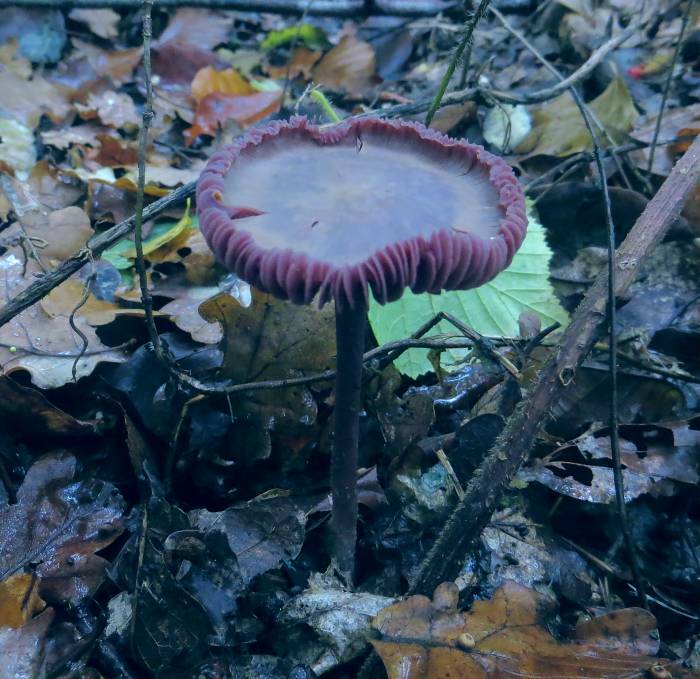 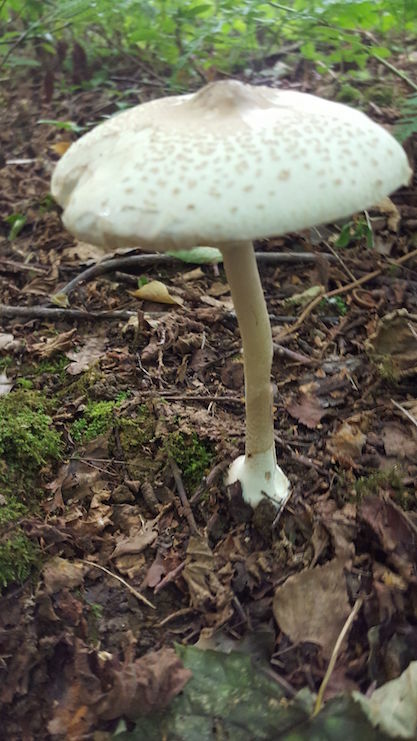 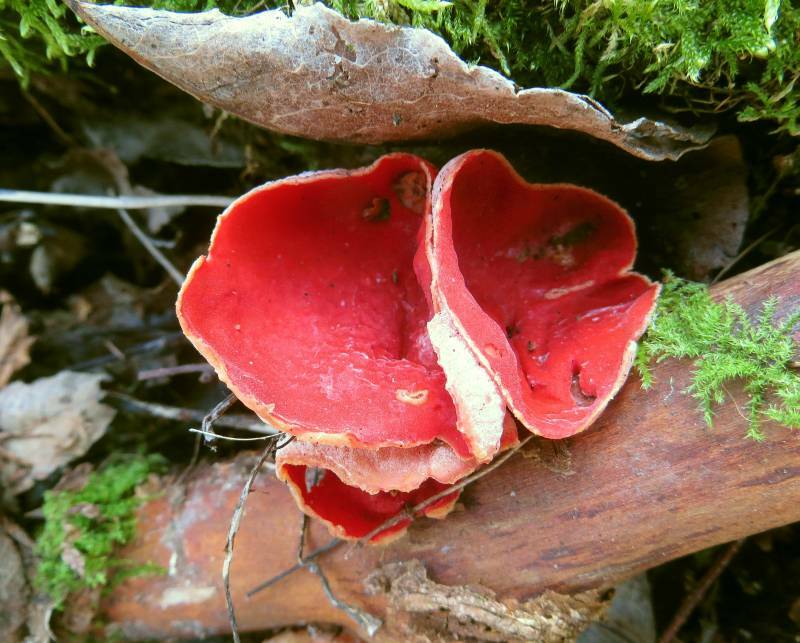 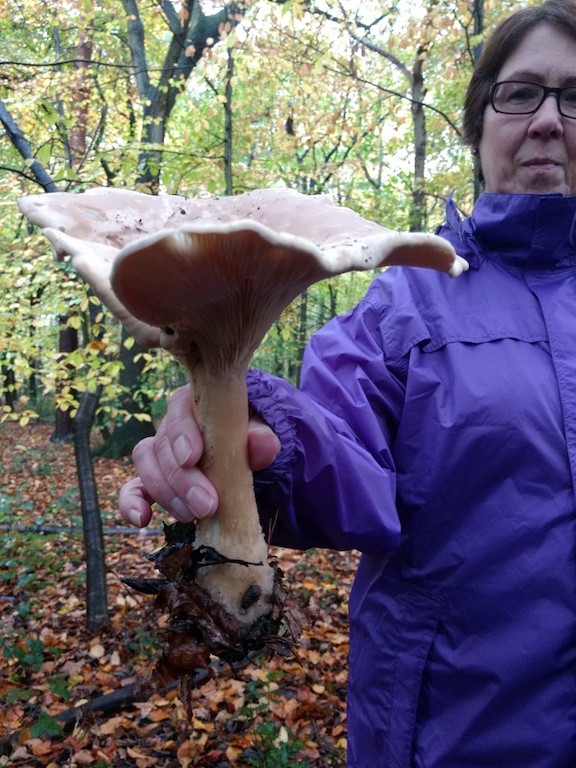 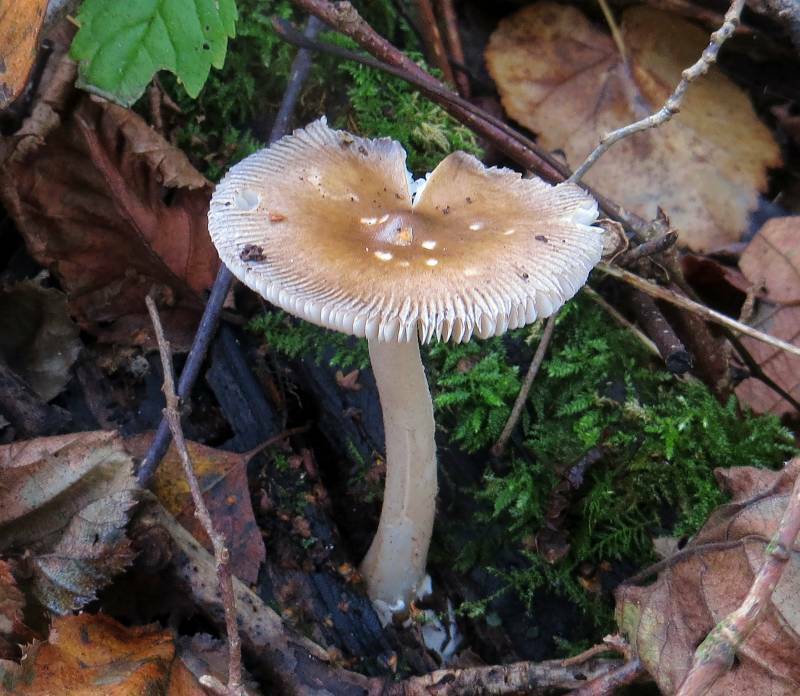 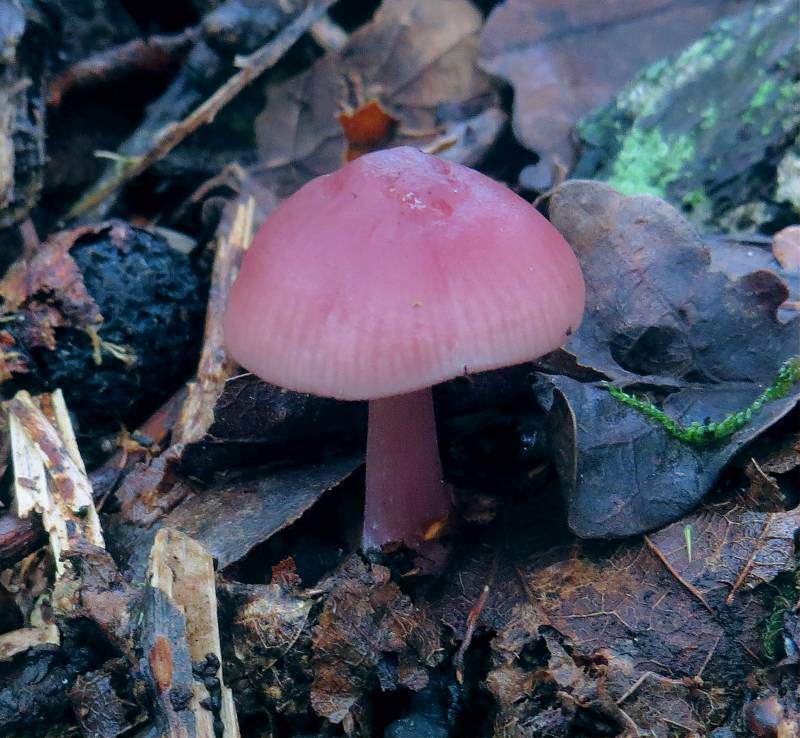 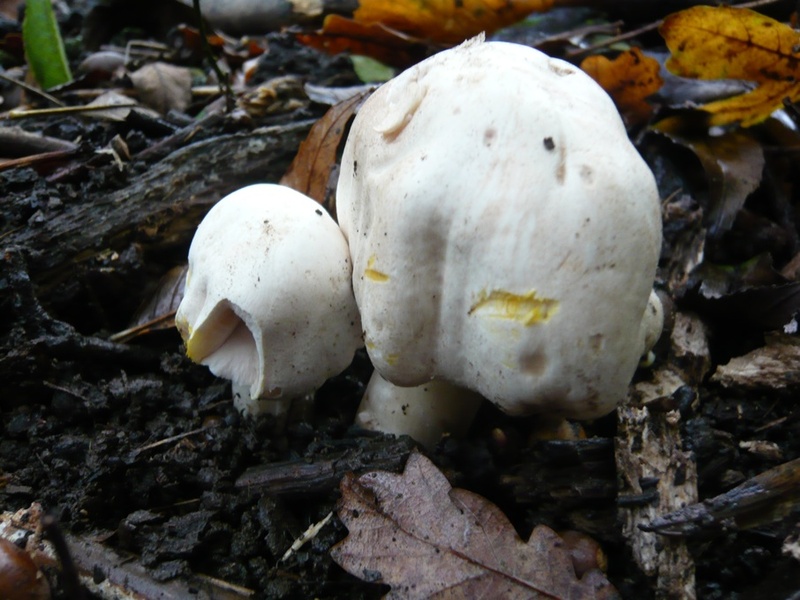 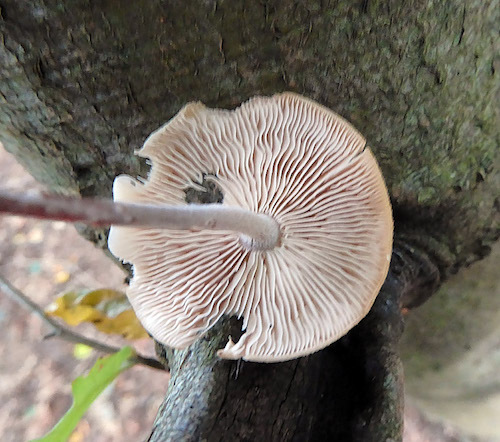 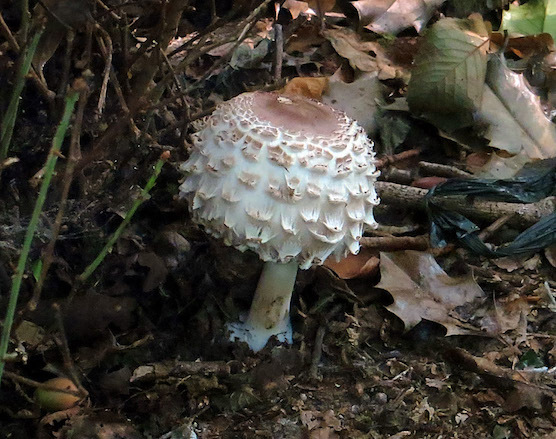 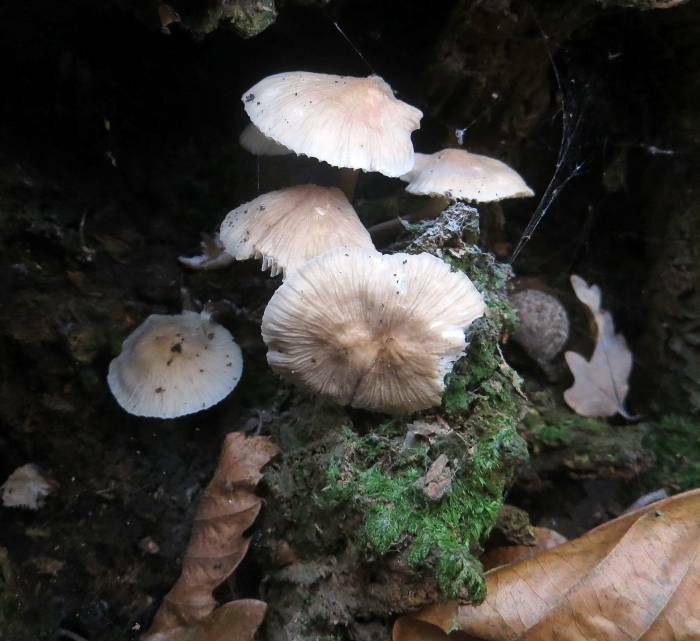 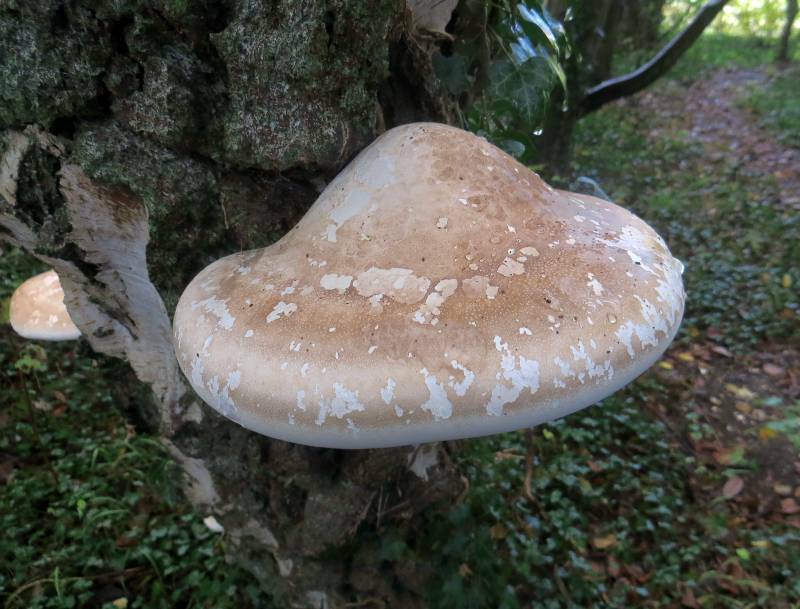 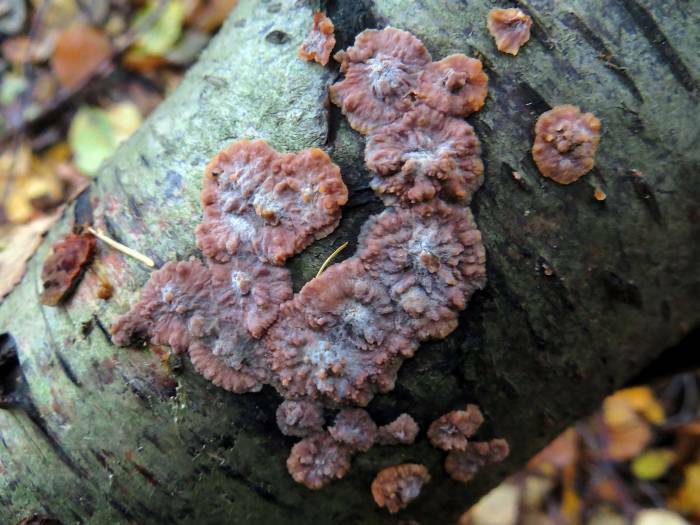 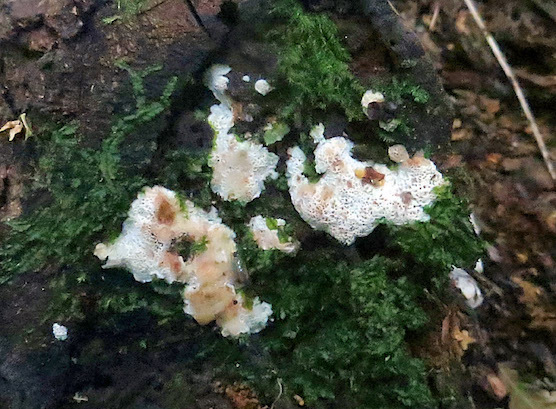 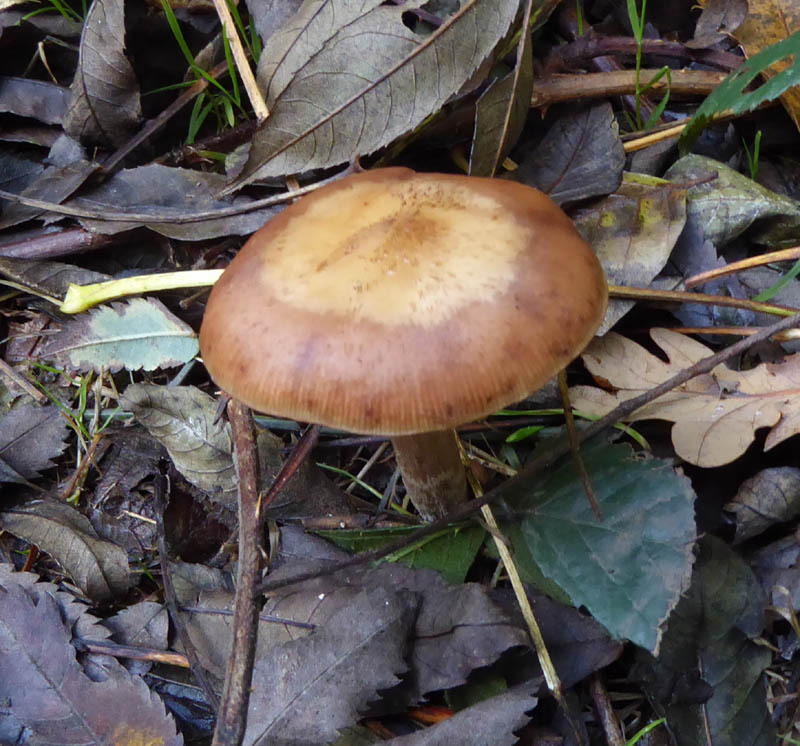 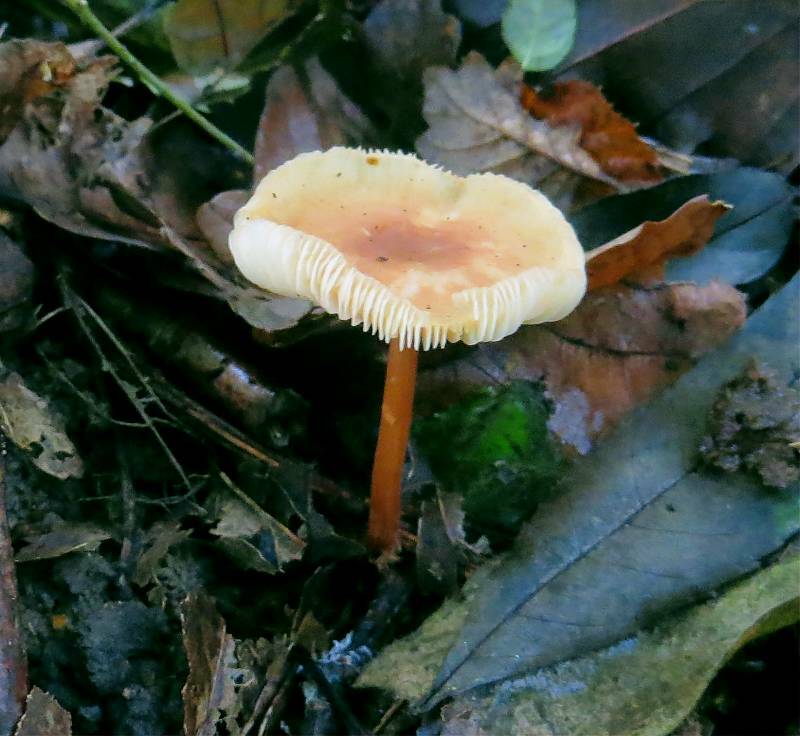 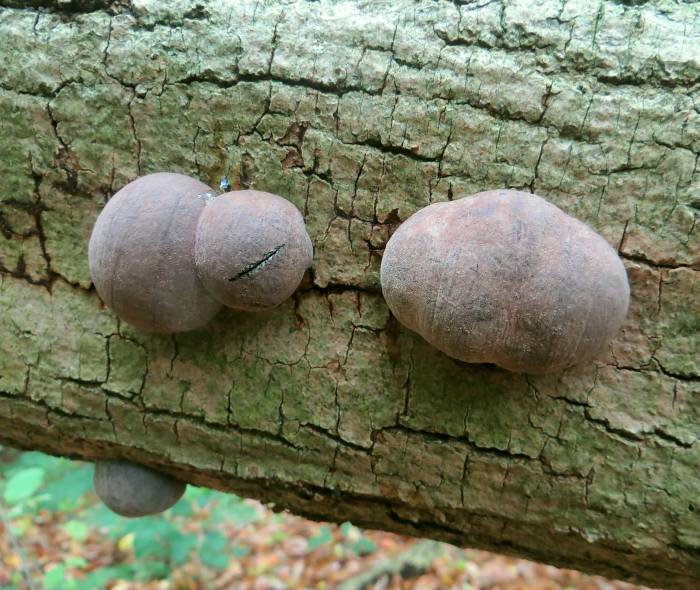 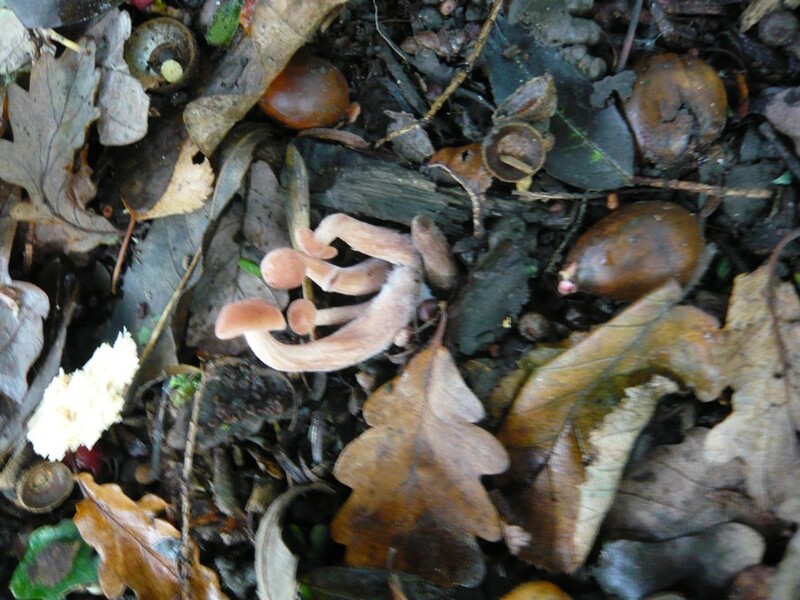 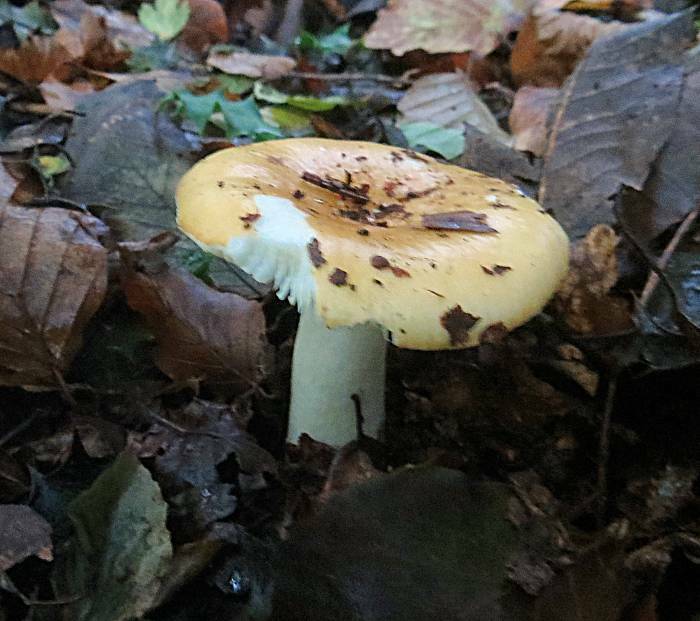 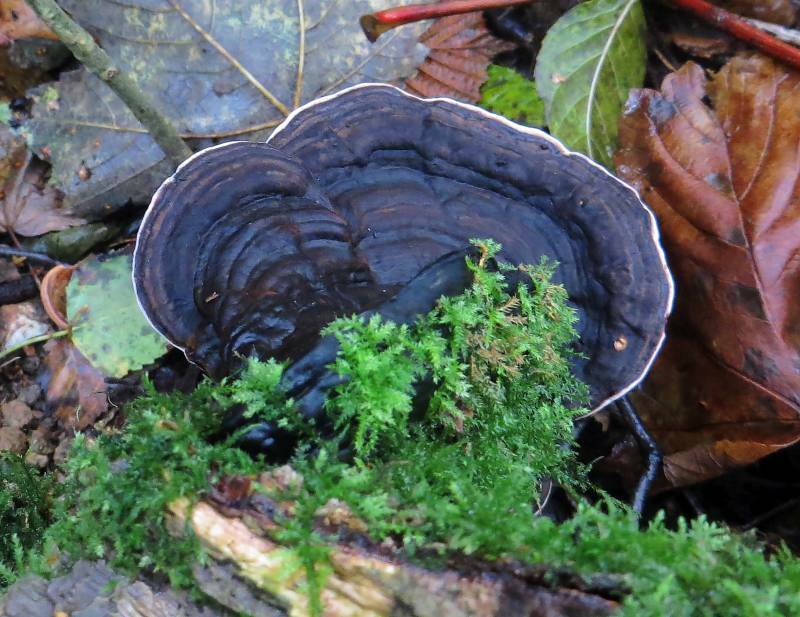 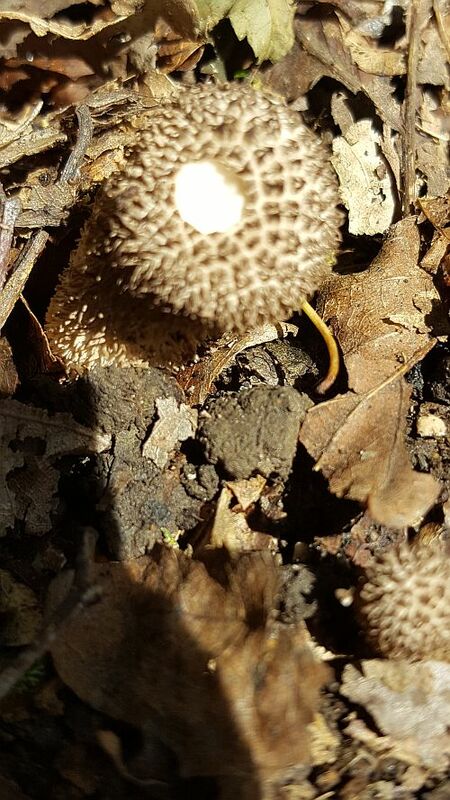 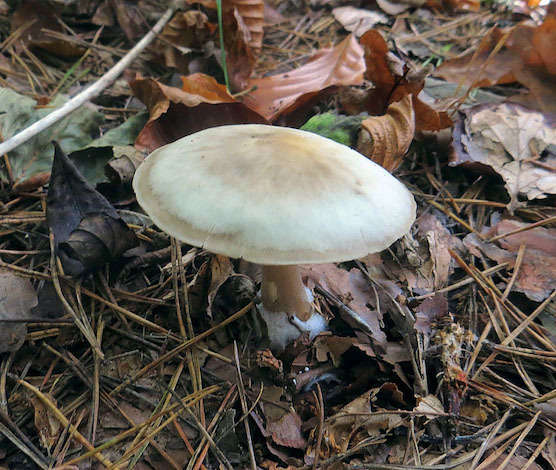 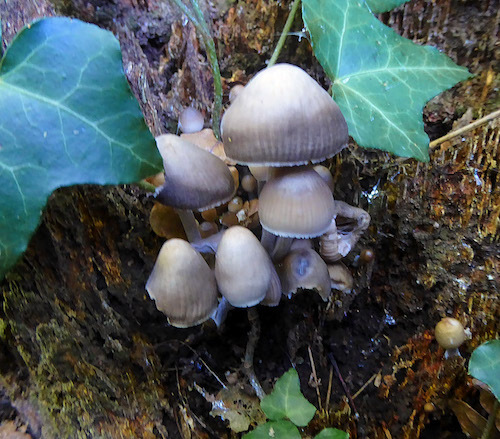 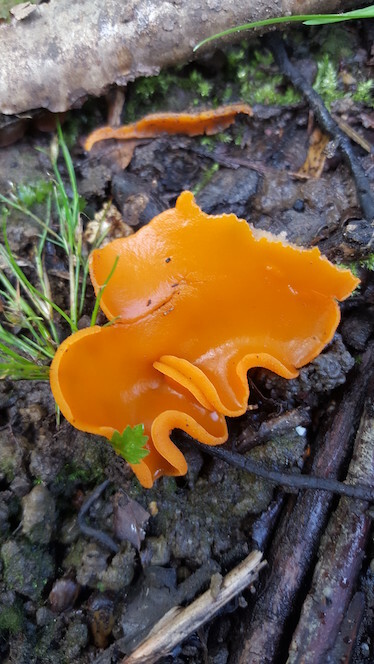 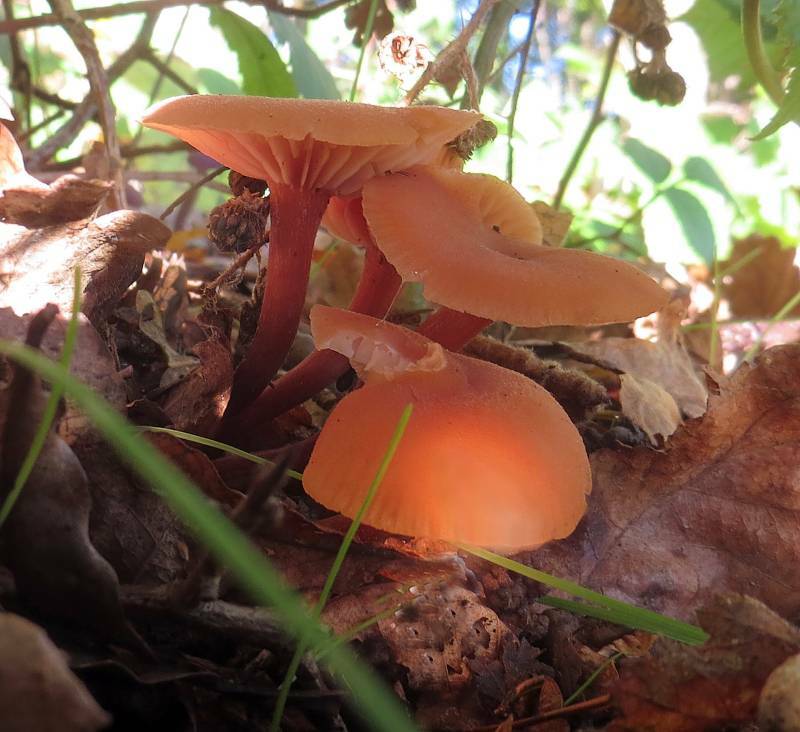 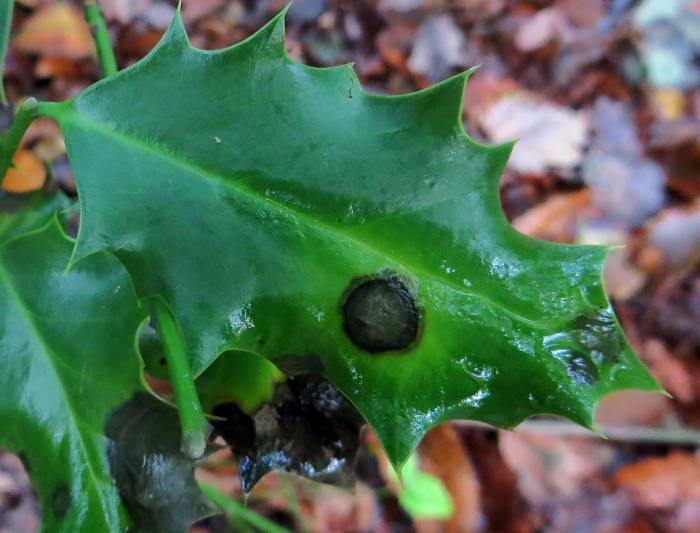 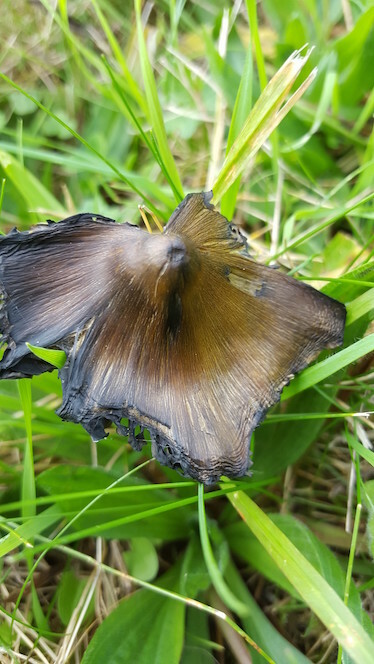 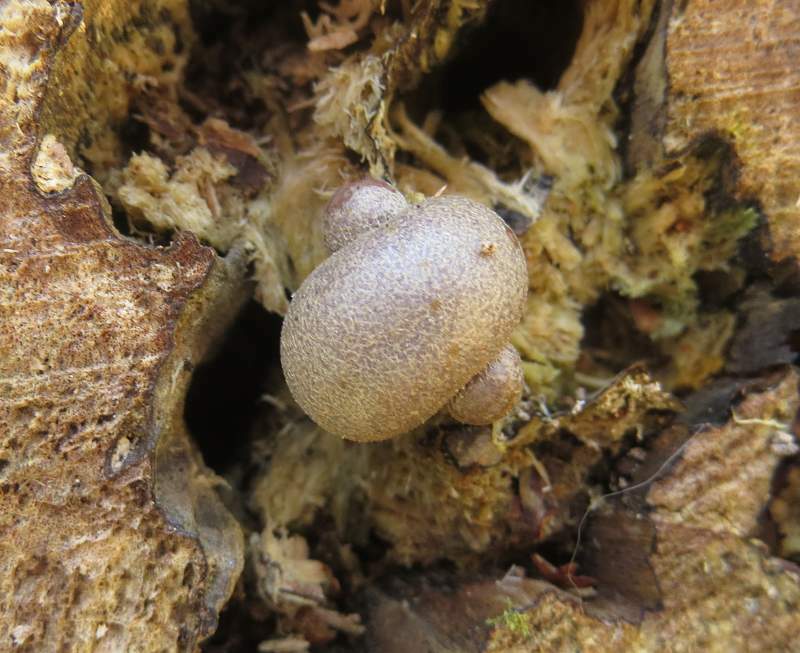 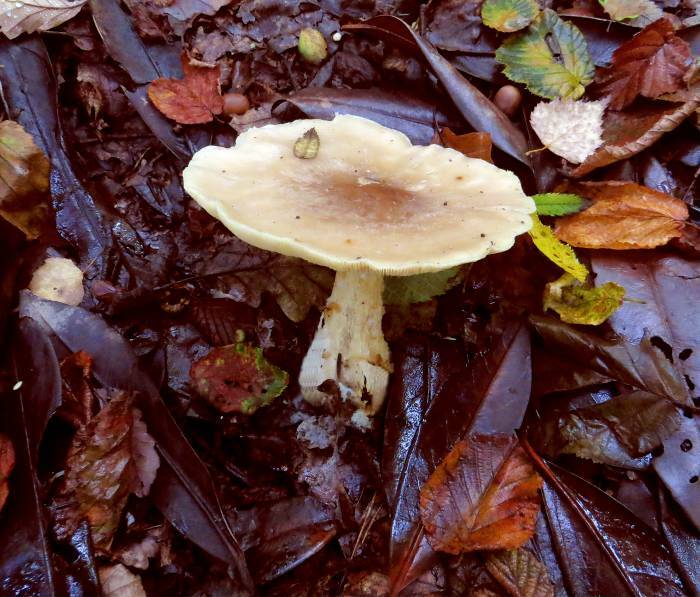 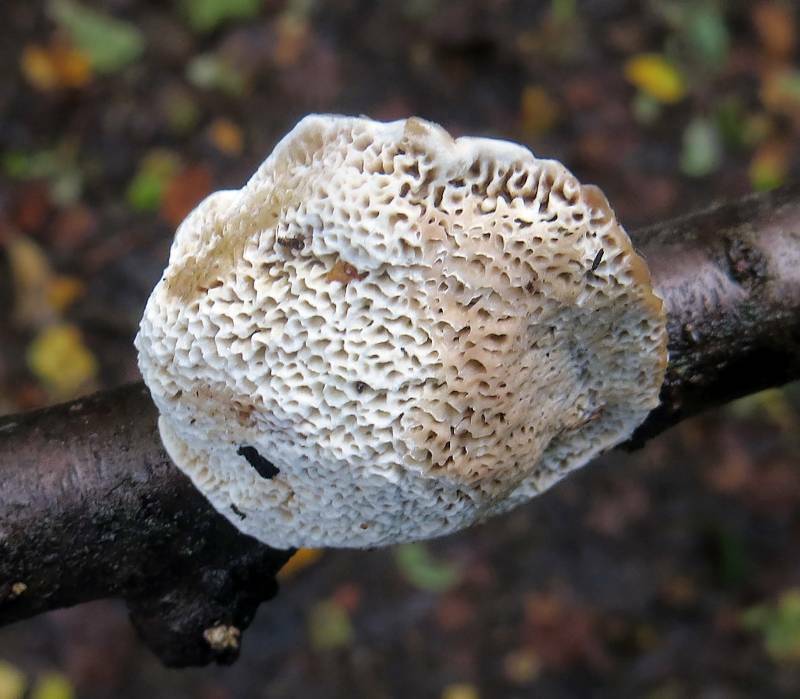 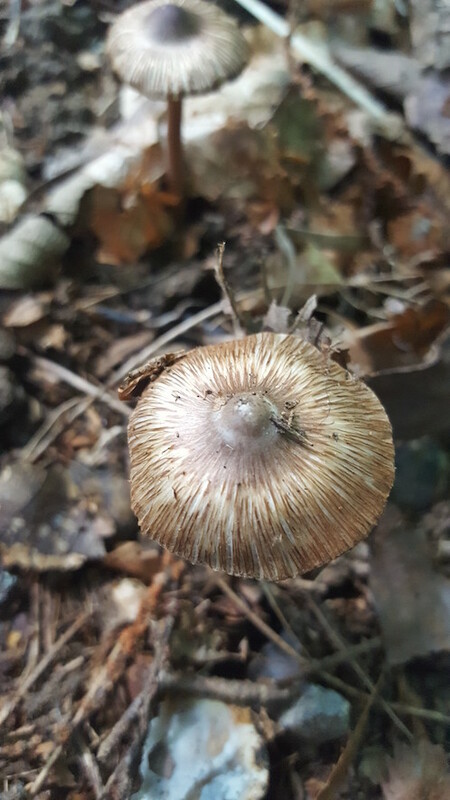 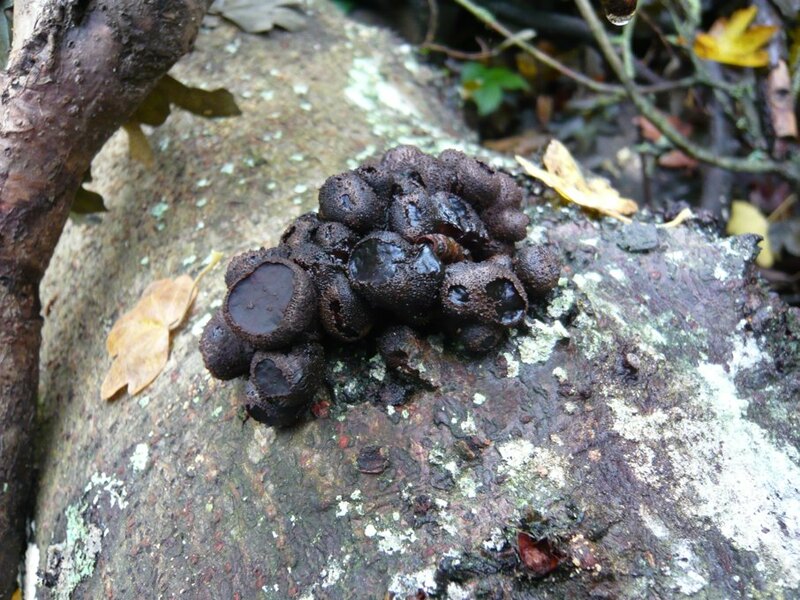 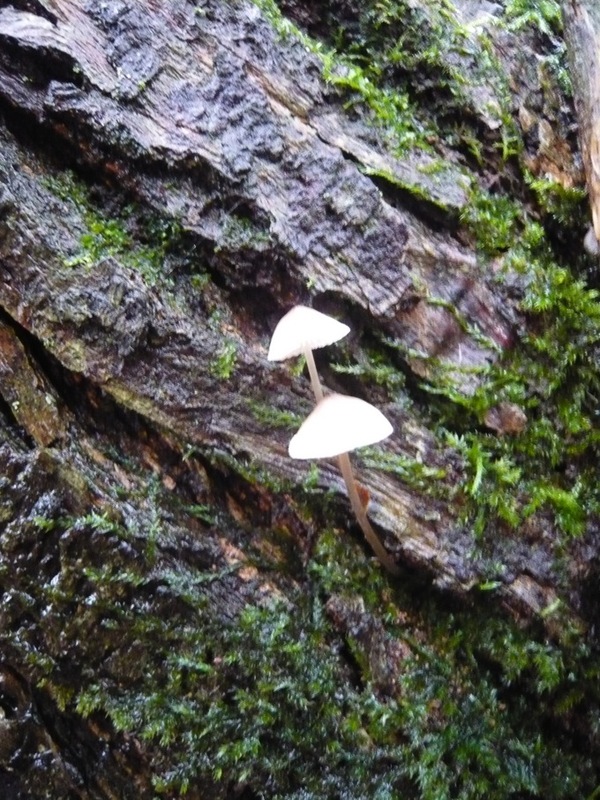 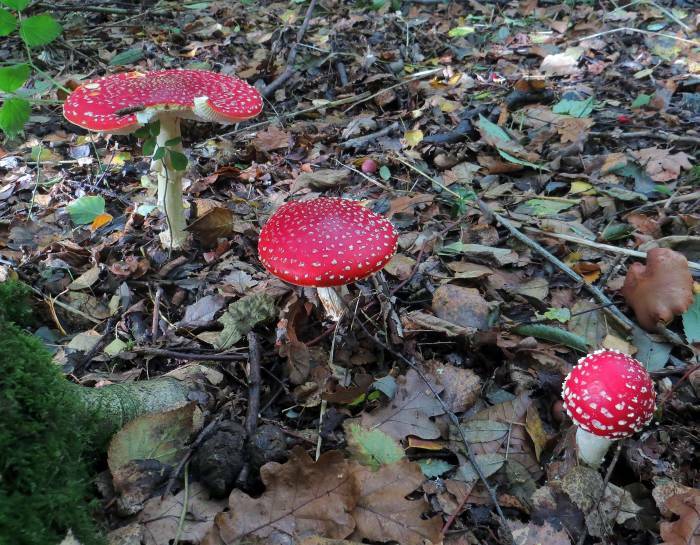 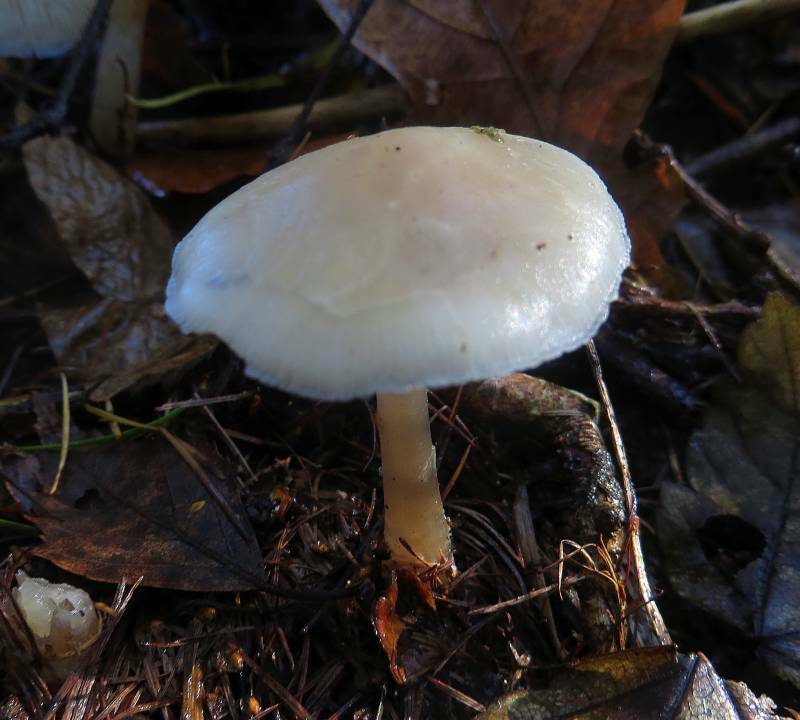 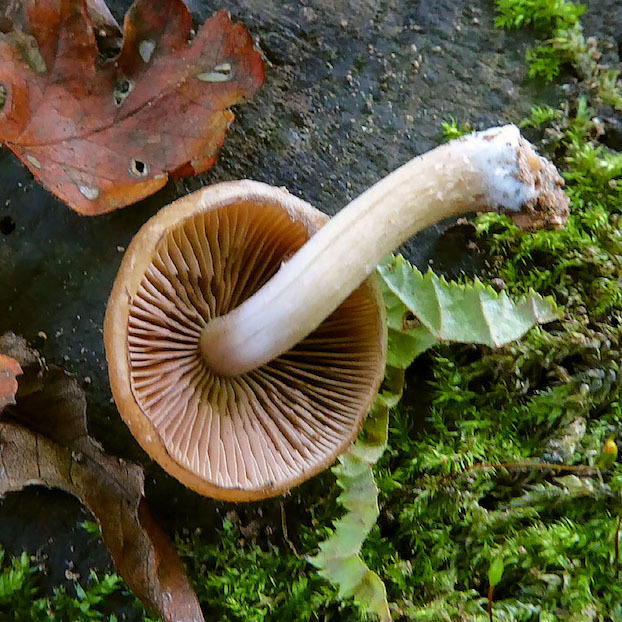 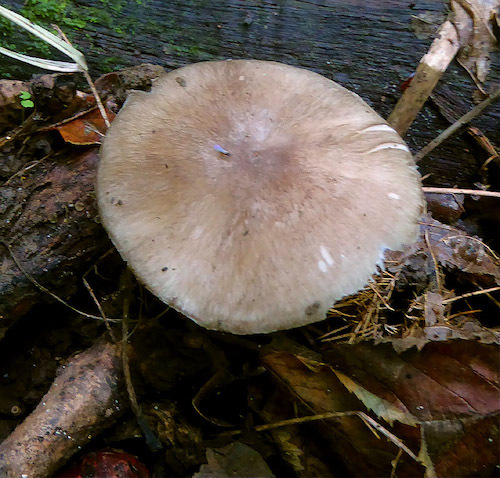 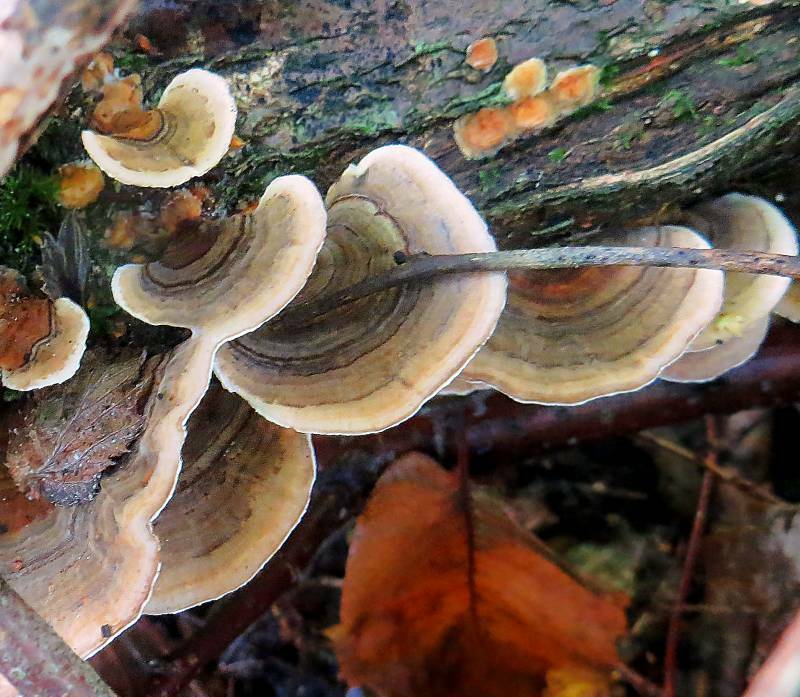 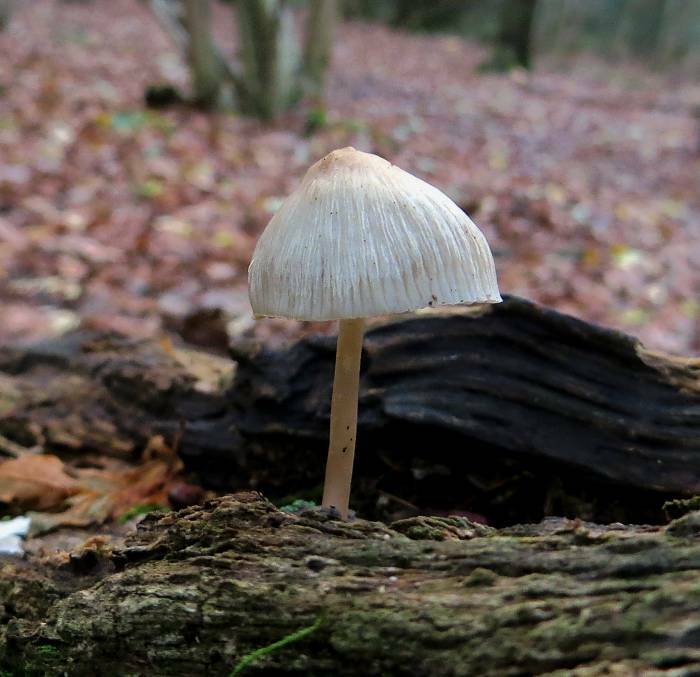 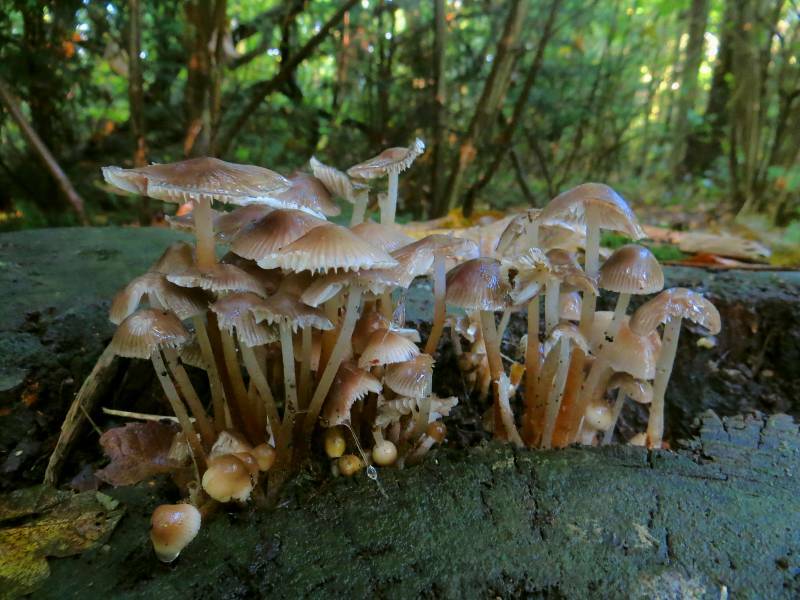 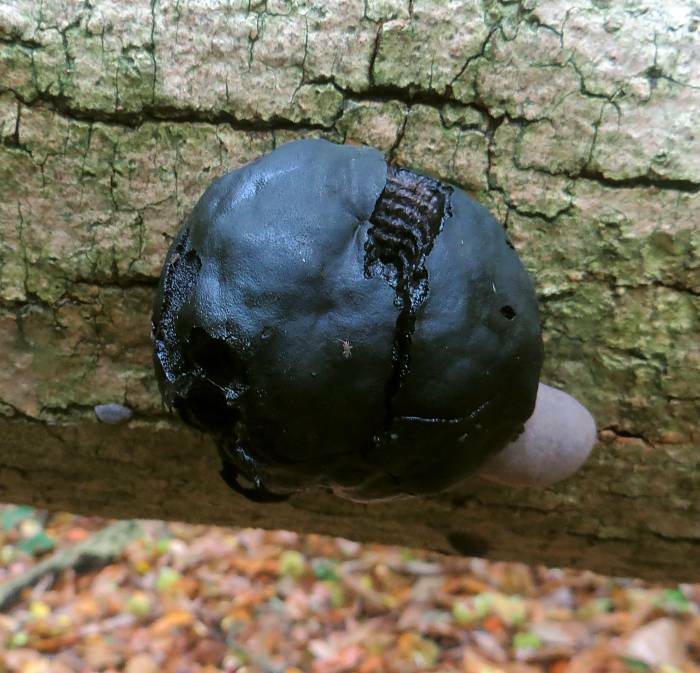 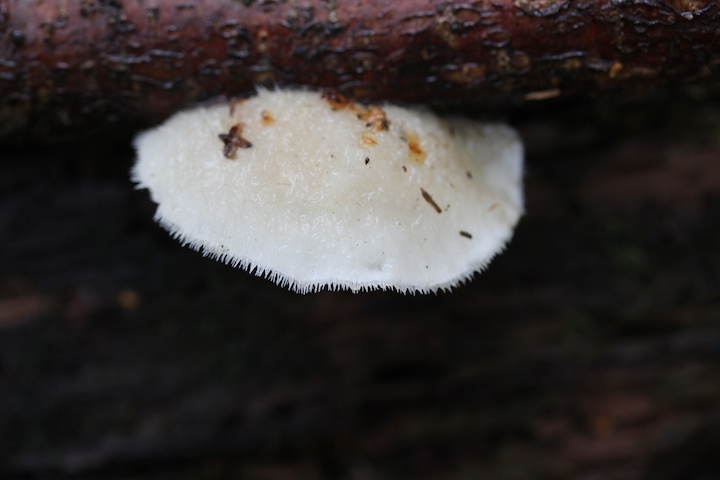 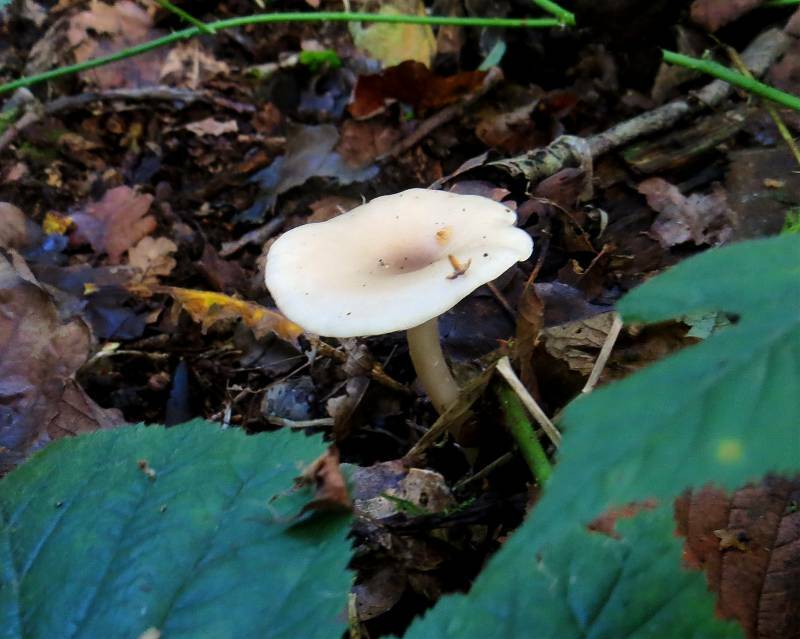 An up-to-date full list of all the fungi observed in Selsdon Wood is available from the link below. 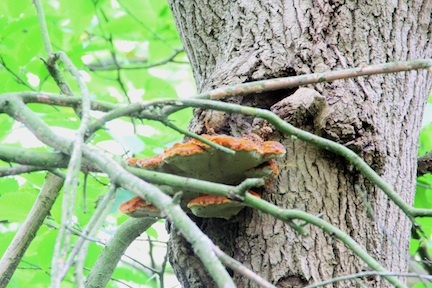 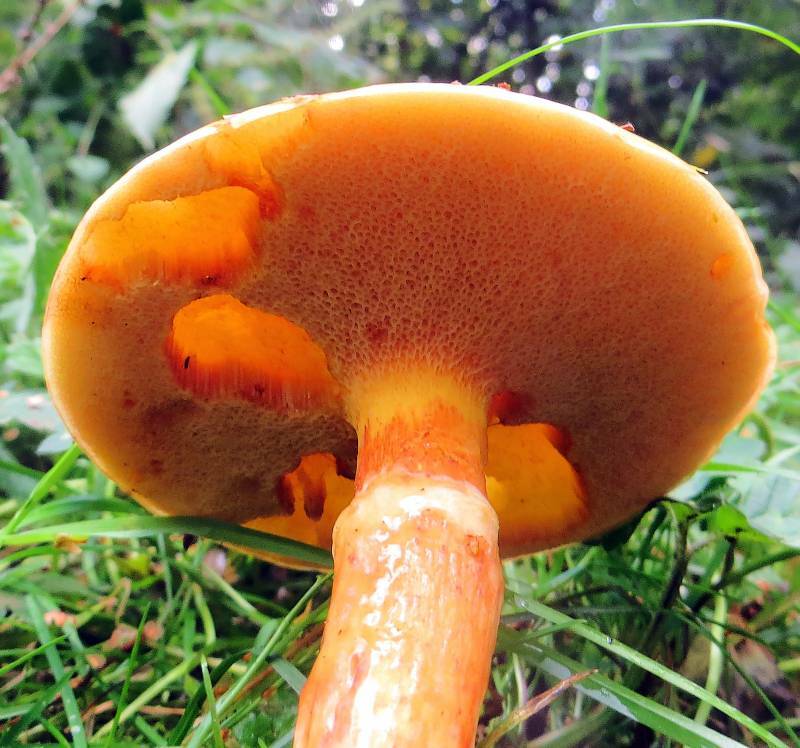 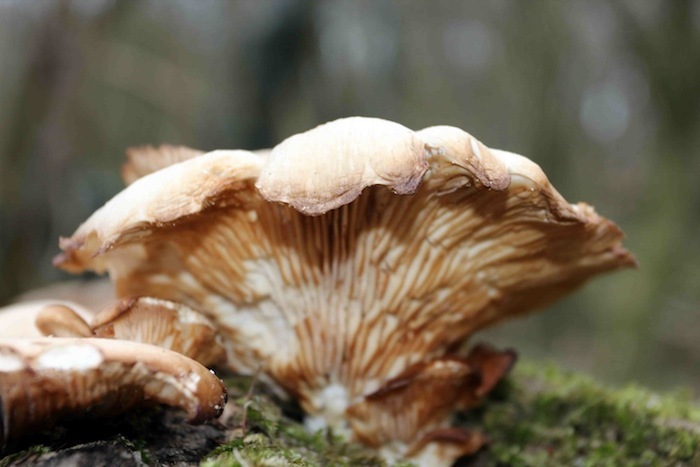 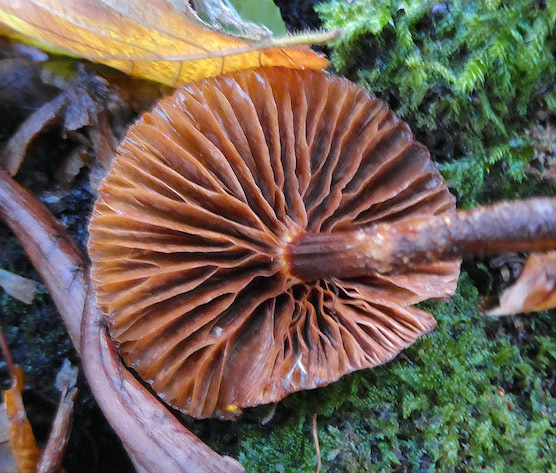 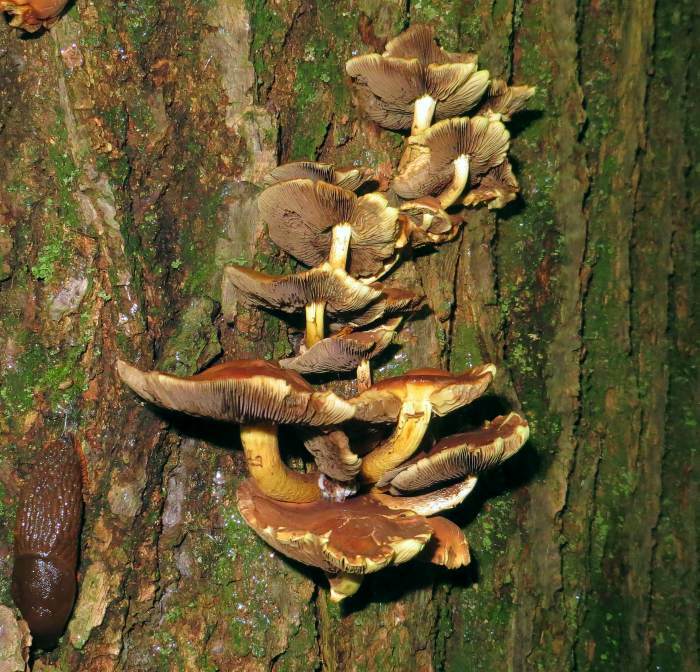 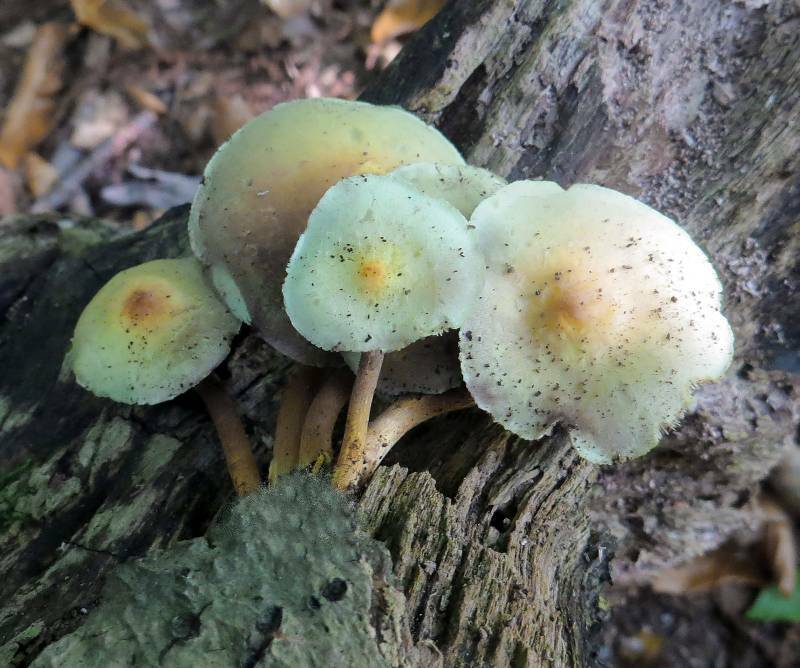 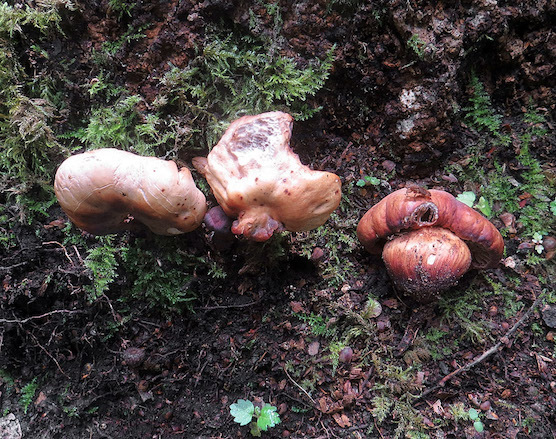 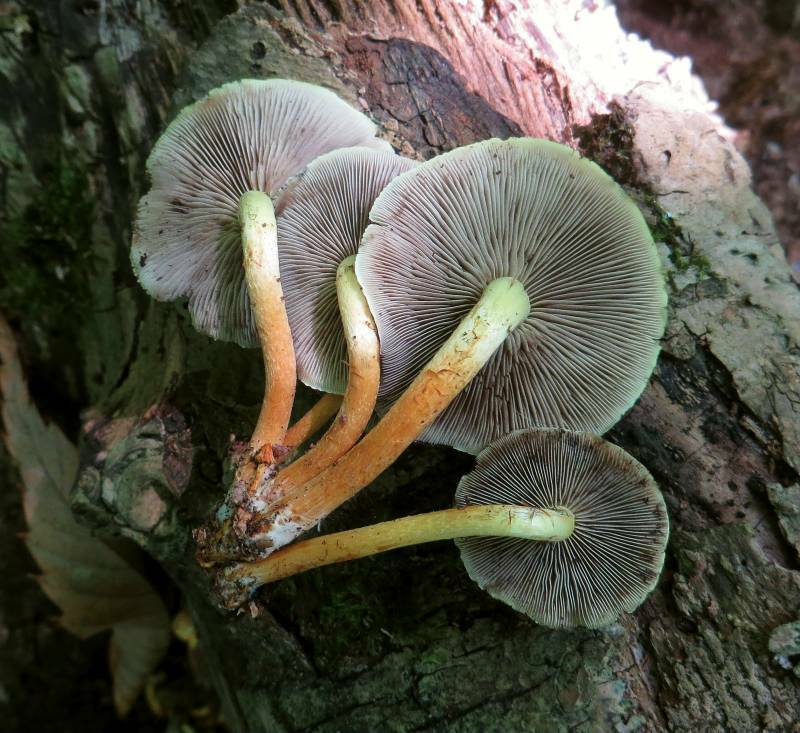 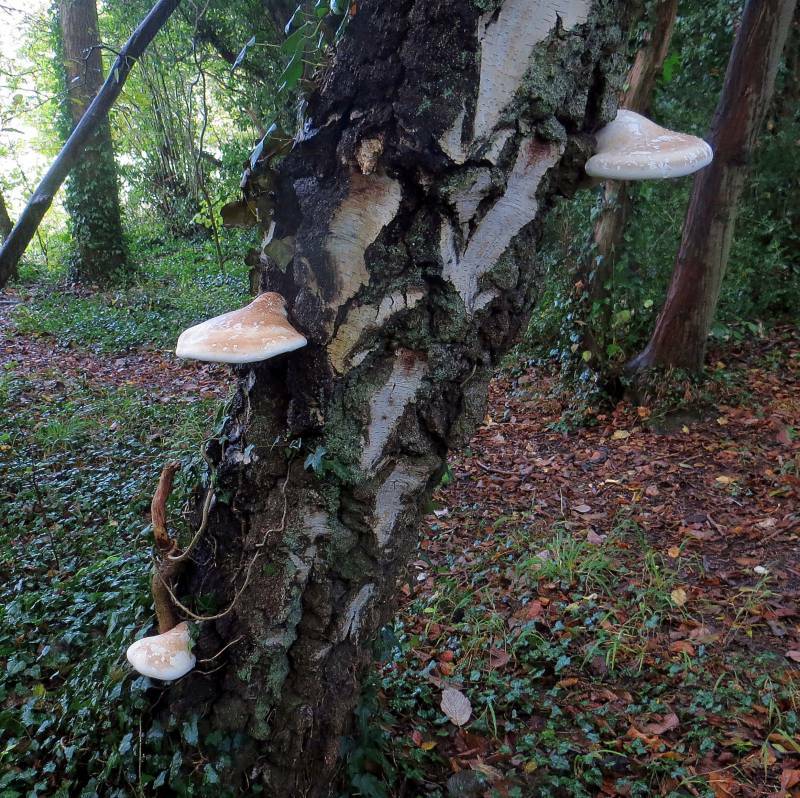 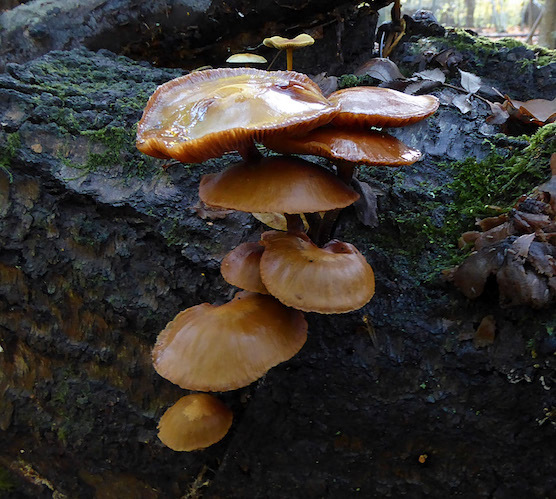 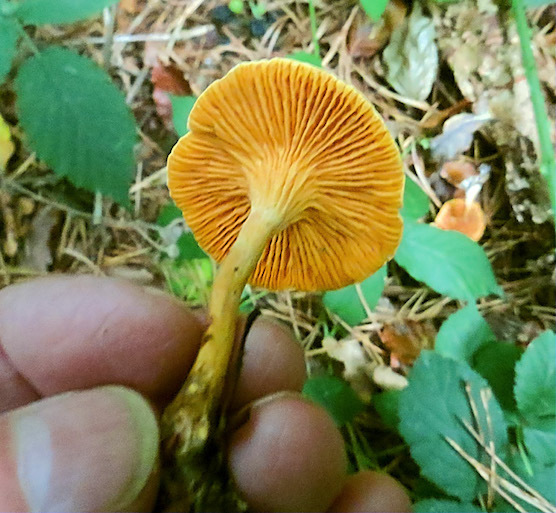 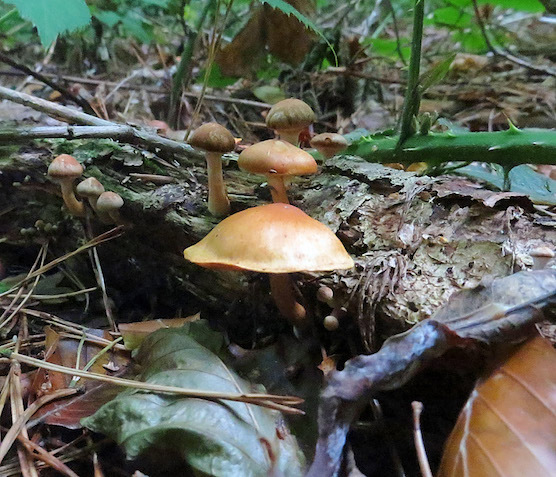 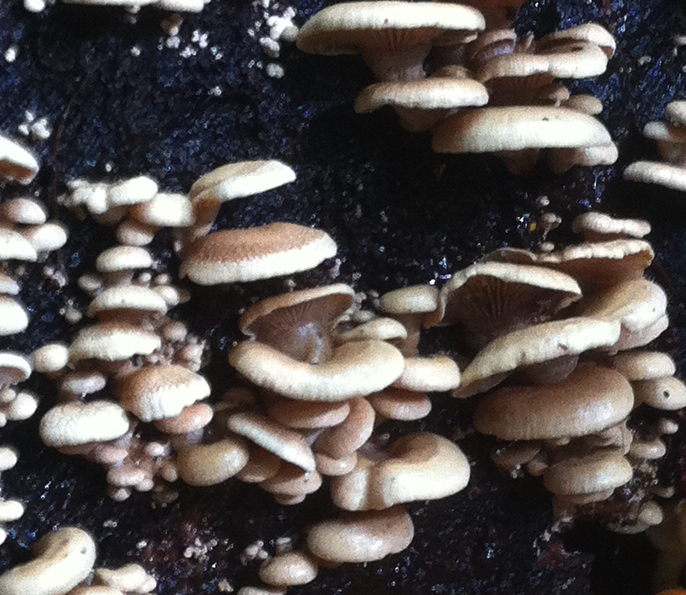 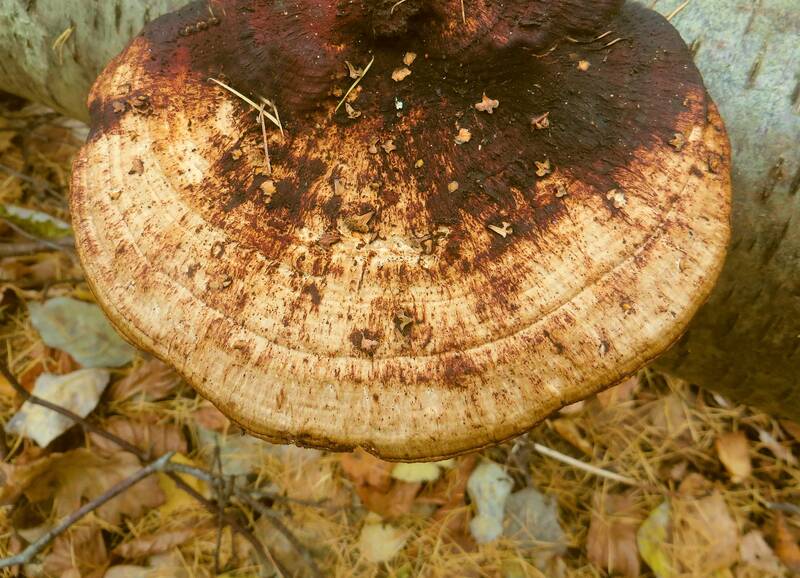 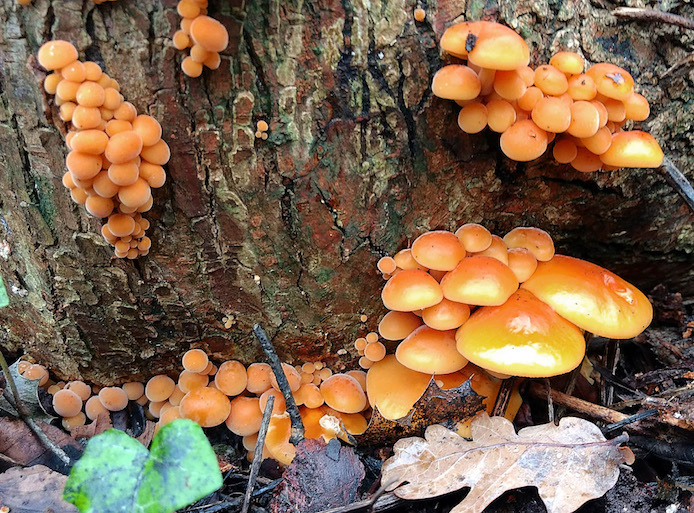 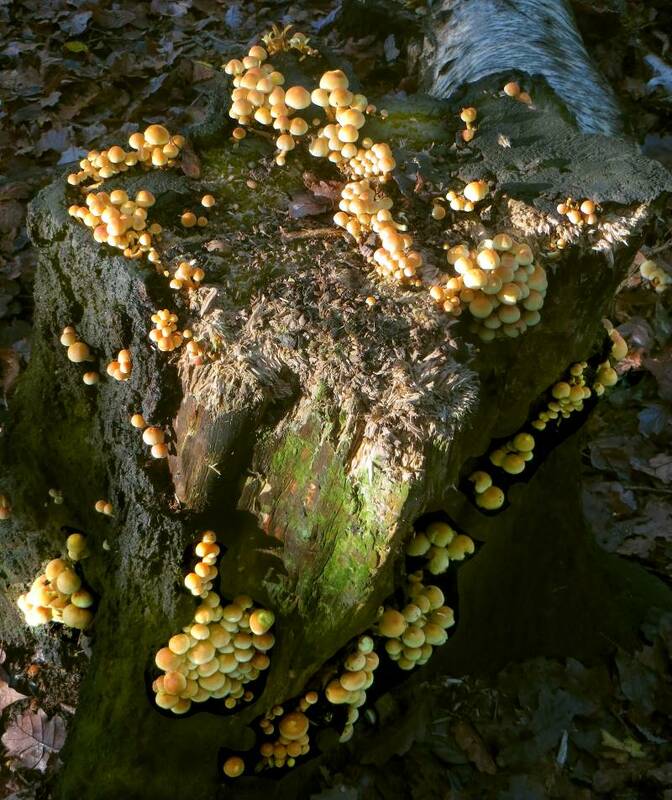 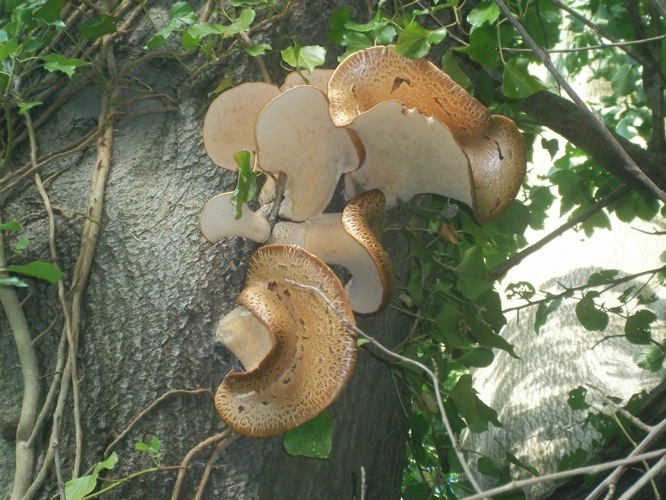 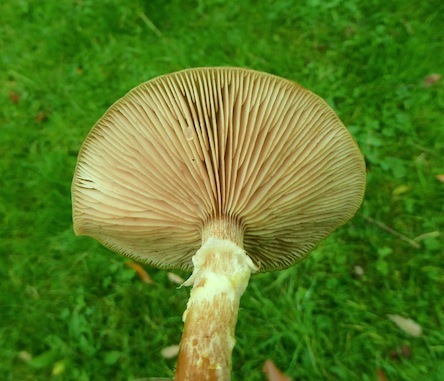 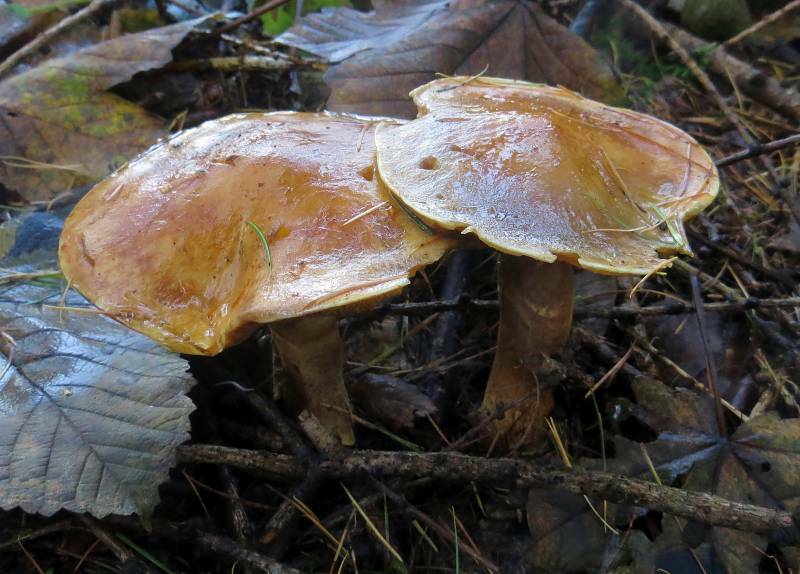 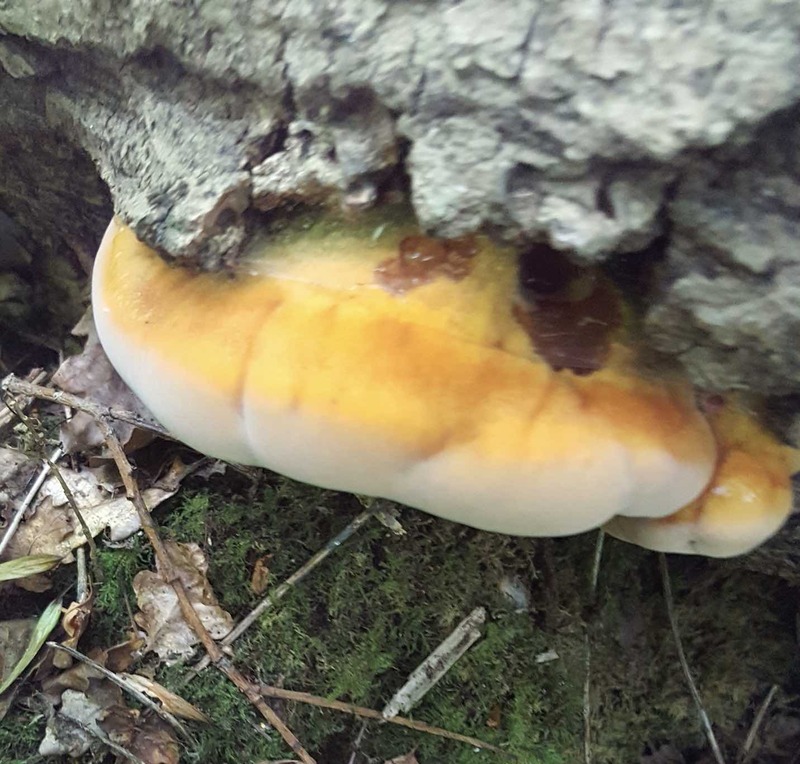 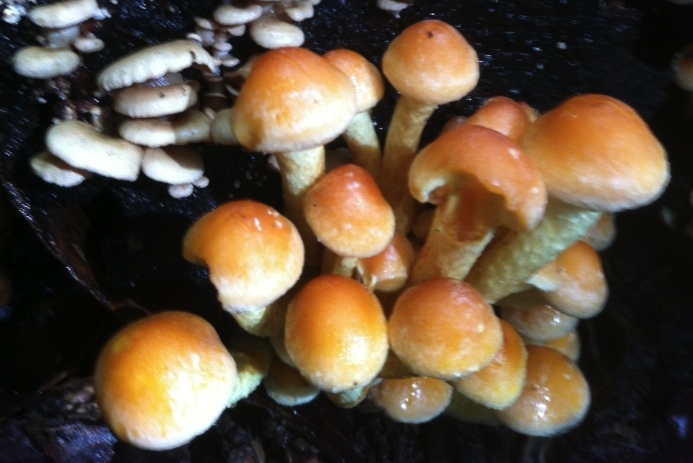 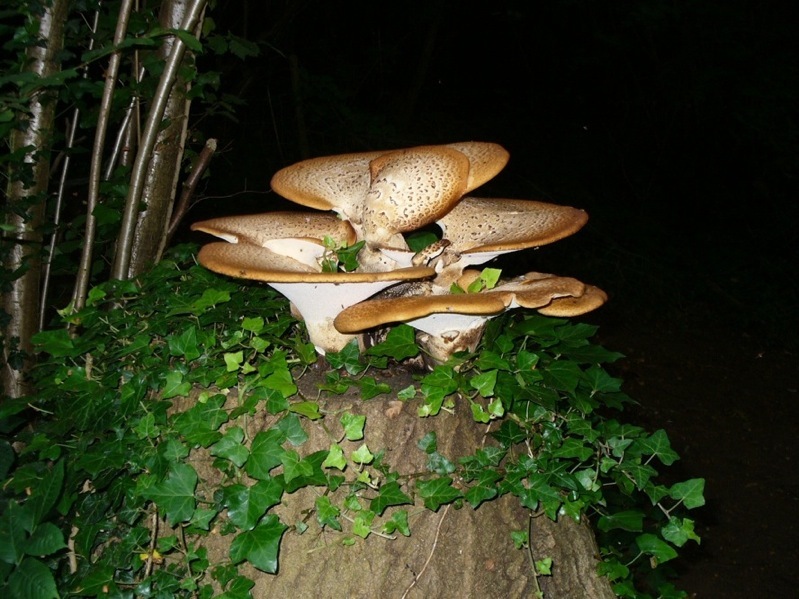 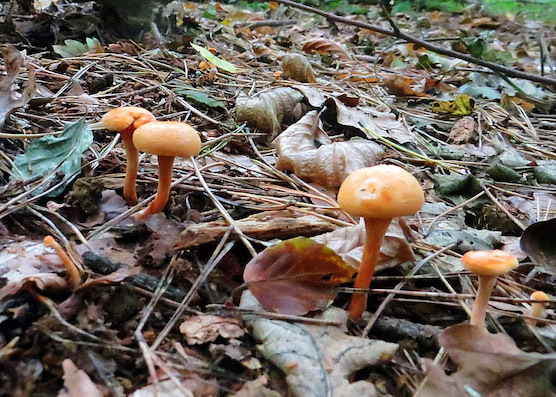 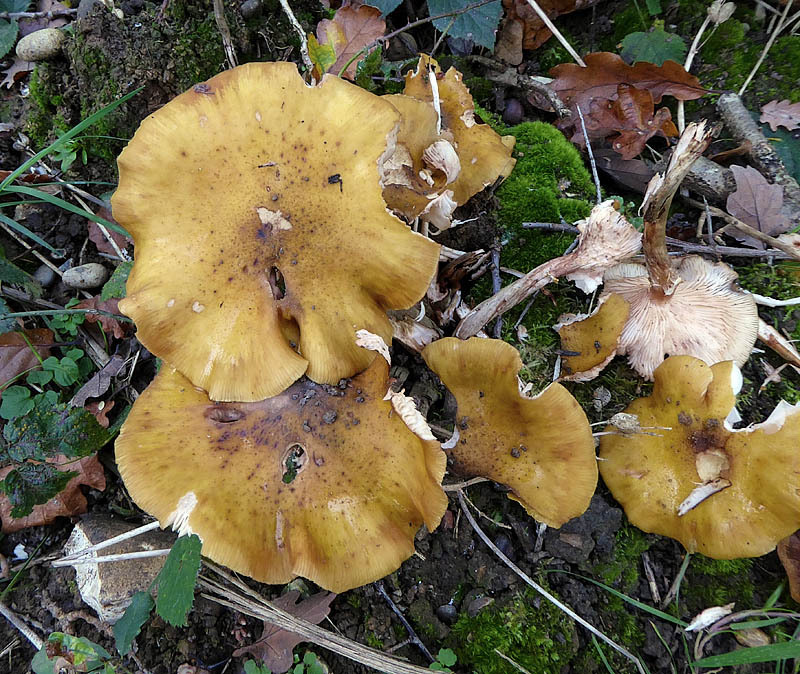 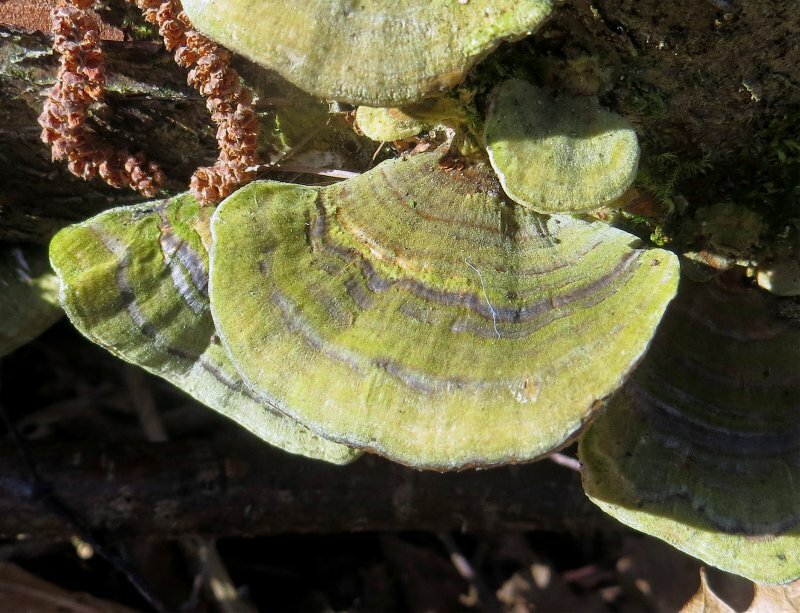 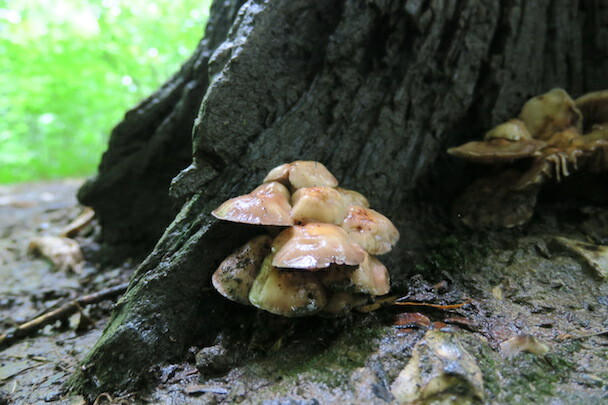 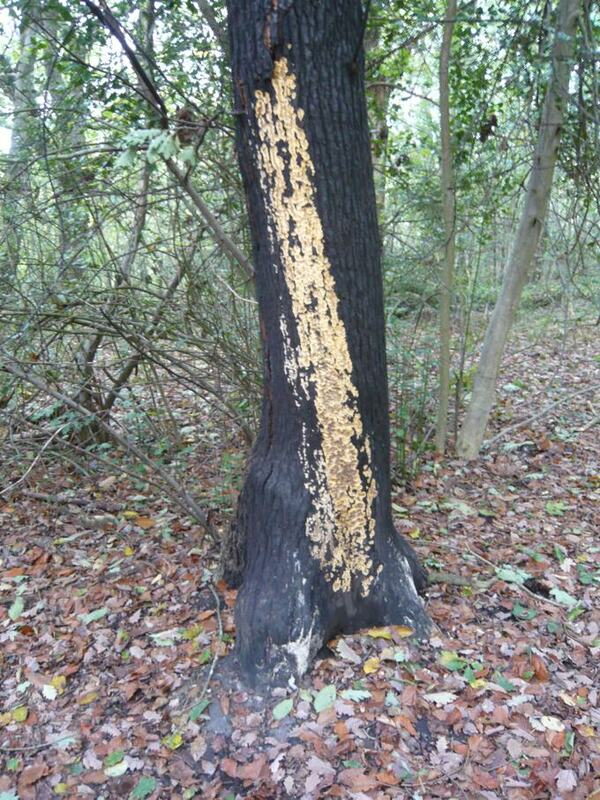 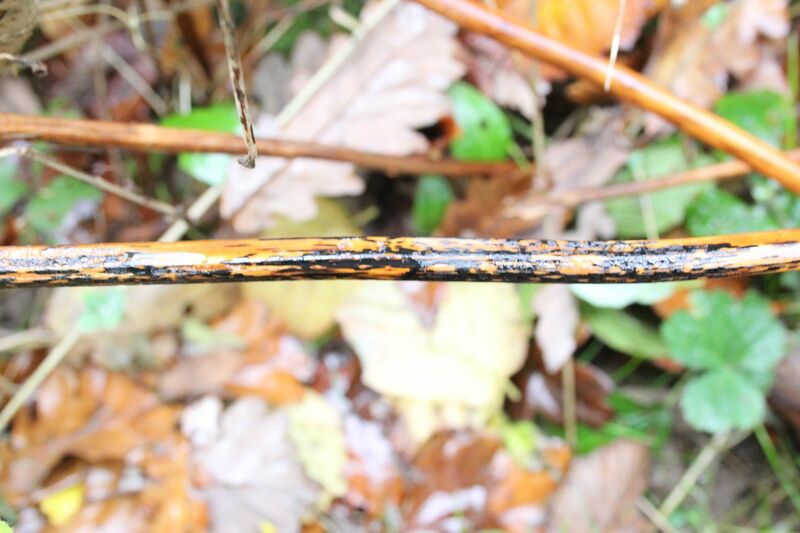 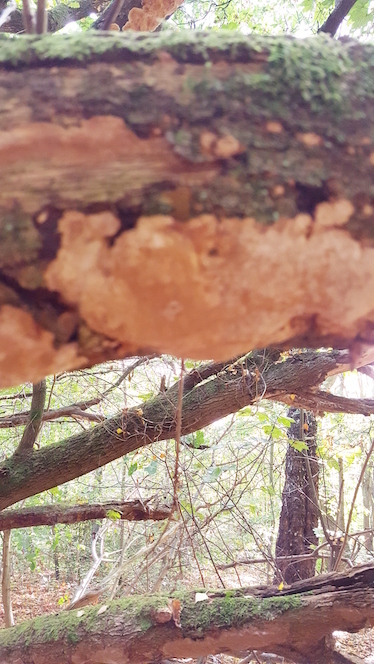 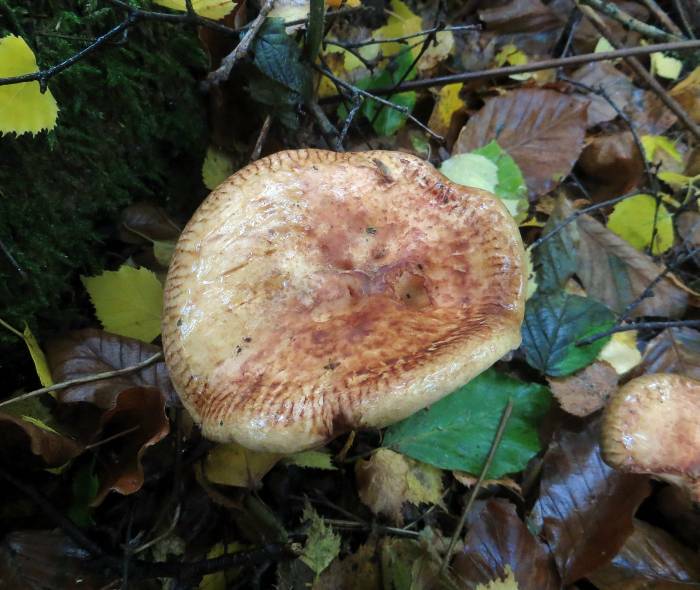 All of the Honey Fungus group are parasitic on trees and other woody plants, but vary greatly in their effects. 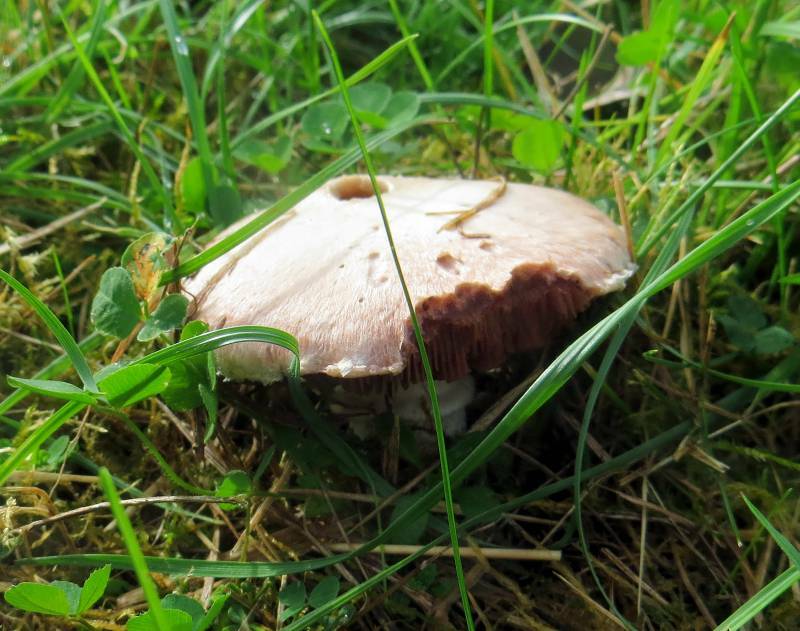 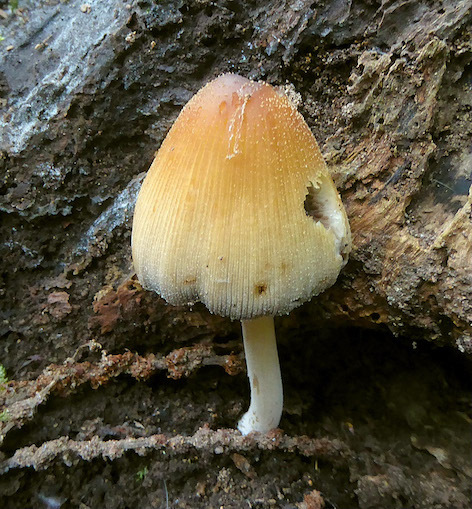 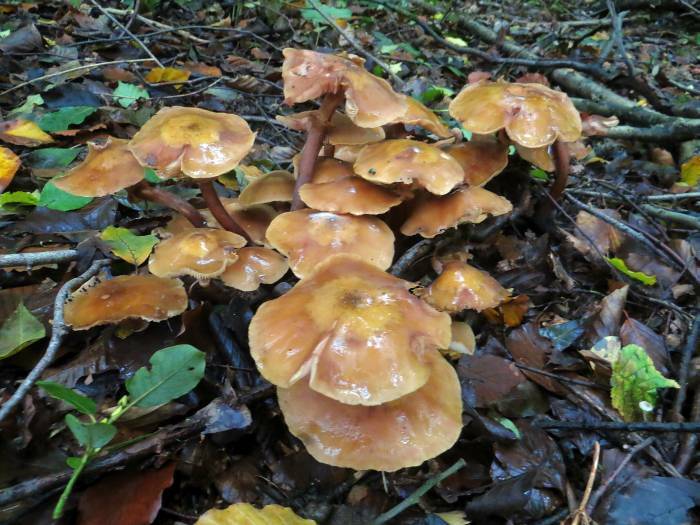 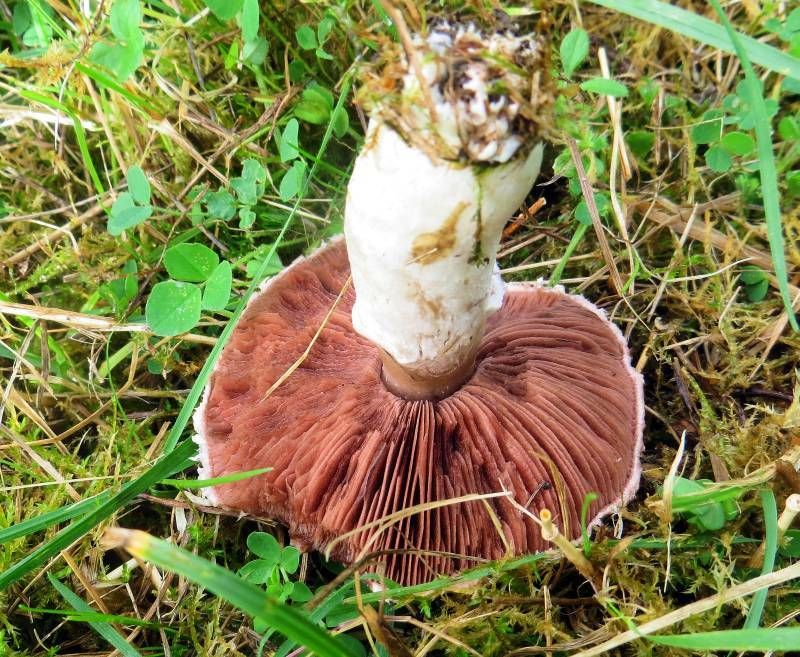 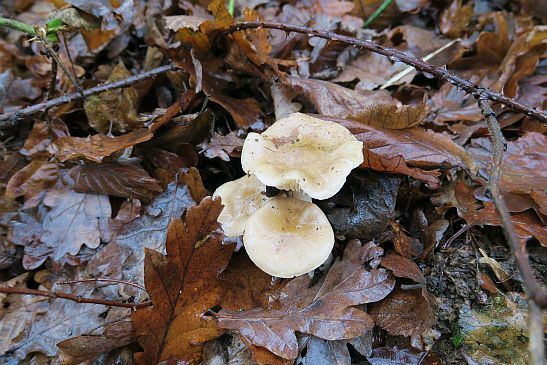 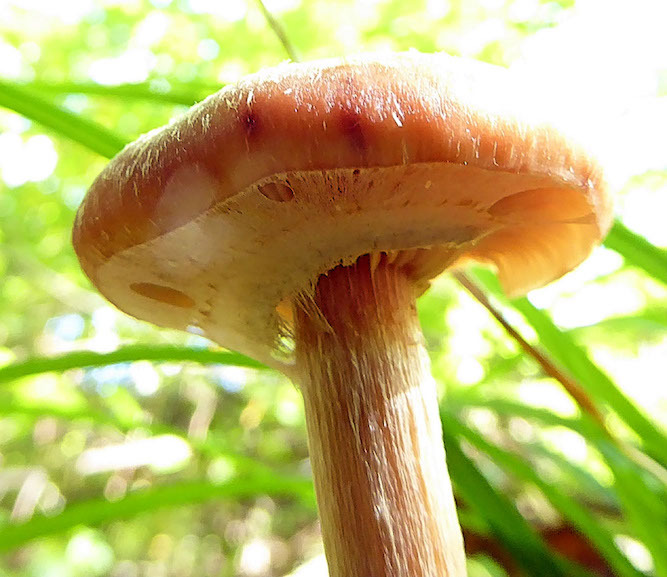 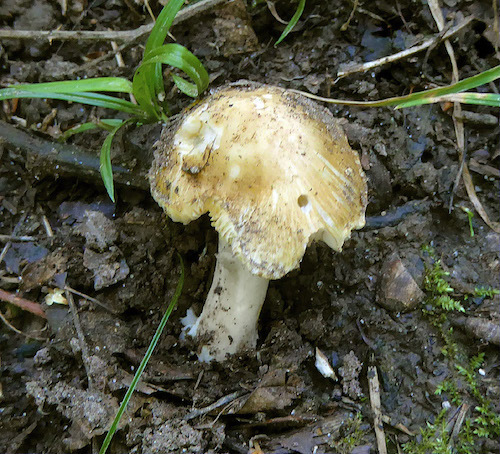 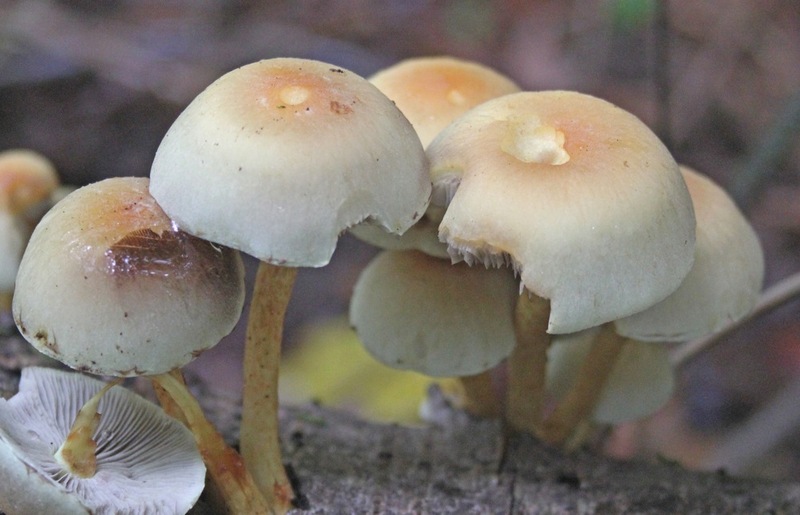 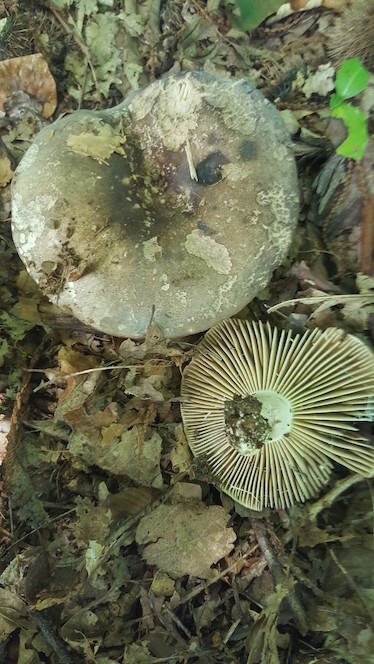 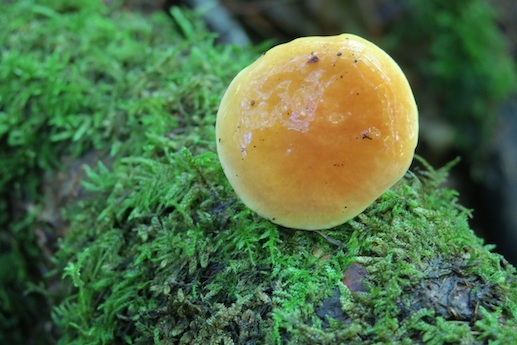 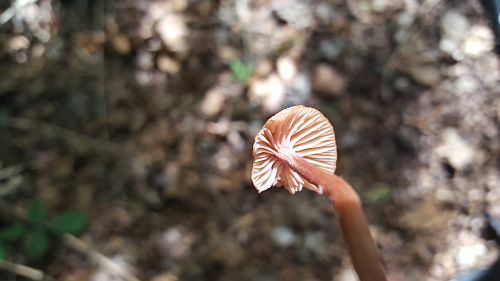 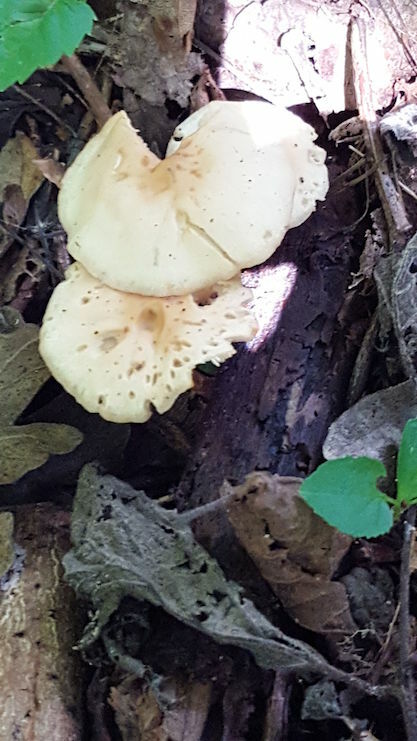 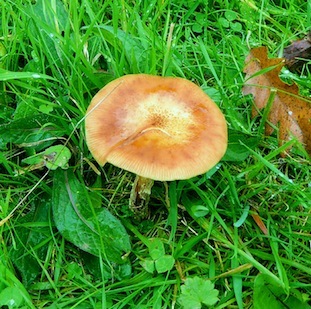 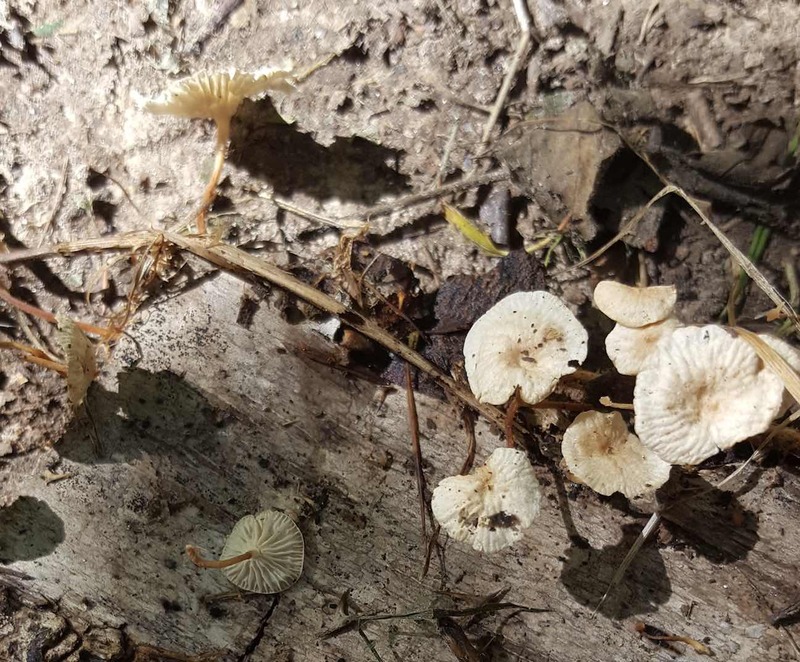 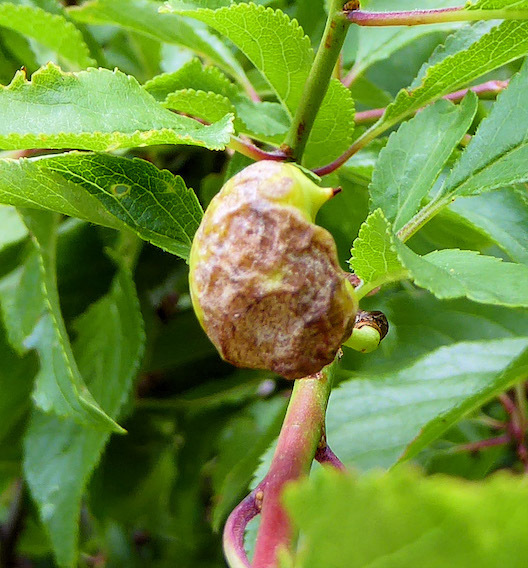 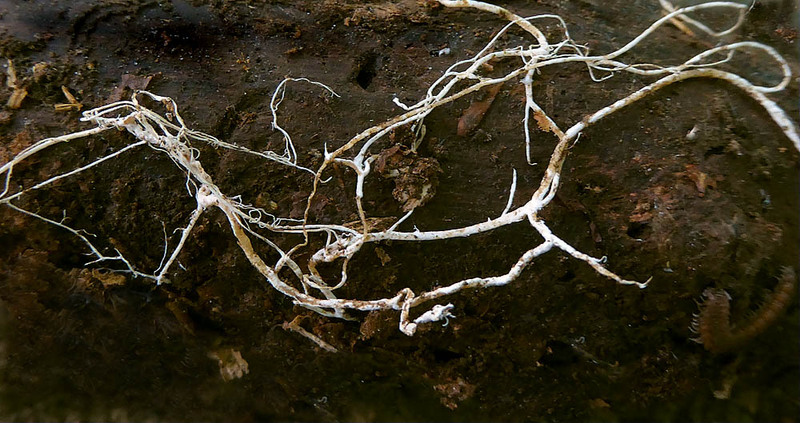 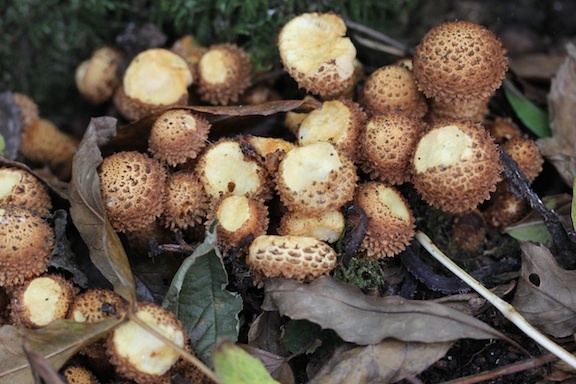 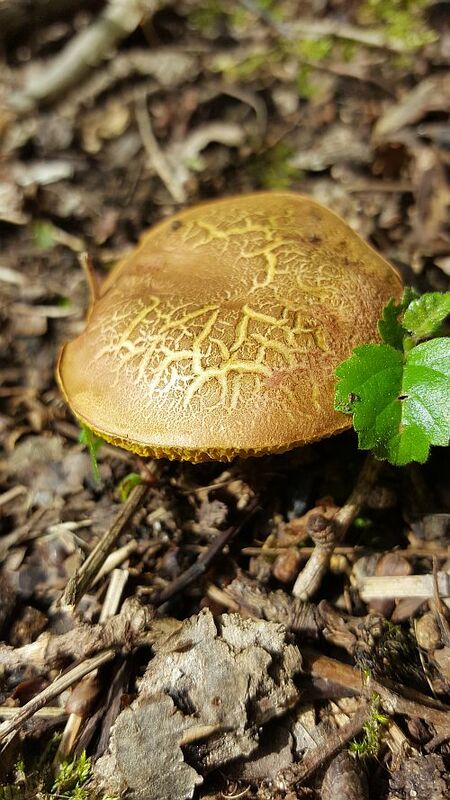 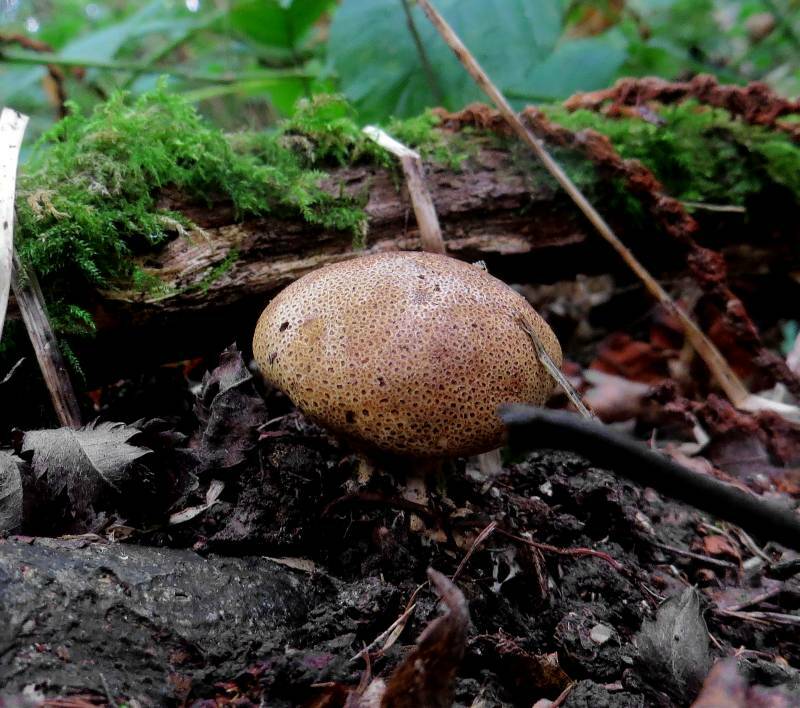 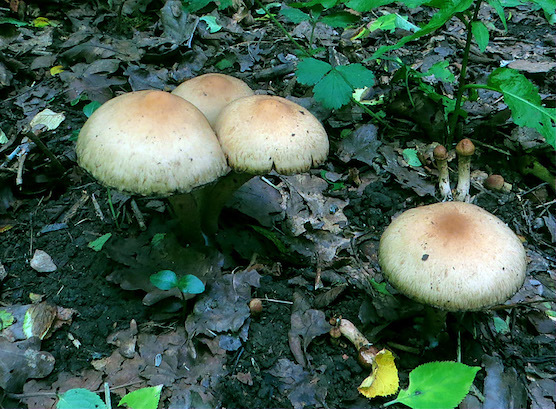 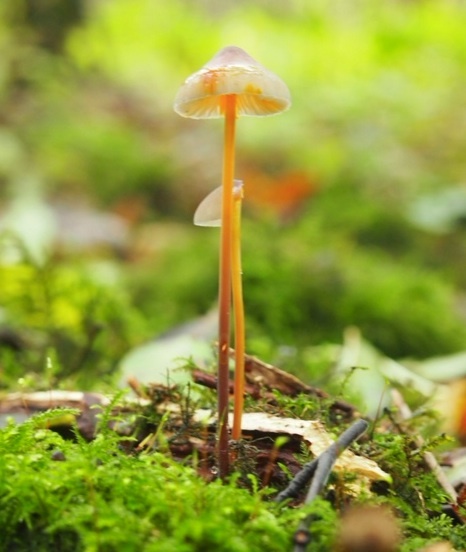 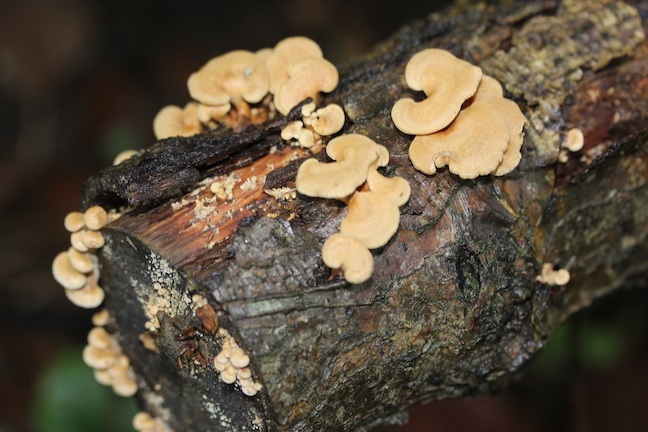 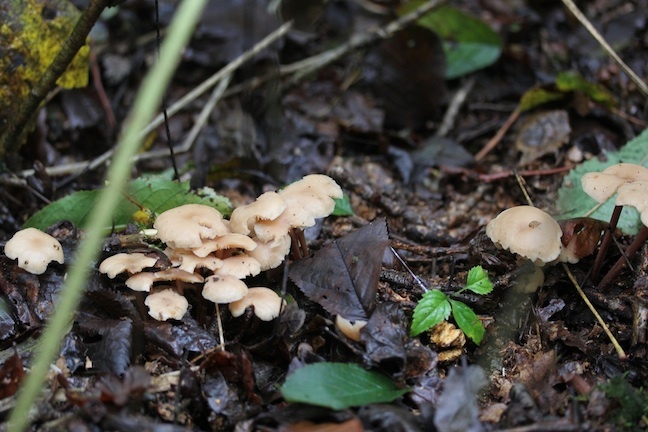 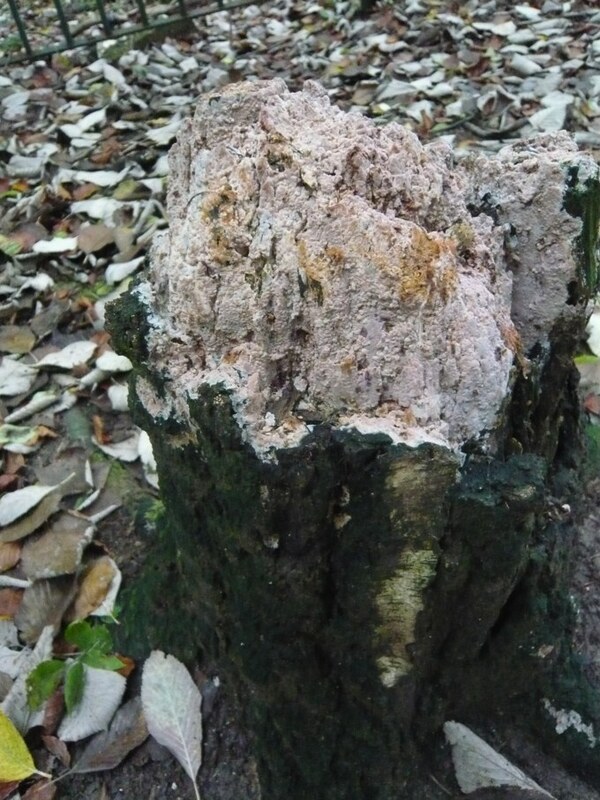 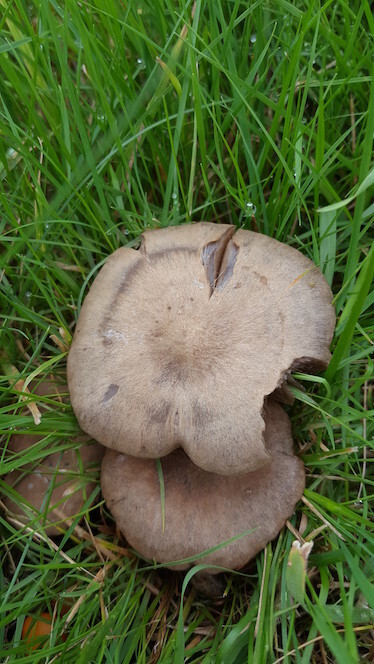 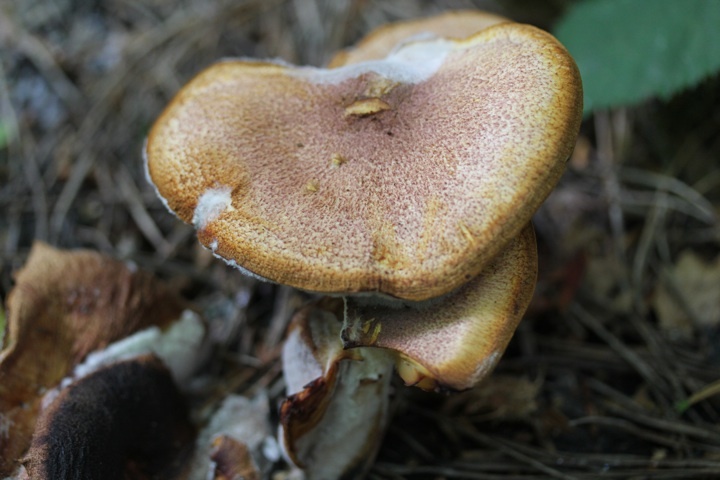 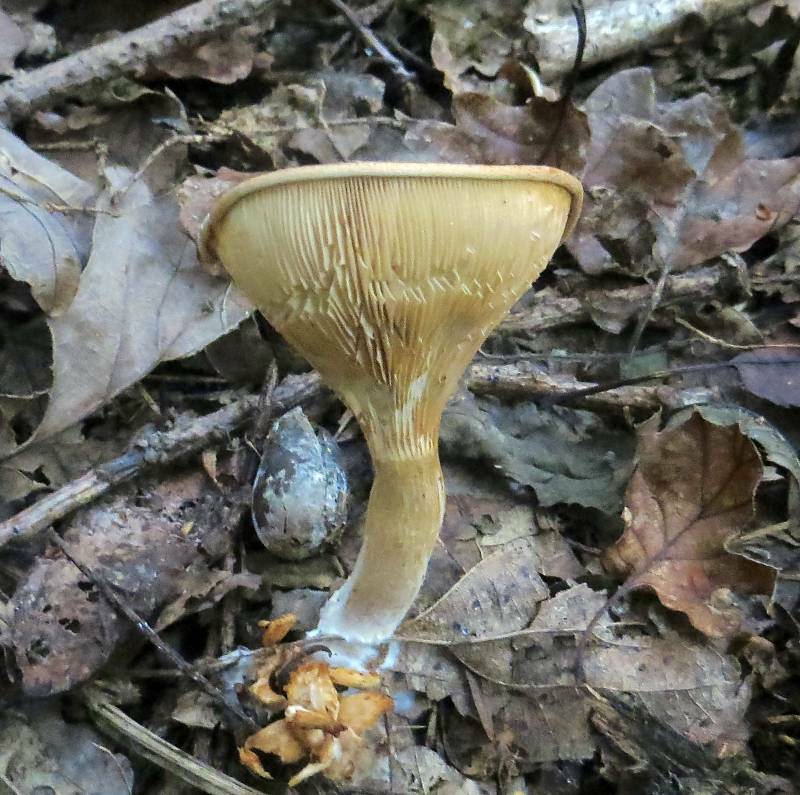 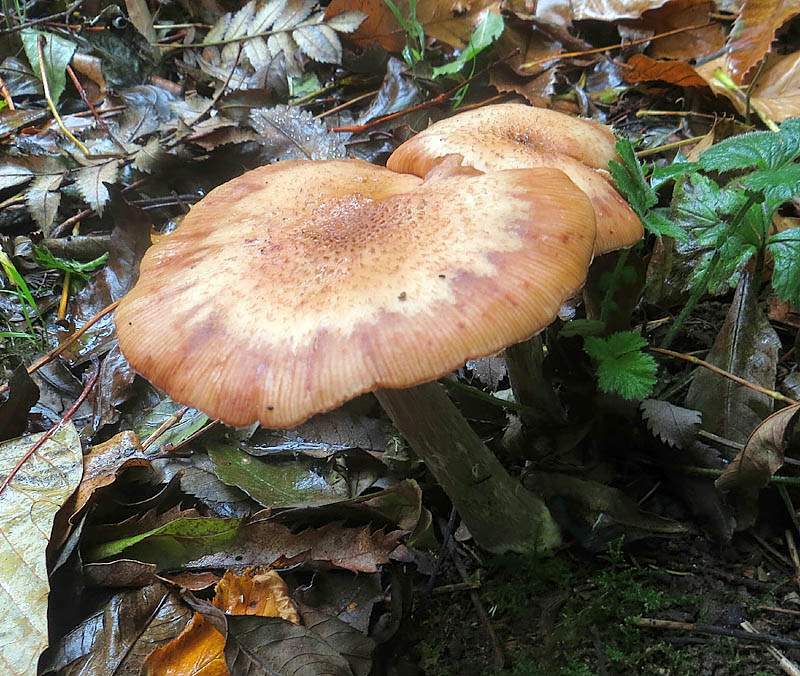 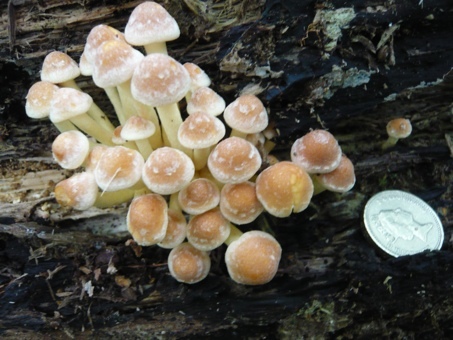 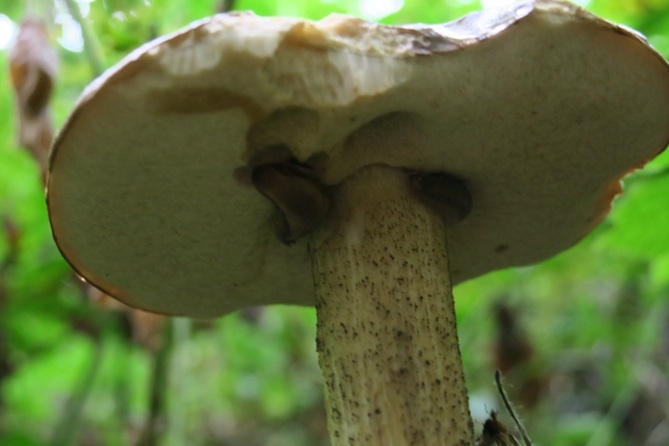 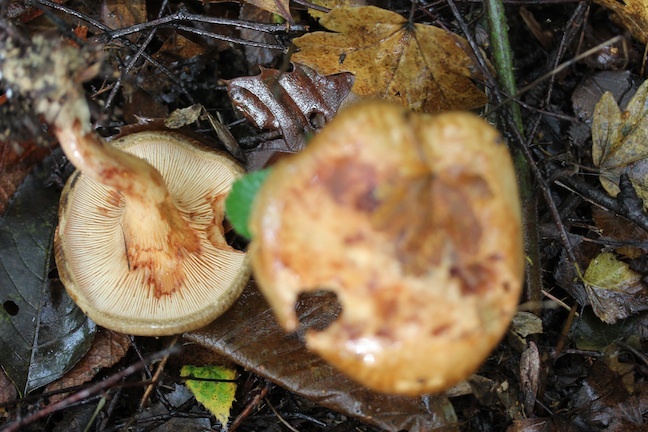 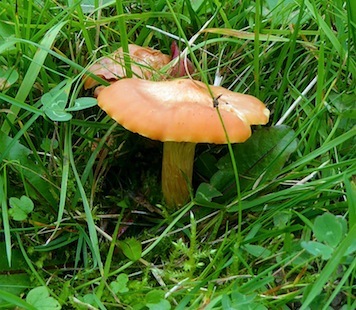 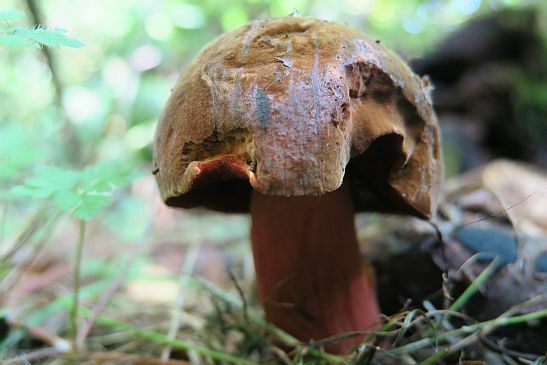 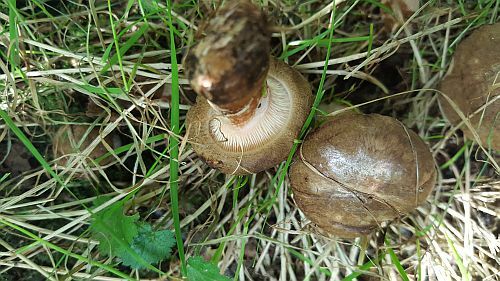 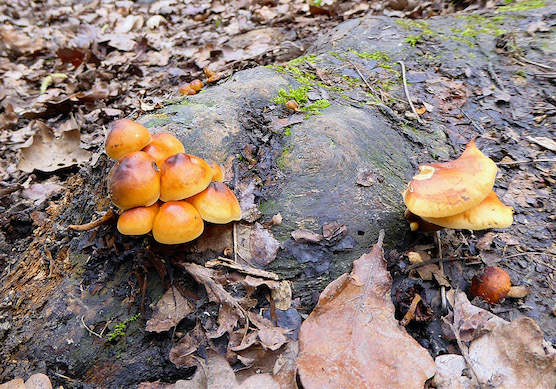 The most deadly are the Armillaria mellea types which spread aggressively by both spore transmission and mycorhizal transfer through the ground. 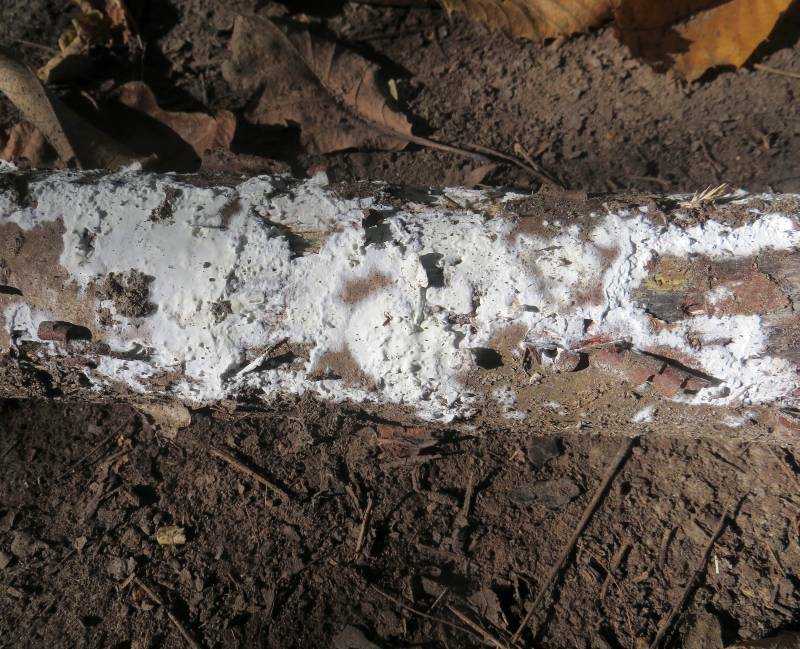 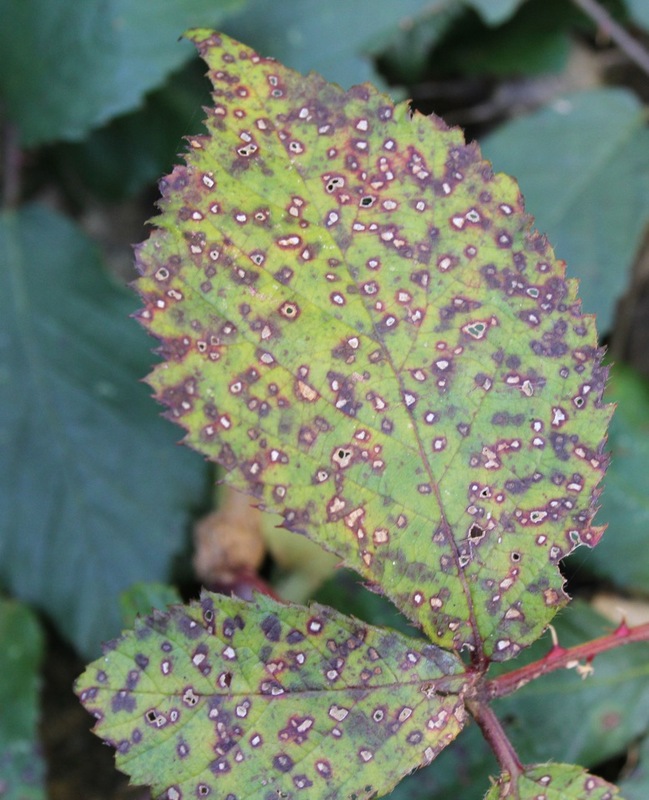 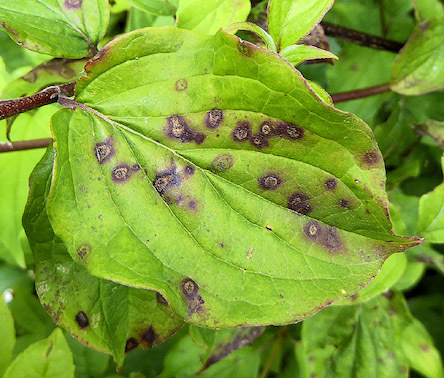 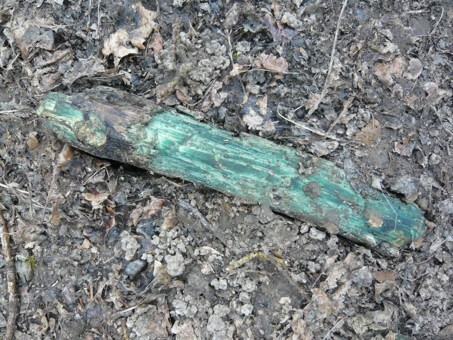 No chemical treatments are possible, only burning all infected material and soil barriers prevent their spread. 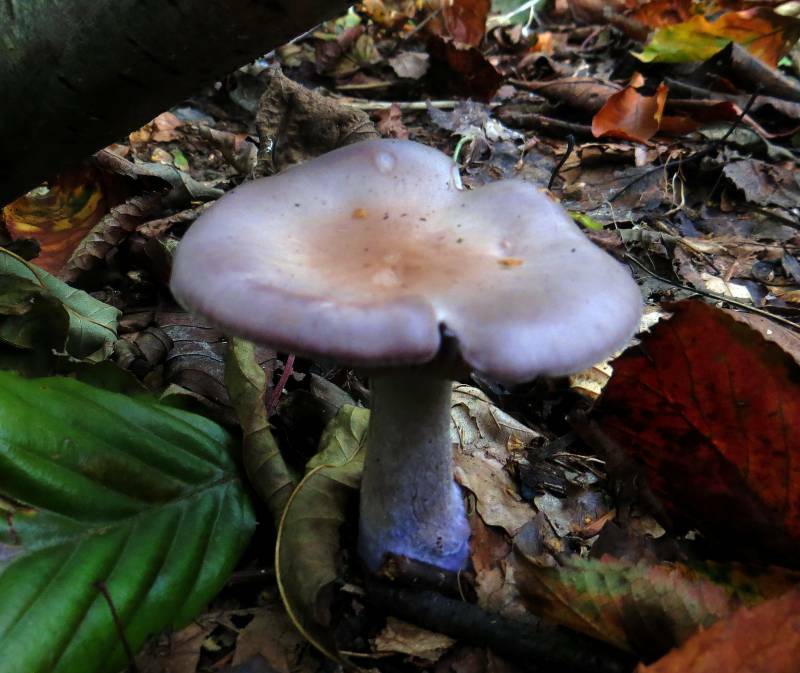 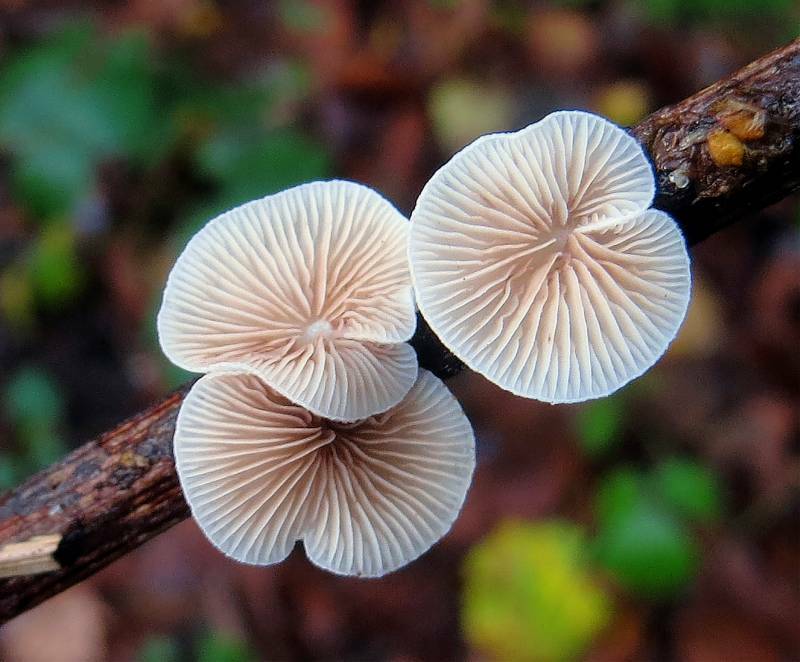 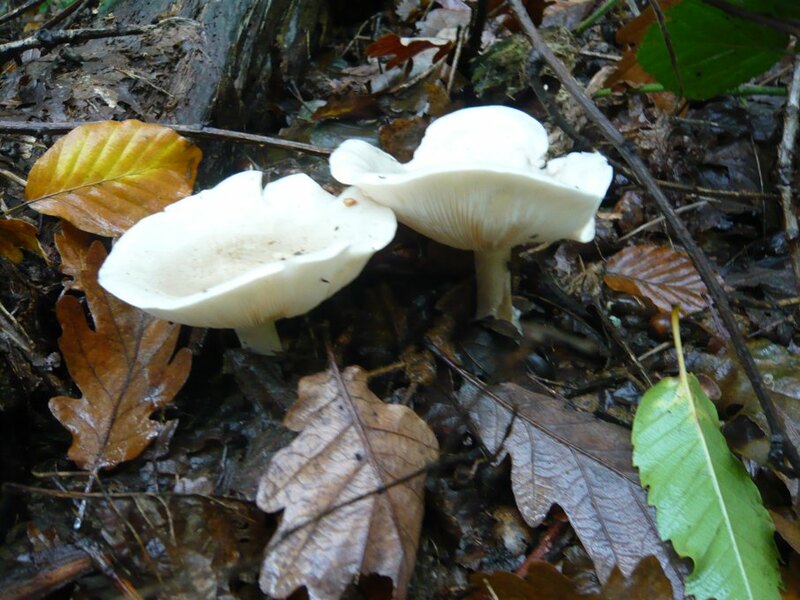 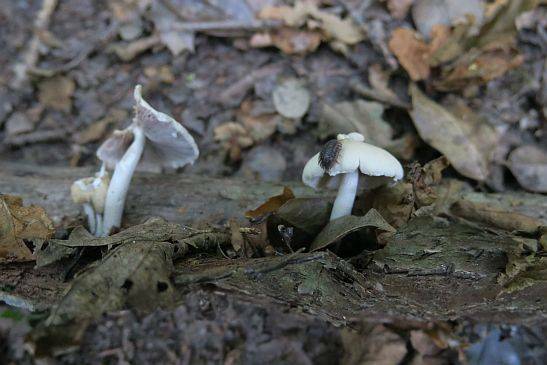 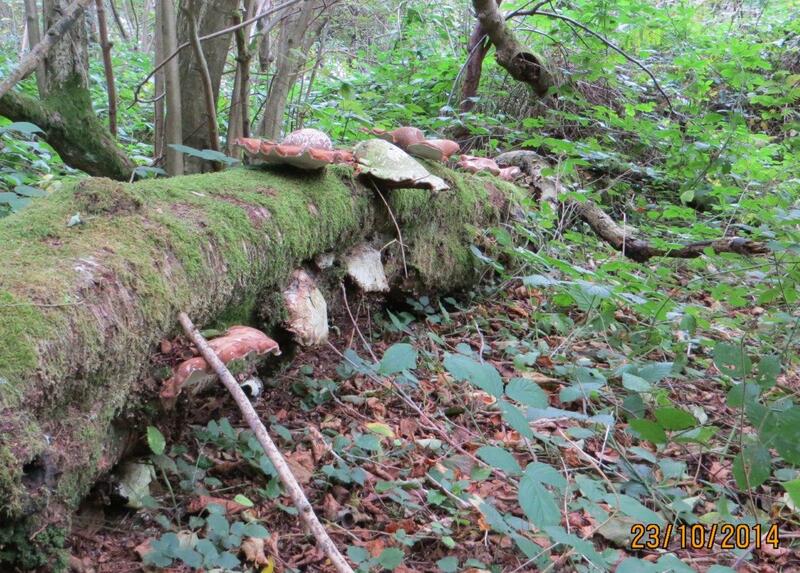 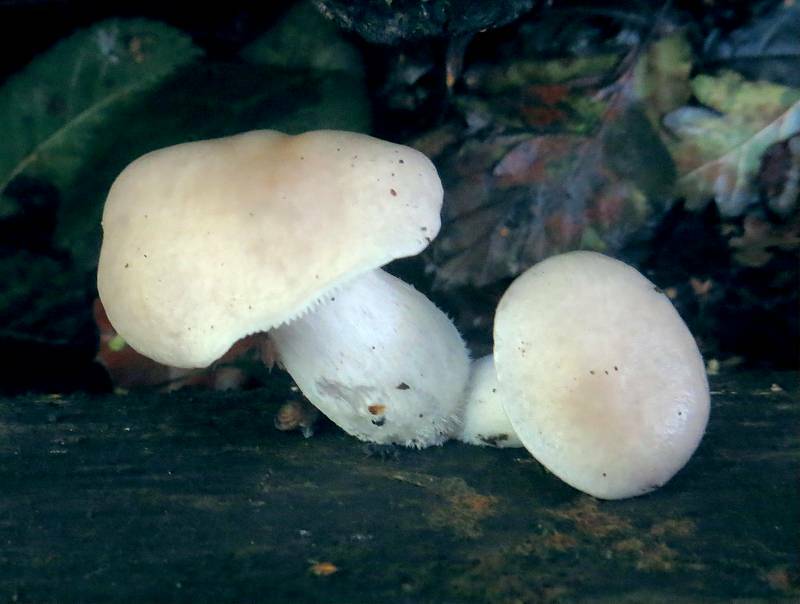 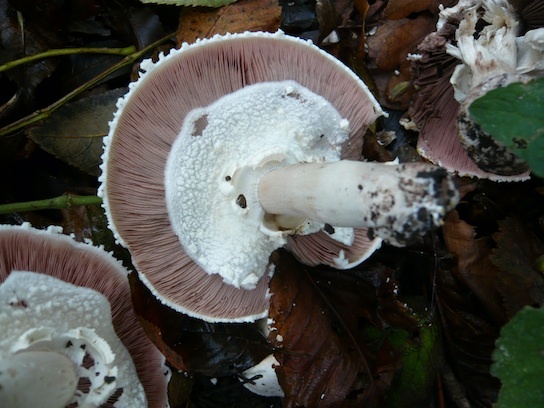 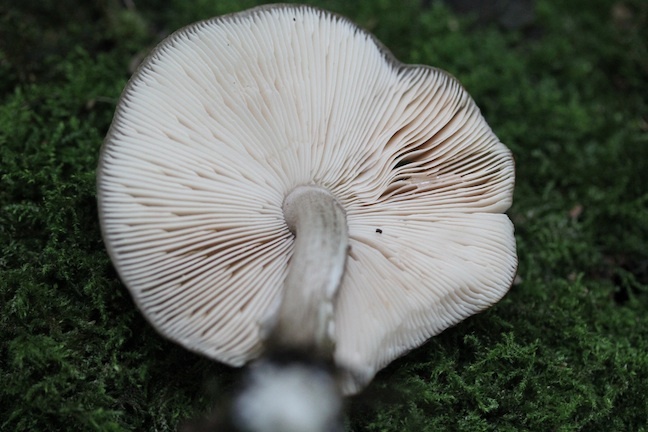 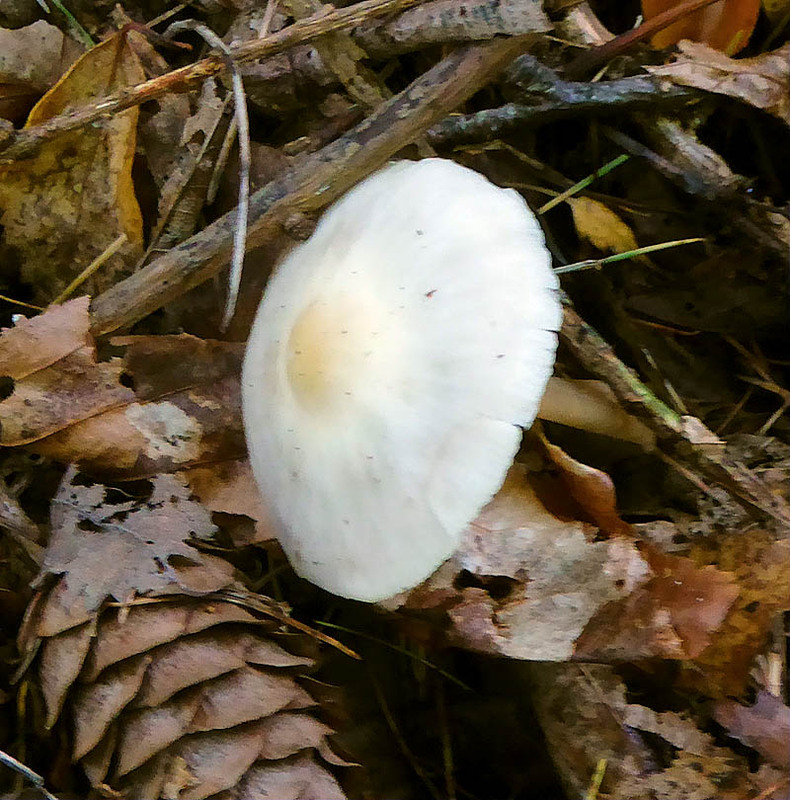 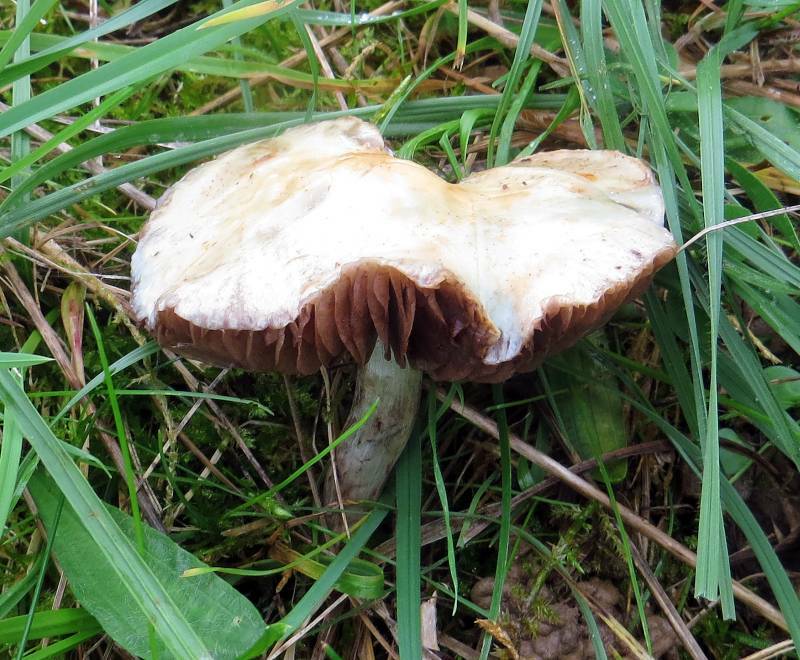 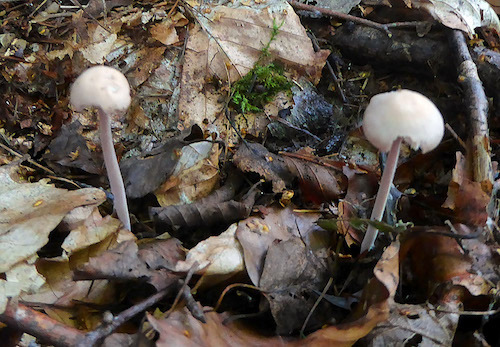 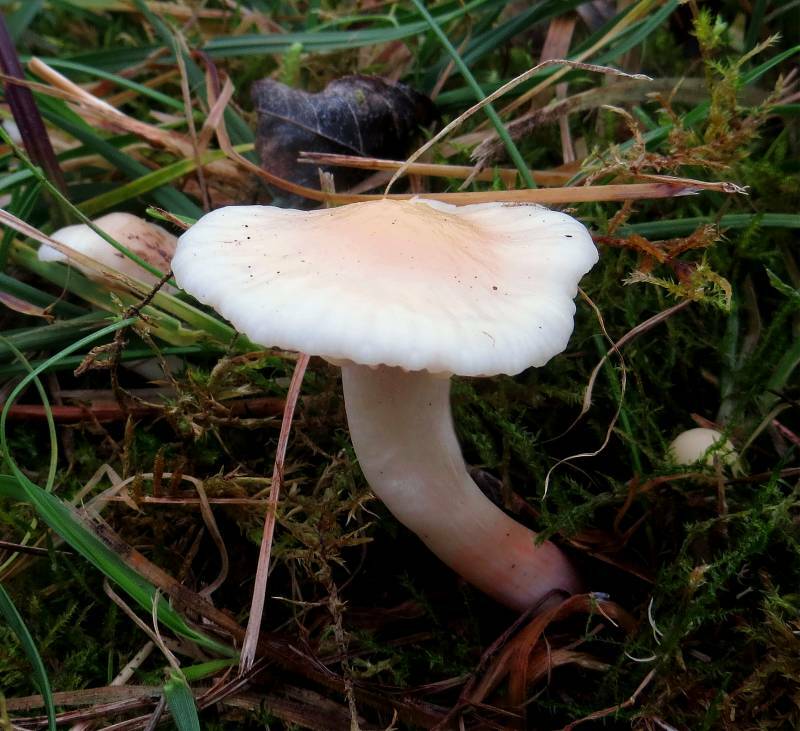 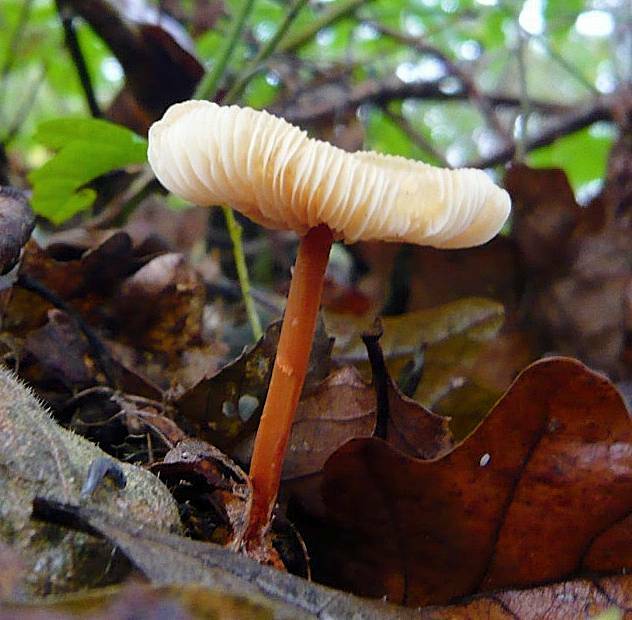 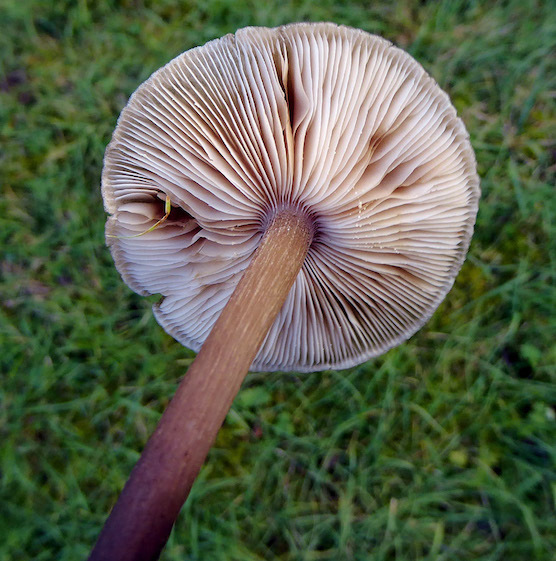 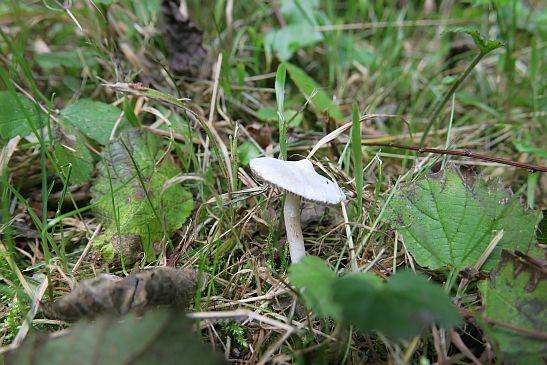 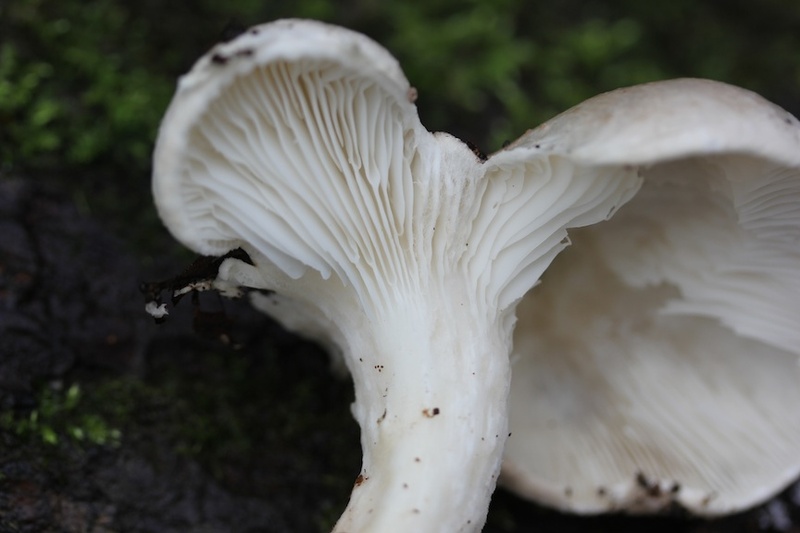 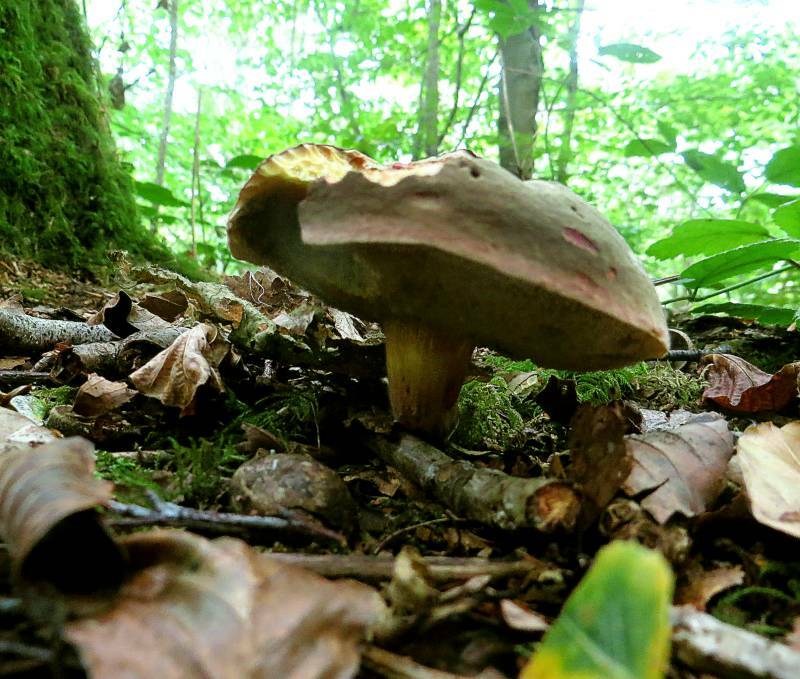 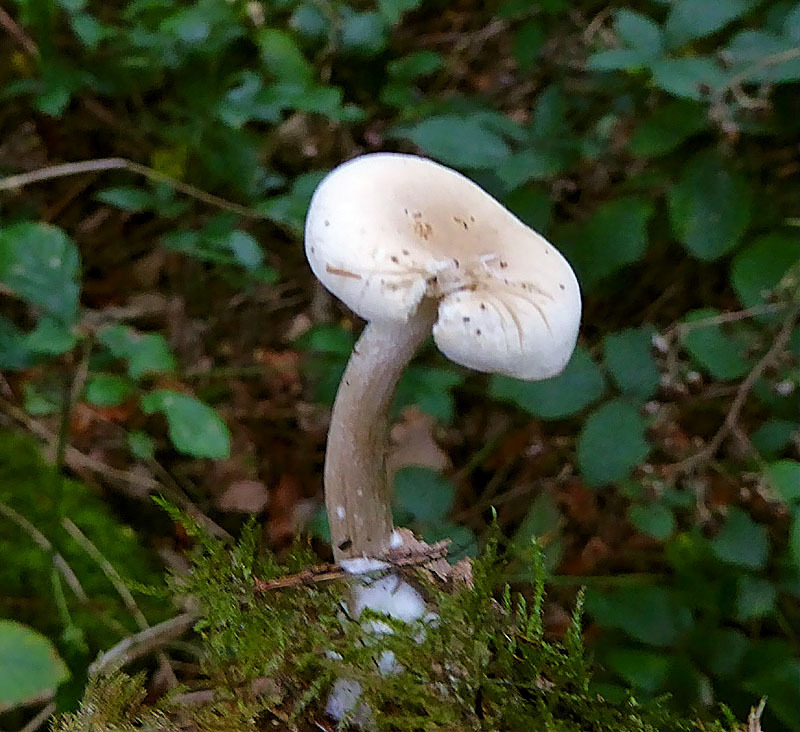 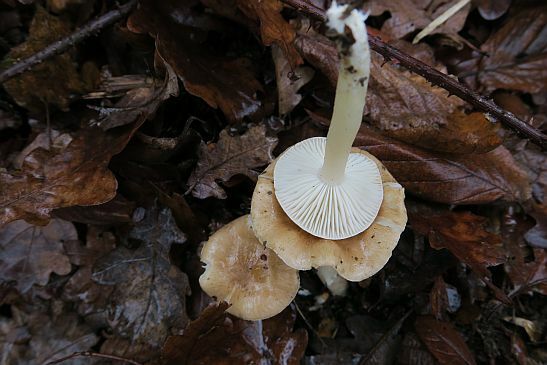 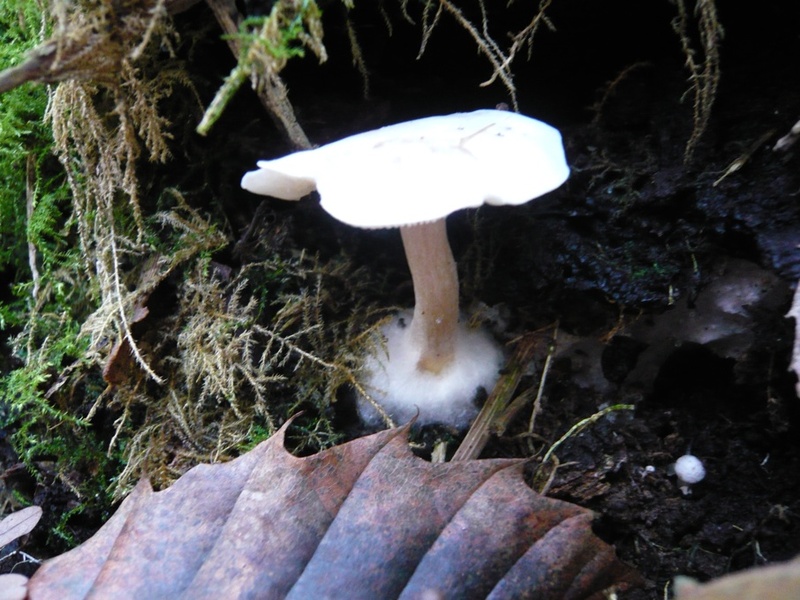 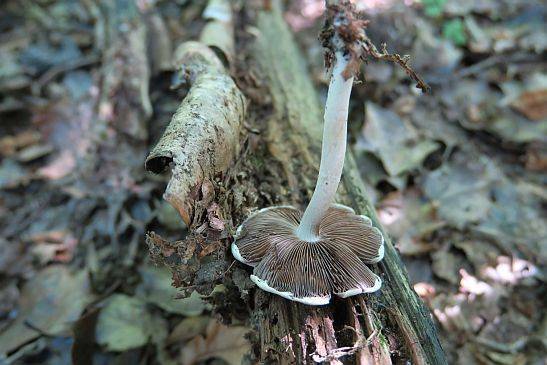 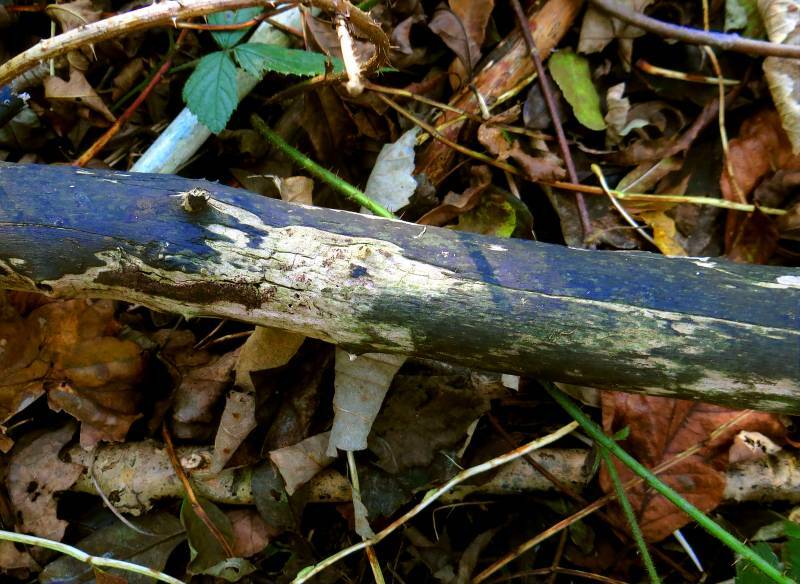 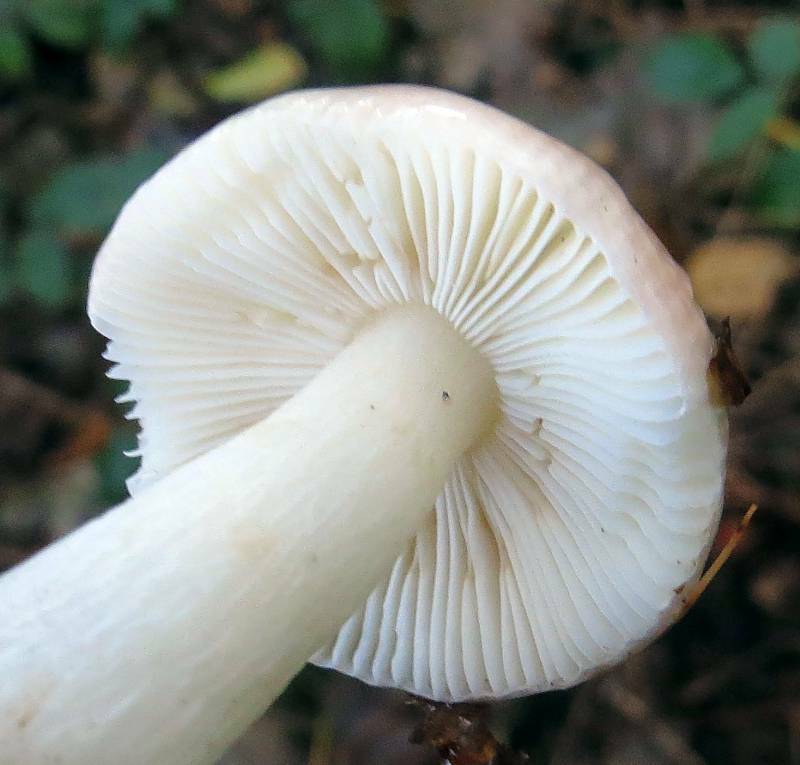 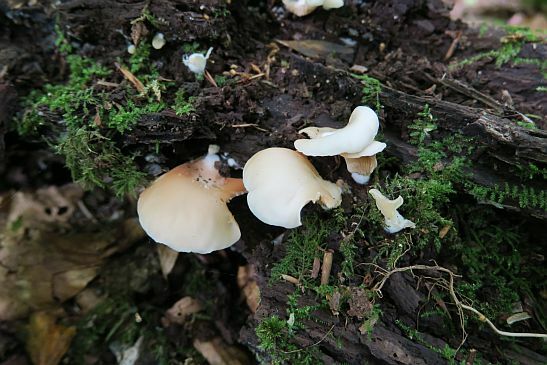 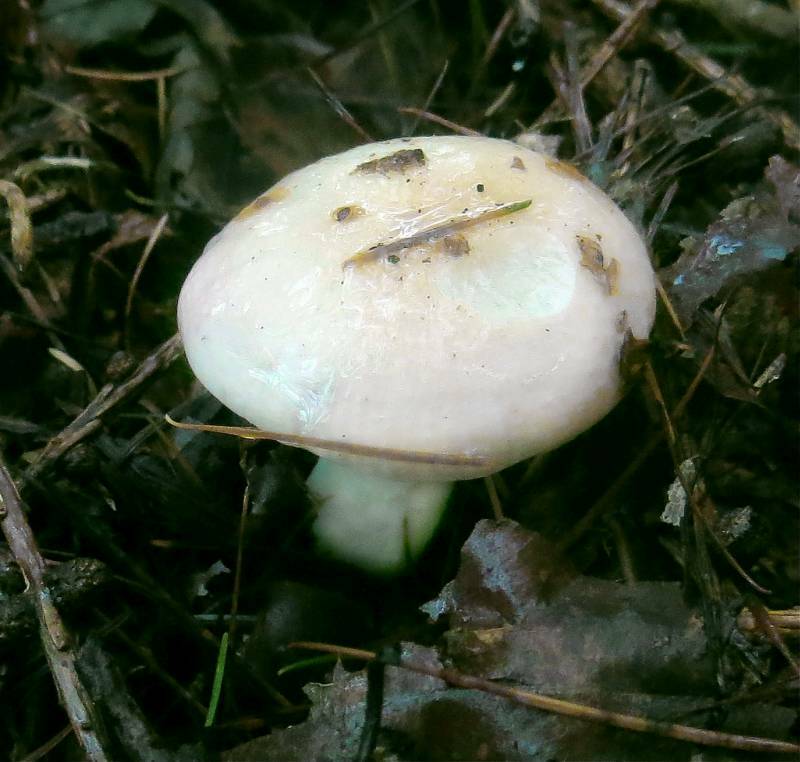 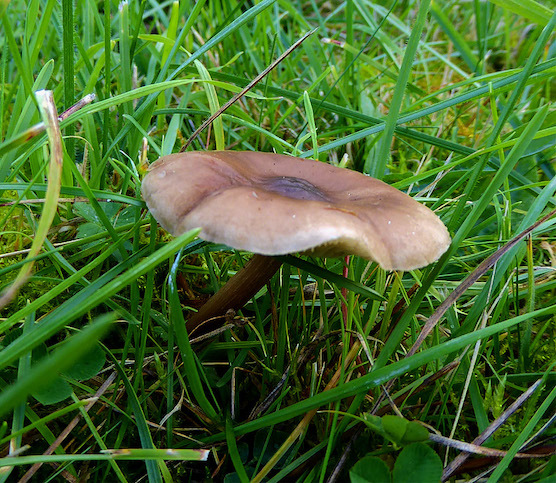 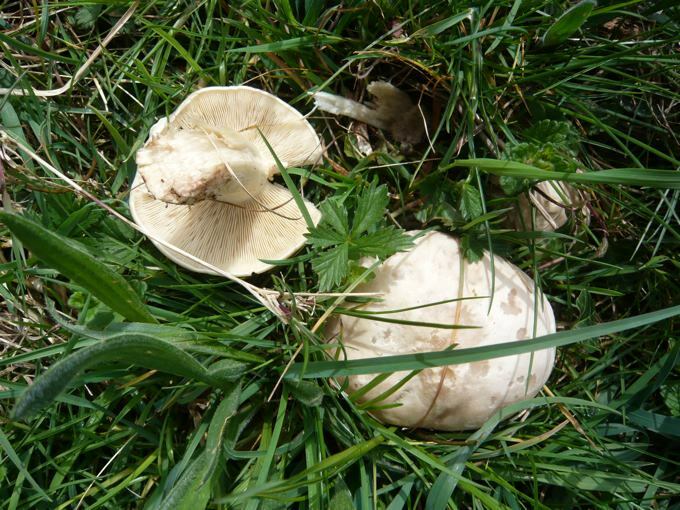 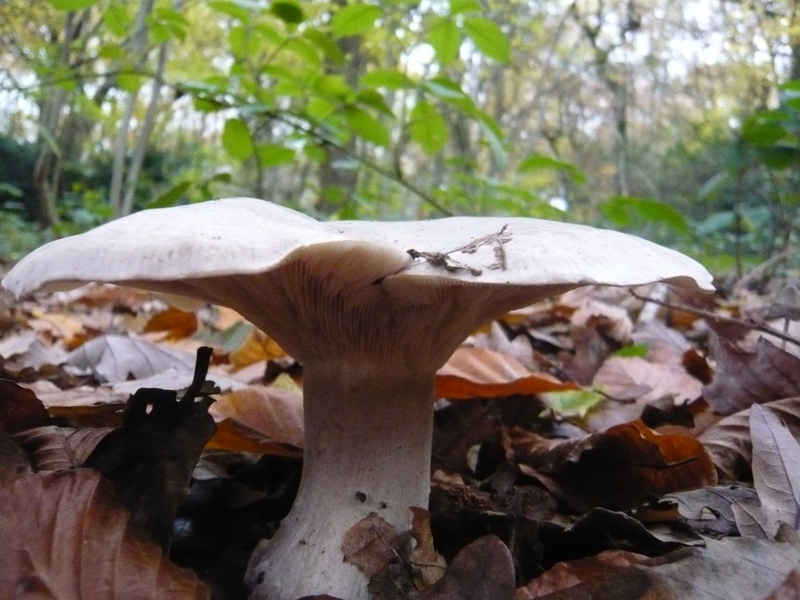 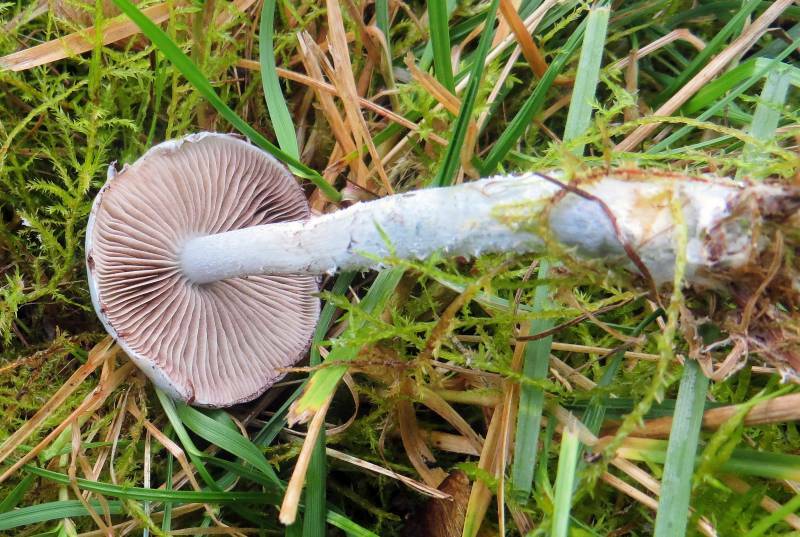 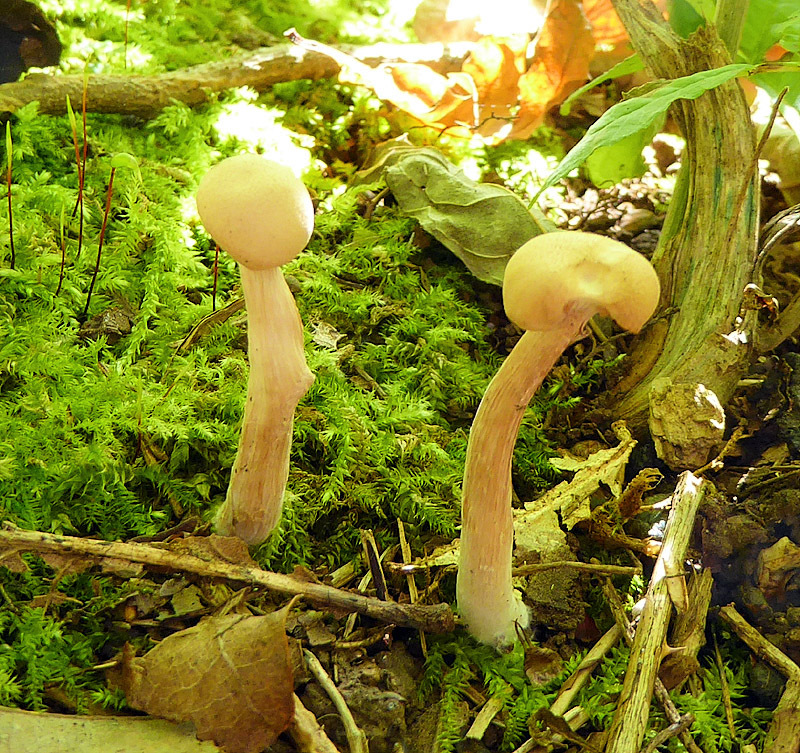 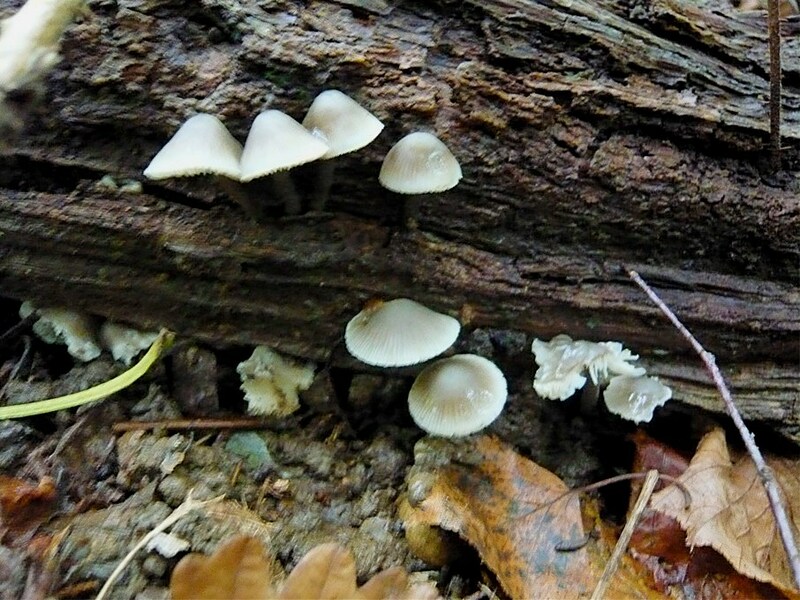 There are 58 species of Clitocybe in Britain. 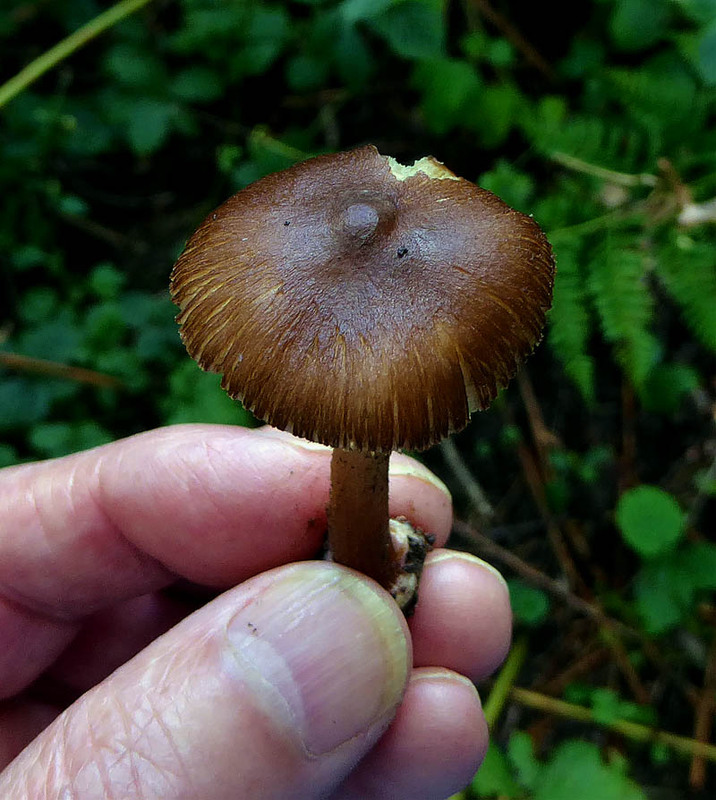 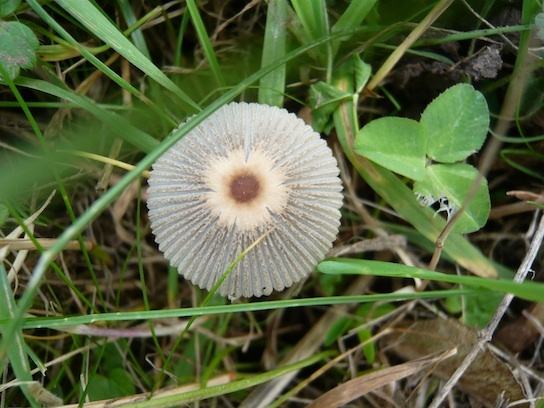 Many have funnel shaped caps, sometimes with an umbo (bump in the cap centre) as well. 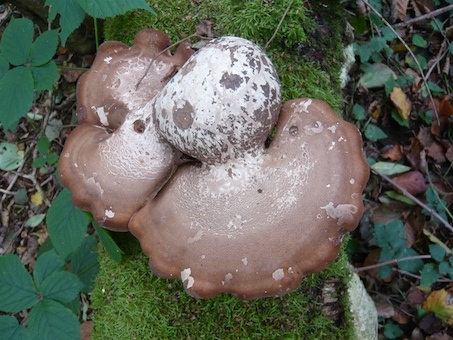 Many have strong distinctive smells of meat or aniseed. 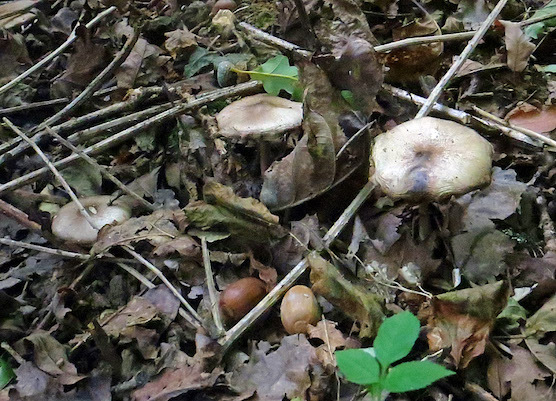 The fungi in this section are Hygrocybes or Waxcaps or their close relatives the Woodwaxes. 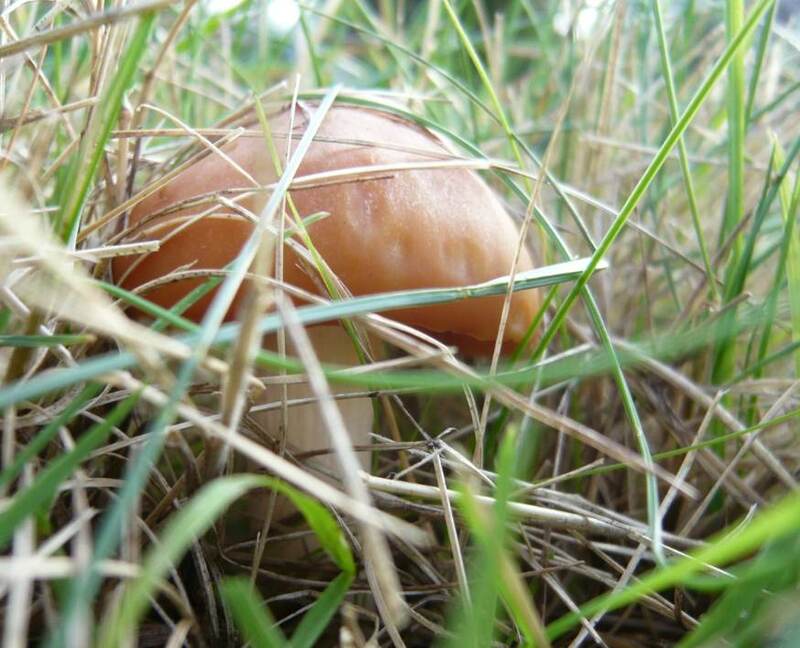 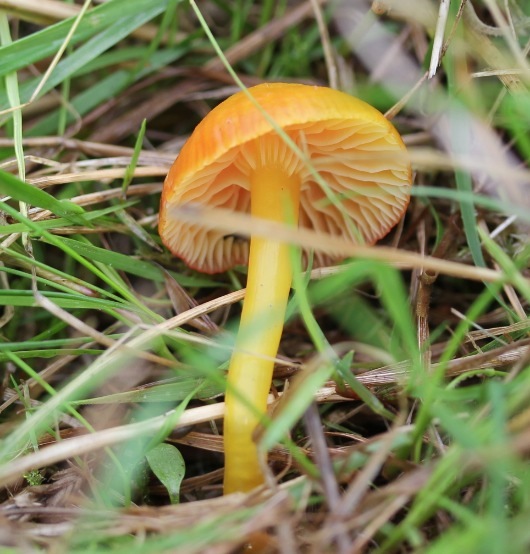 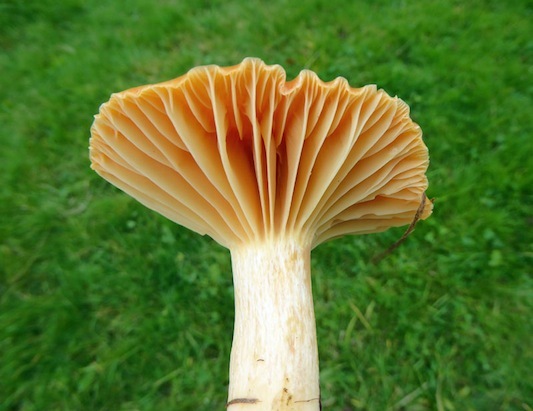 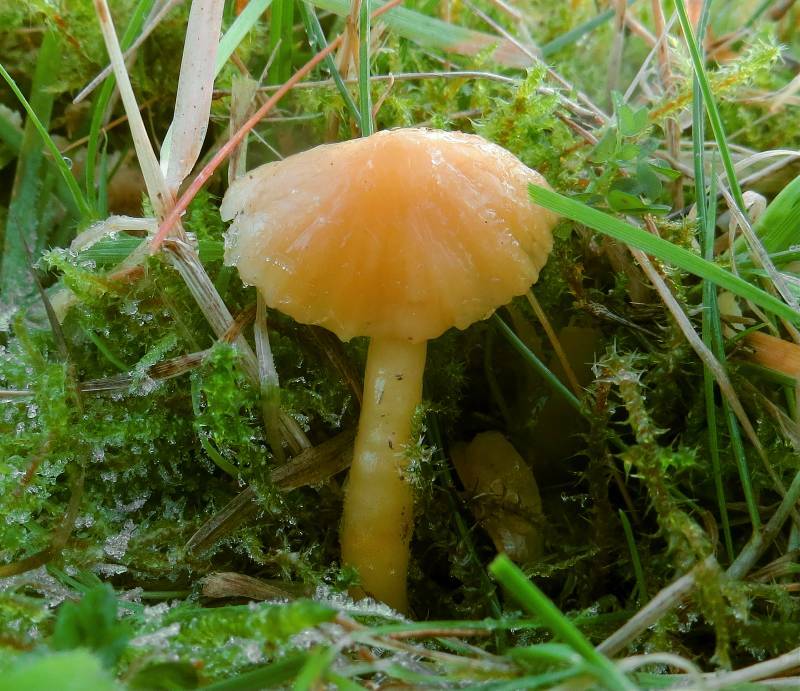 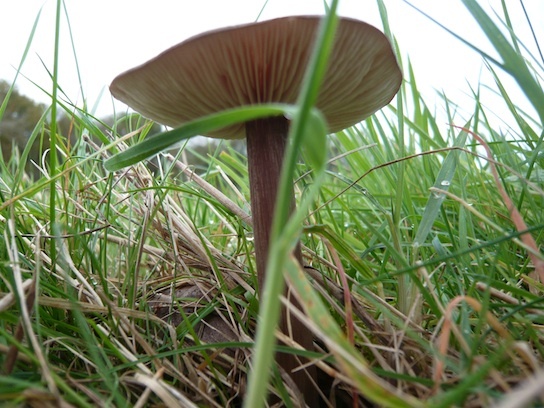 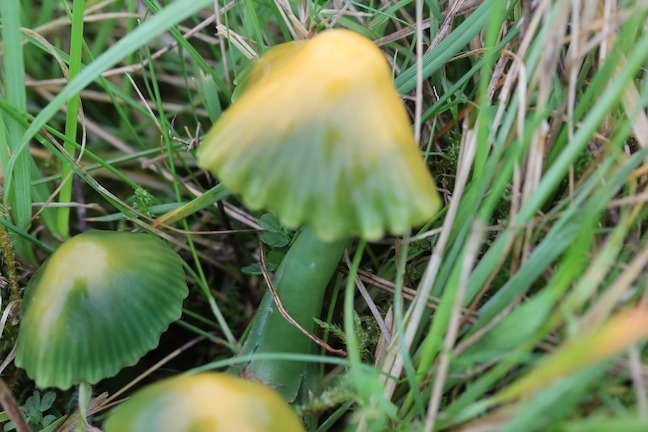 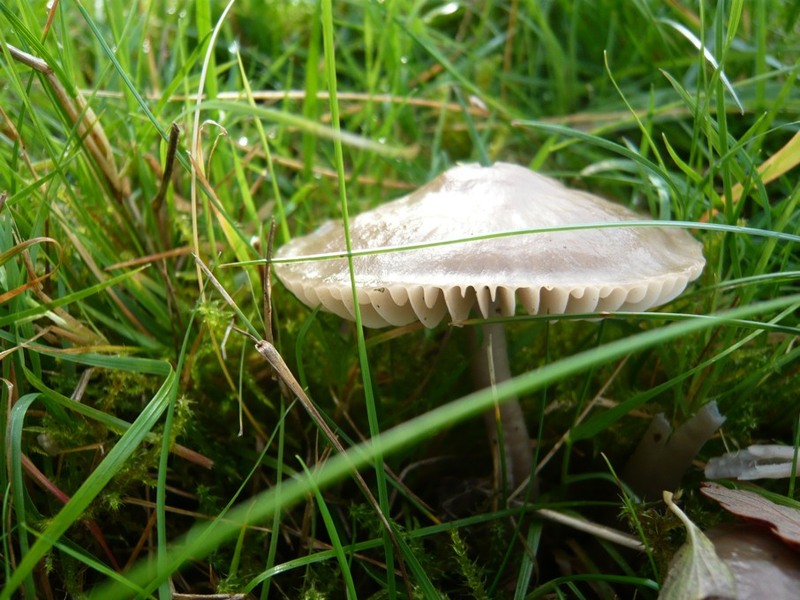 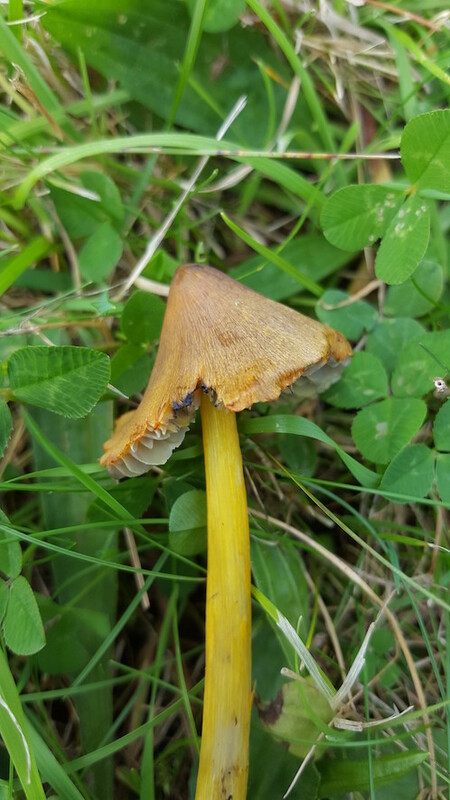 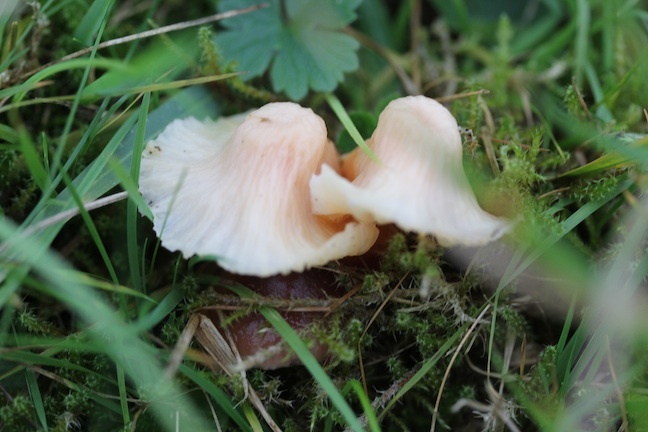 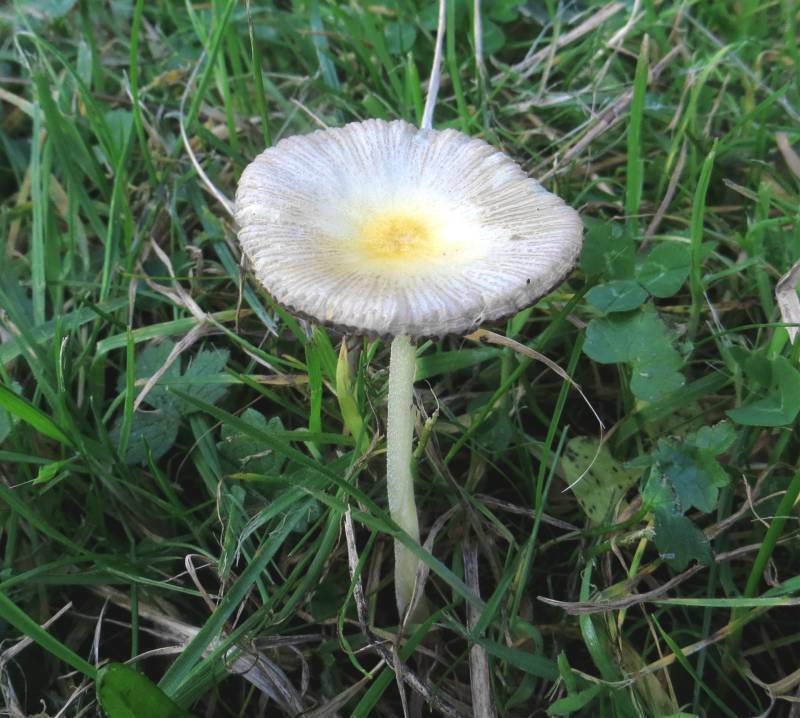 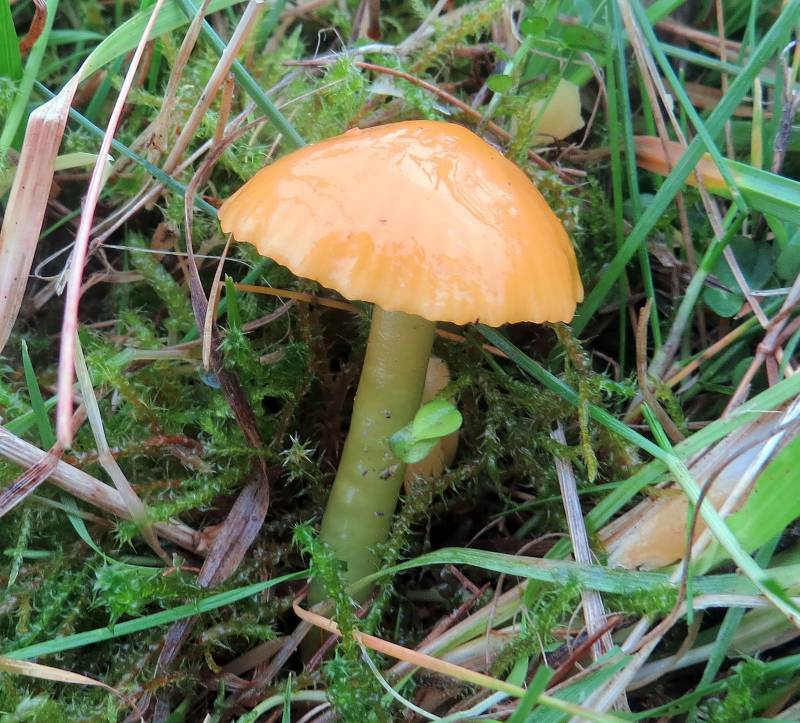 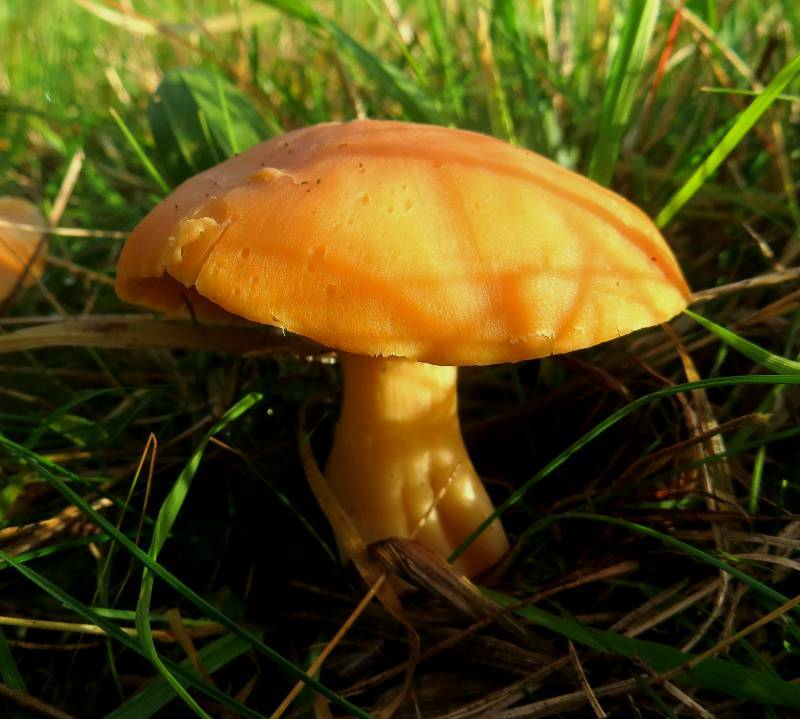 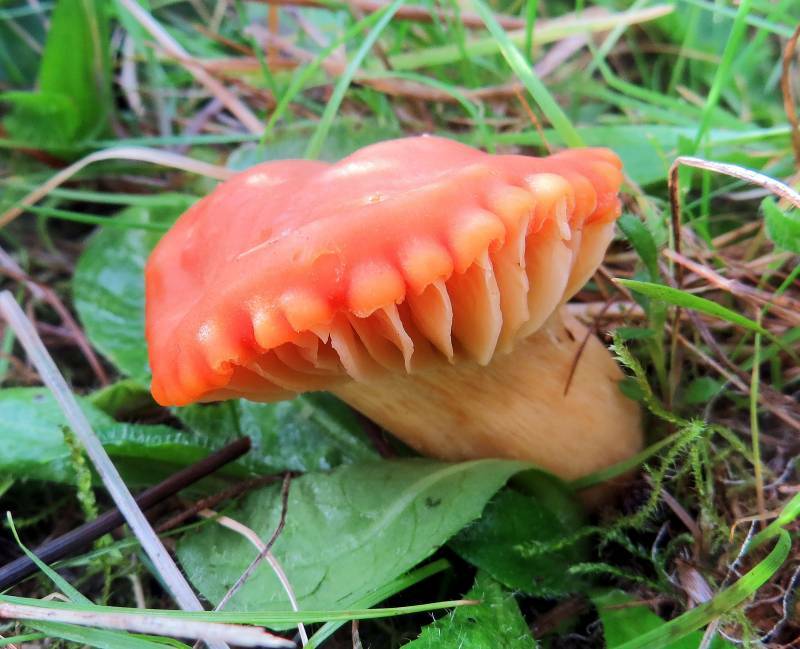 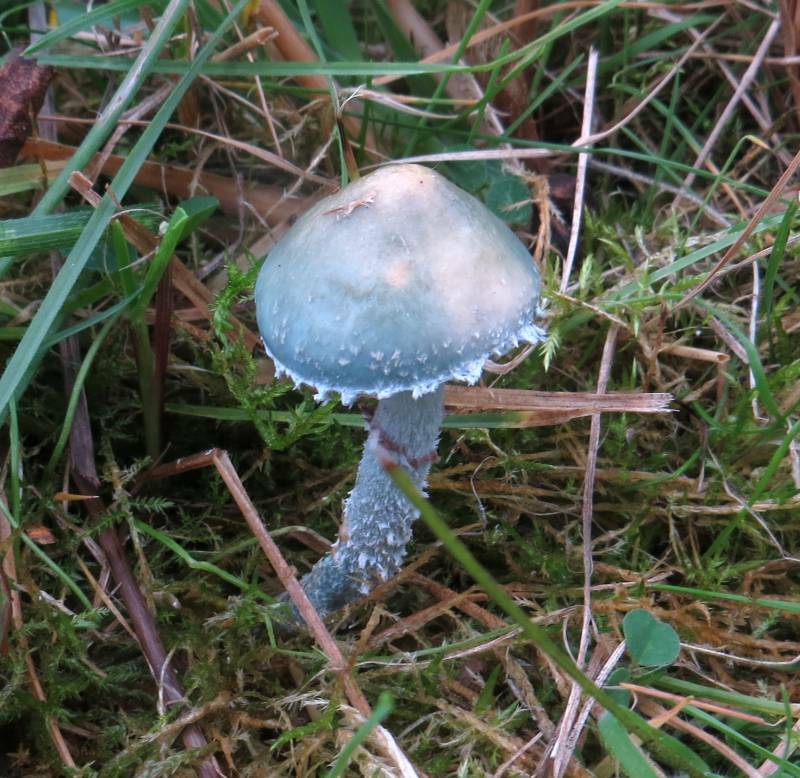 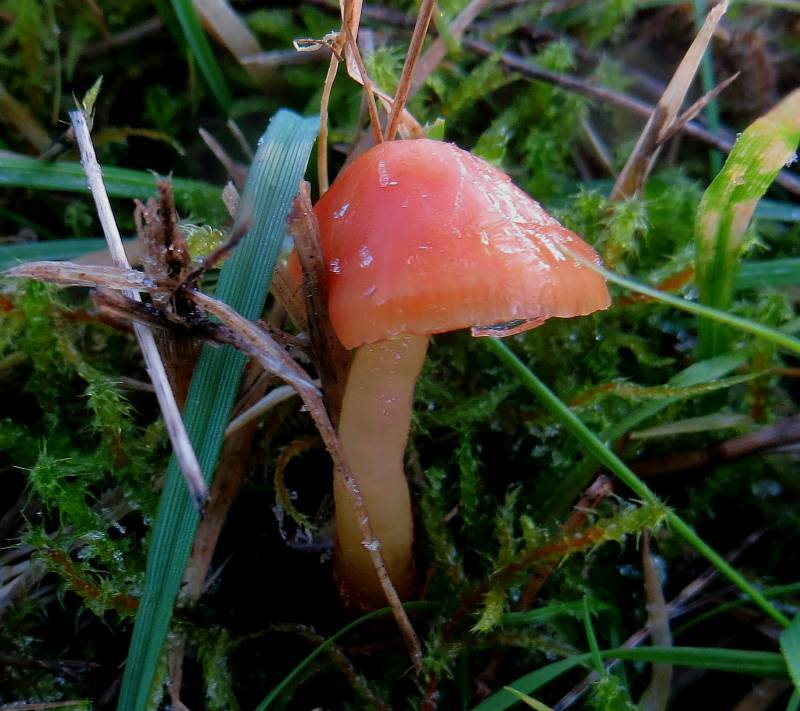 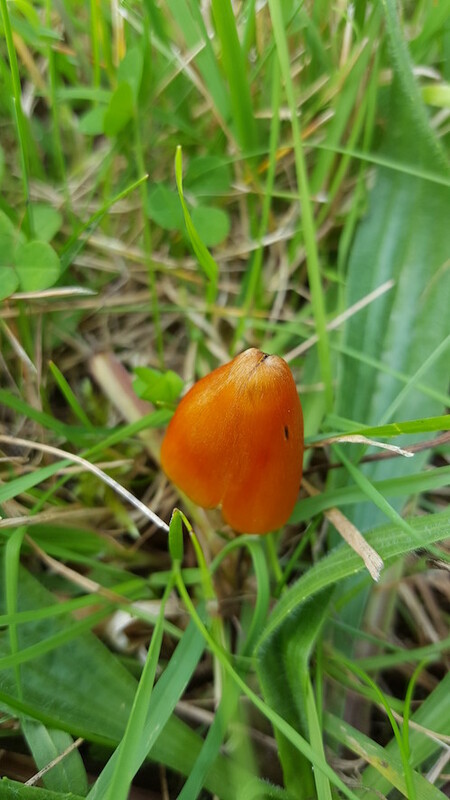 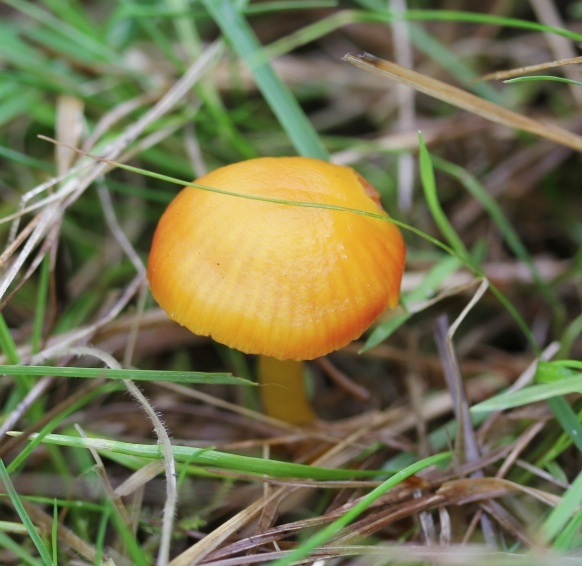 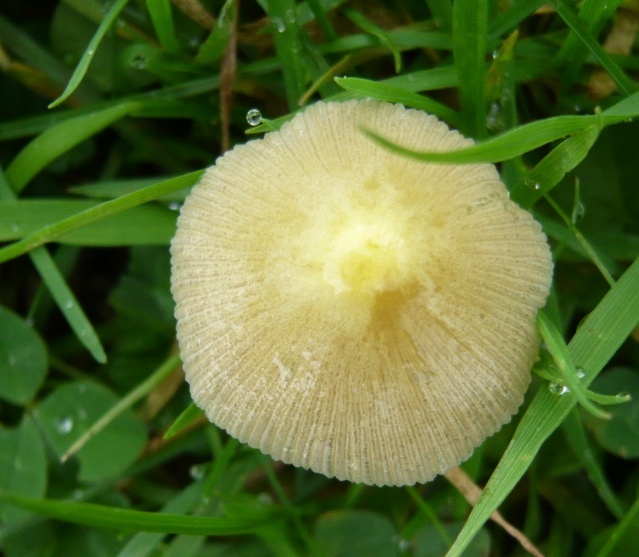 Waxcaps are a large and very varied group which in Europe are a mainly pasture species. 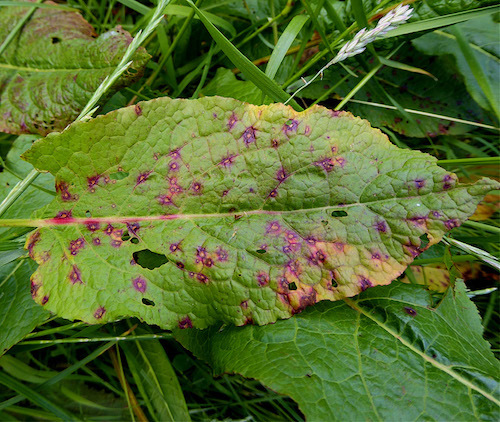 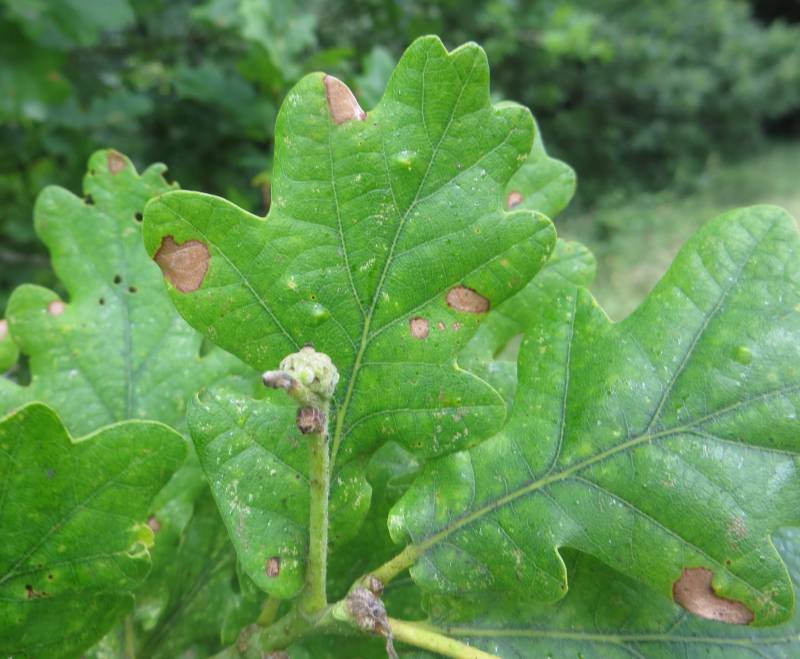 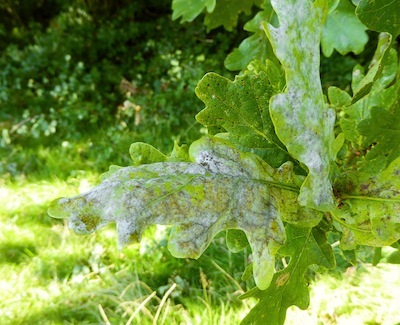 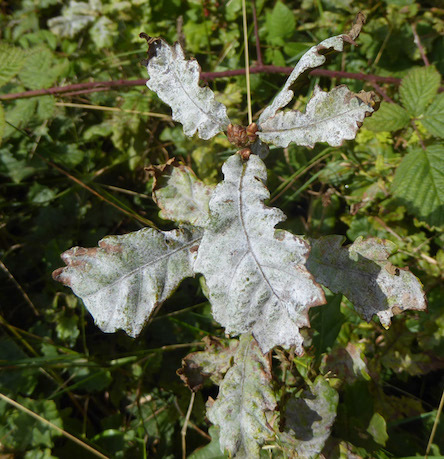 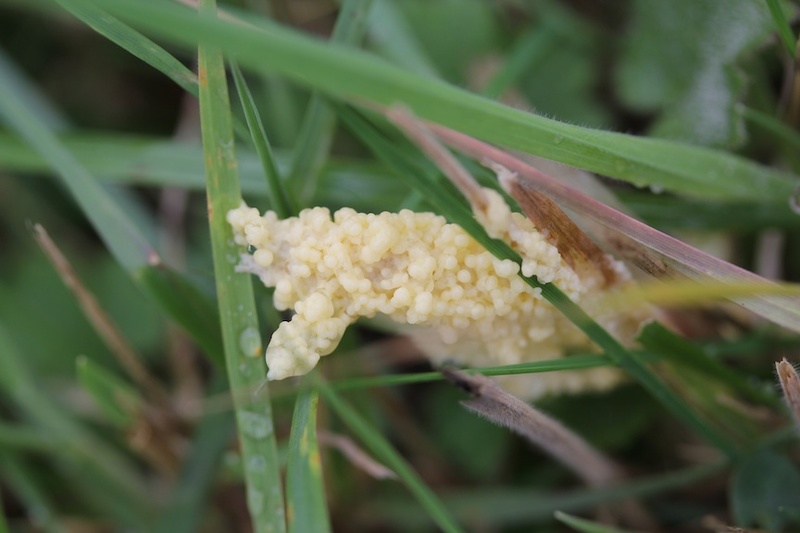 They are uncommon and becoming increasingly rare due to intolerance of any fertilisers and pollution and the consequent shortage of unimproved pastureland. 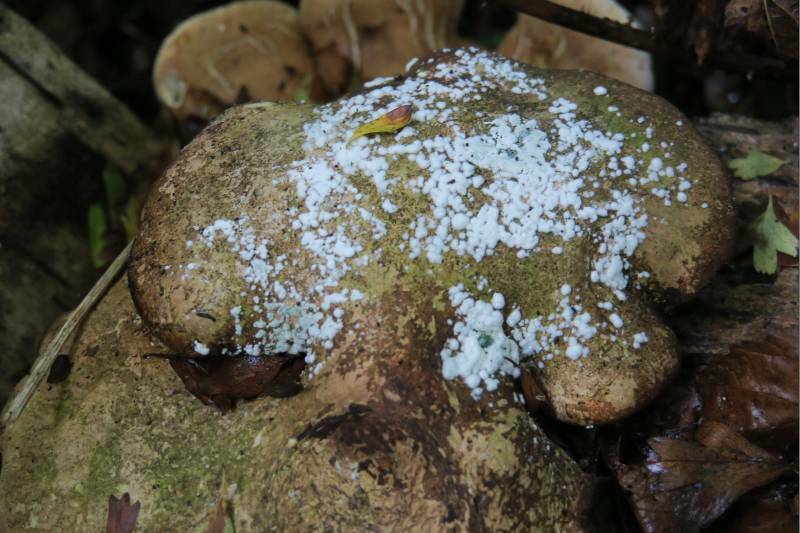 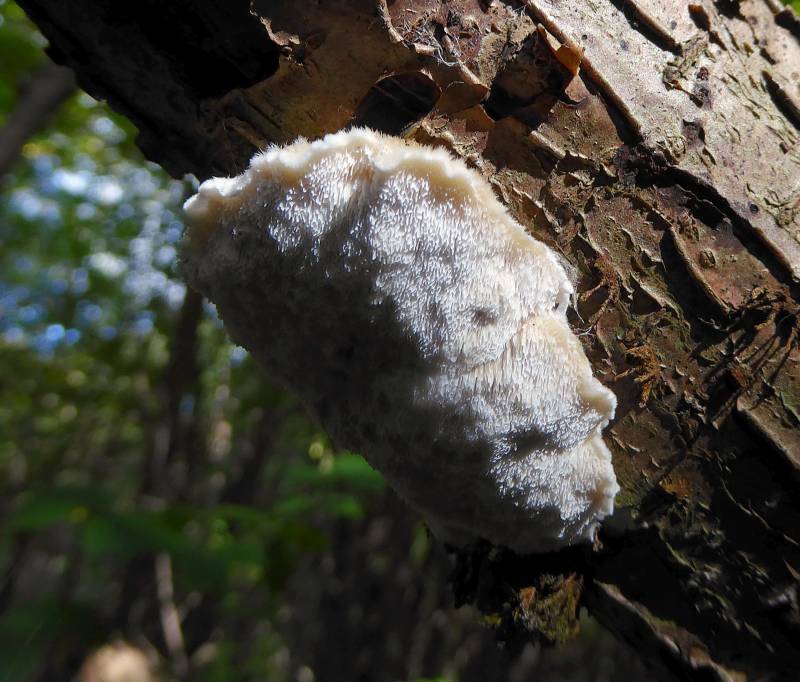 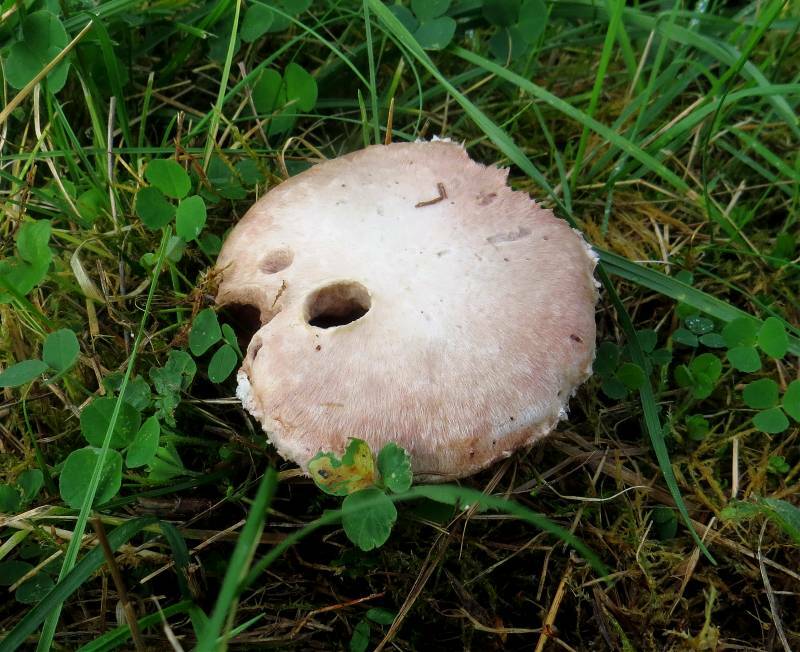 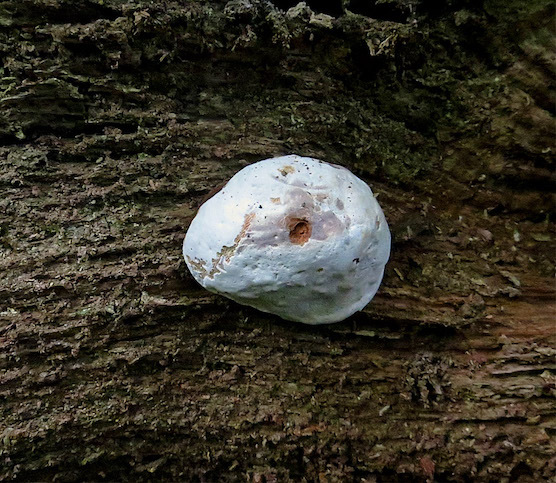 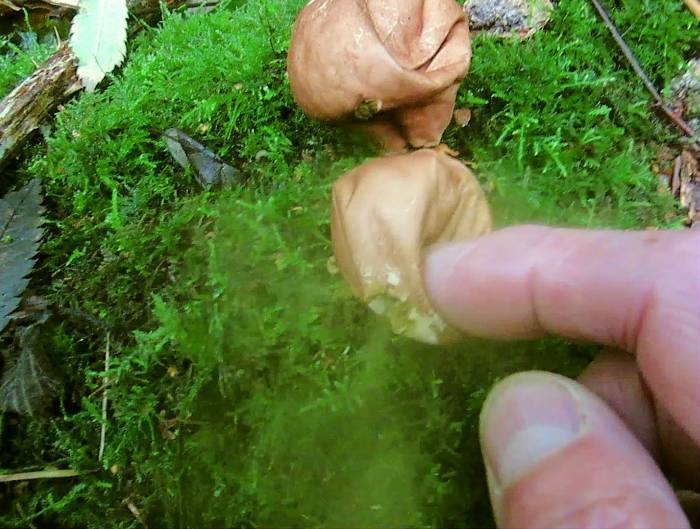 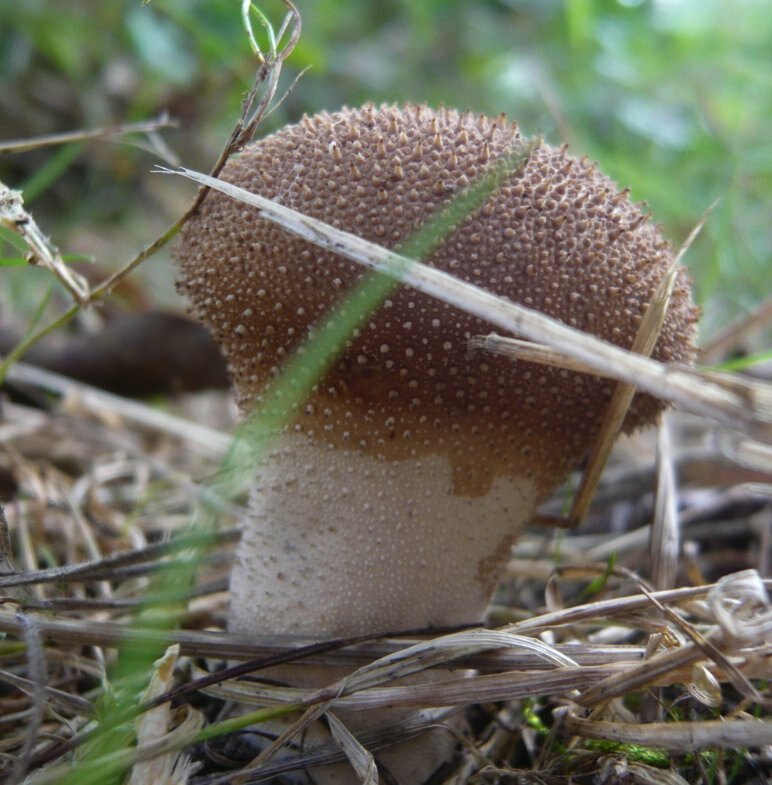 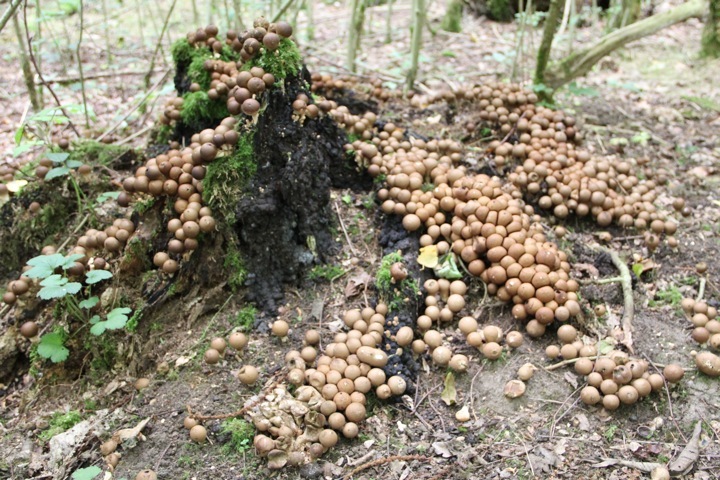 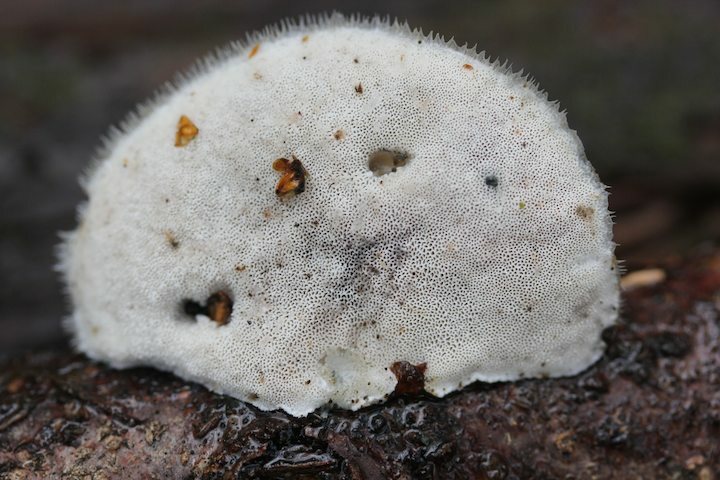 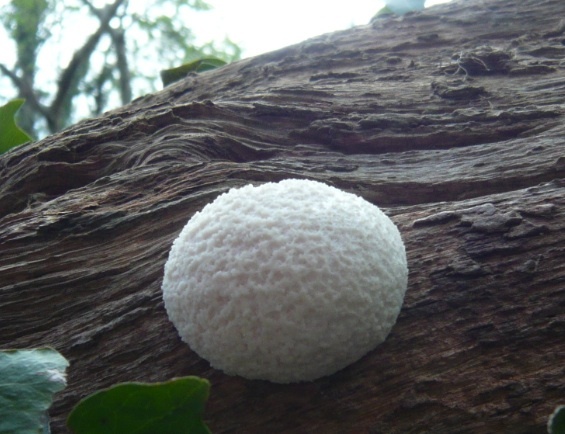 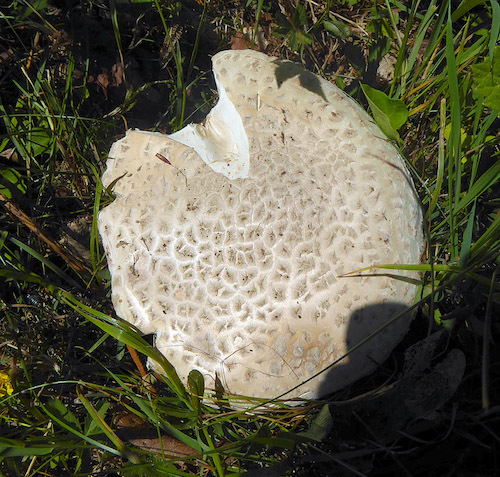 The puffballs convert the white flesh within their skins into vast numbers of spores, and once that's completed, the skin splits and any movement of them due to wind or rainfall drops puff out the spores for them to disperse. 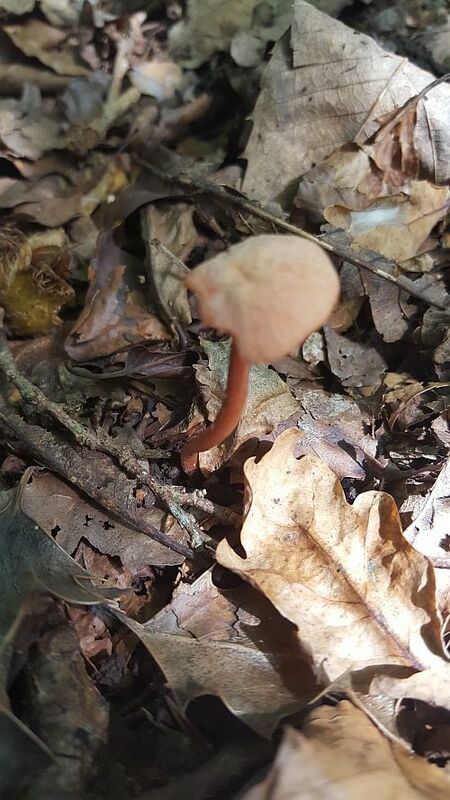 One photo below shows that happening. 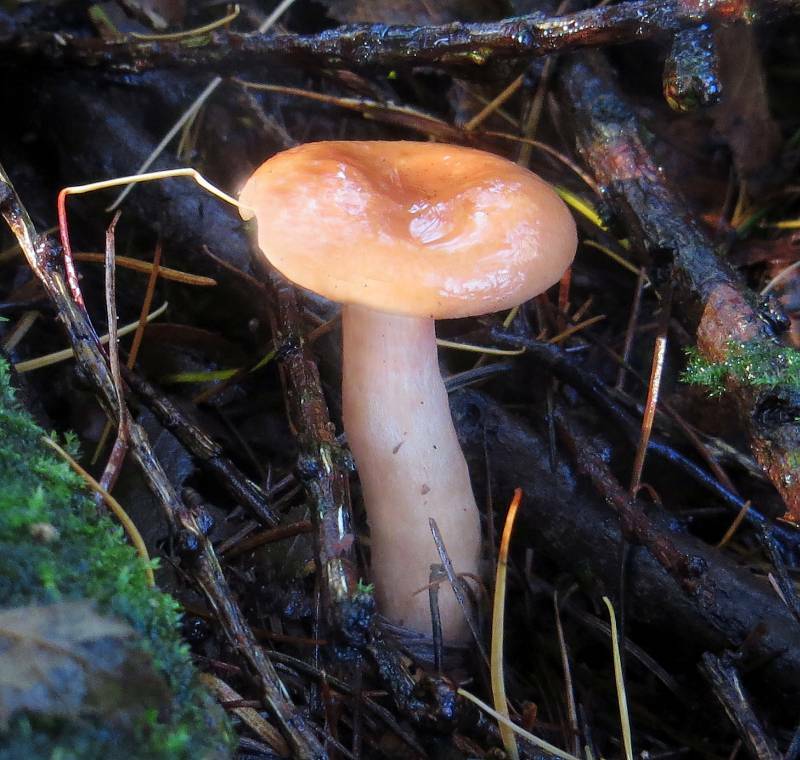 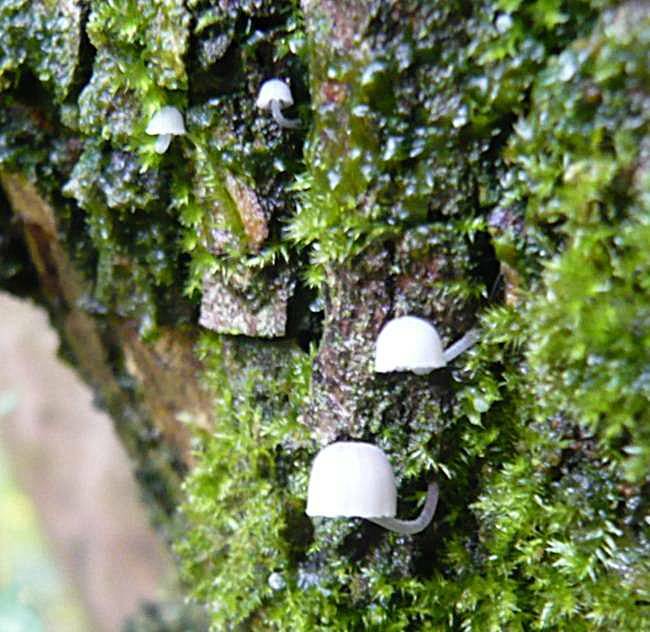 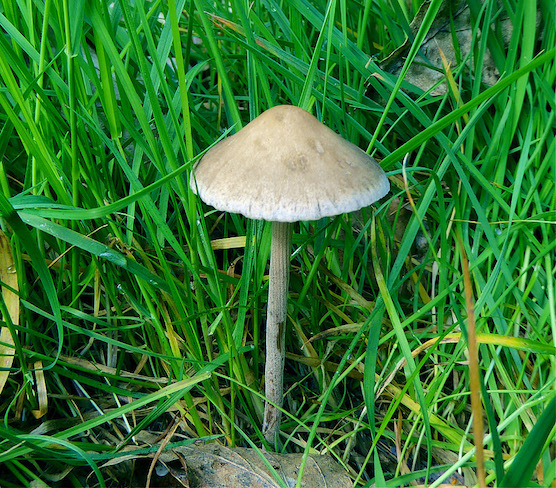 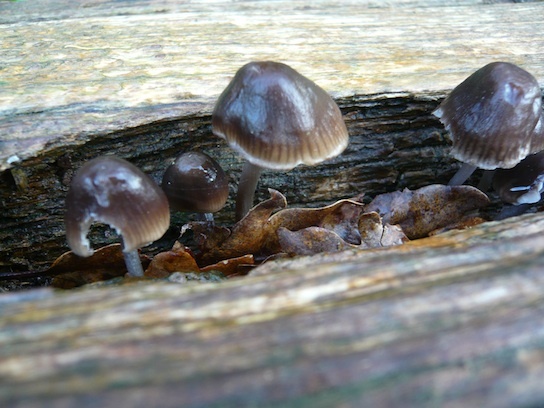 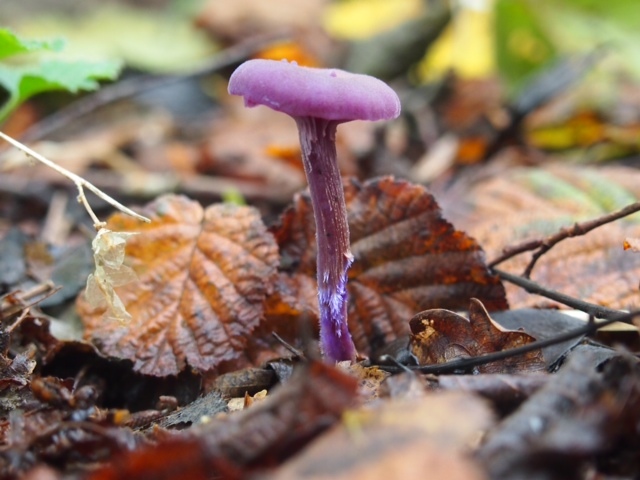 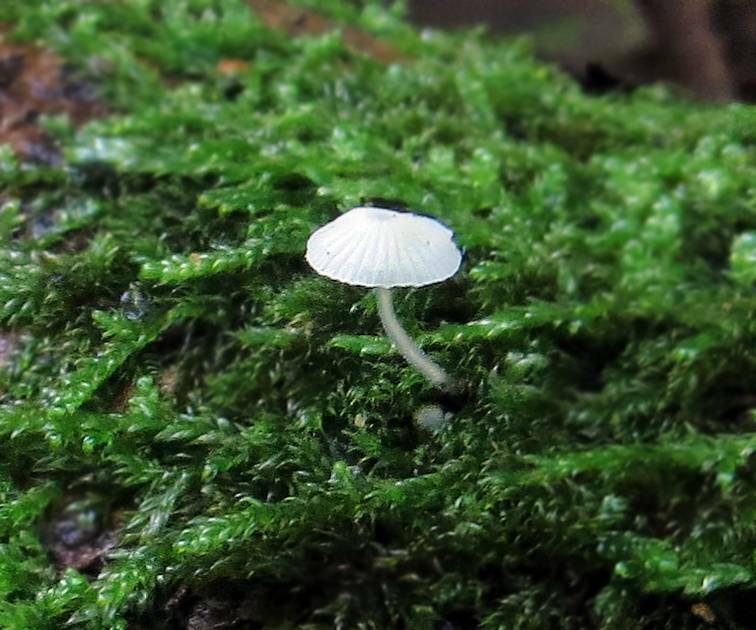 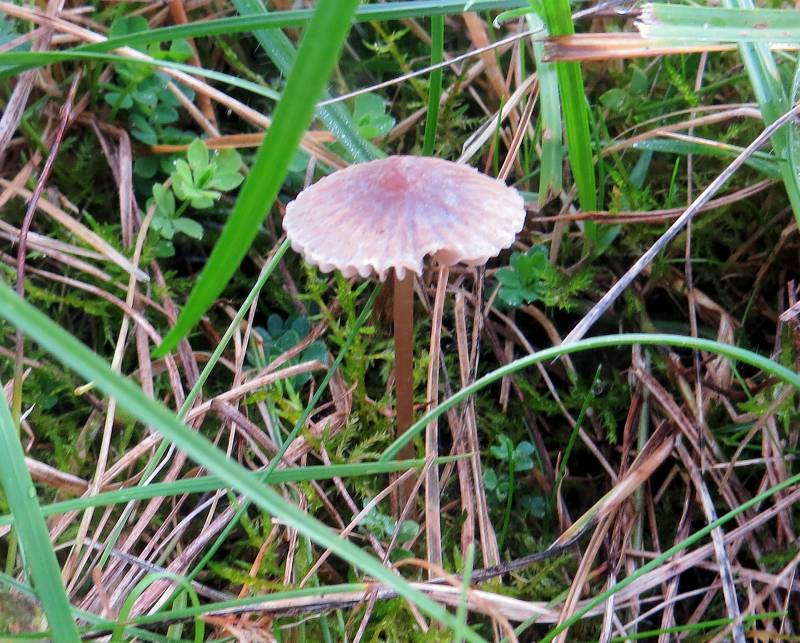 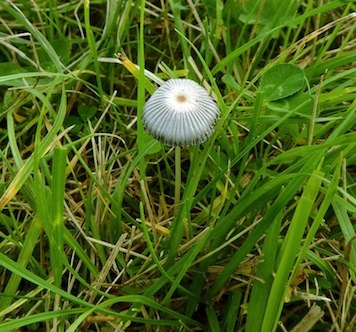 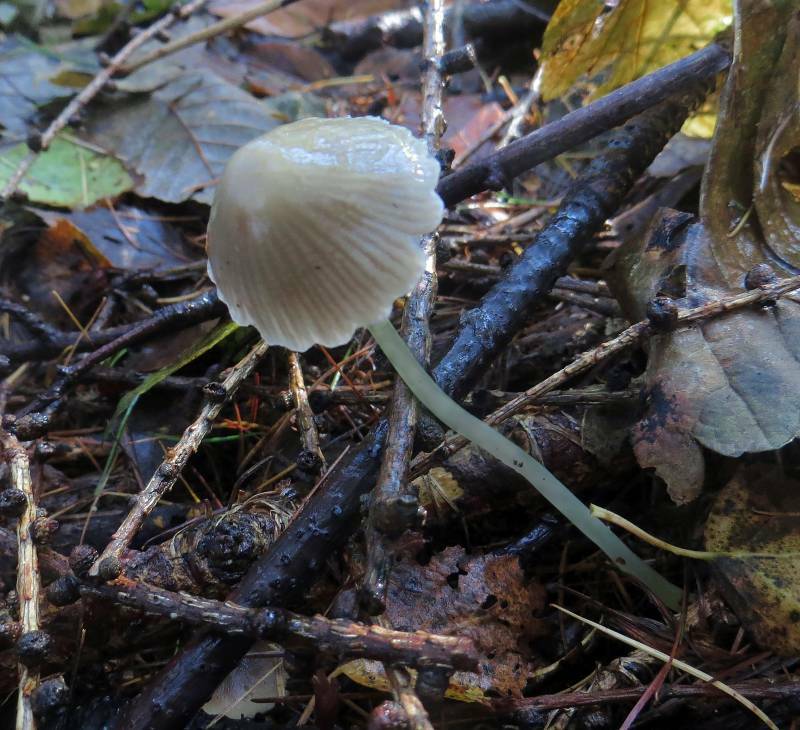 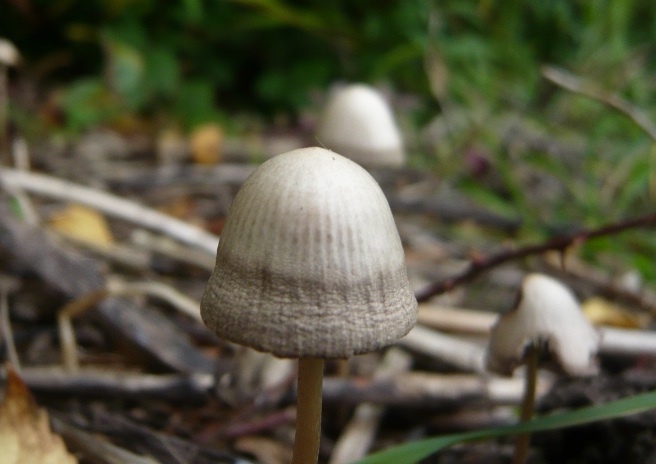 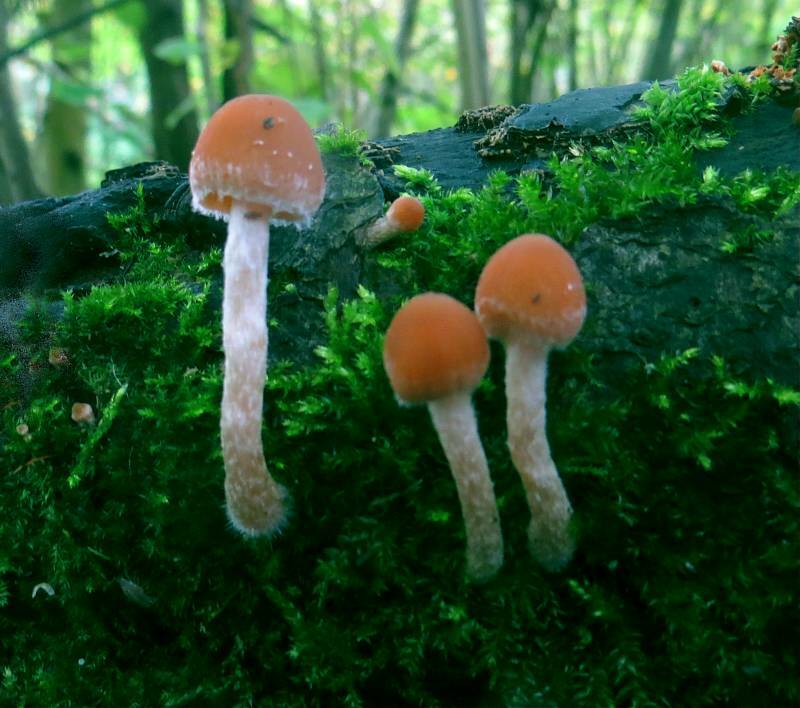 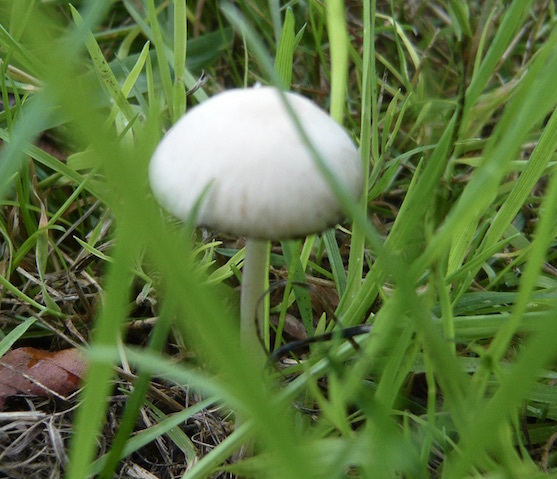 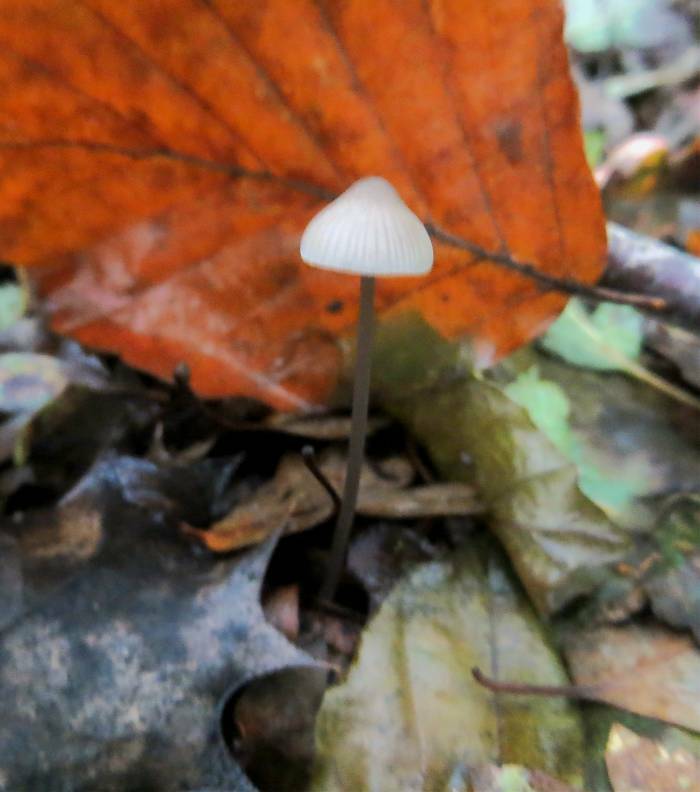 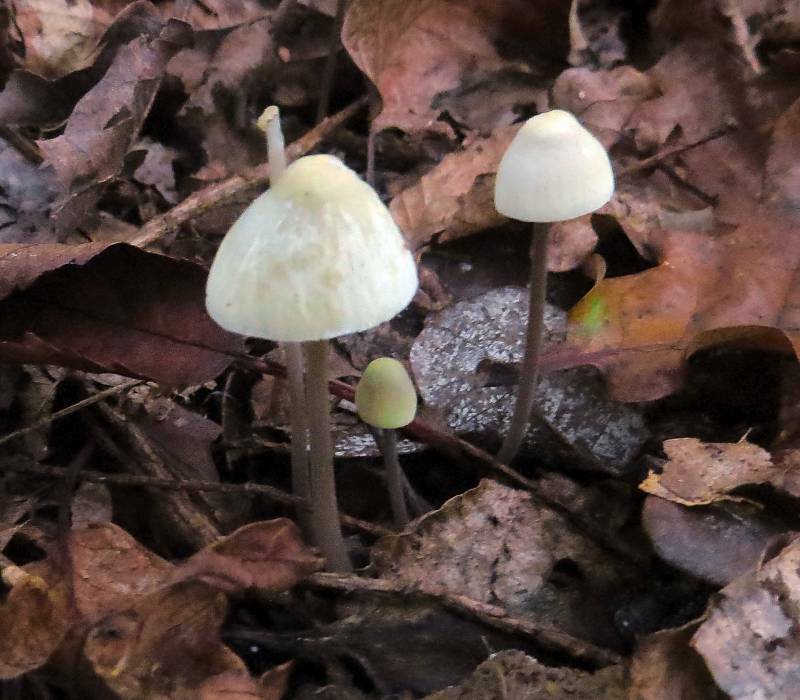 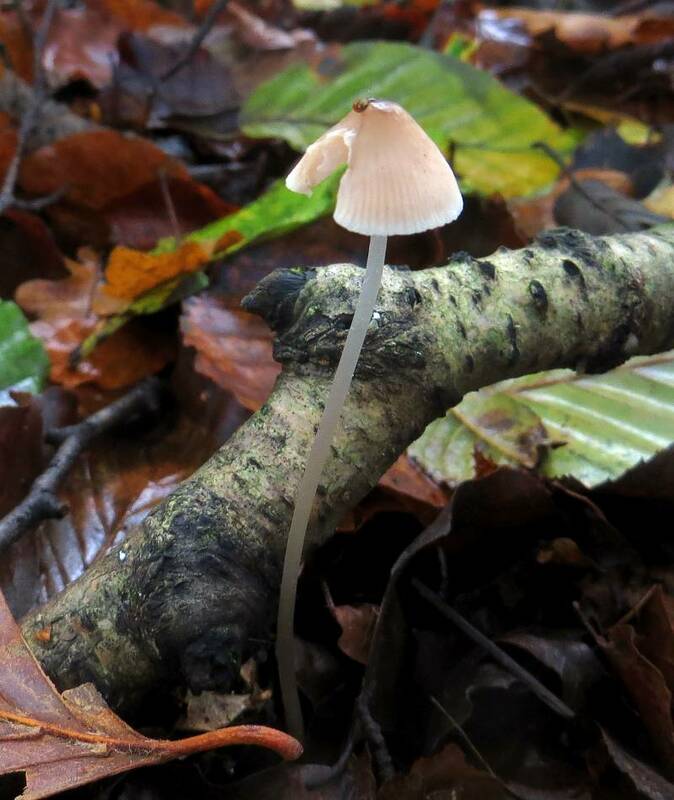 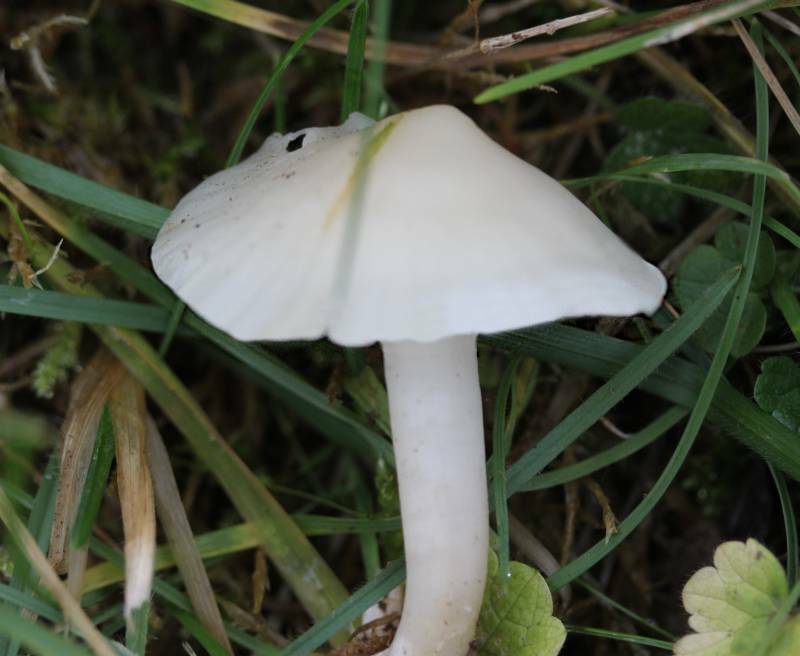 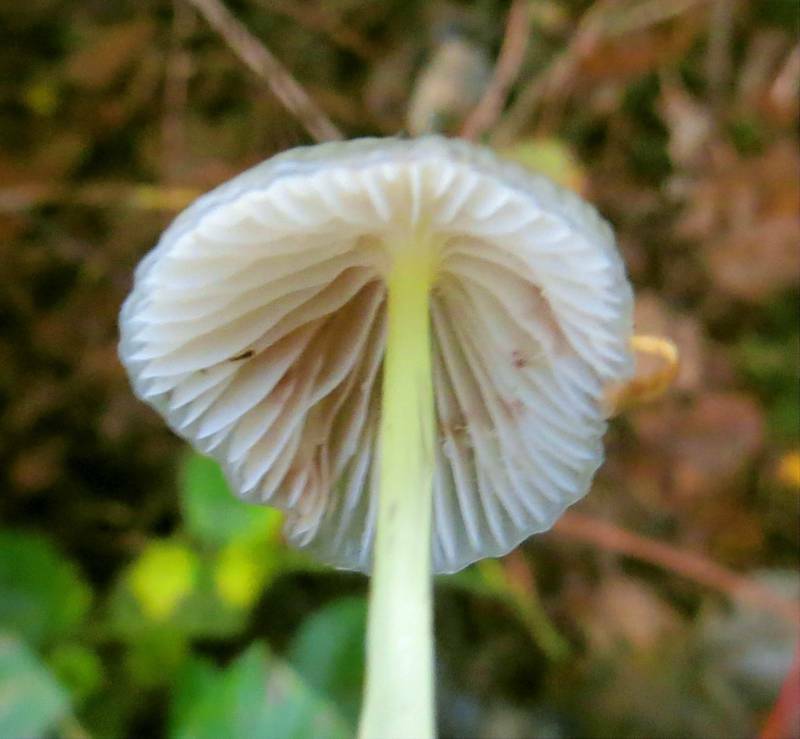 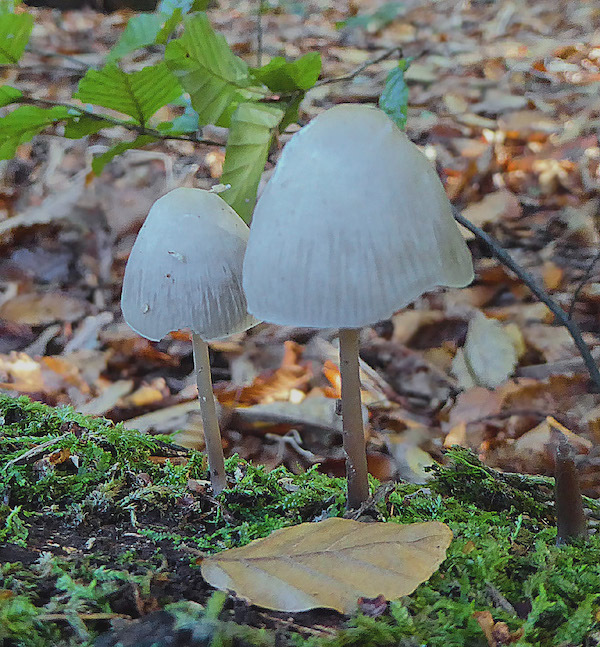 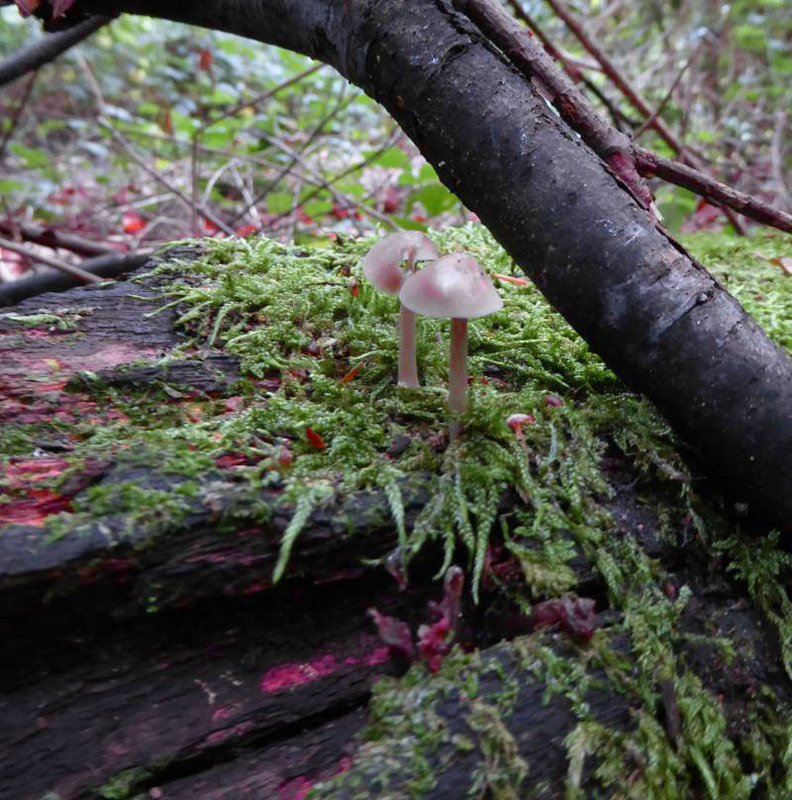 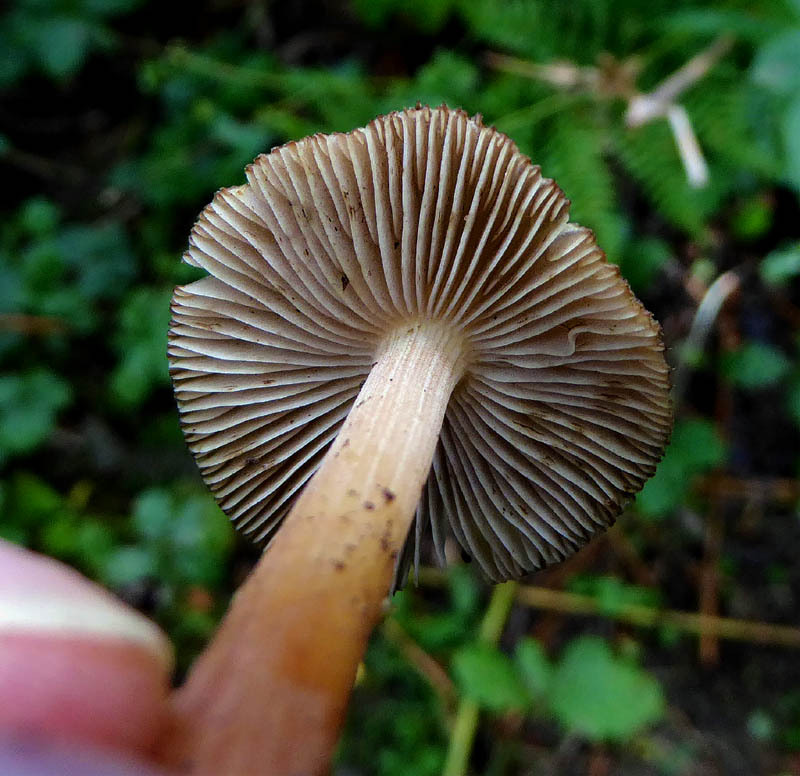 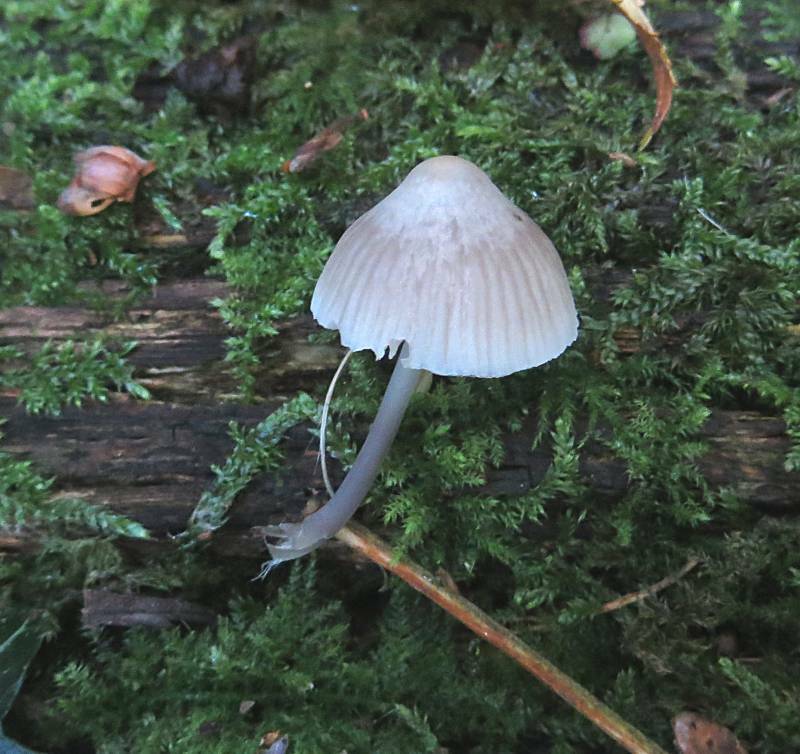 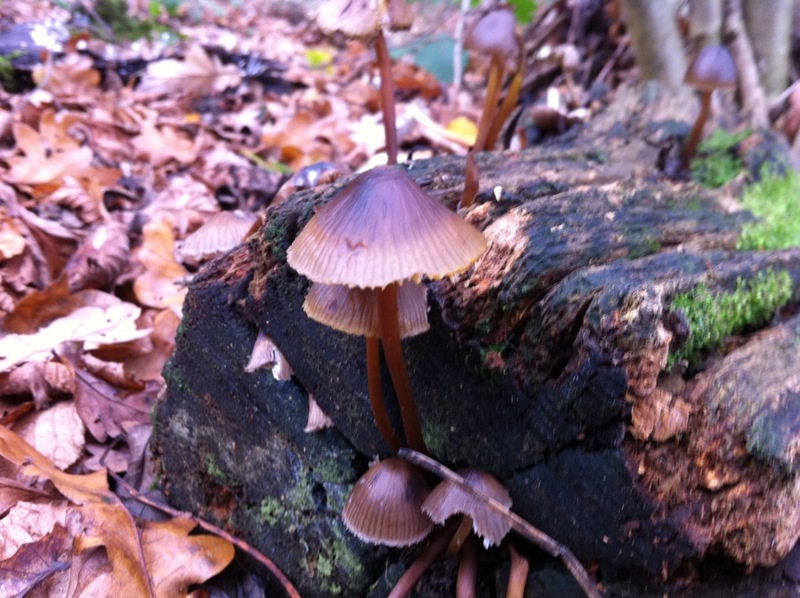 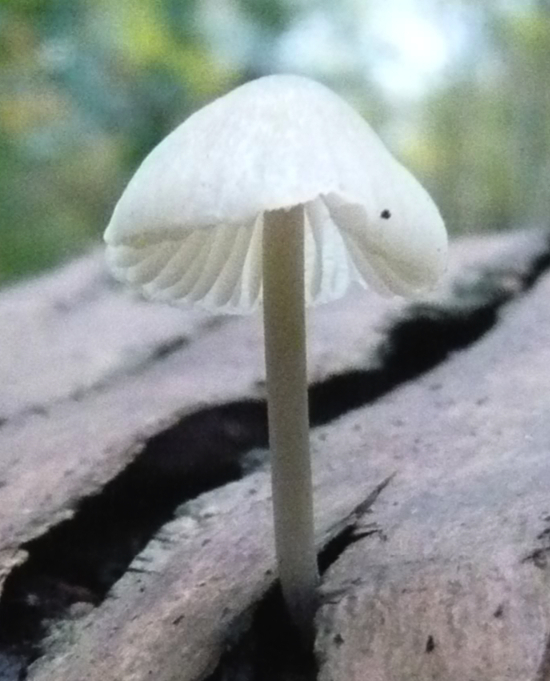 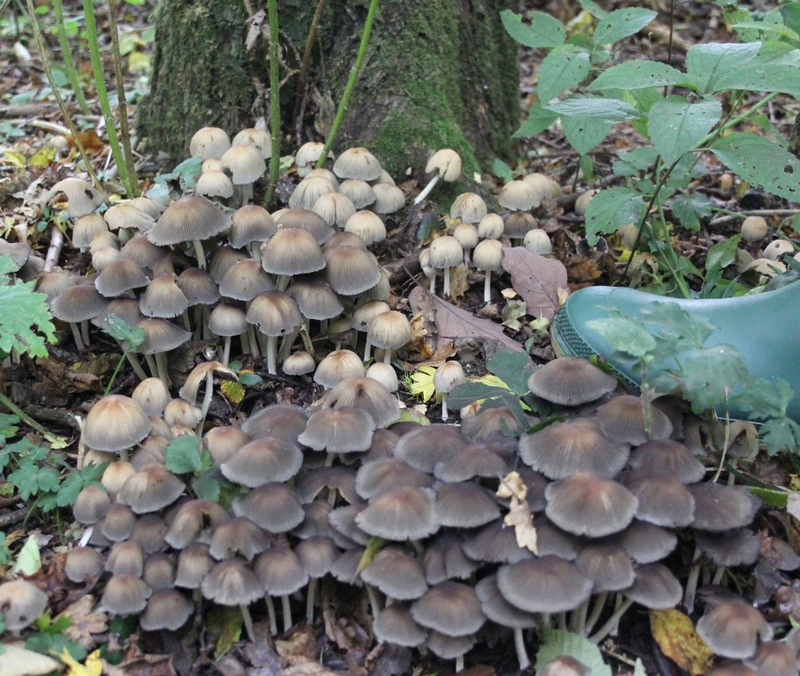 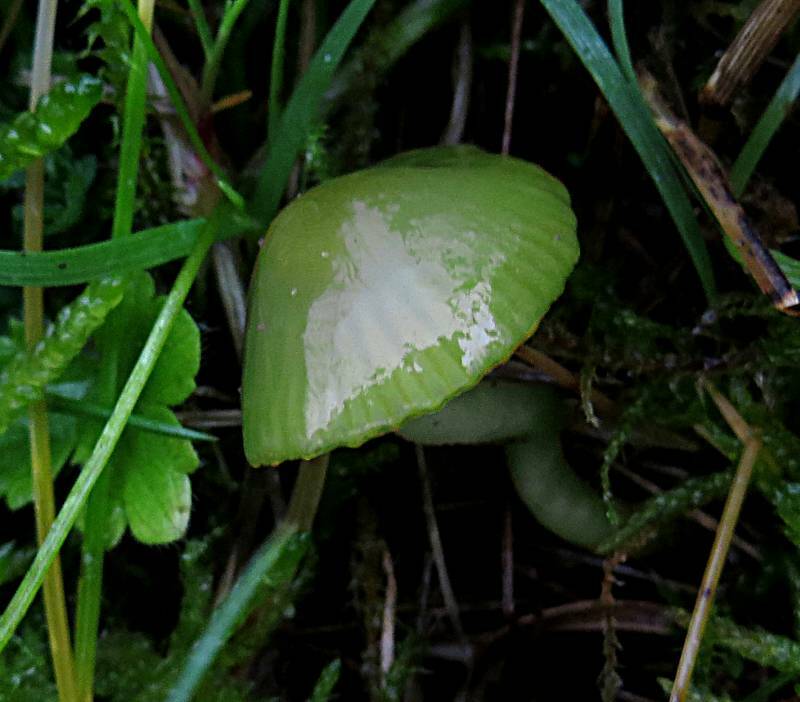 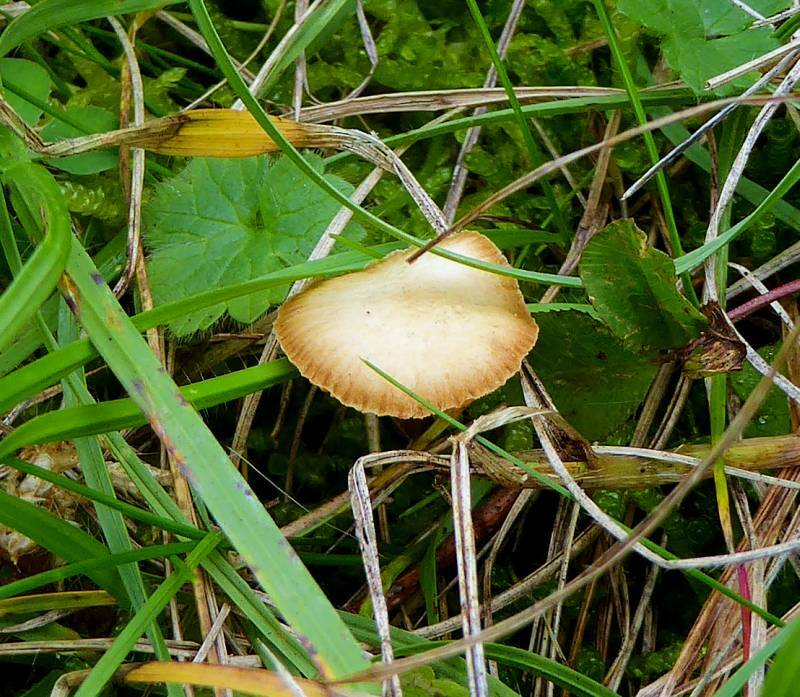 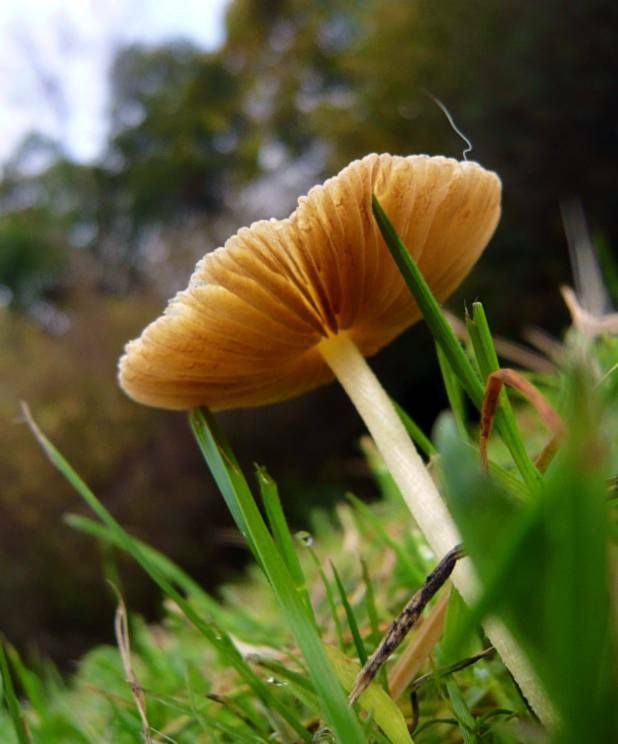 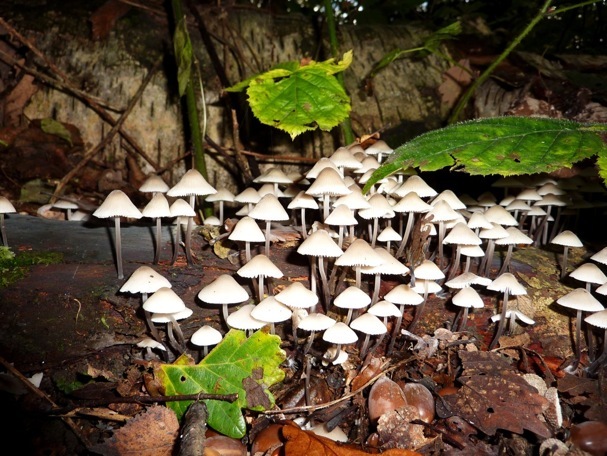 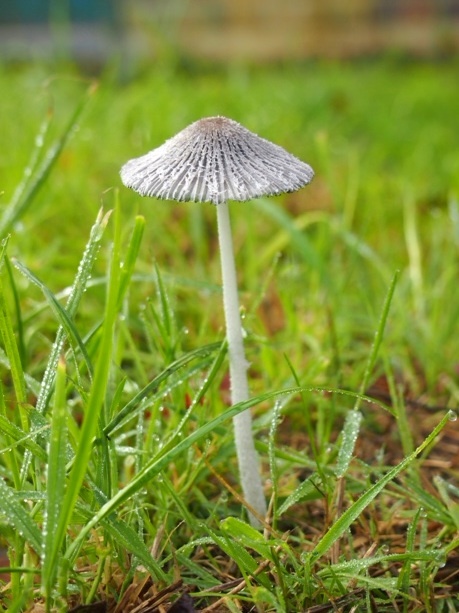 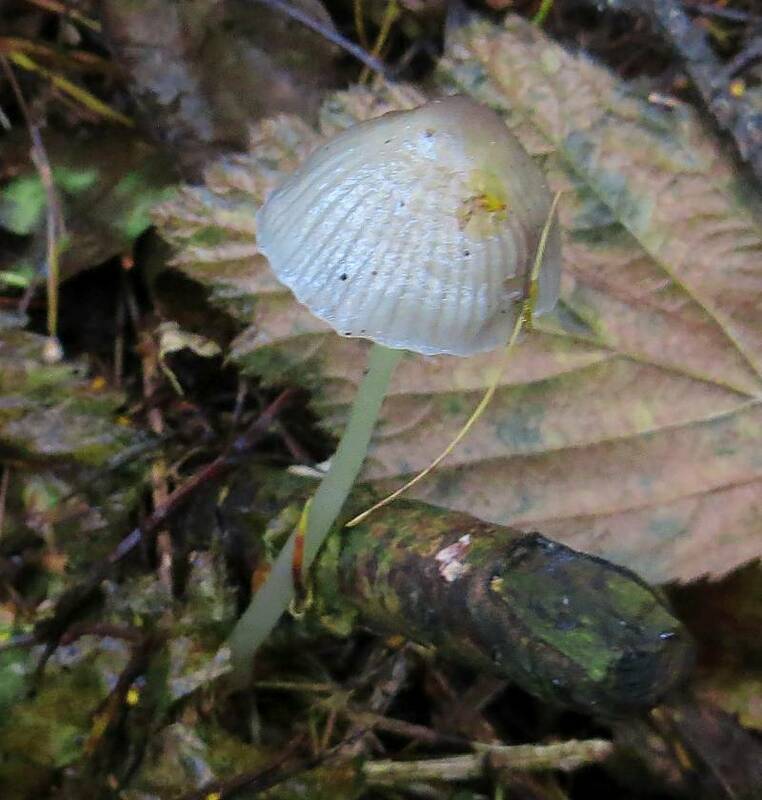 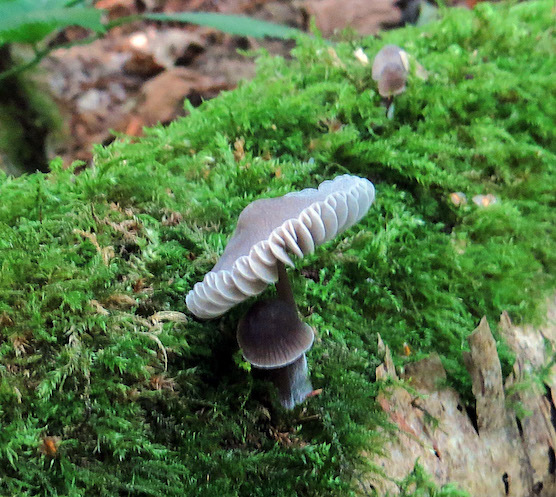 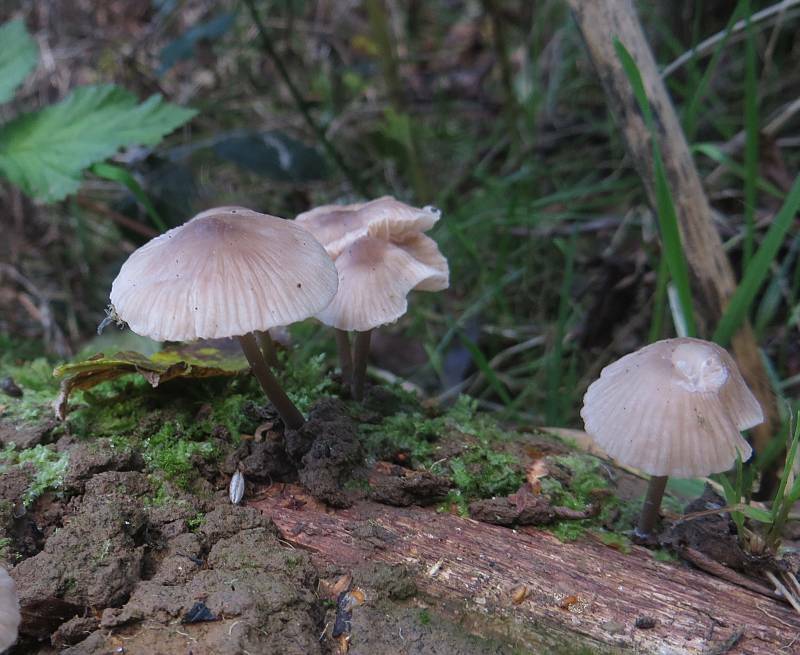 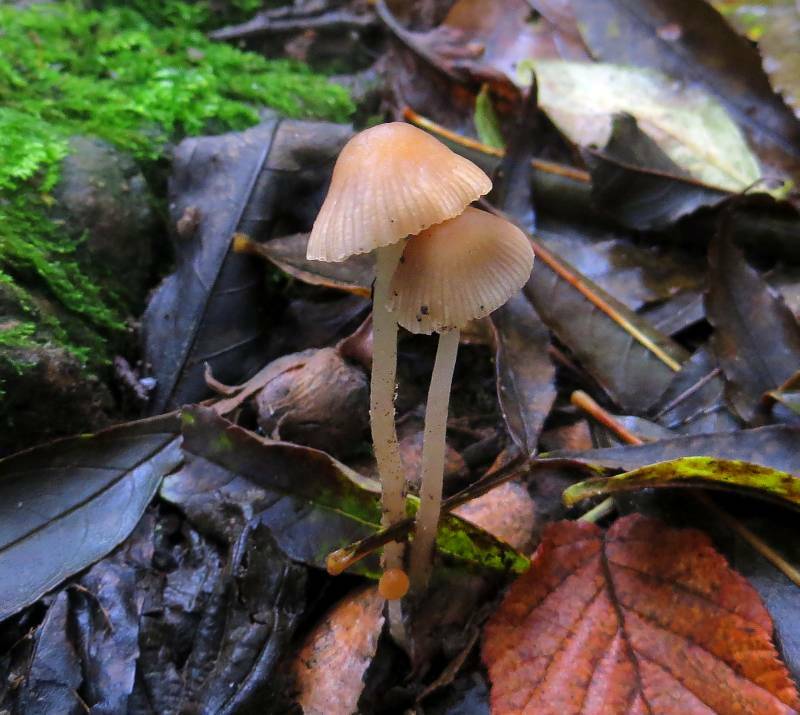 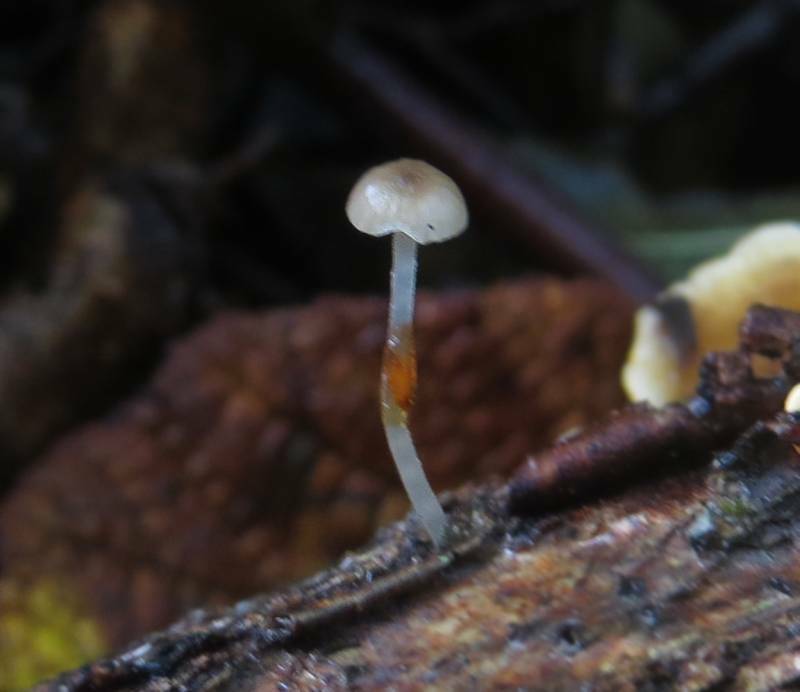 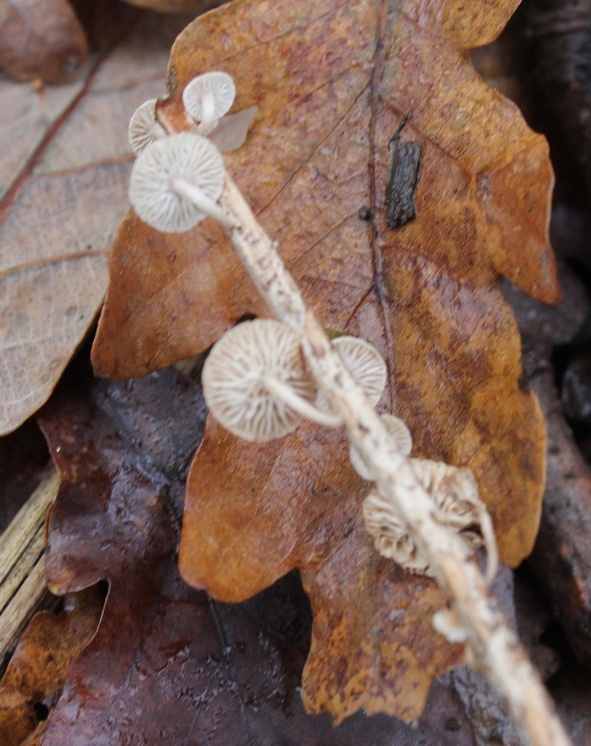 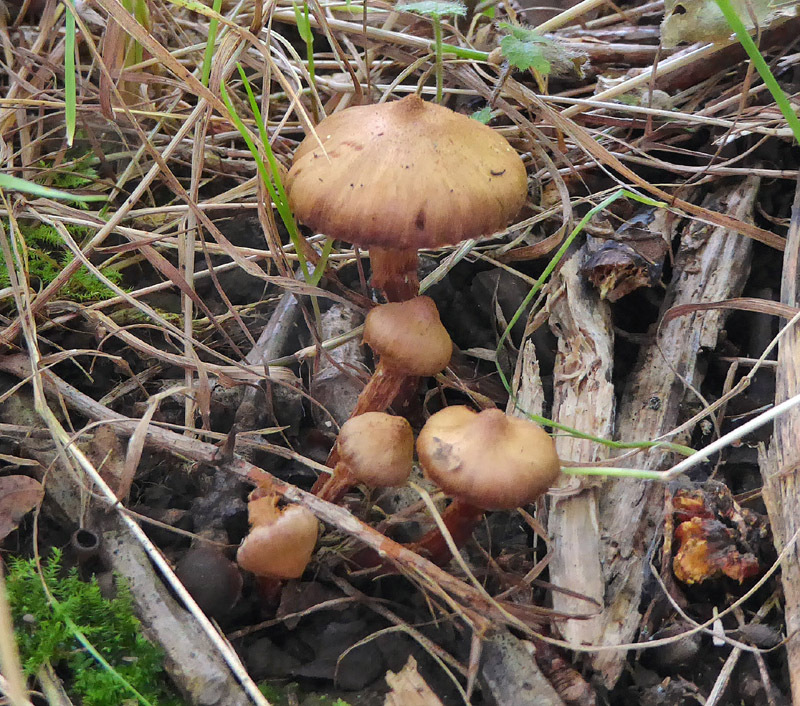 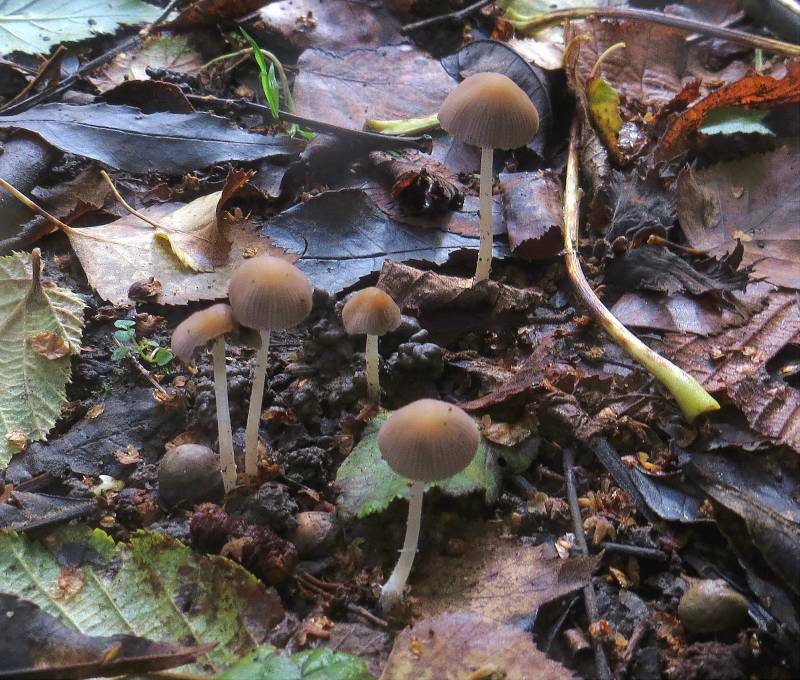 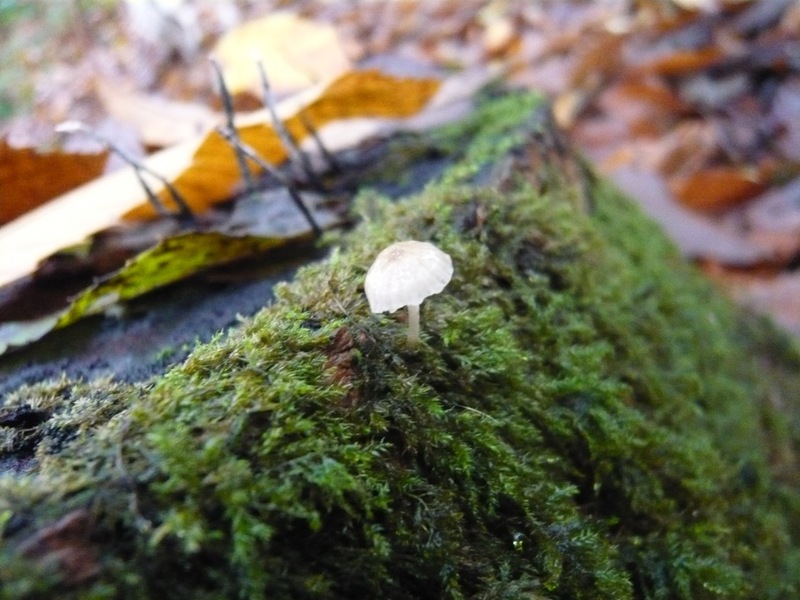 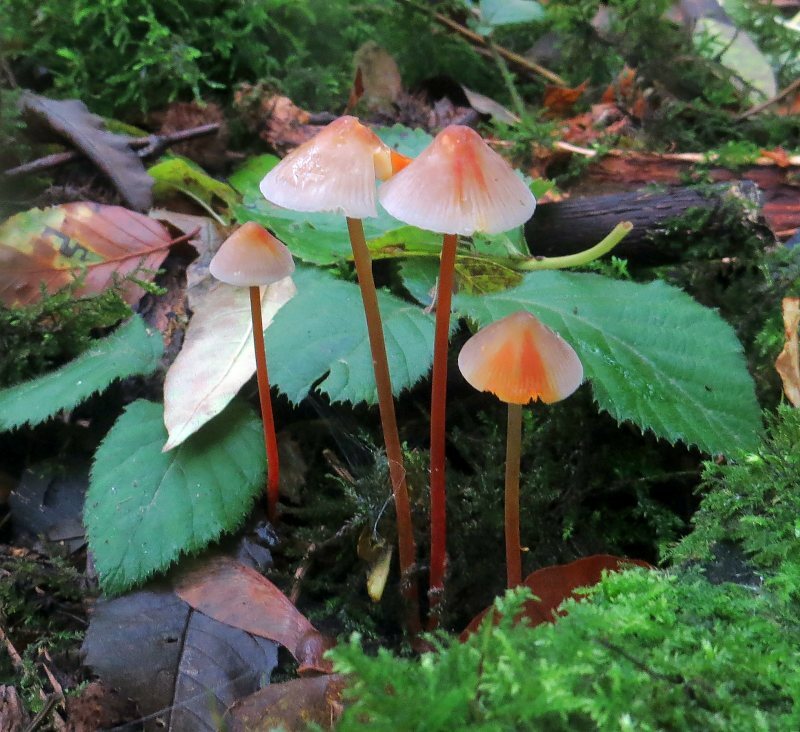 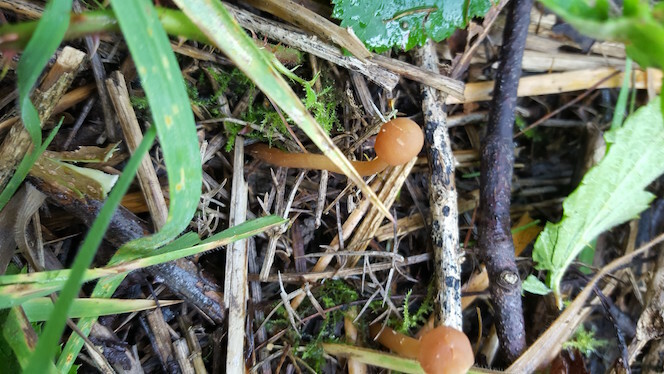 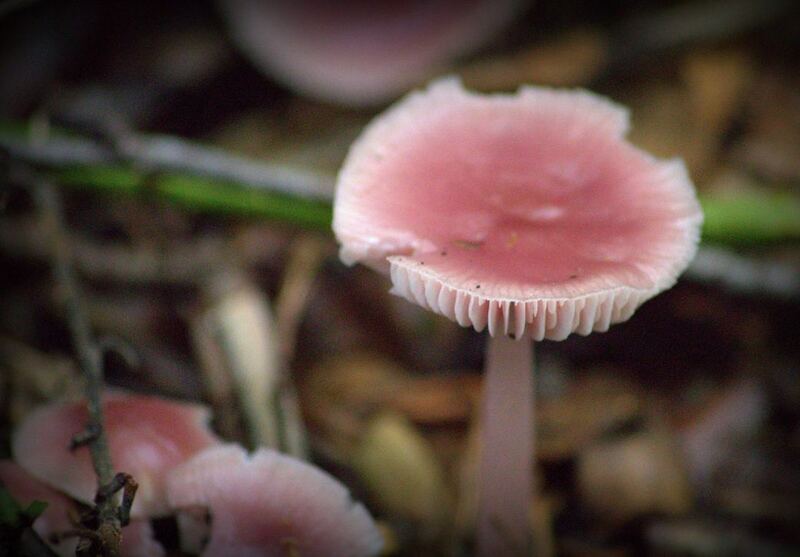 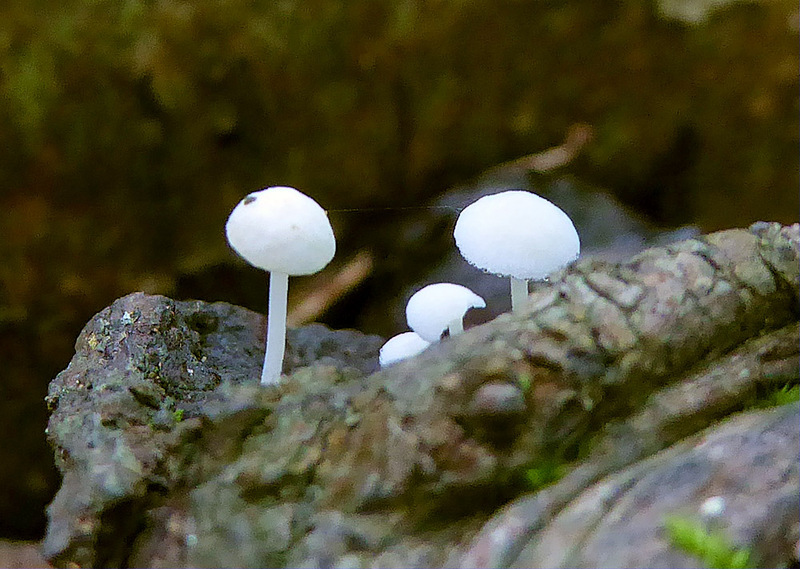 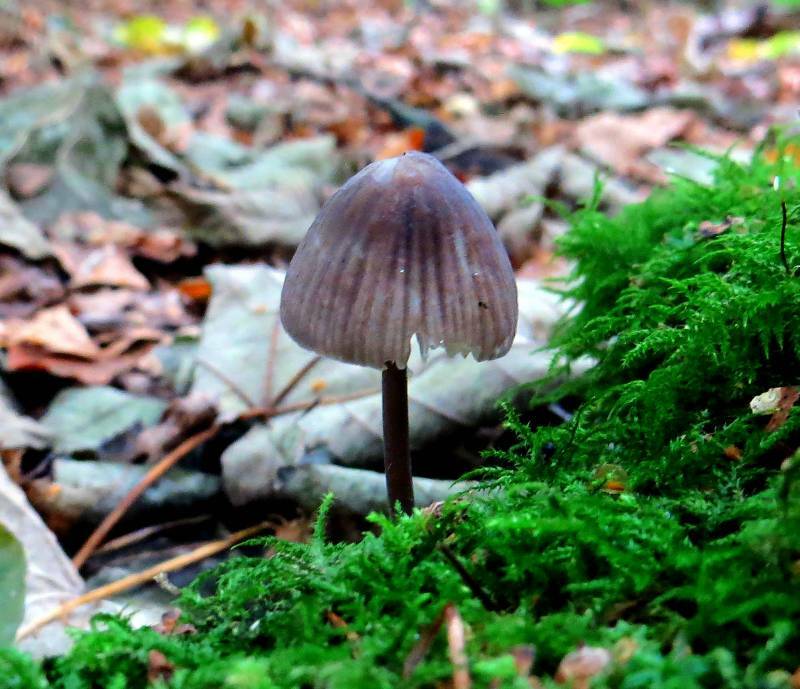 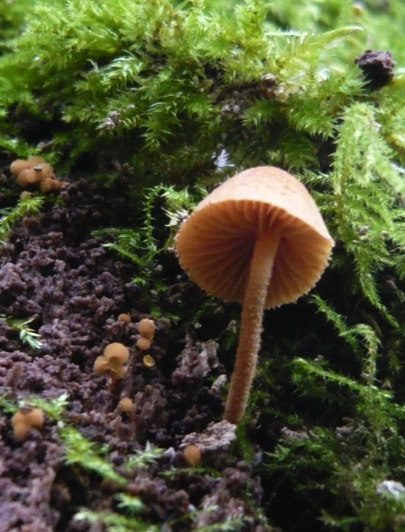 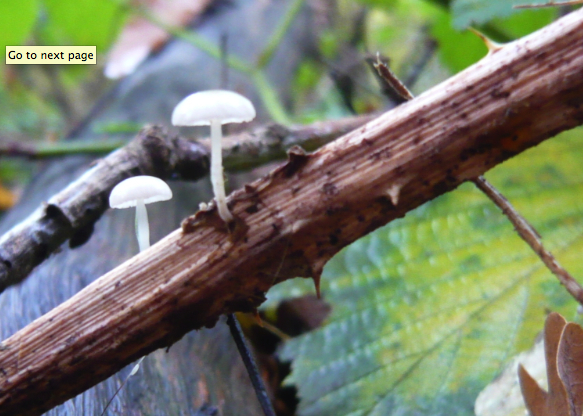 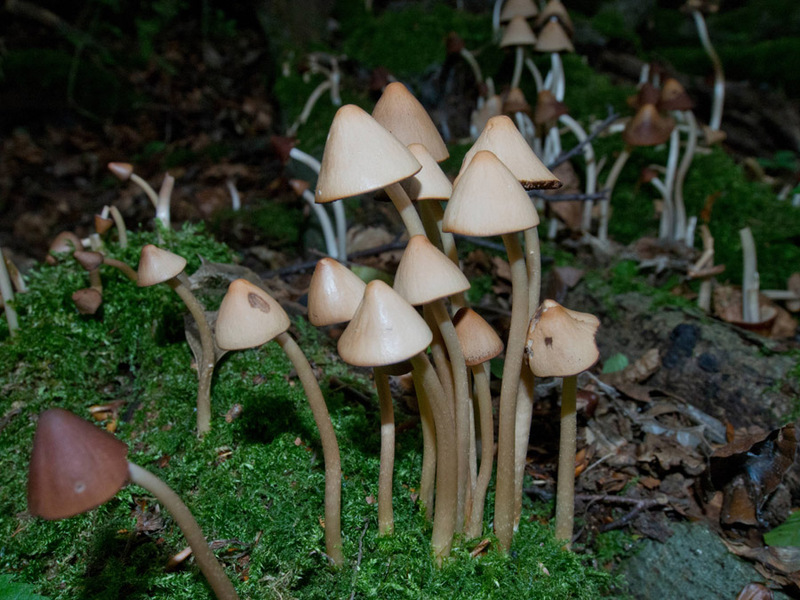 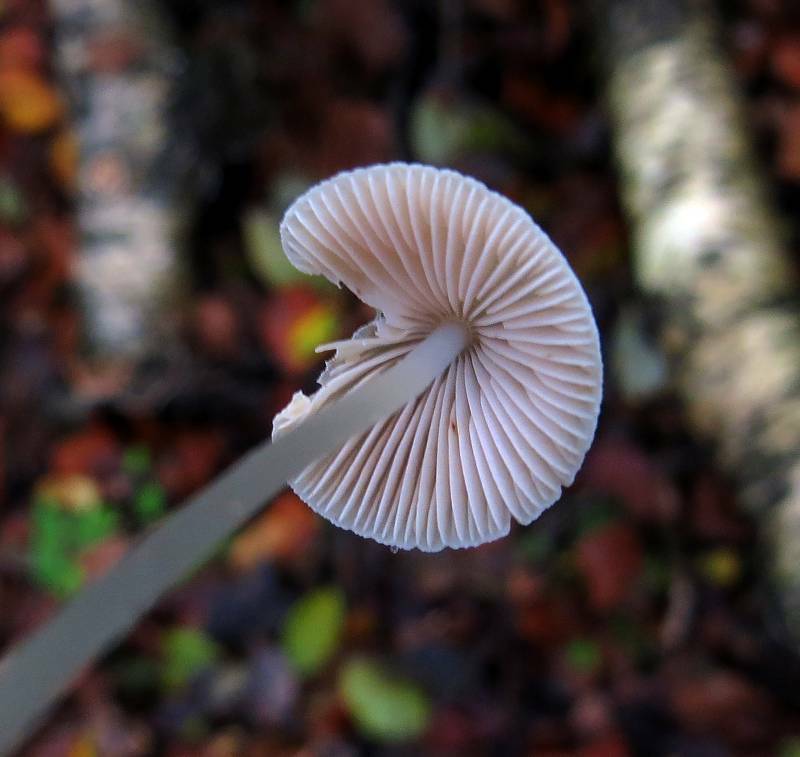 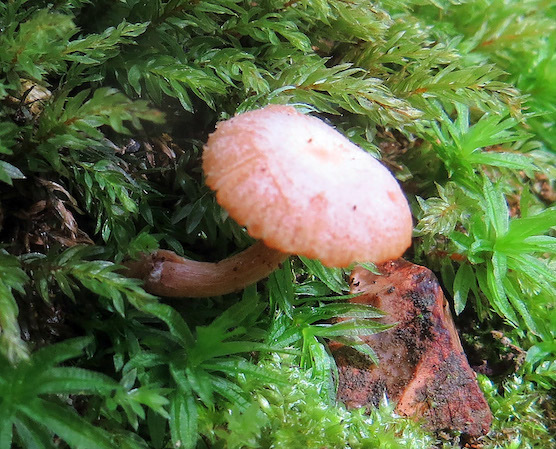 The Mycena are a large group with 52 species possible in the UK. 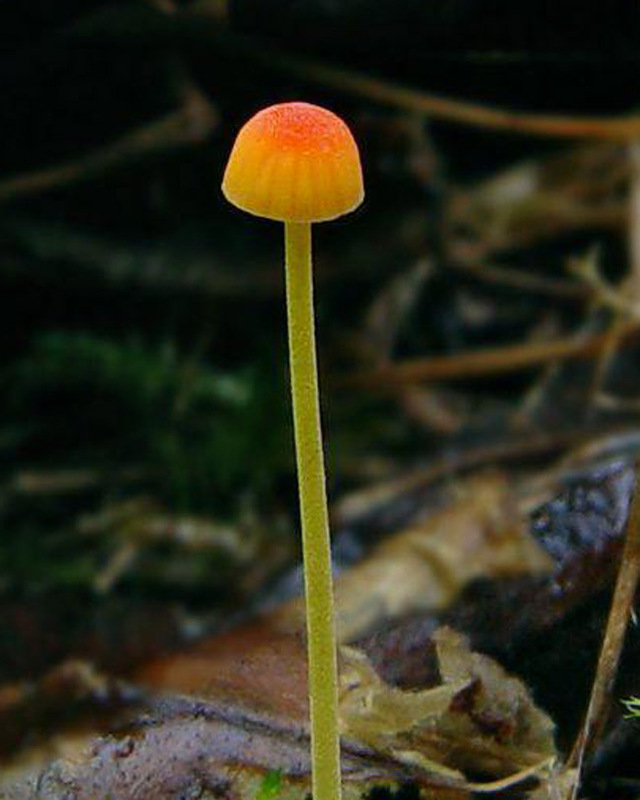 Many are so small they are very easy to miss even when very close. 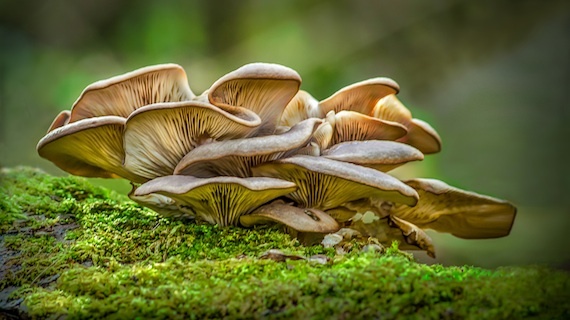 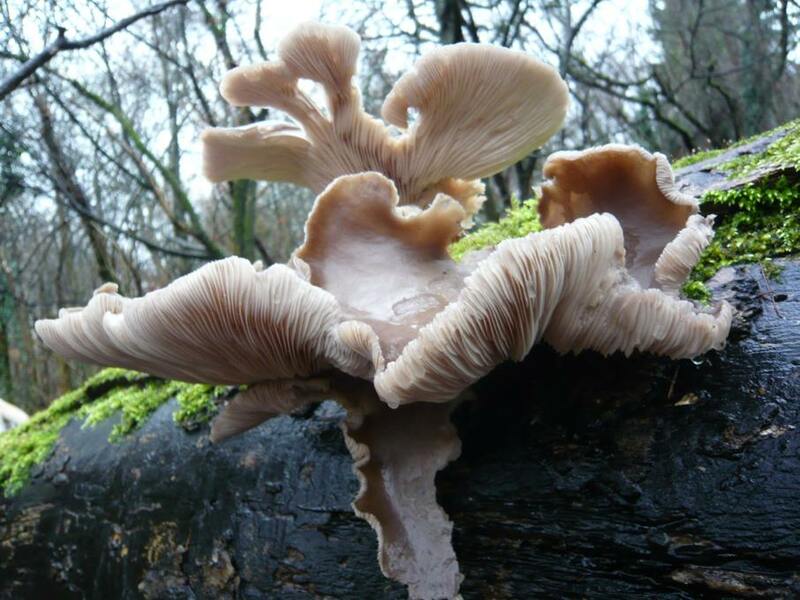 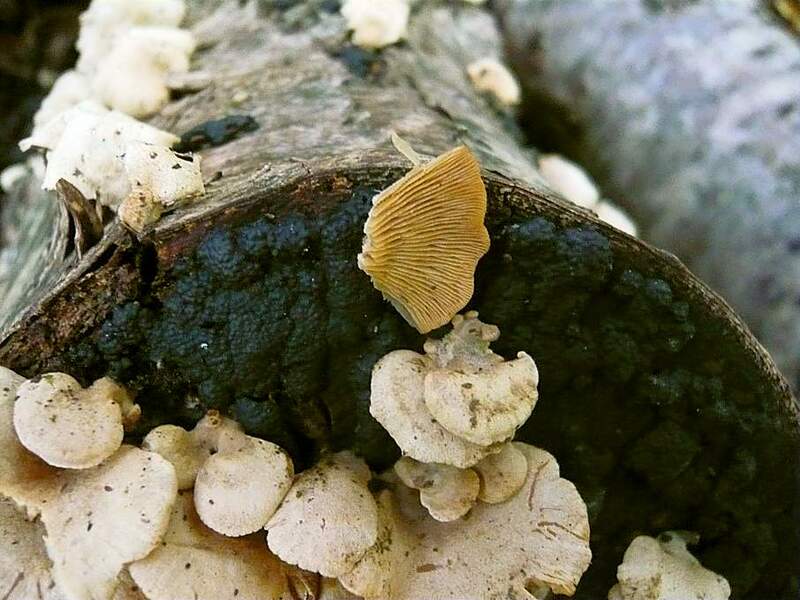 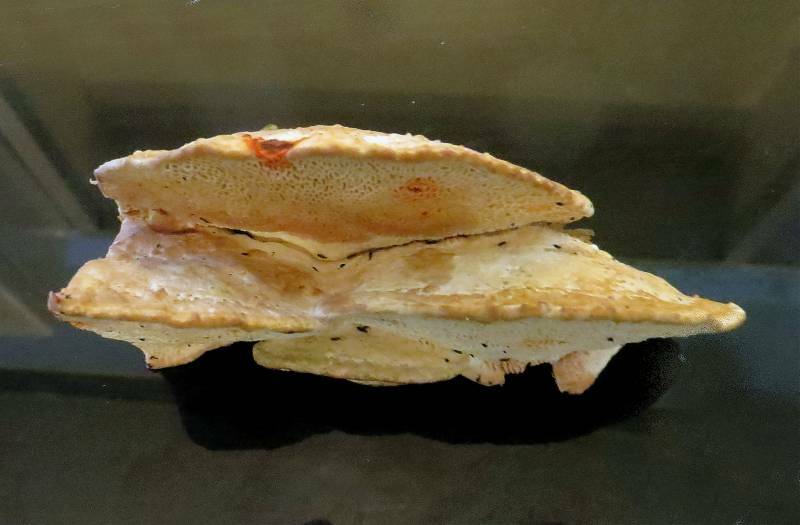 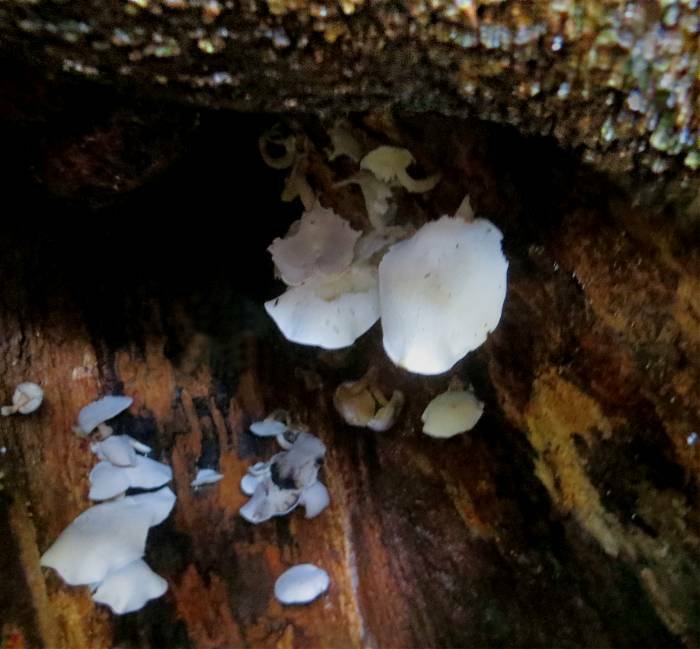 The Pleurotus are the Oyster Mushrooms, but only one is the true Oyster Mushroom, P. ostreatus, that species name derived from ostrea, the Latin for oyster. 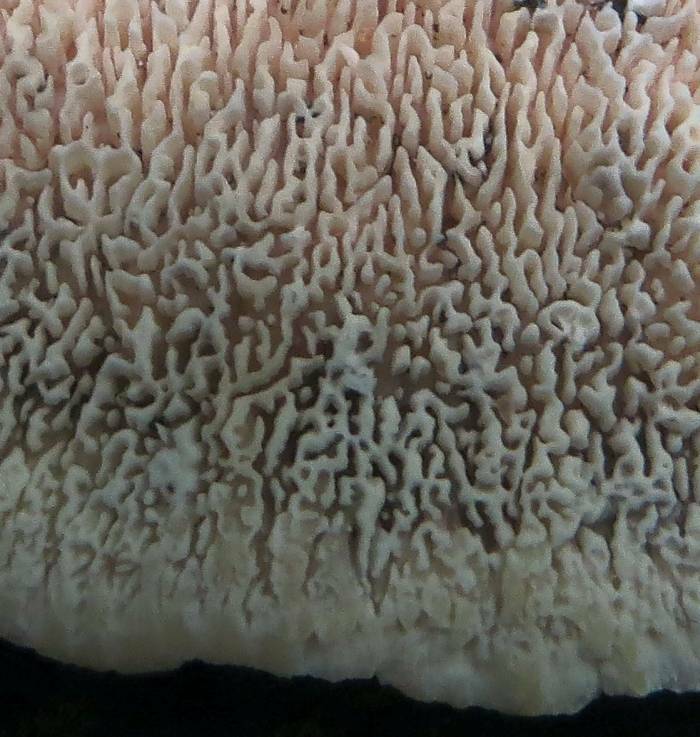 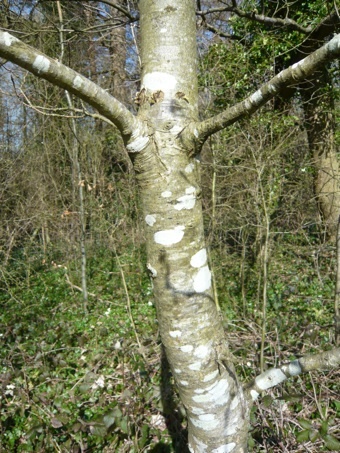 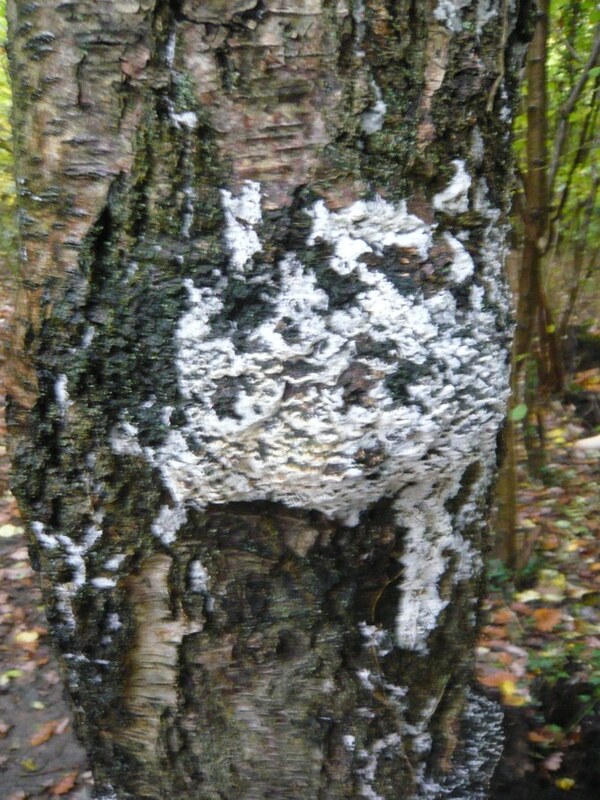 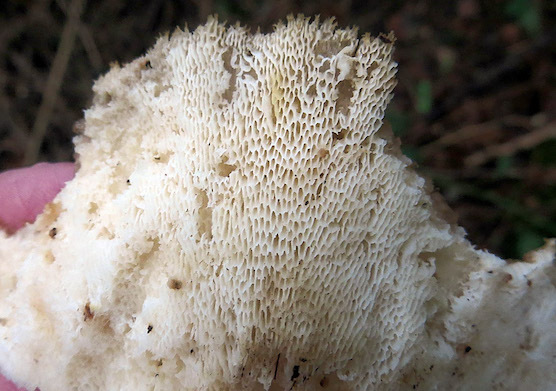 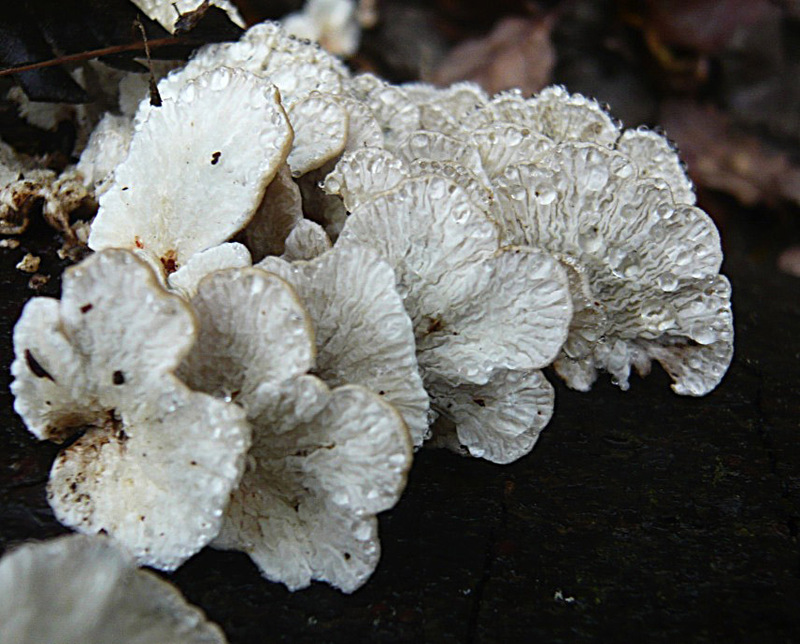 Since the white gilled appearance reminded of lung tissue, the family name is derived from pleura, the lung outer membrane, and the P. pulmonarius name of the all-white large species is derived from pulmonary, pertaining to lungs. 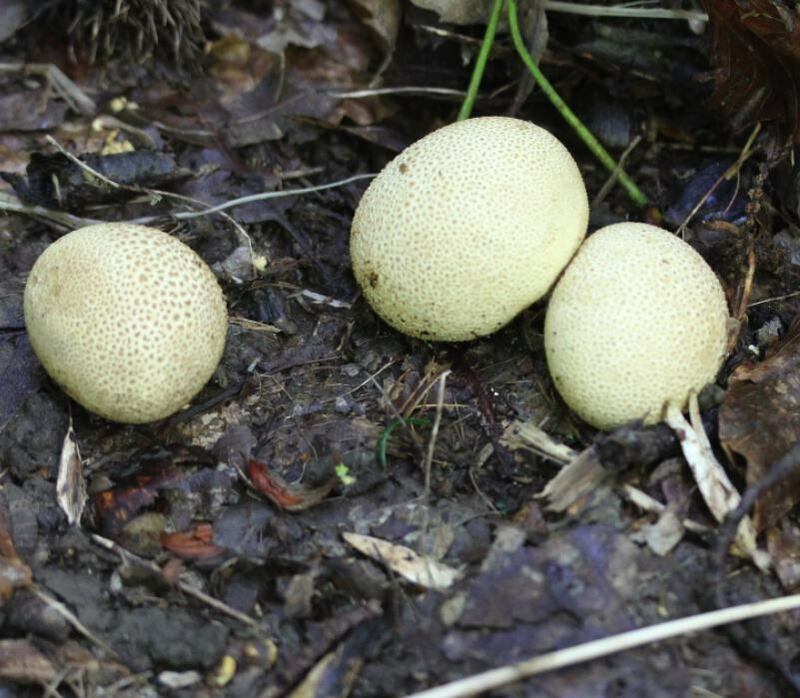 The majority of the Rs are Russulas. 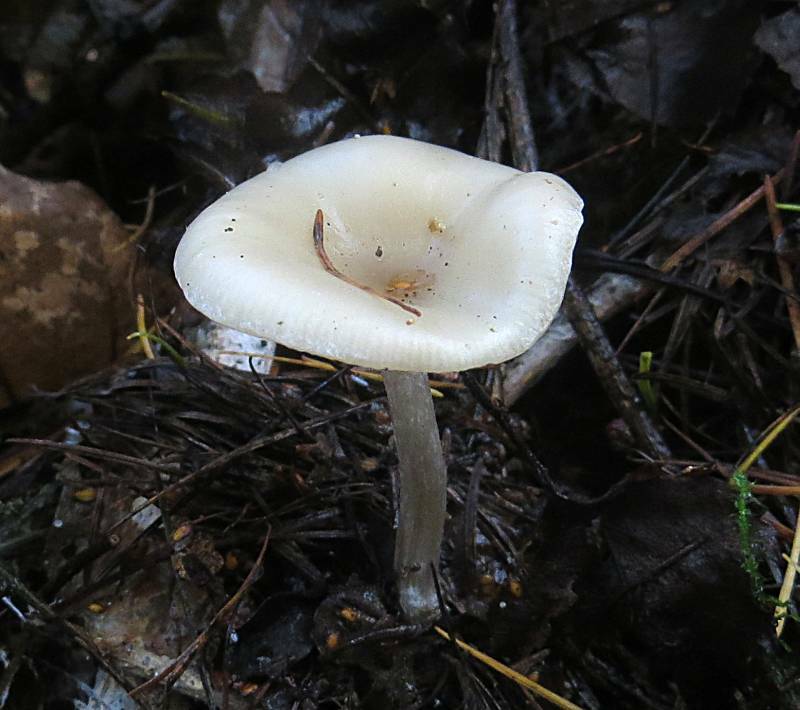 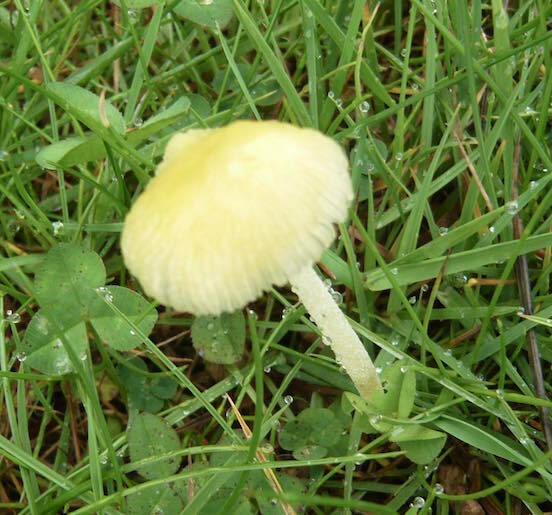 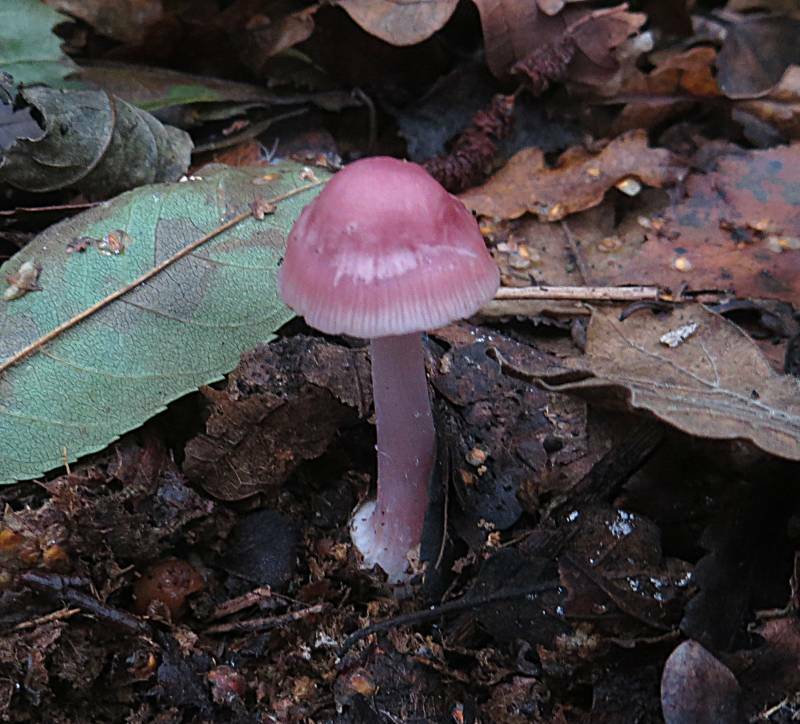 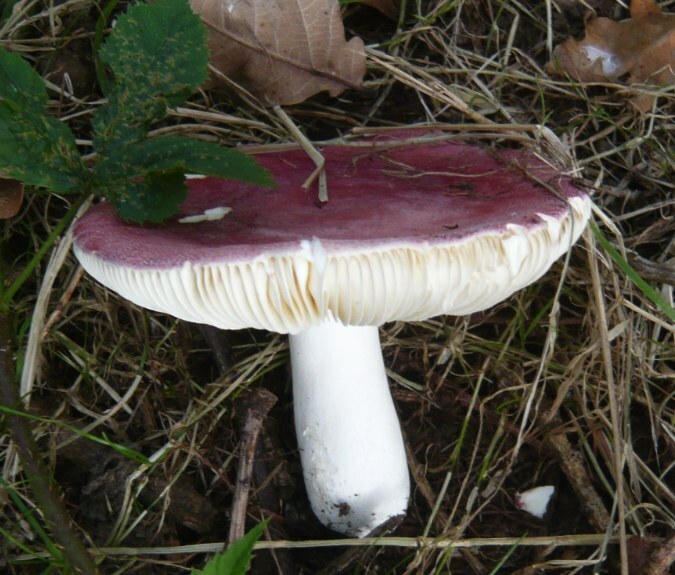 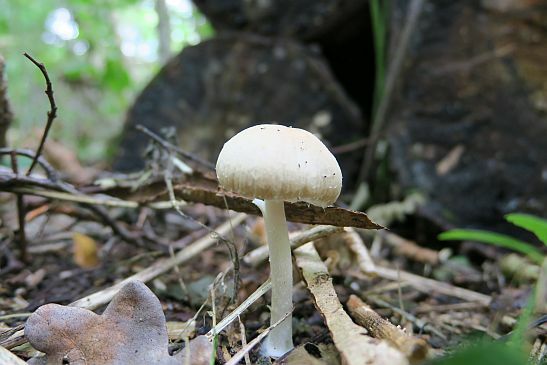 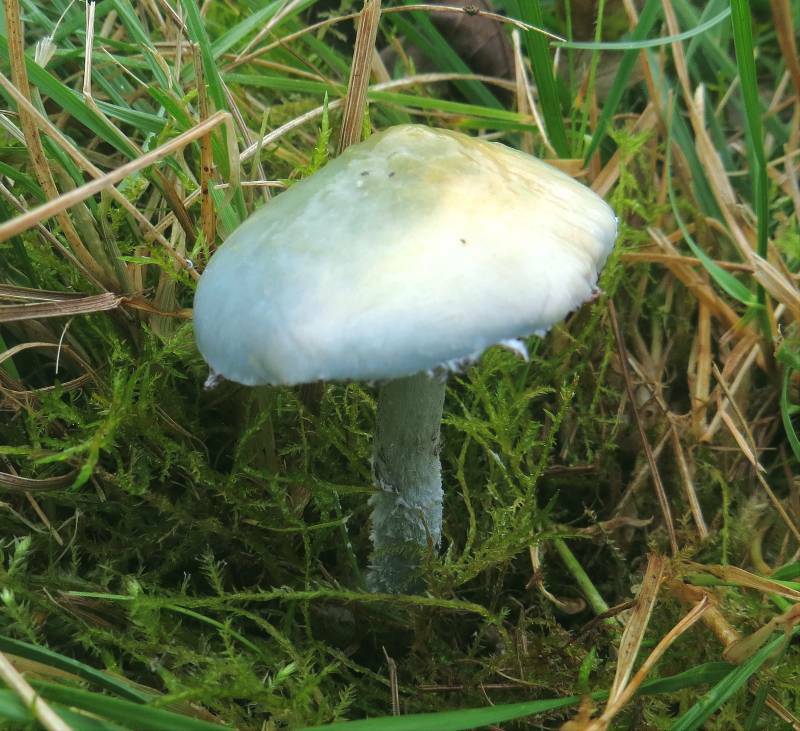 This a large family of 112 species, often with very colourful caps including red, green, purple and yellow, but always with very white flesh. 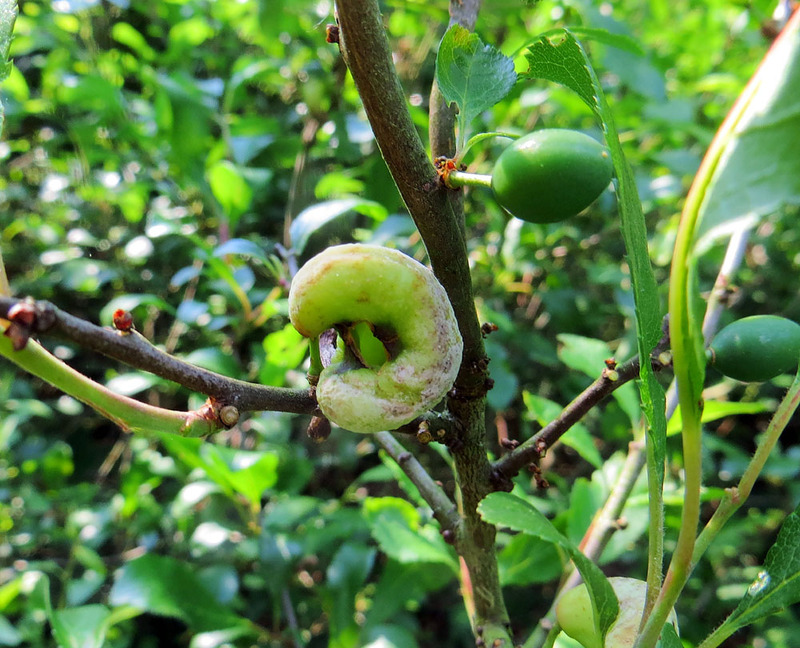 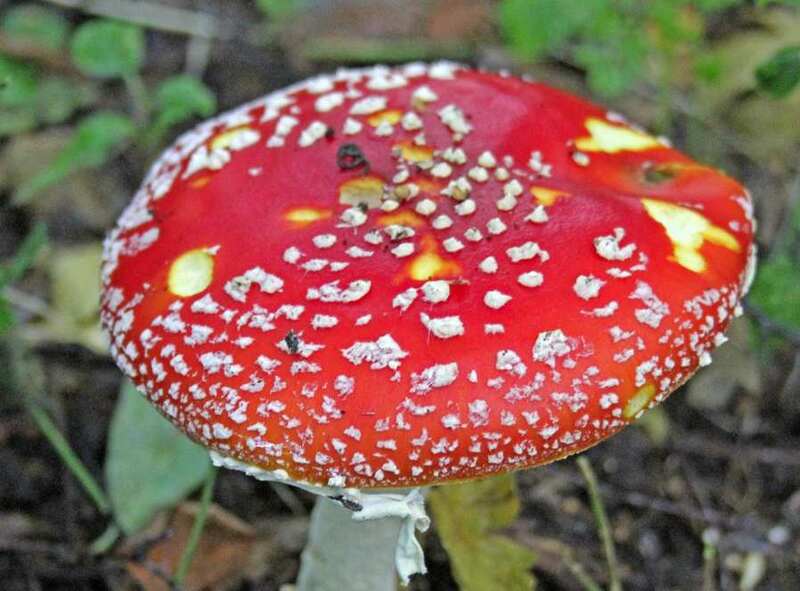 Many are edible and good, but some not and a few are poisonous. 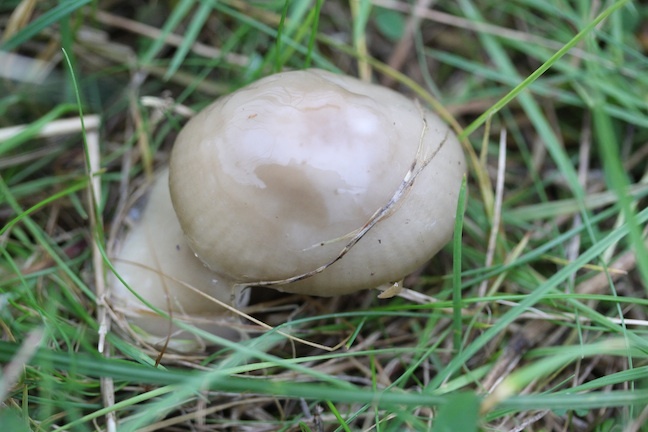 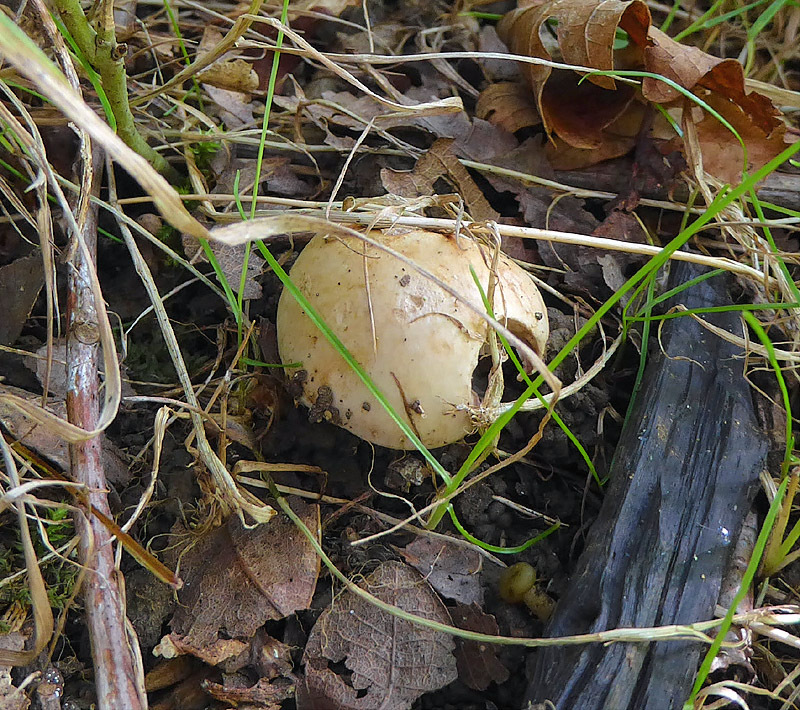 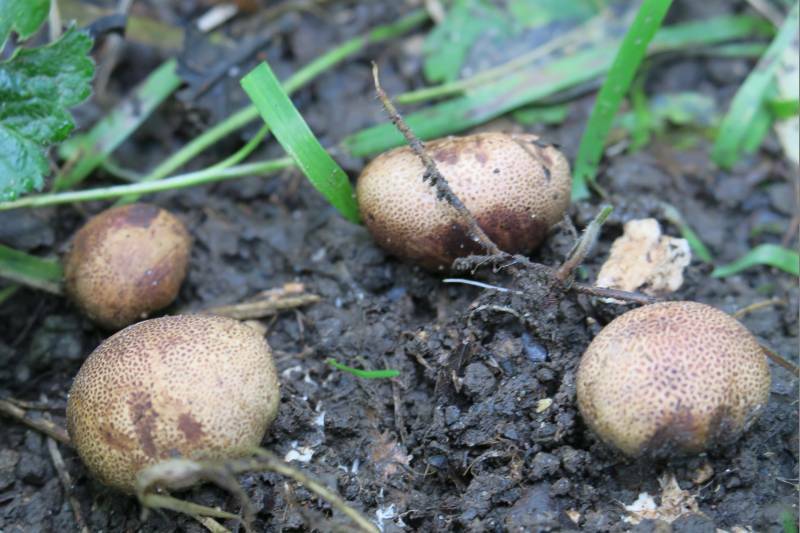 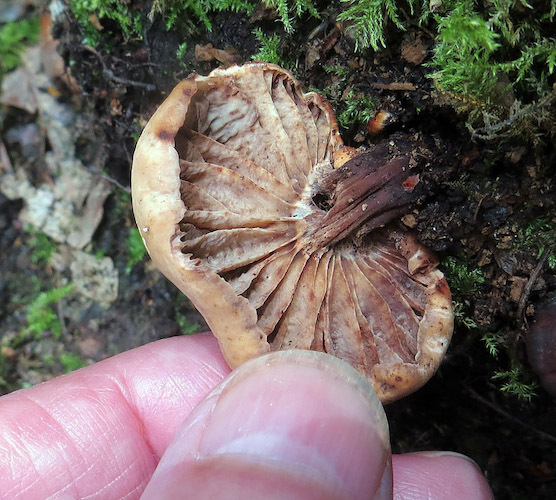 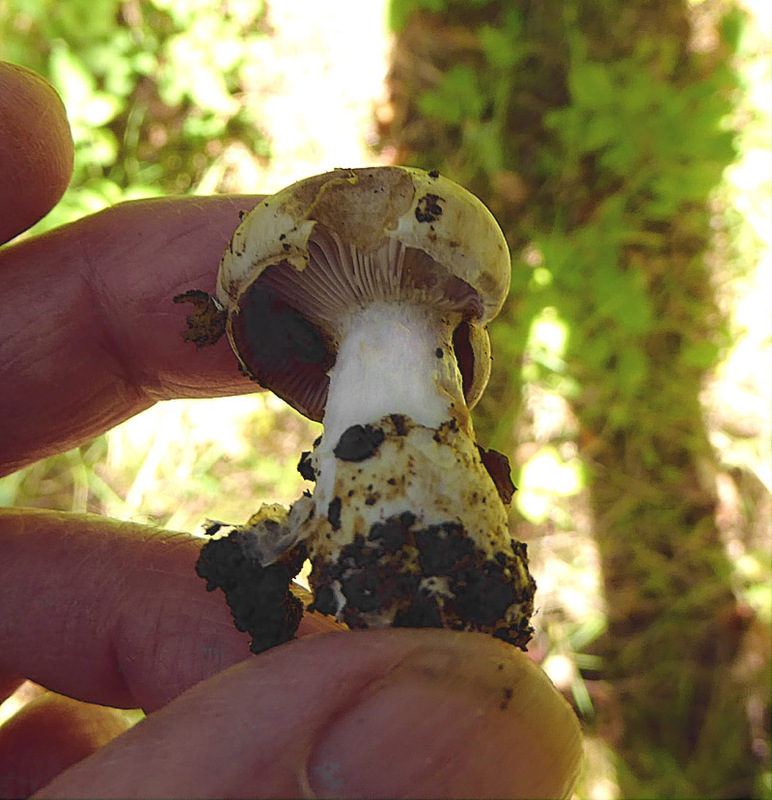 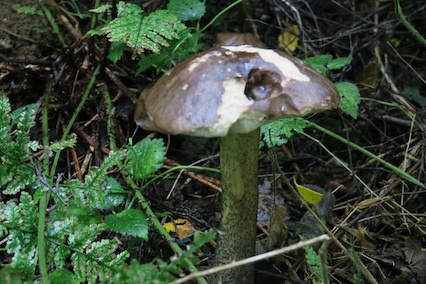 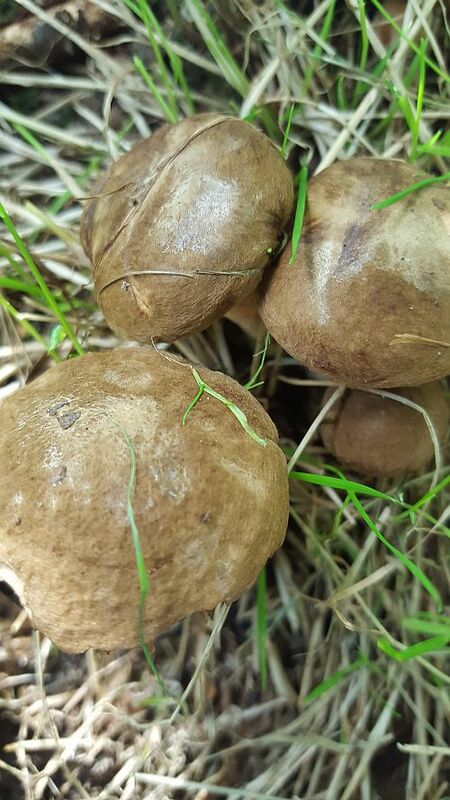 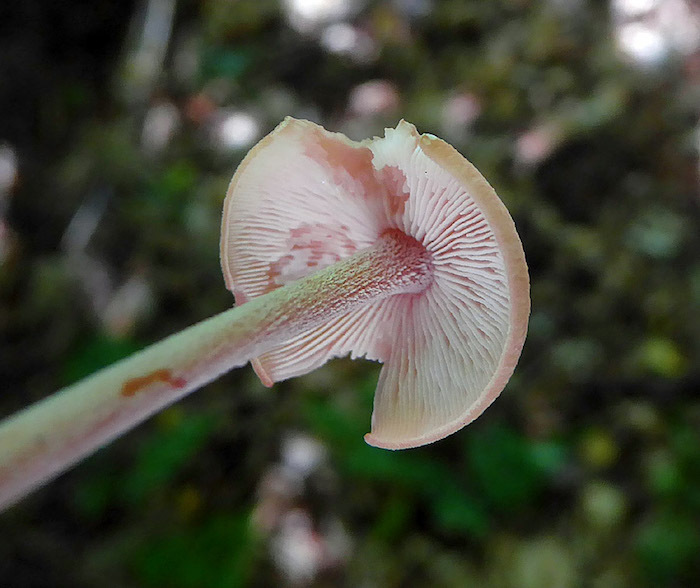 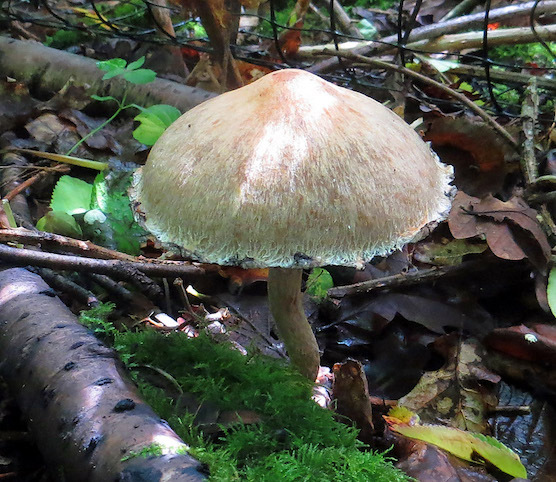 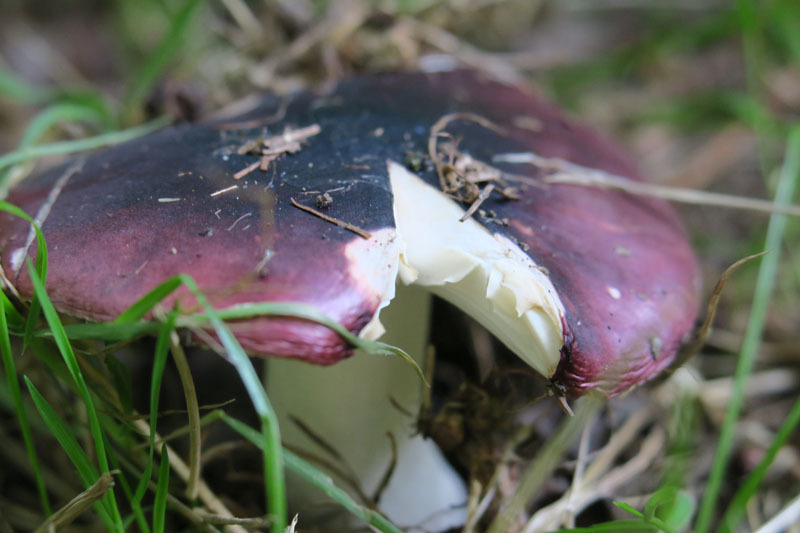 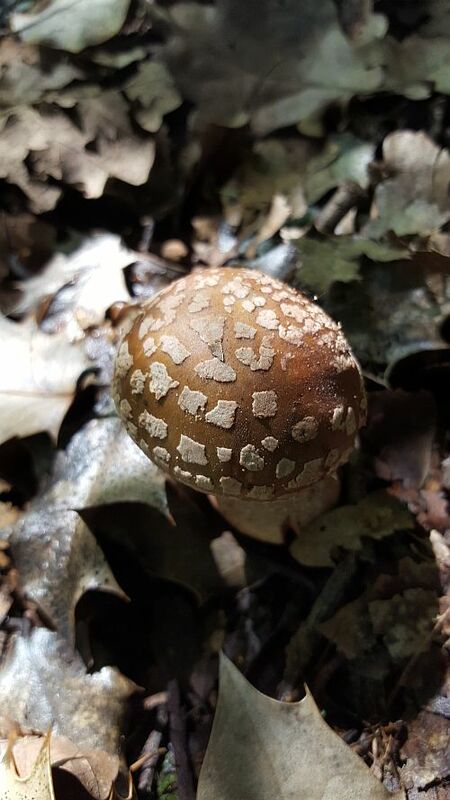 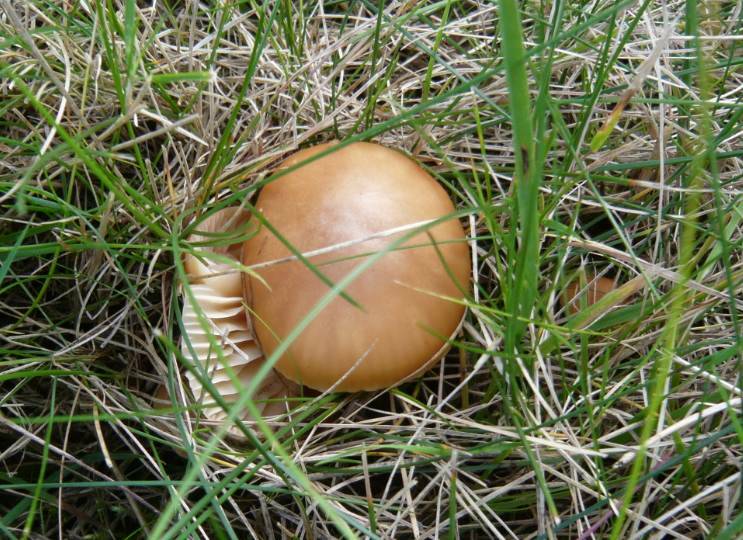 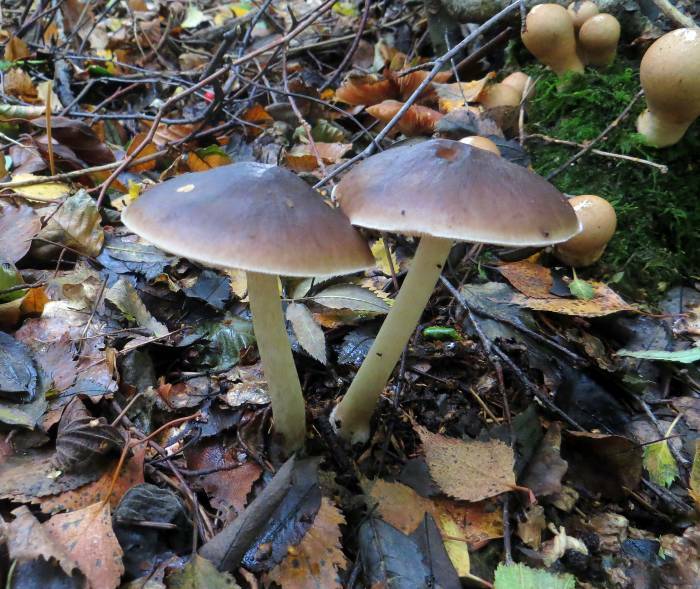 For full identification, tasting, smelling, cap skin peeling and spore printing are necessary and, even then, definite identification of Russulas is impossible without advanced microscopy by a specialist researcher of the family. 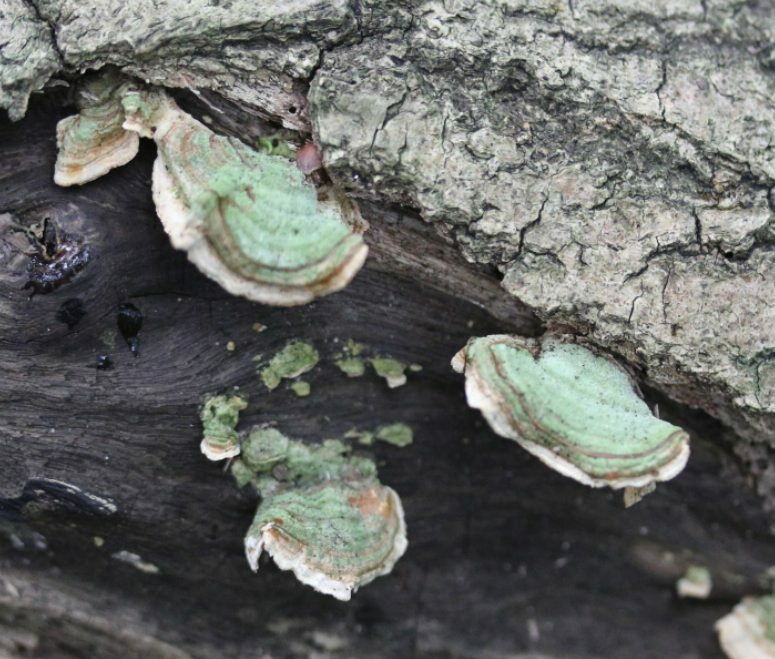 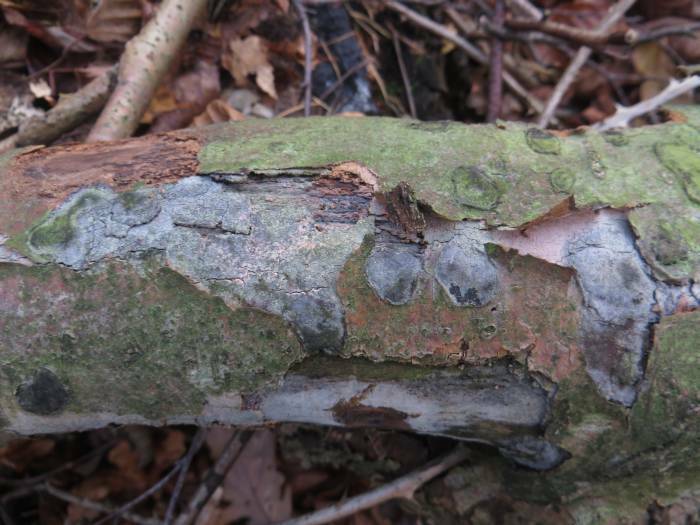 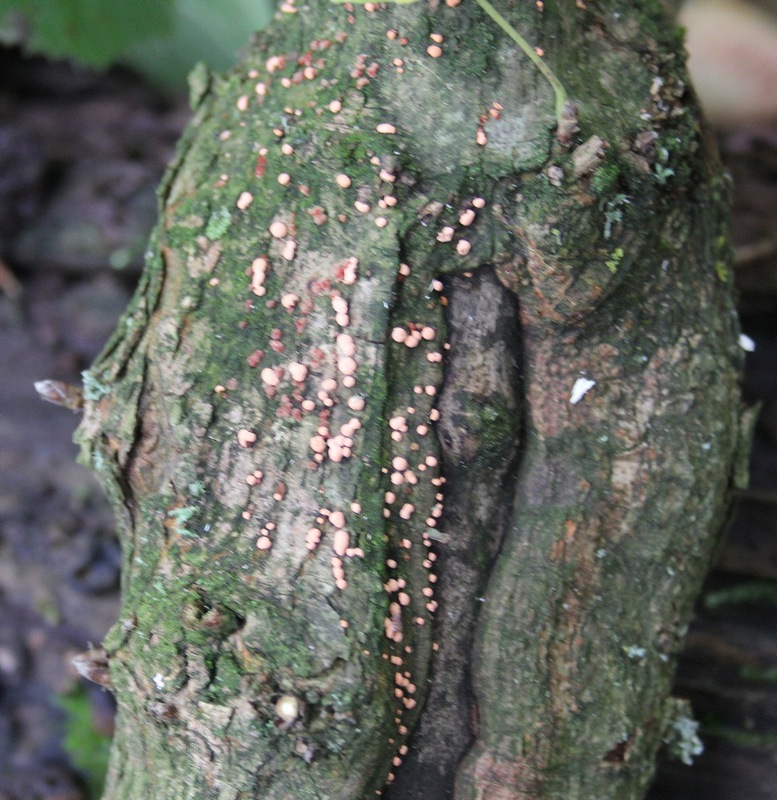 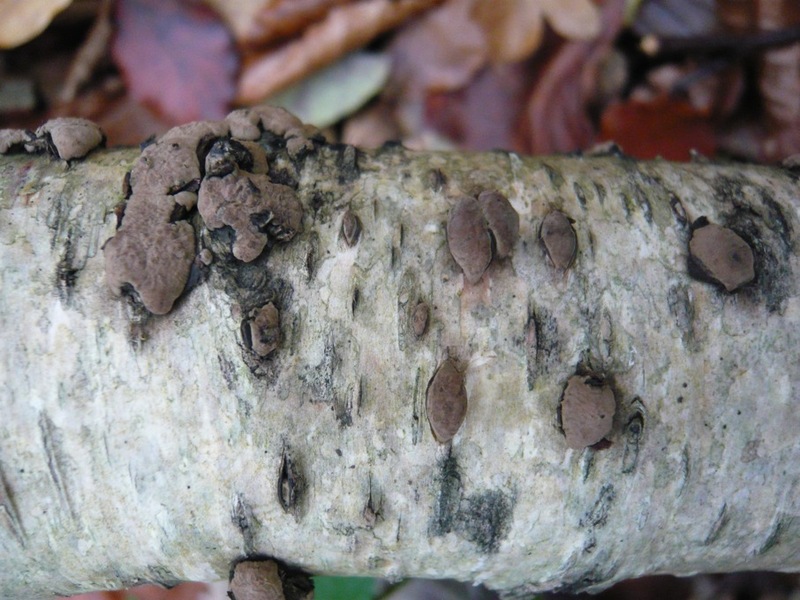 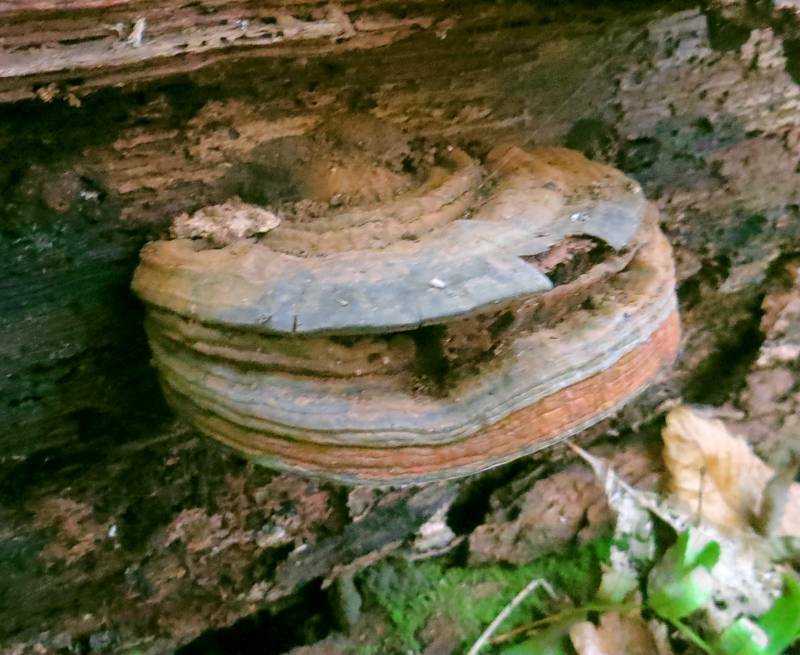 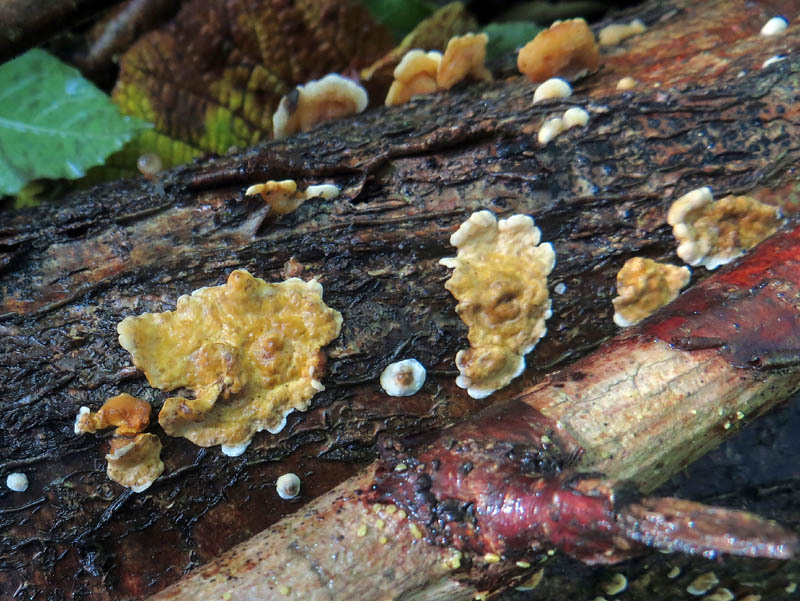 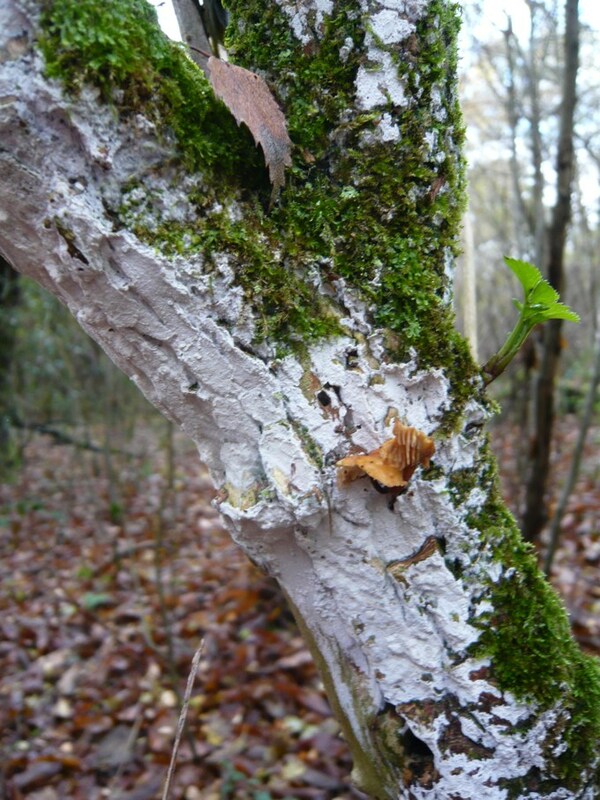 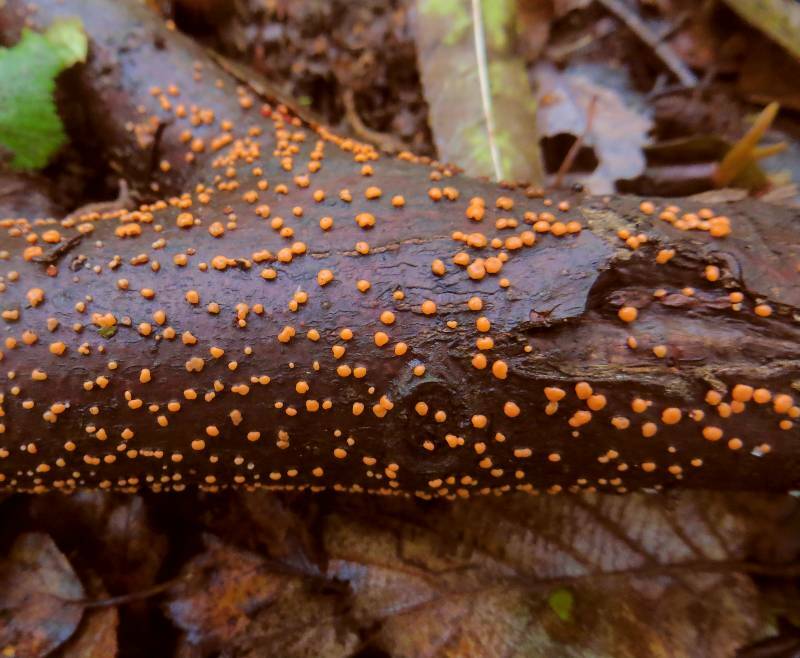 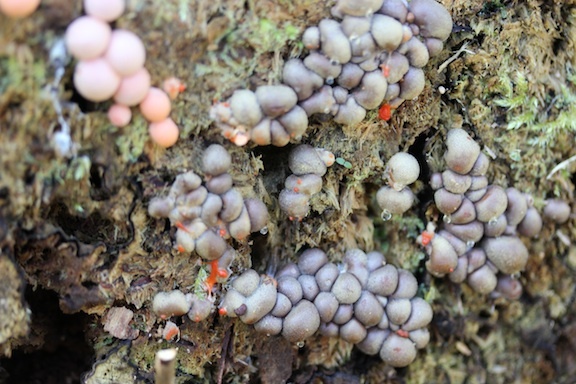 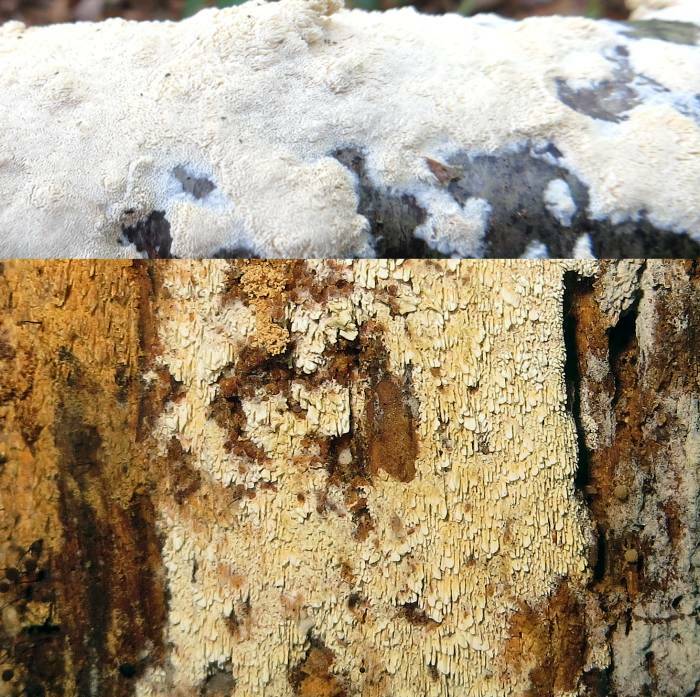 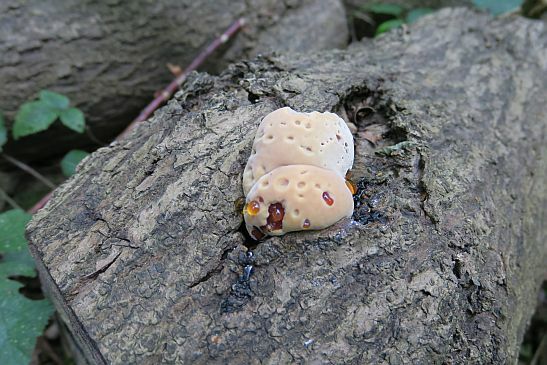 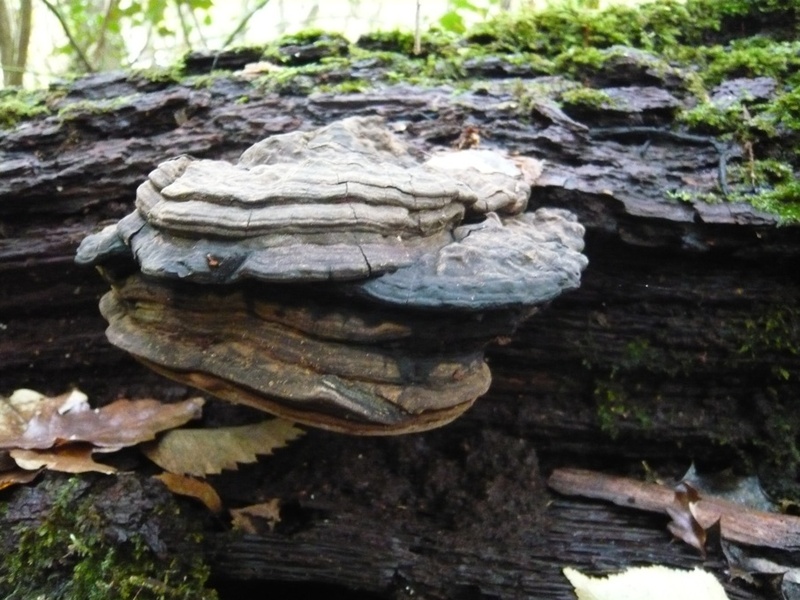 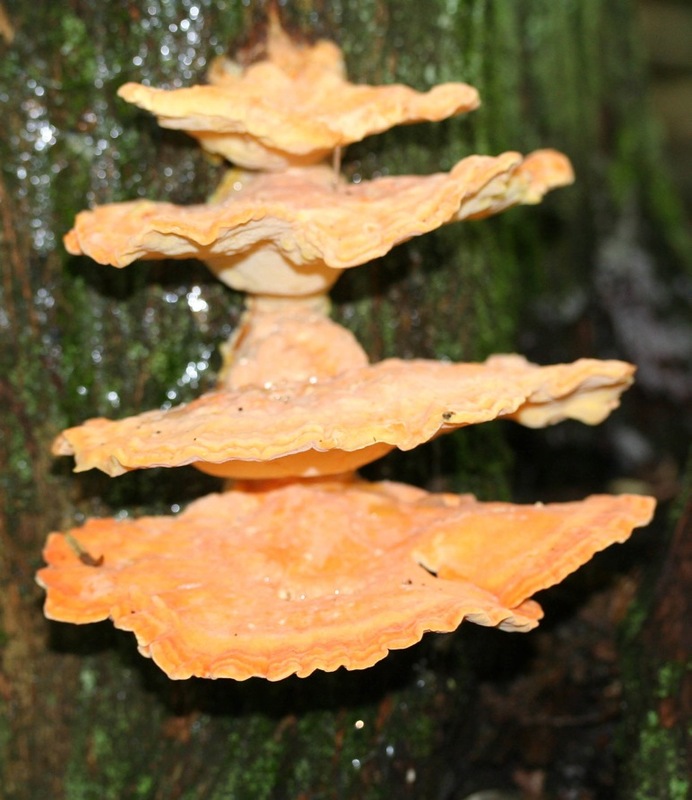 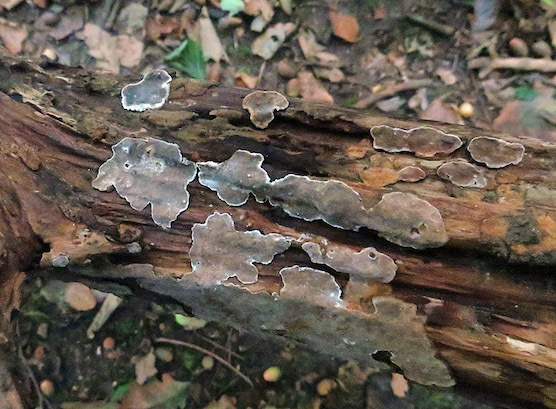 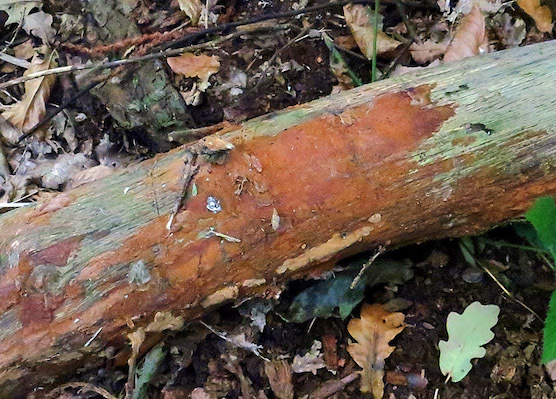 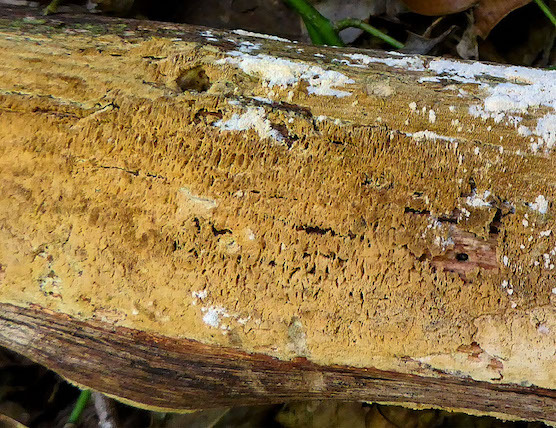 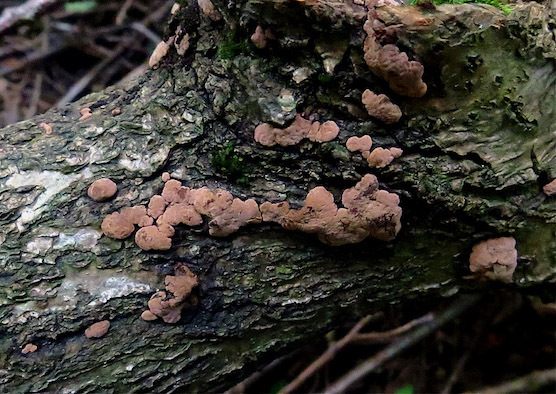 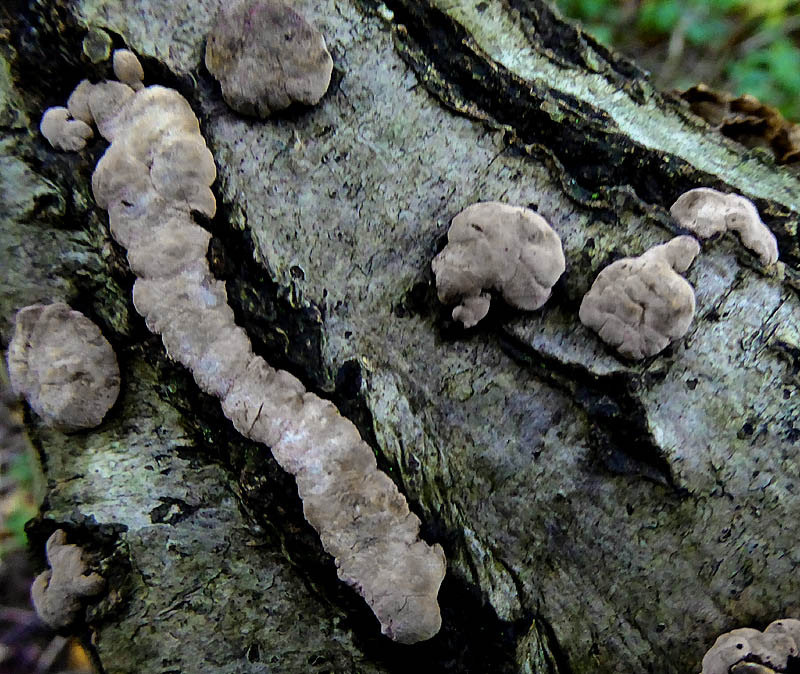 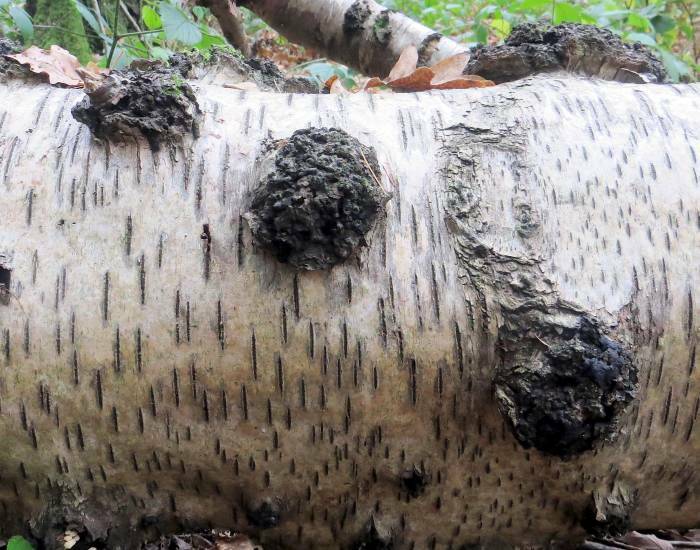 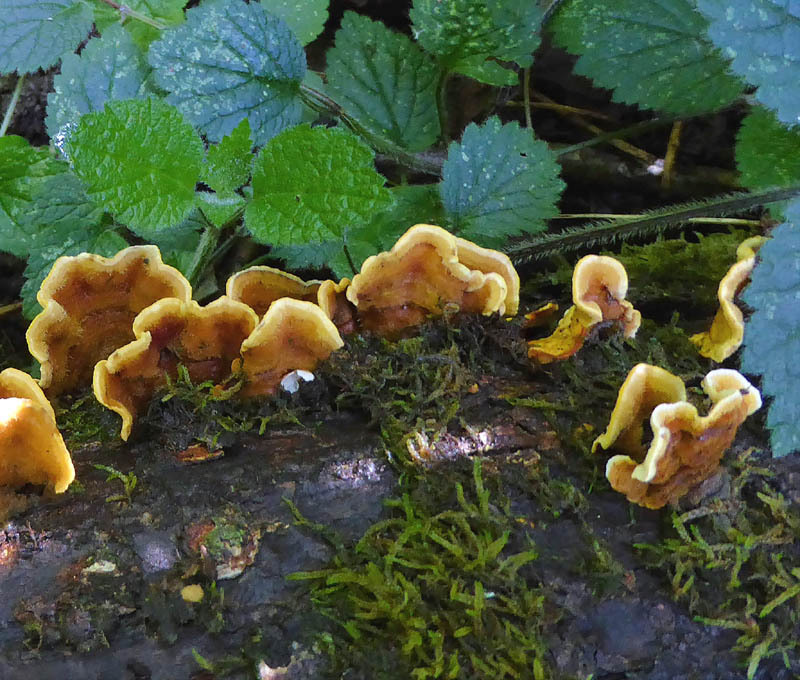 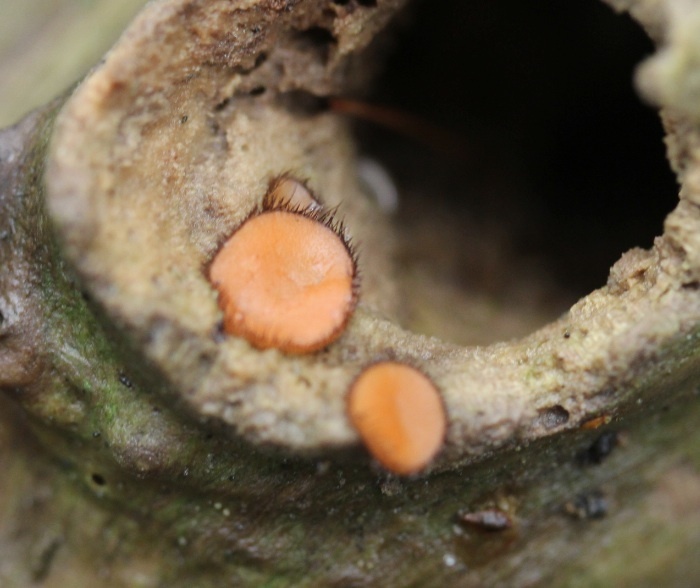 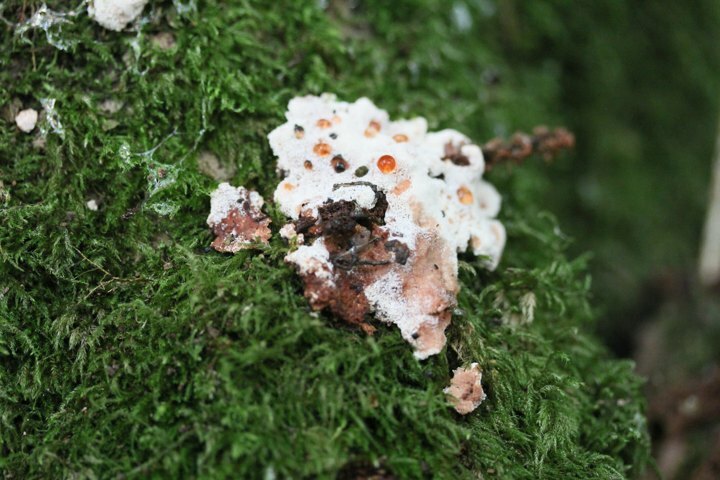 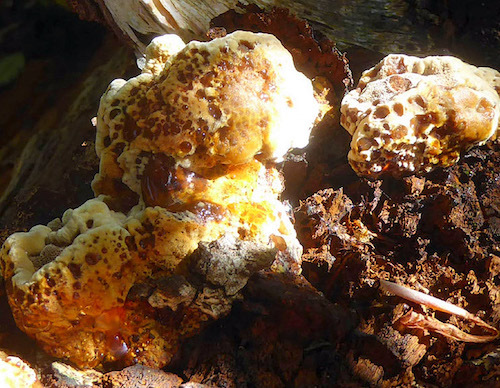 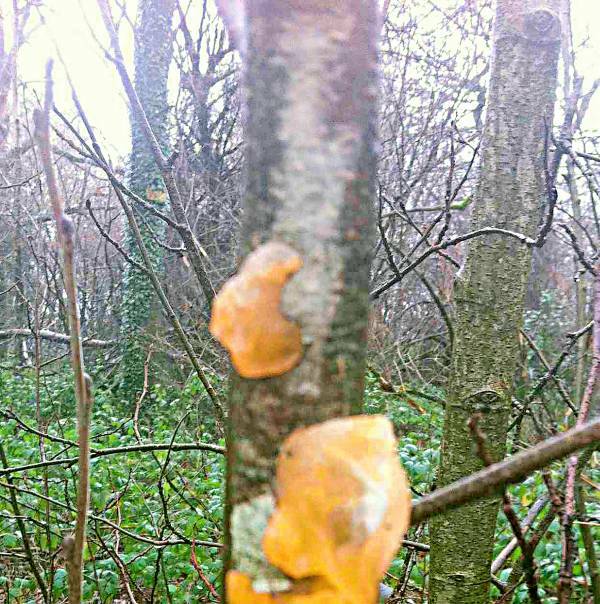 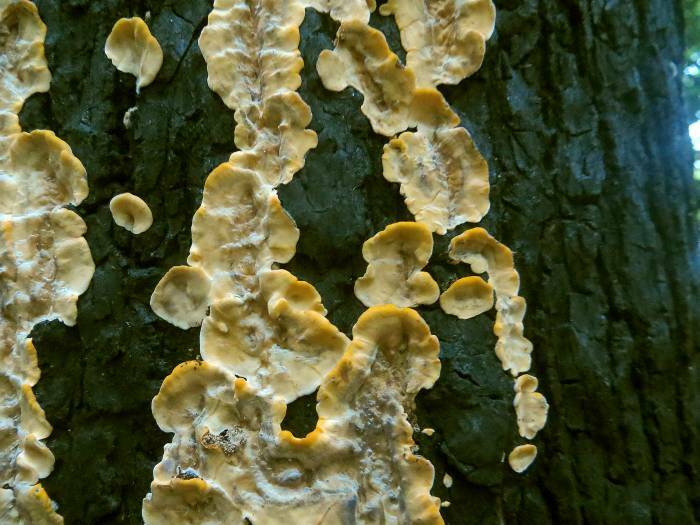 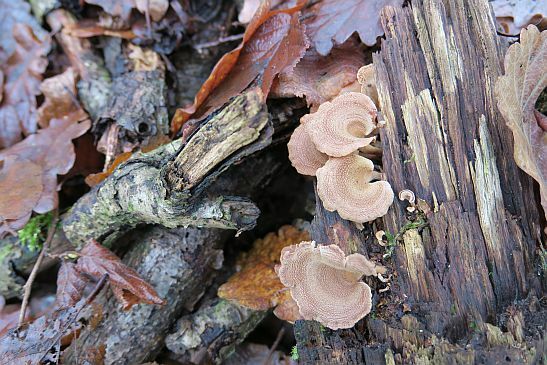 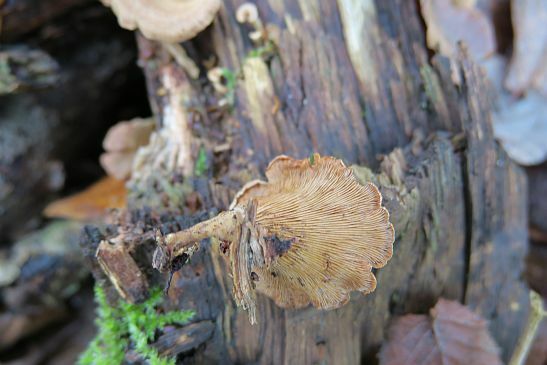 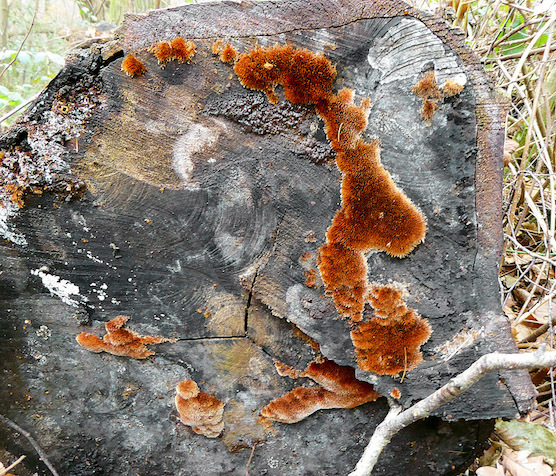 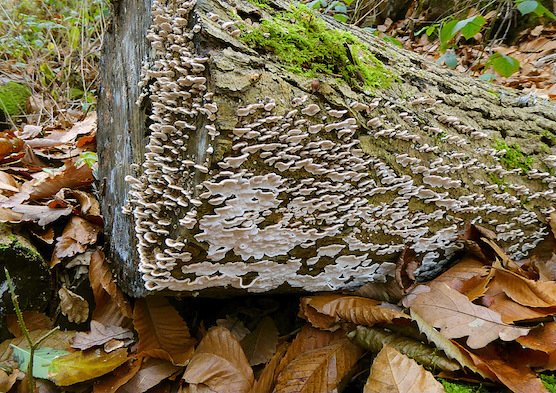 The Stereum fungi are encrustations which spread over the bark of tree wood. 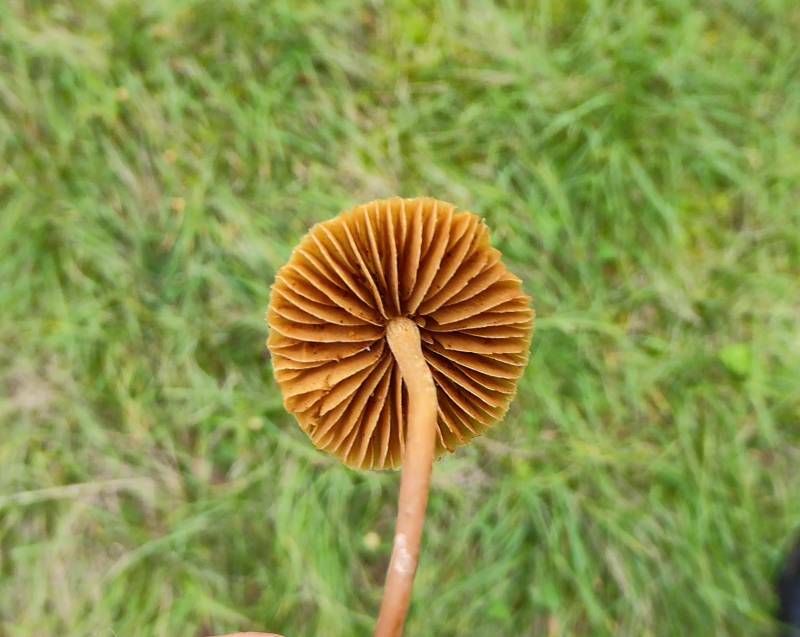 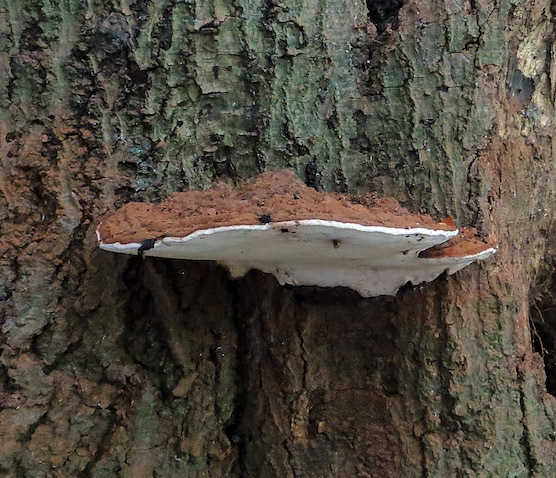 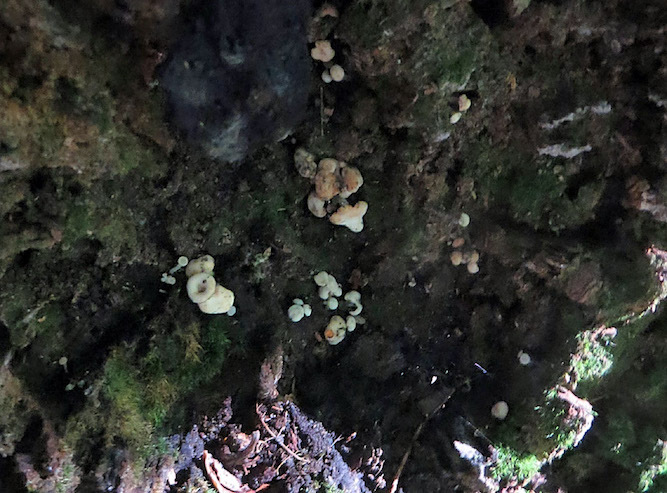 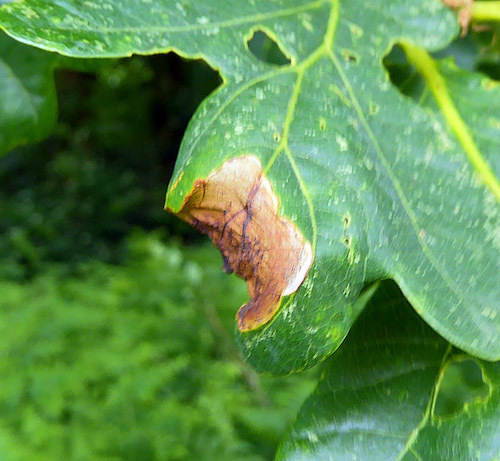 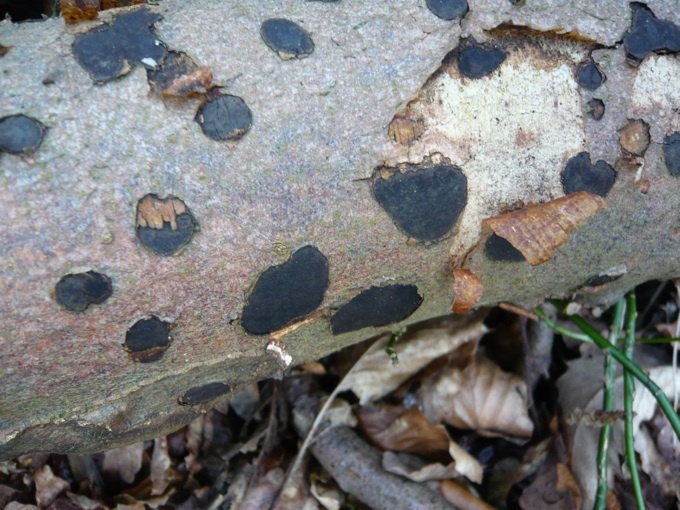 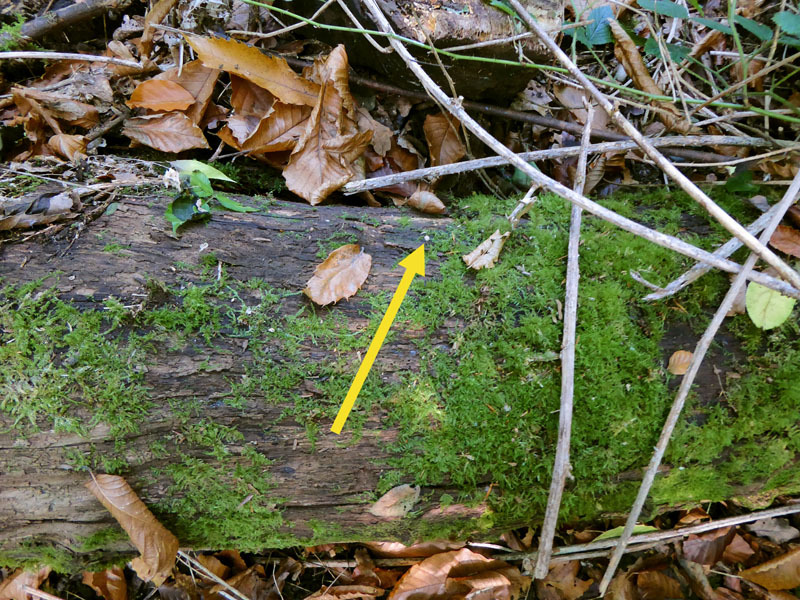 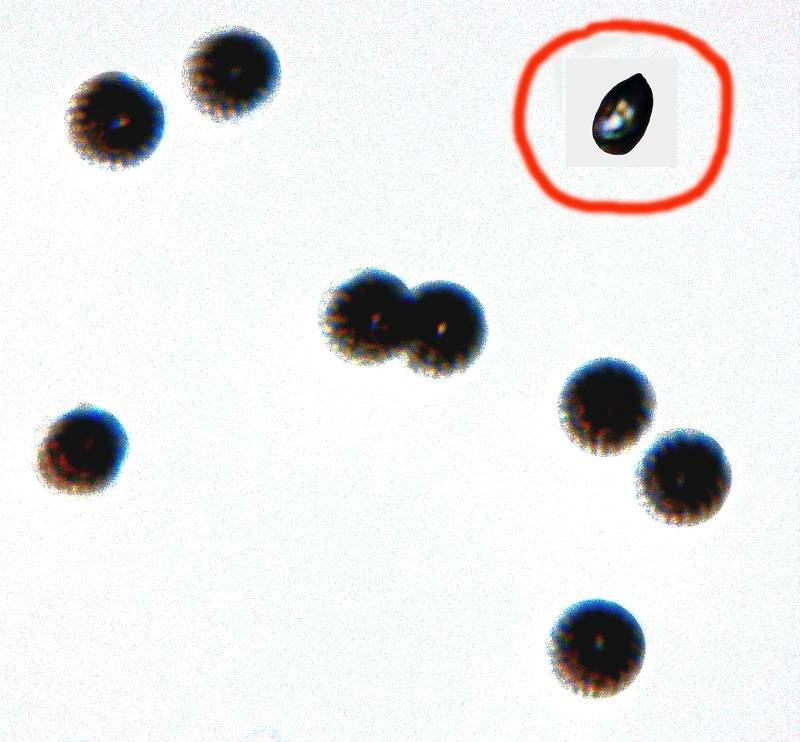 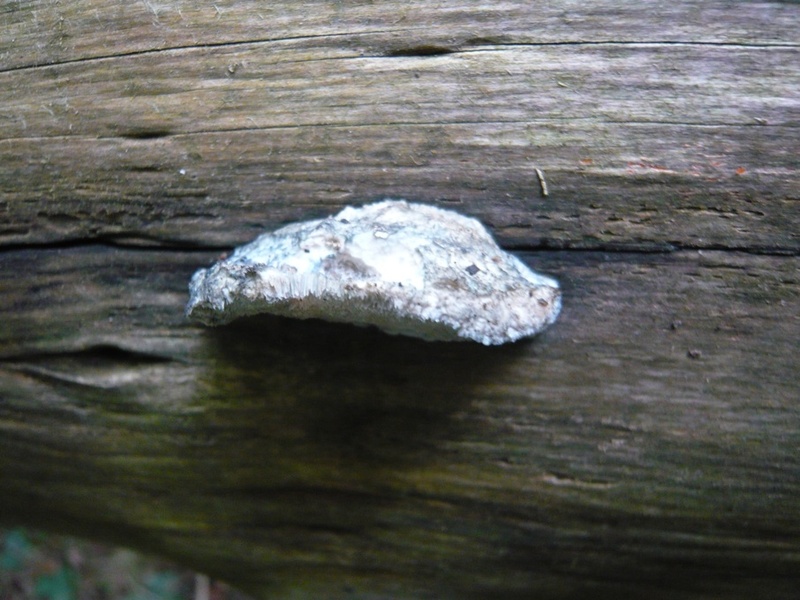 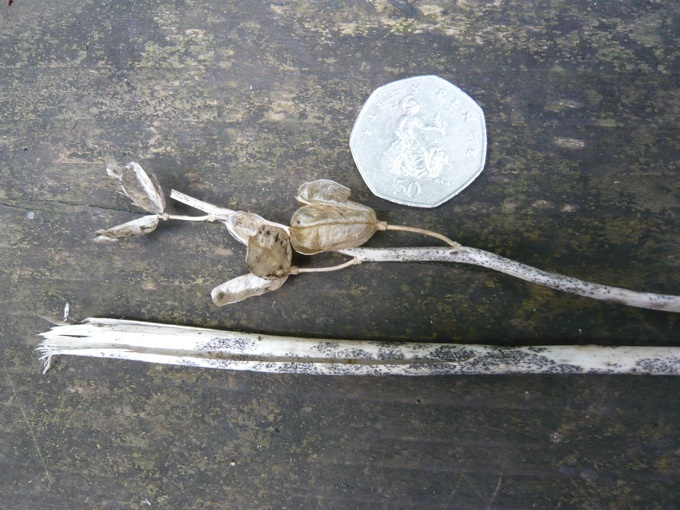 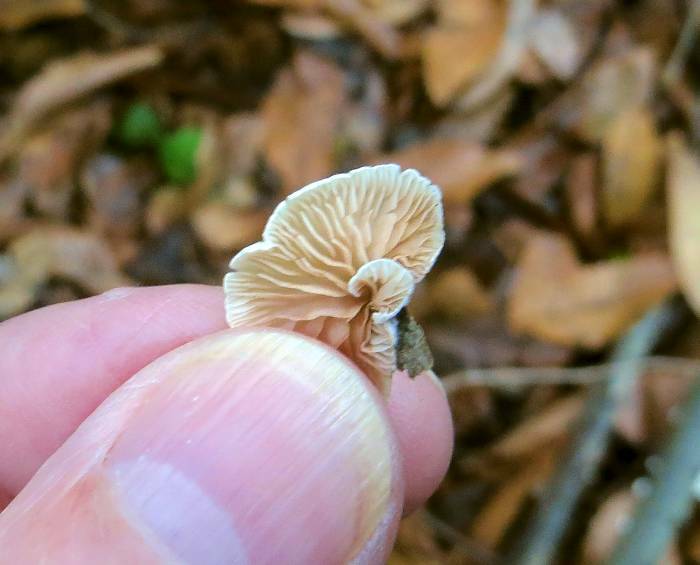 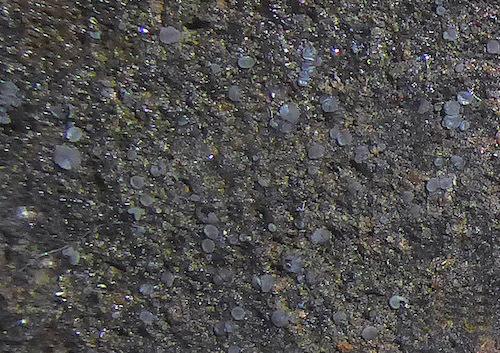 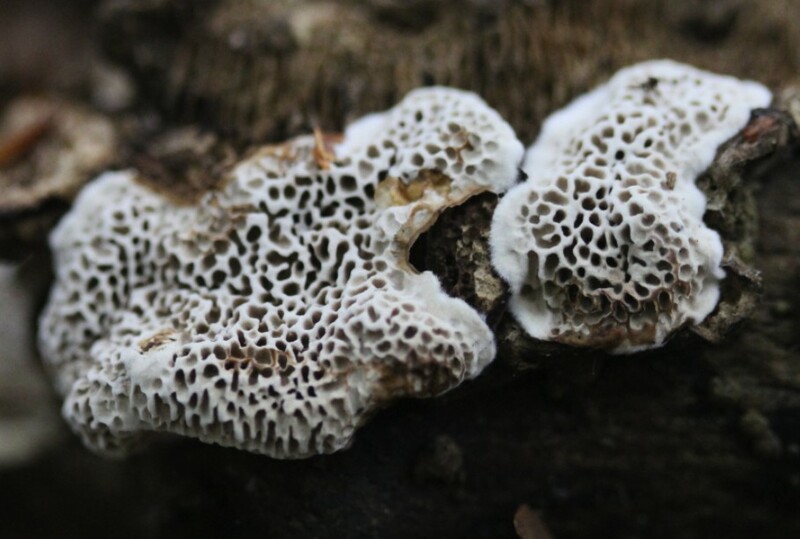 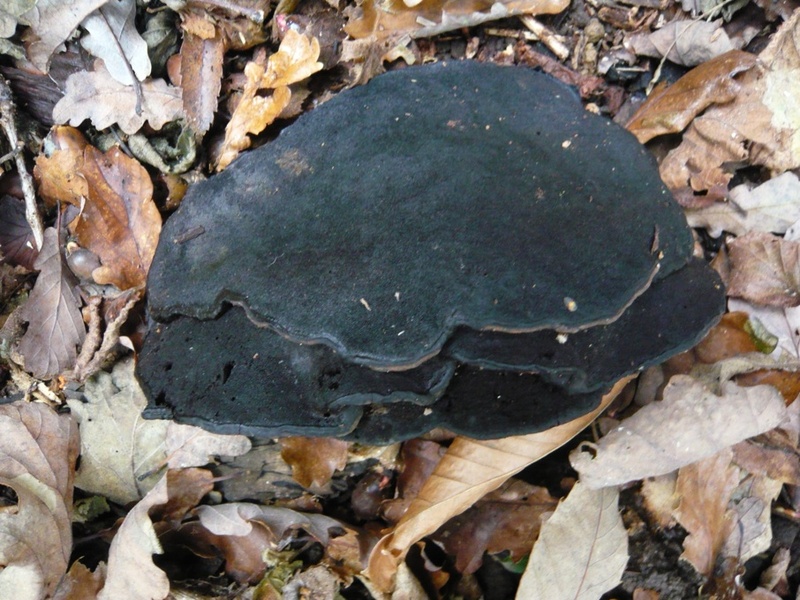 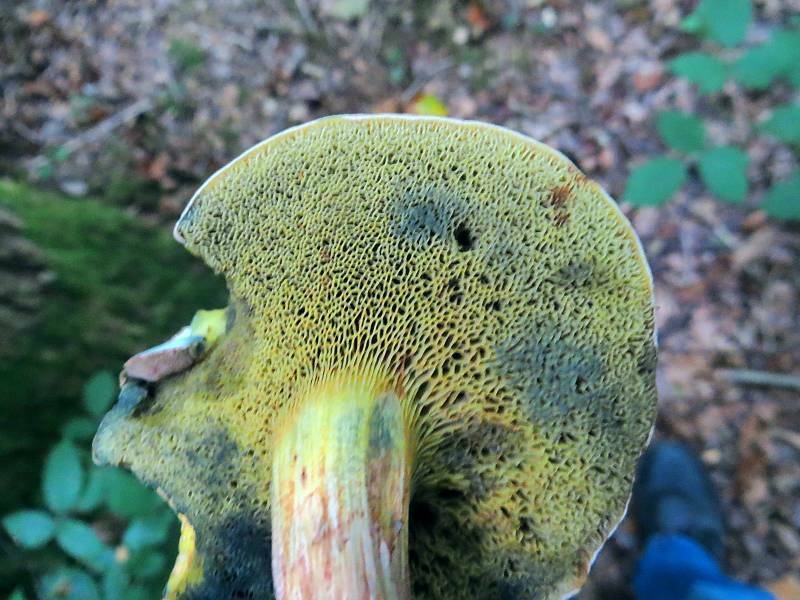 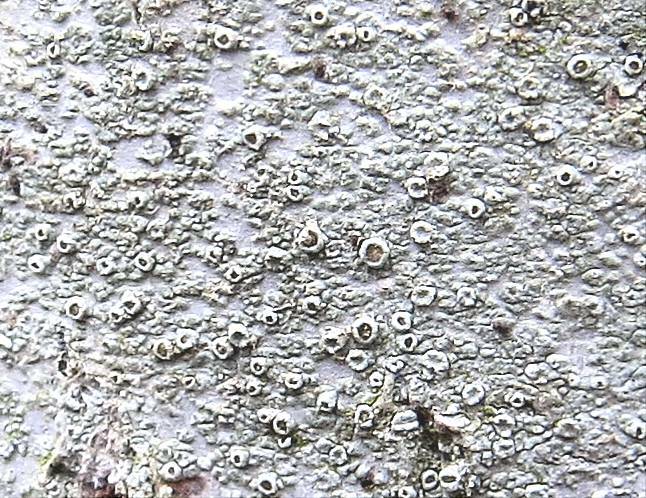 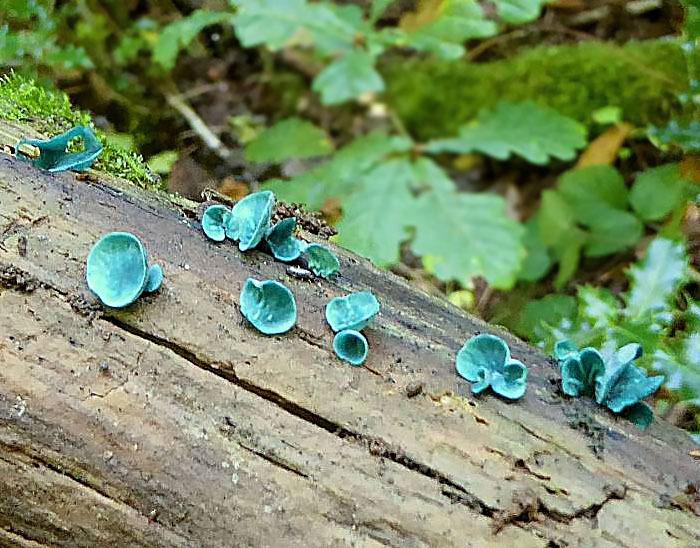 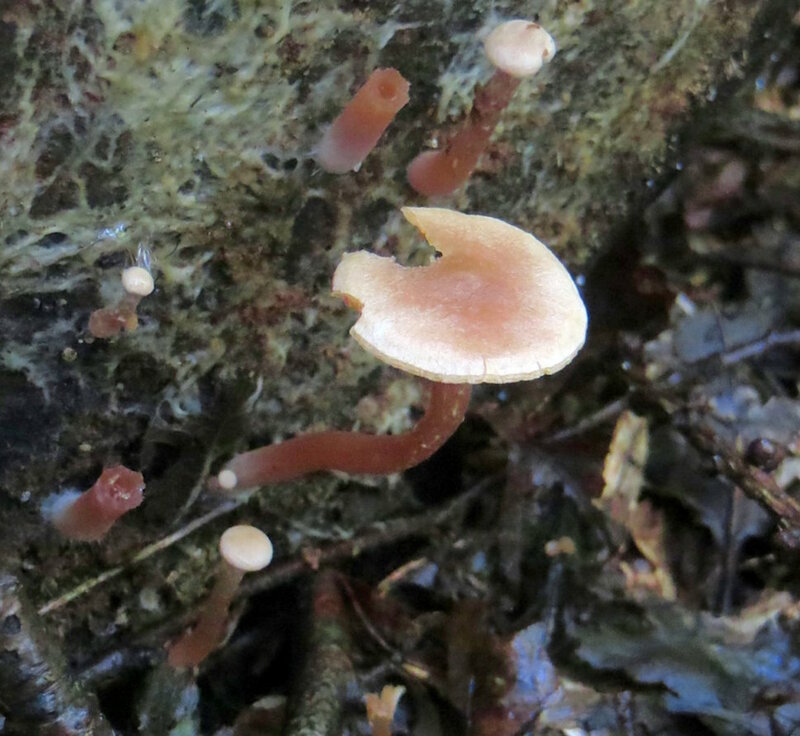 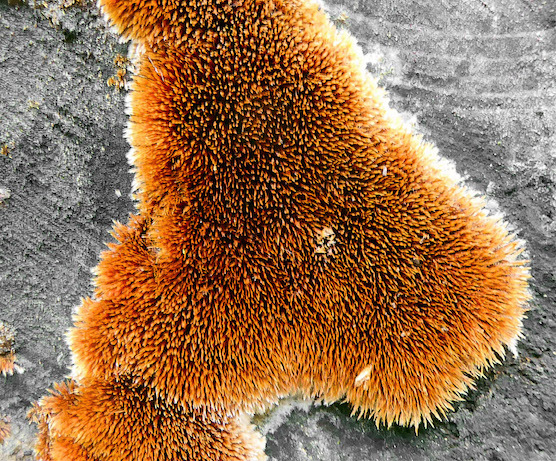 Though mostly flat (resupinate) on the surface, some also occasionally produce small bracket-like standing out sections which help to distribute their spores. 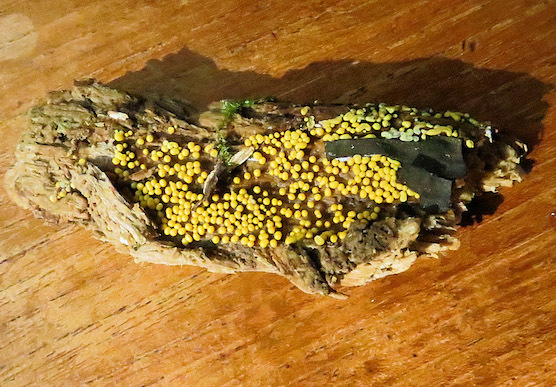 Although Lichens and Slime Moulds are unrelated, both are related to algae which is why they have been grouped here. 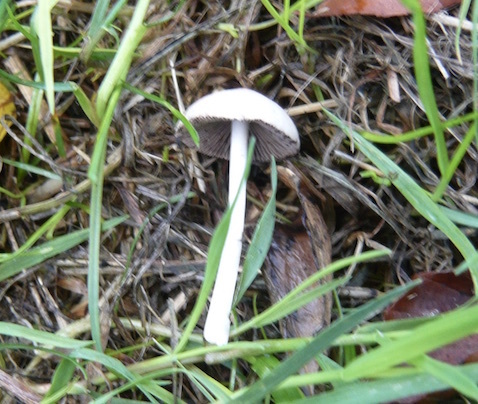 No observations of any of these were recorded in the 1978 Penry-Jones booklet. 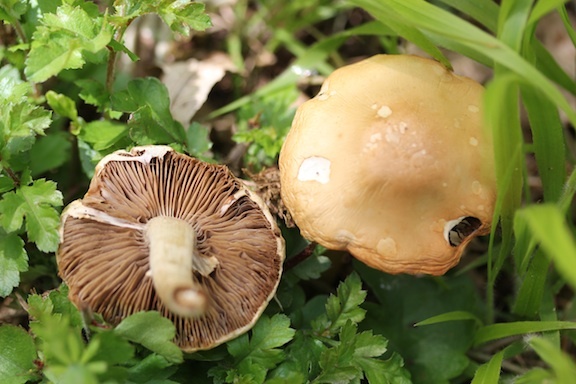 Few have common English names. 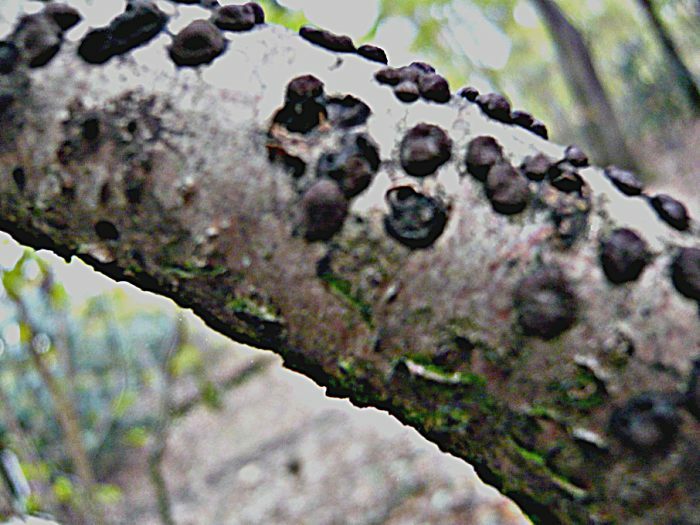 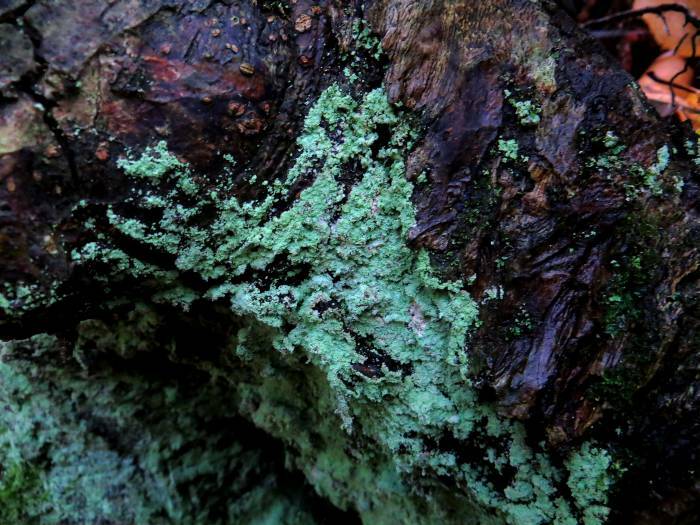 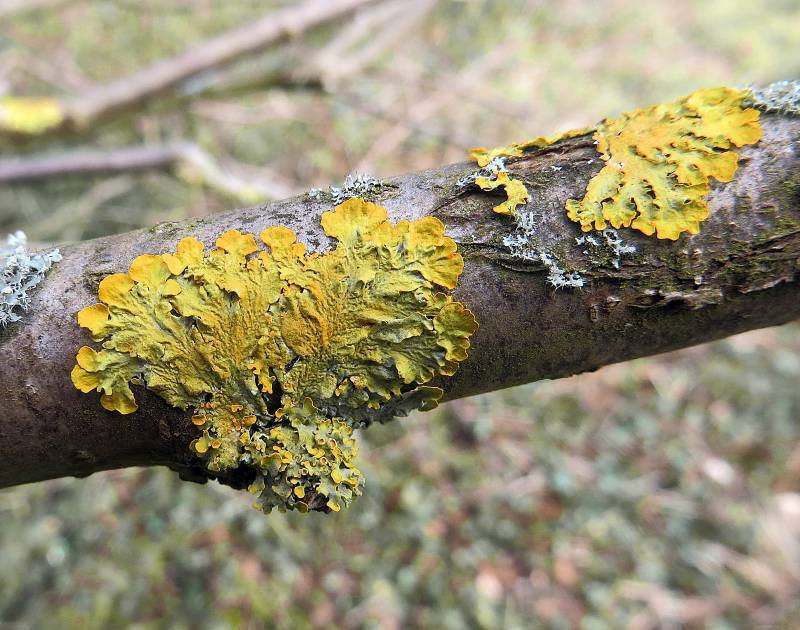 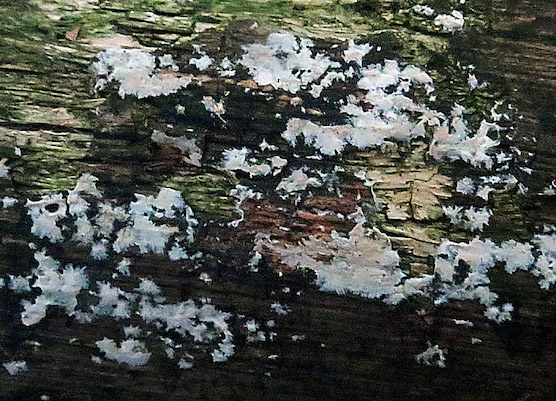 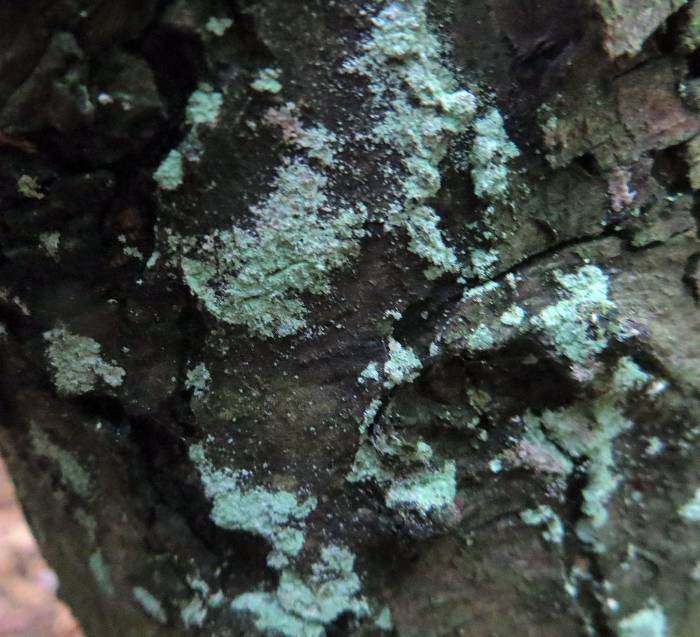 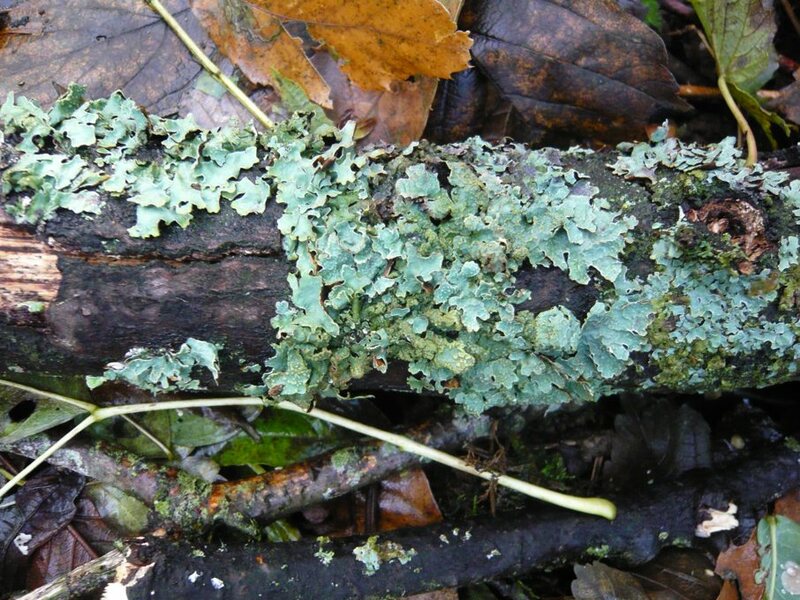 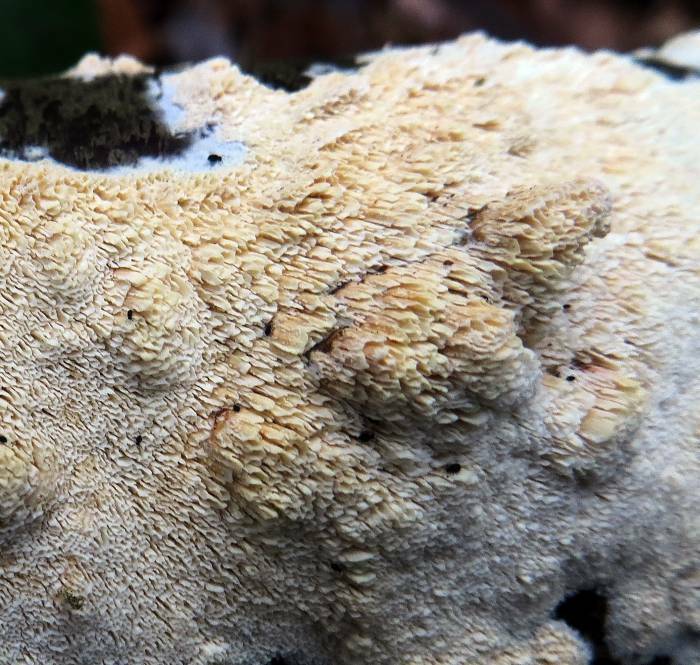 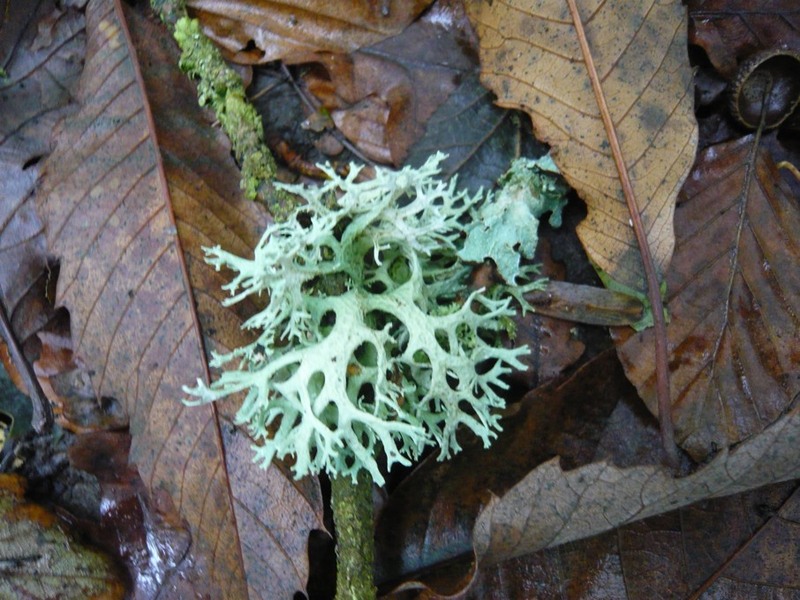 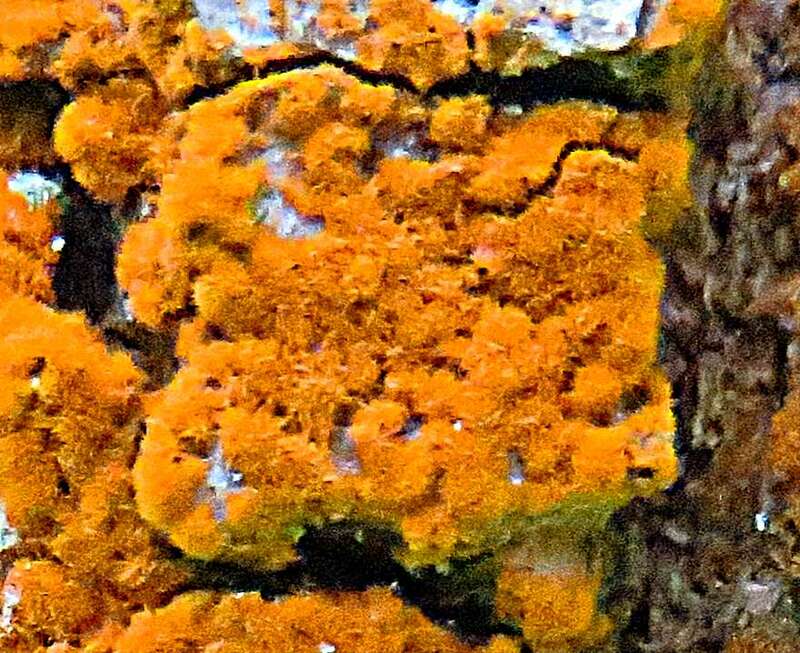 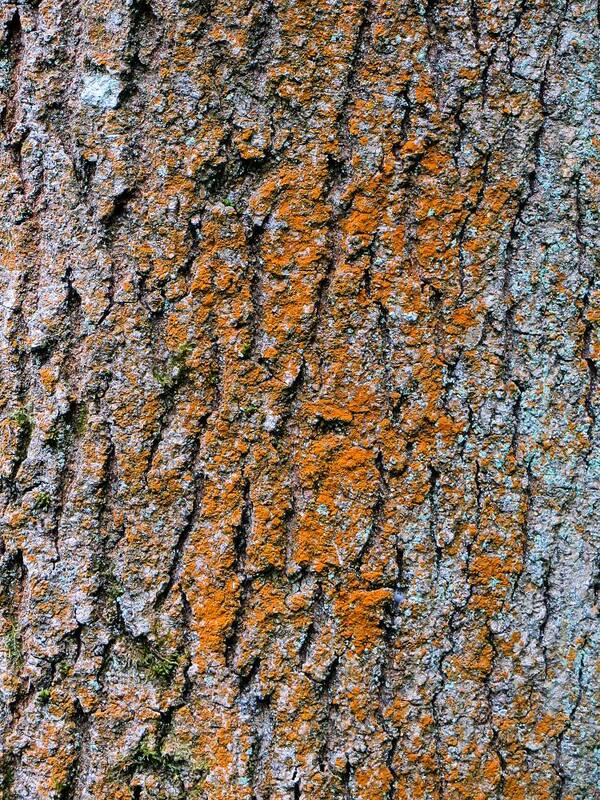 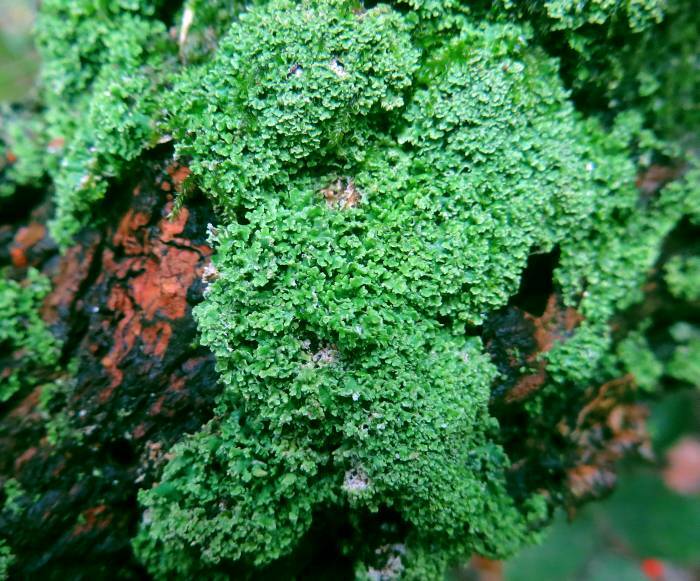 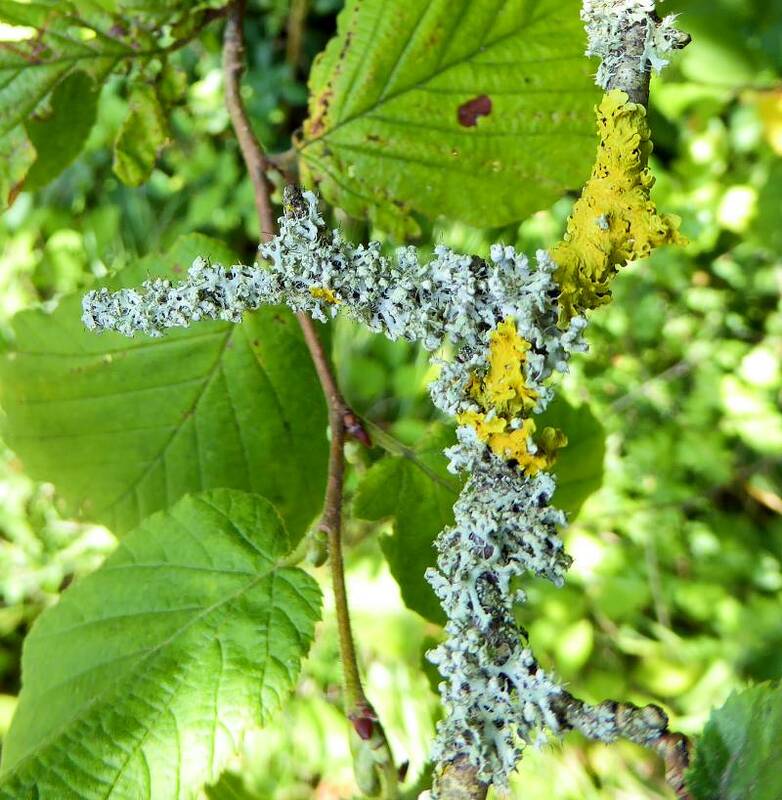 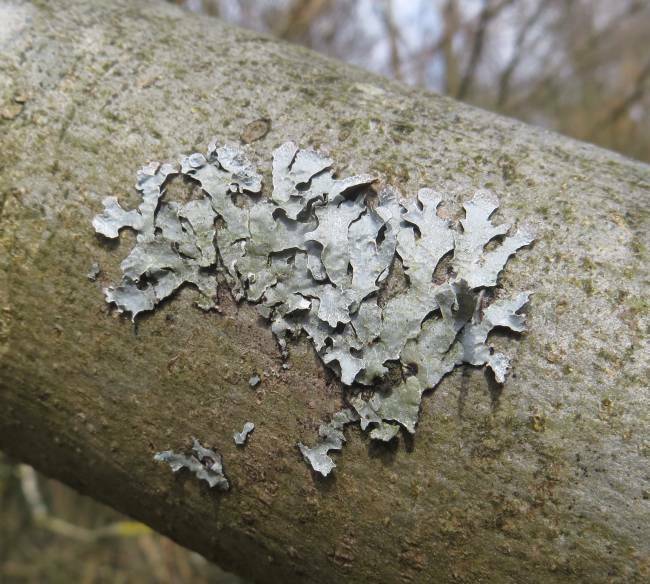 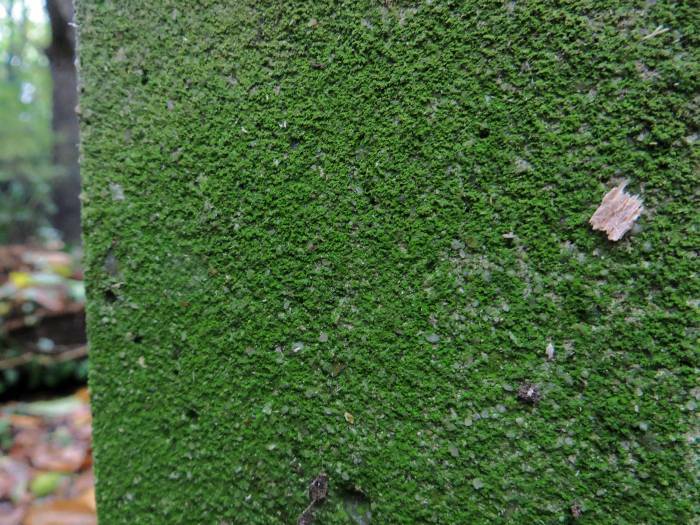 Lichens are composite organisms, life forms comprised of two distinct species - an intertwined fungus and alga. 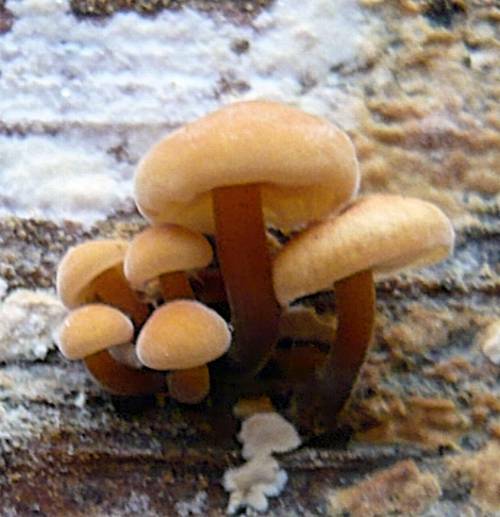 They are probably the most difficult of all to identify - advanced laboratory facilities are needed for certainly with many species to carry out molecular, thermal and elementary analysis. 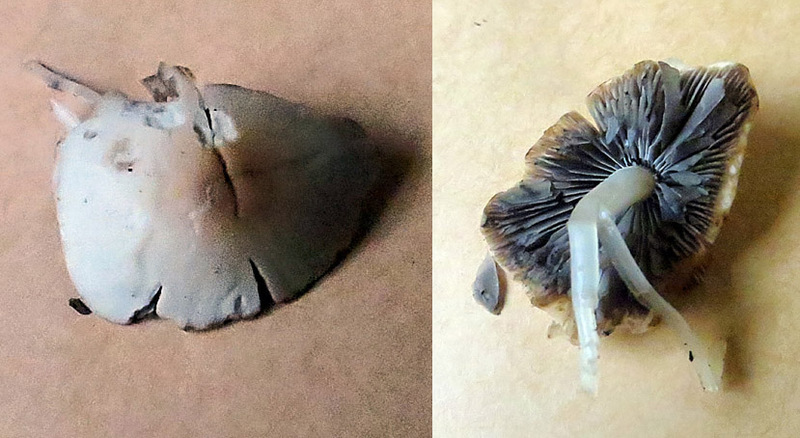 Even visual IDs should really only be done when they are fruiting and dry. 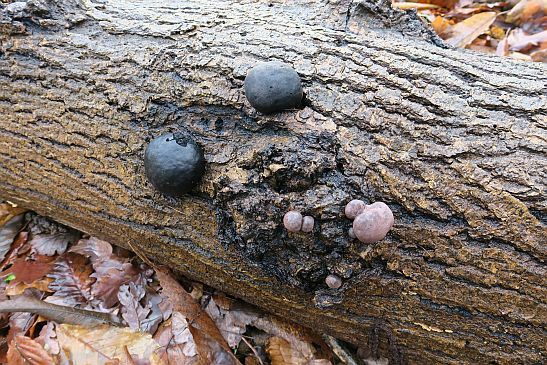 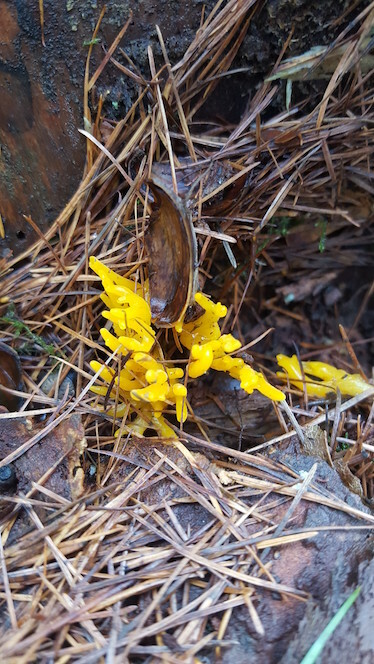 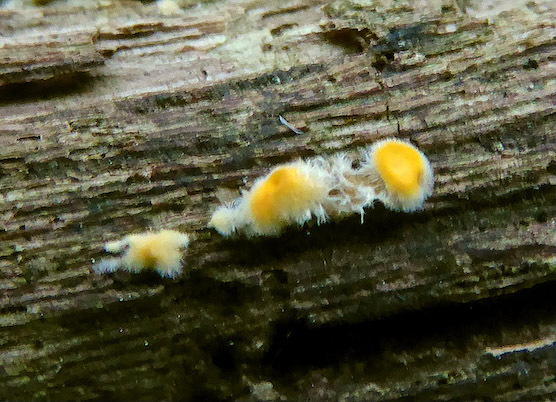 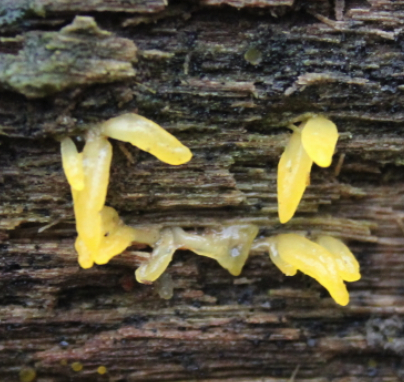 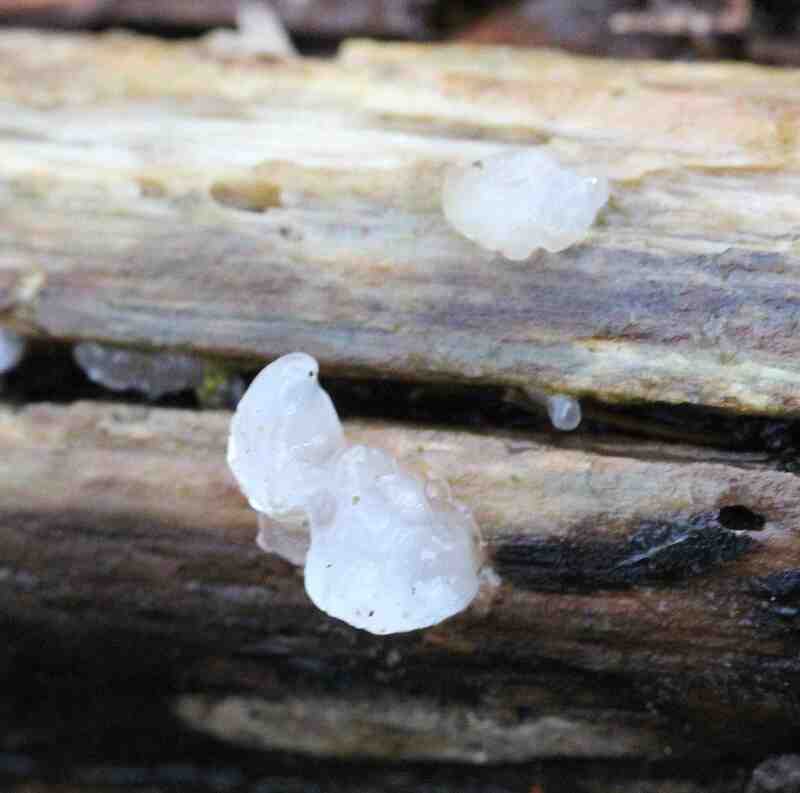 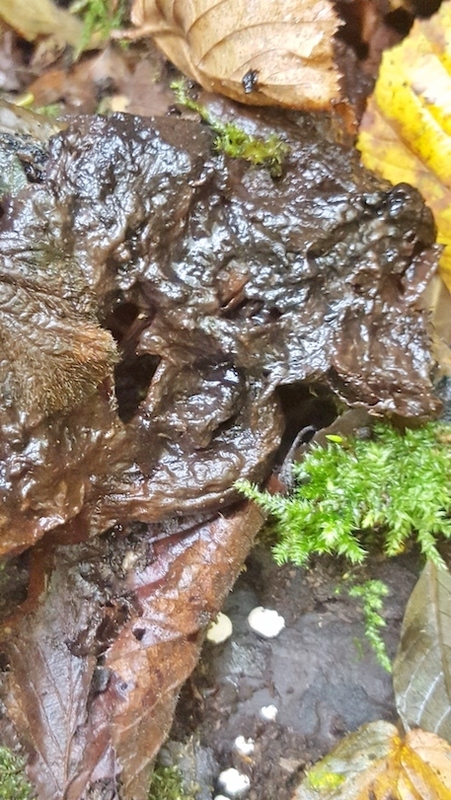 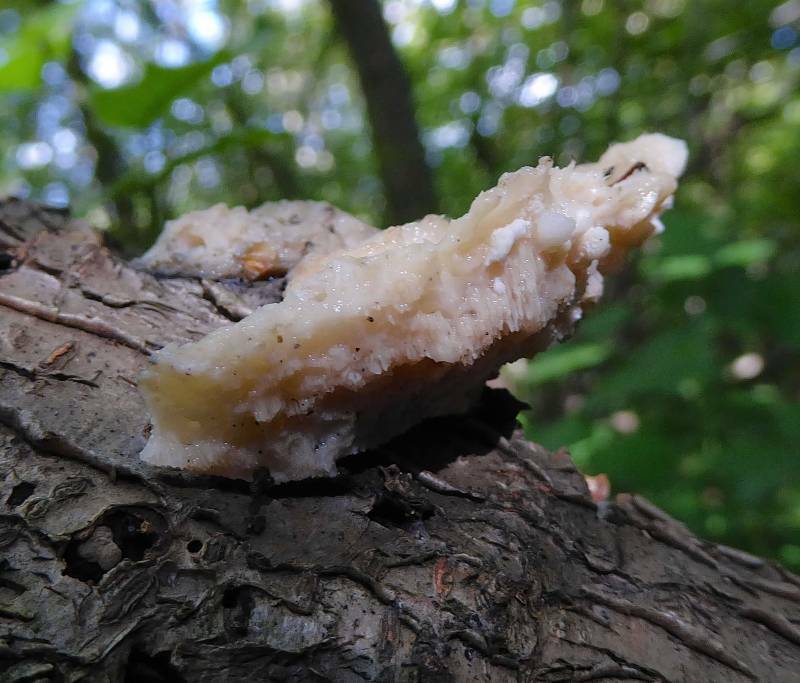 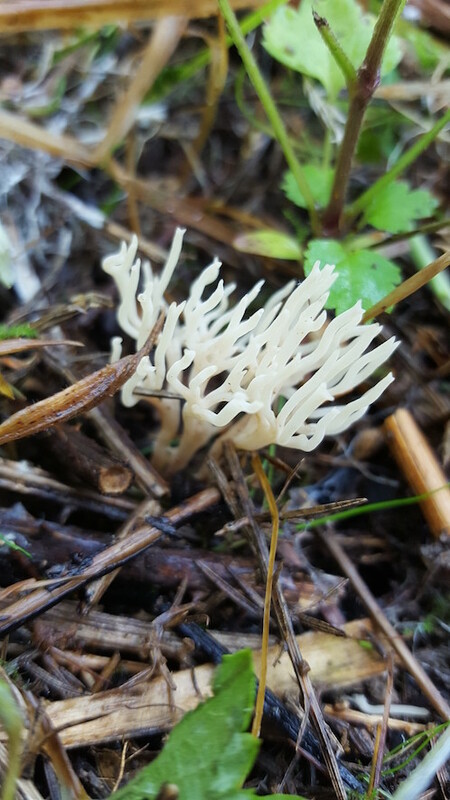 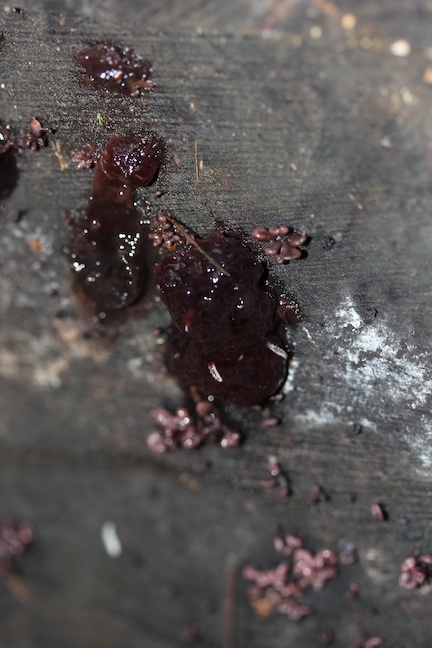 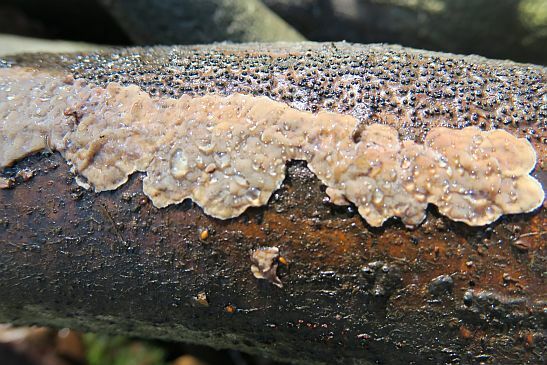 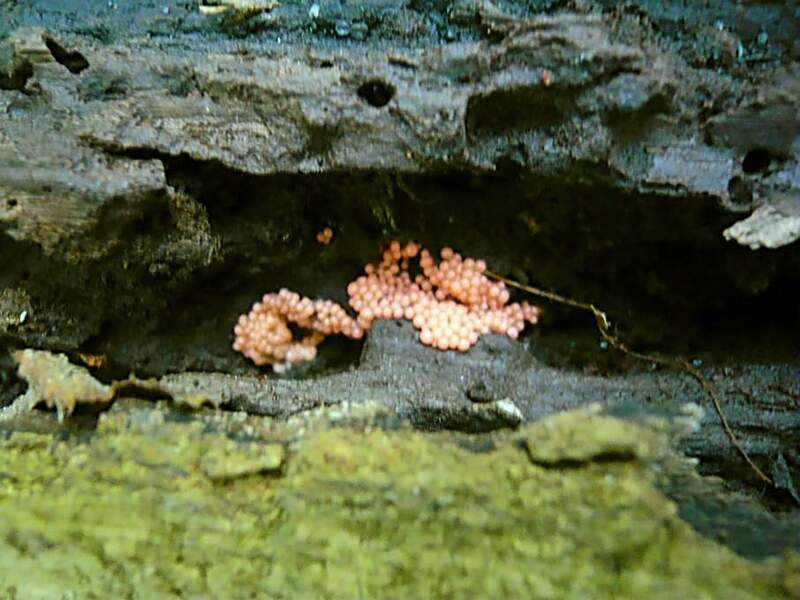 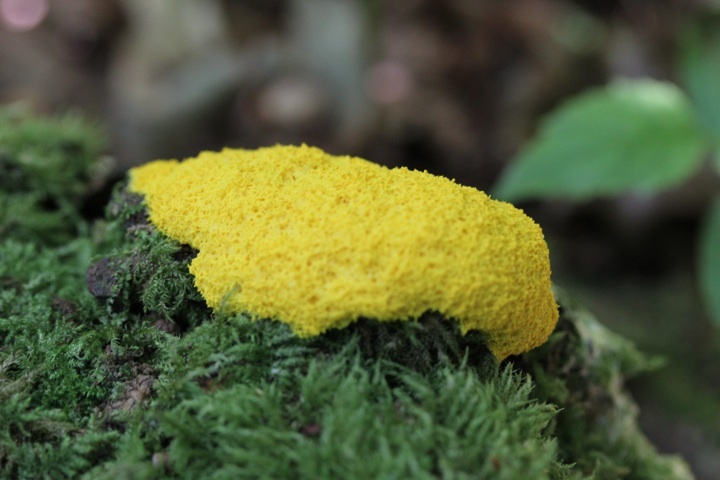 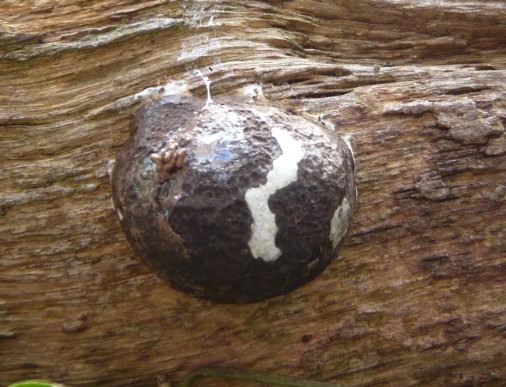 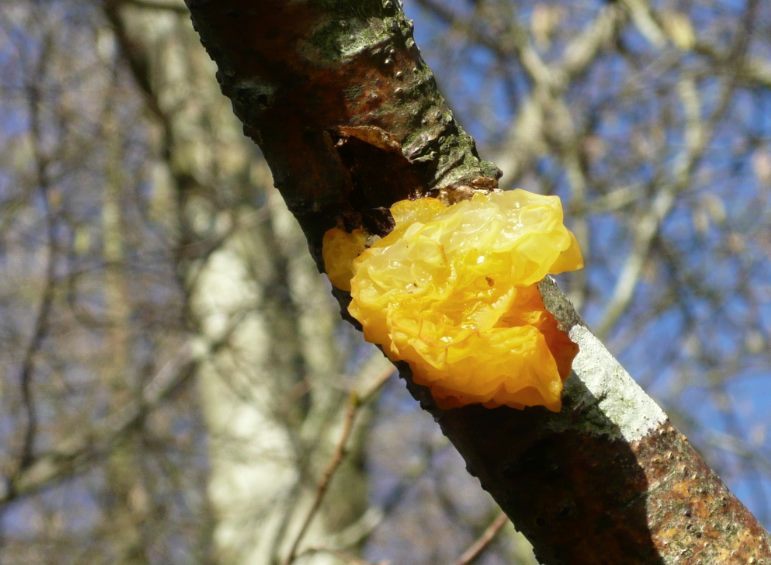 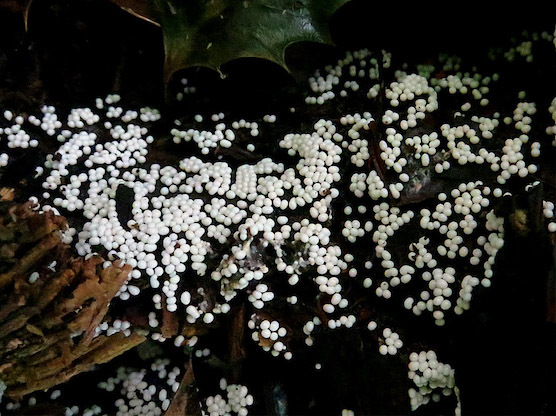 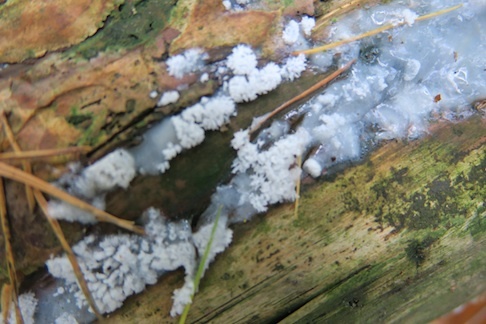 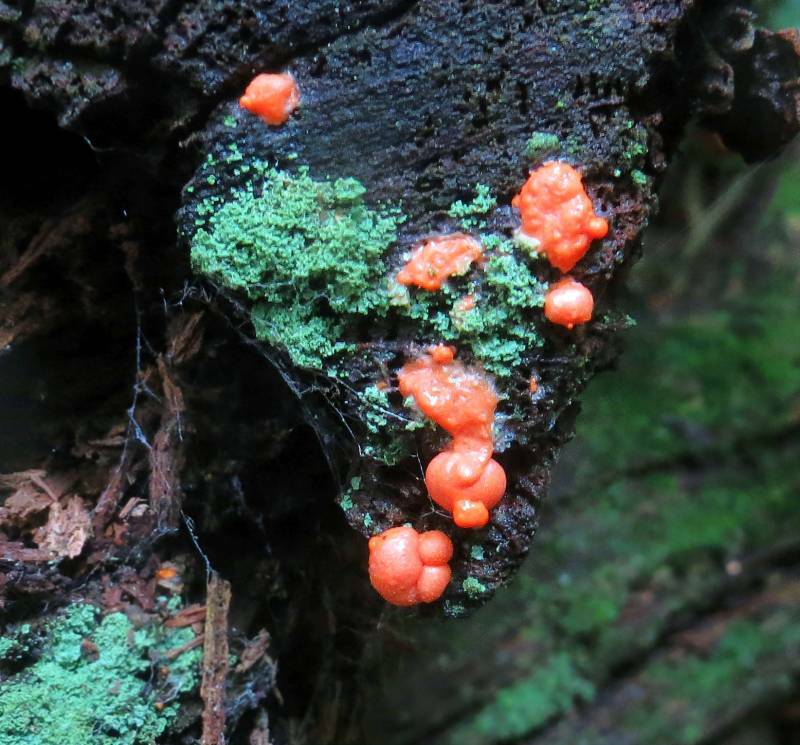 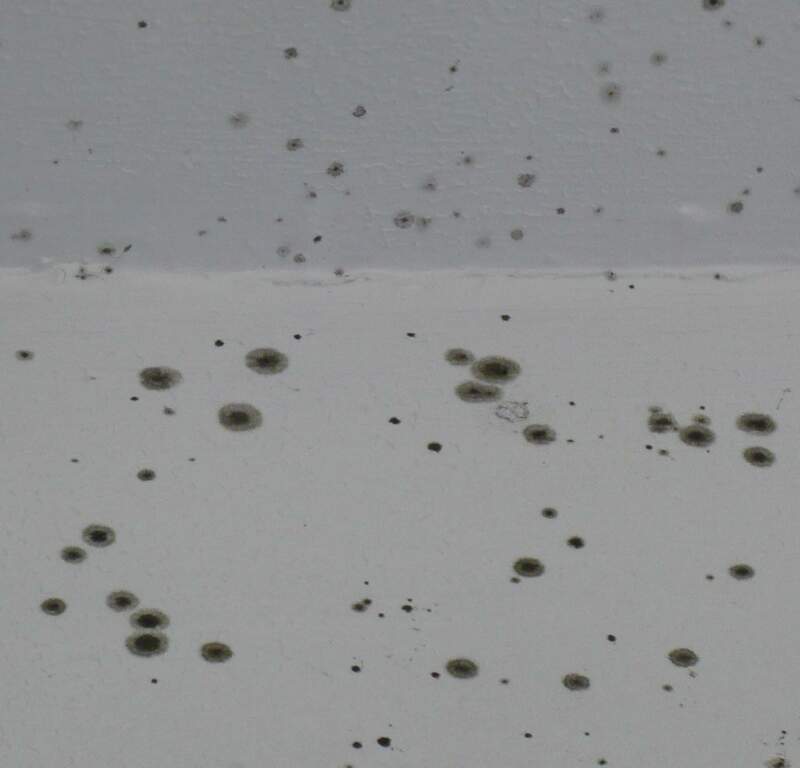 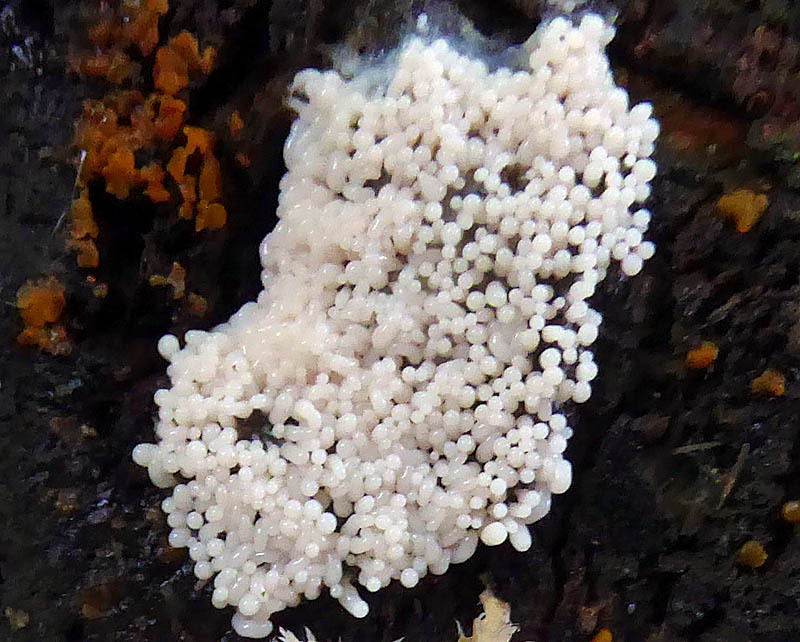 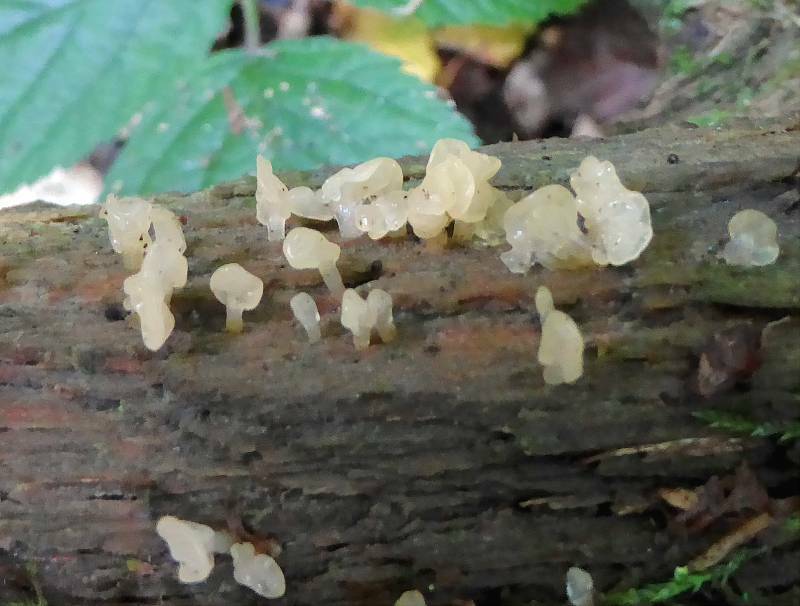 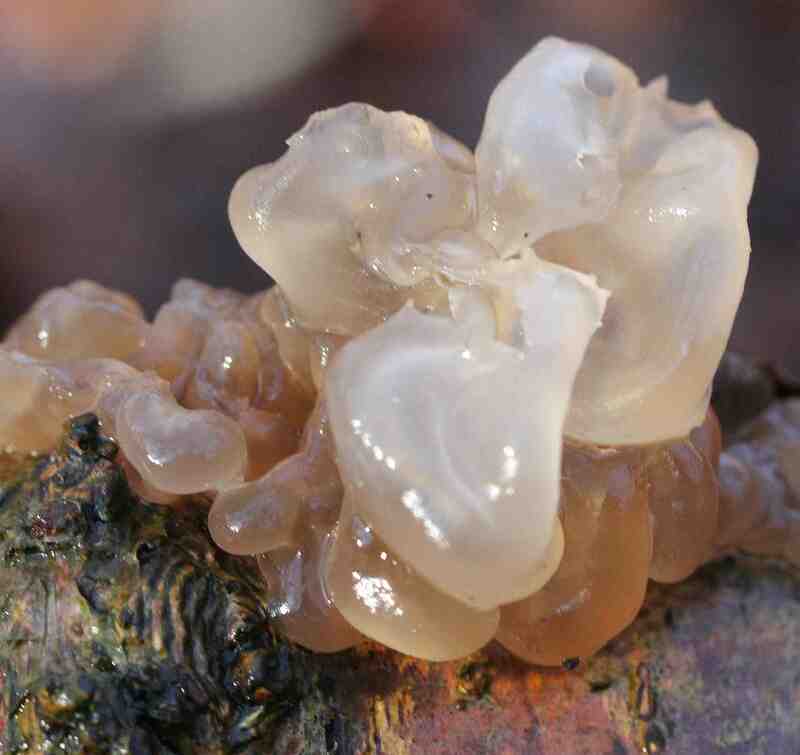 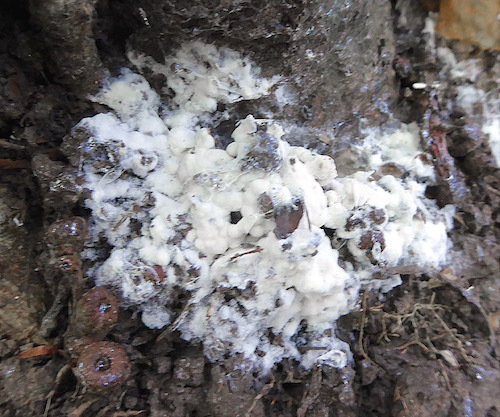 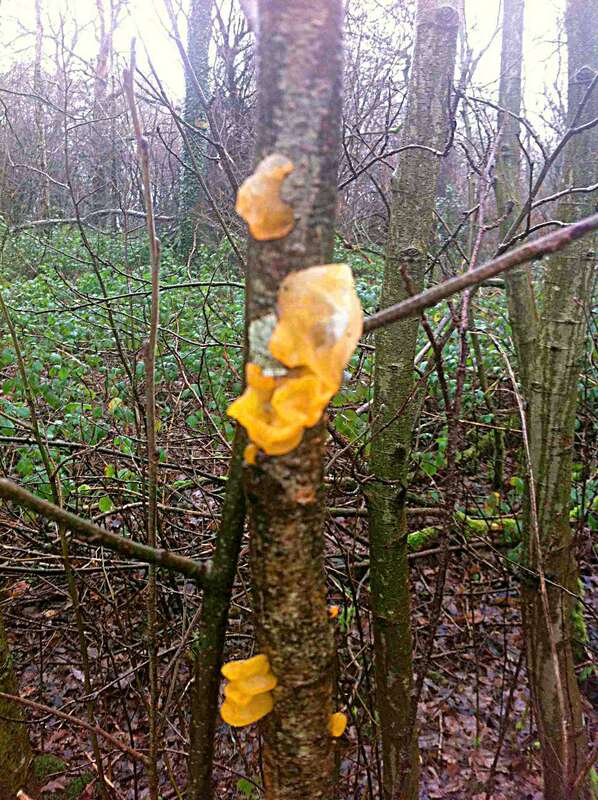 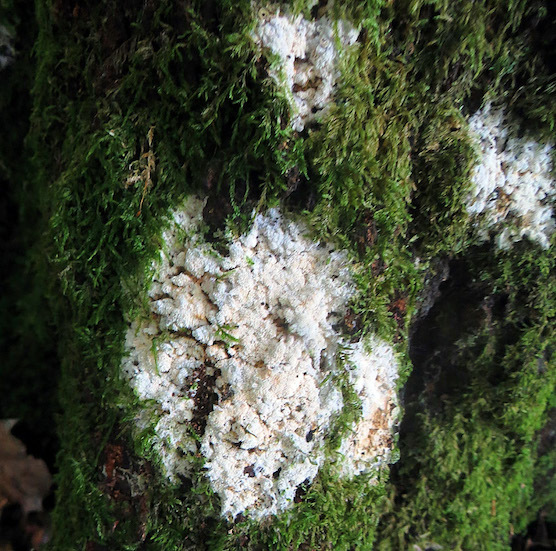 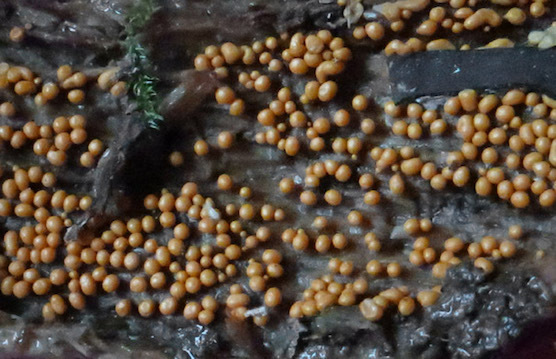 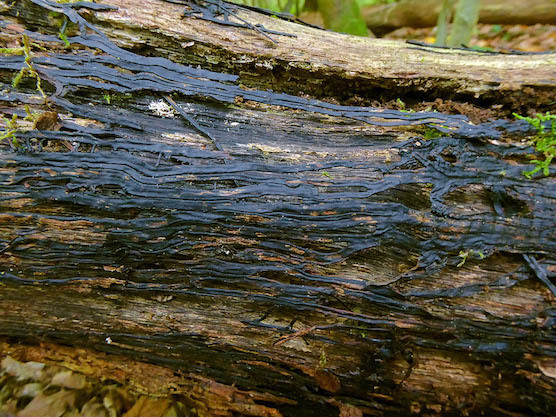 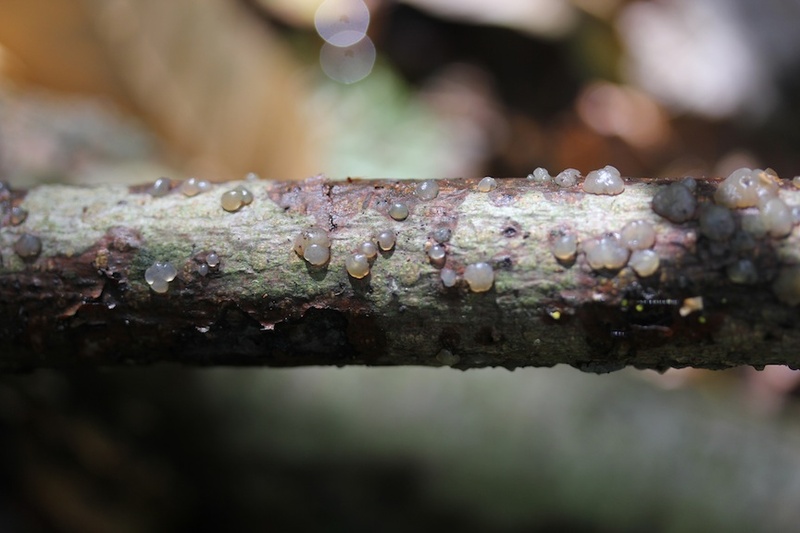 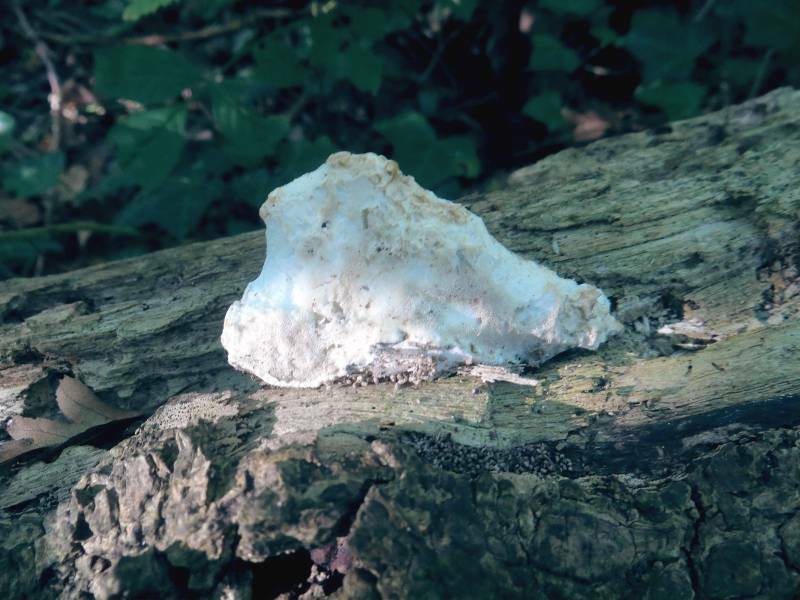 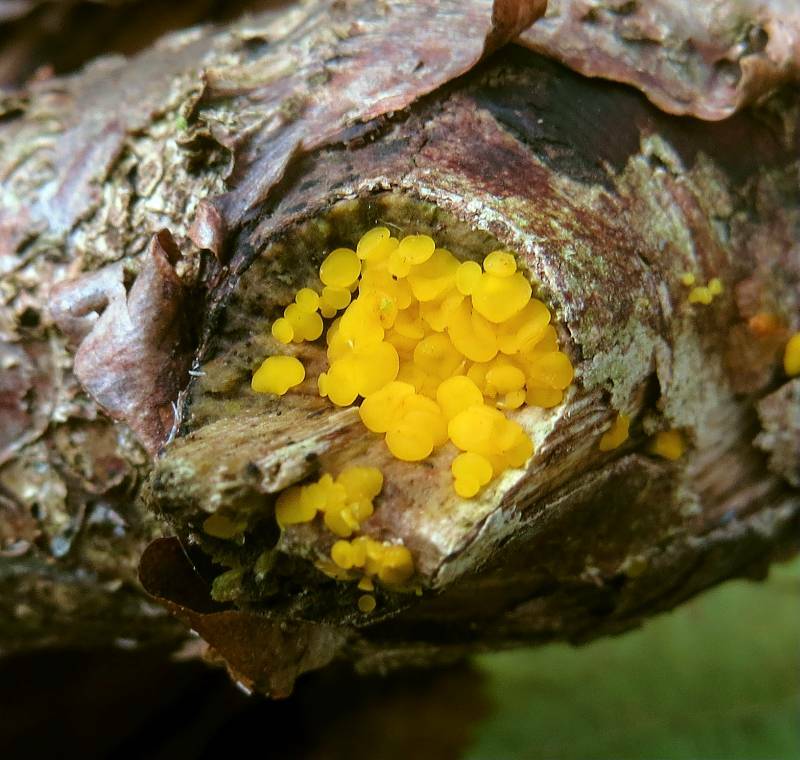 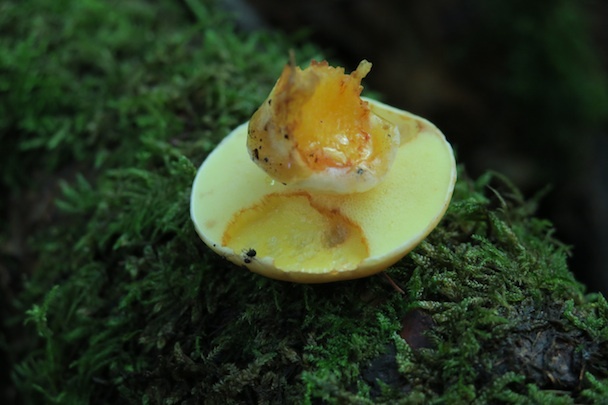 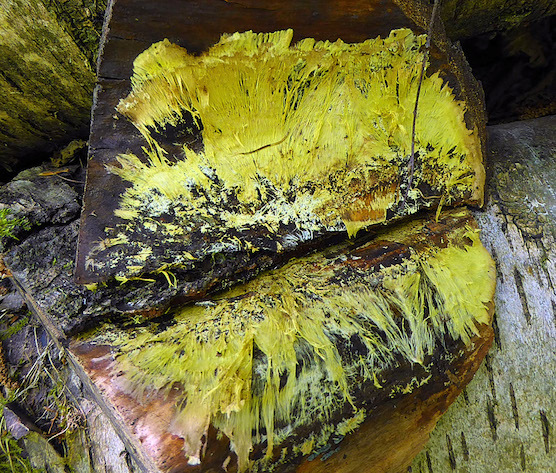 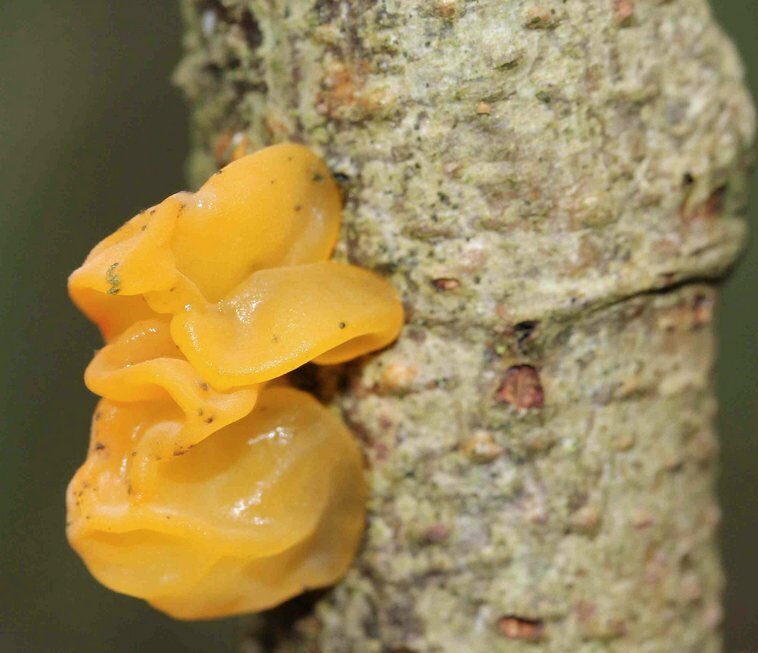 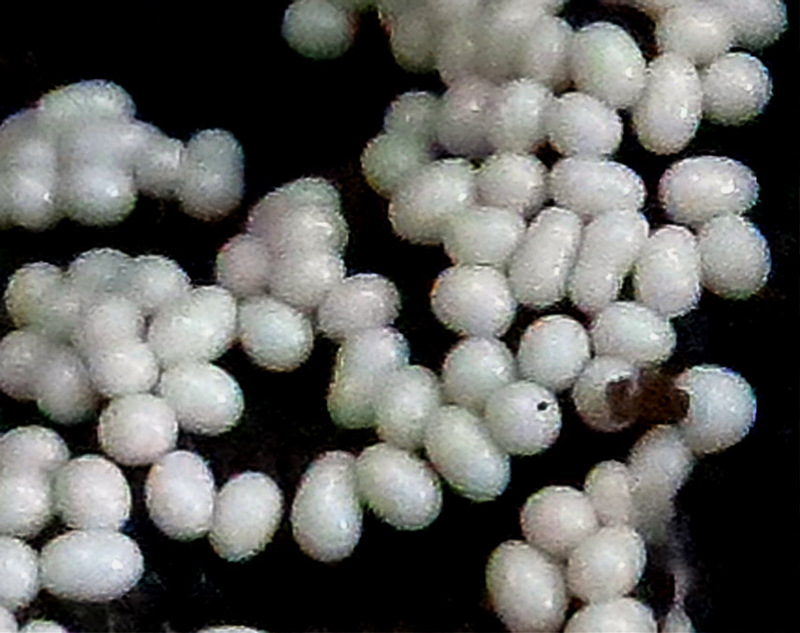 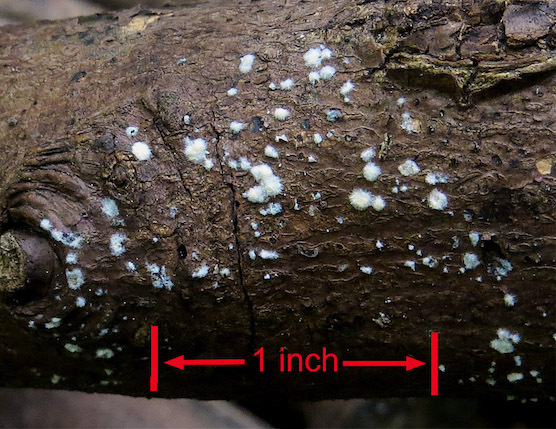 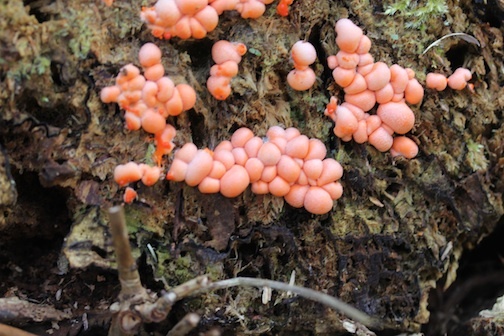 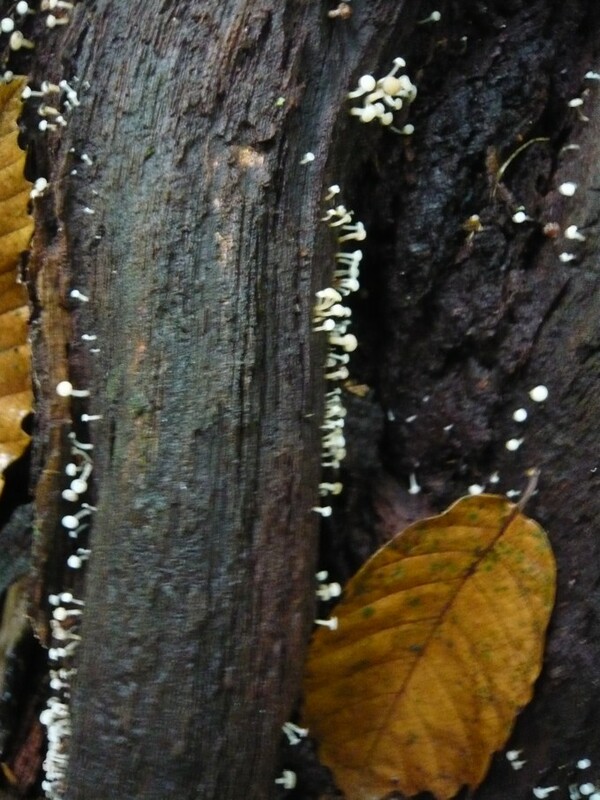 Slime Moulds are essentially masses of protoplasm without distinct cells. 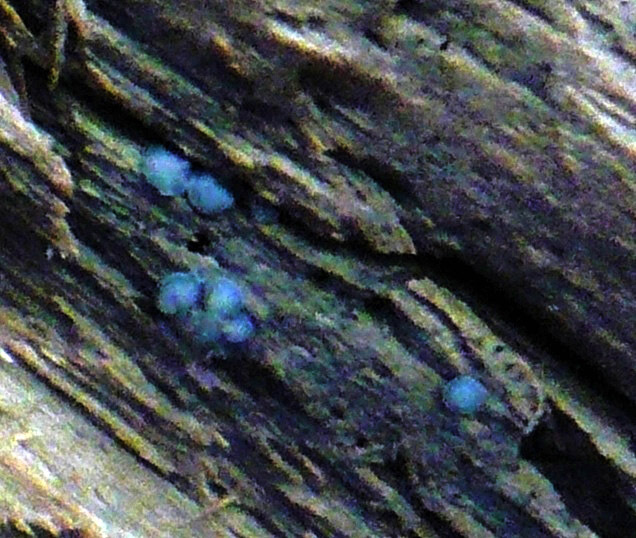 They can move, creeping along a surface to find more food. 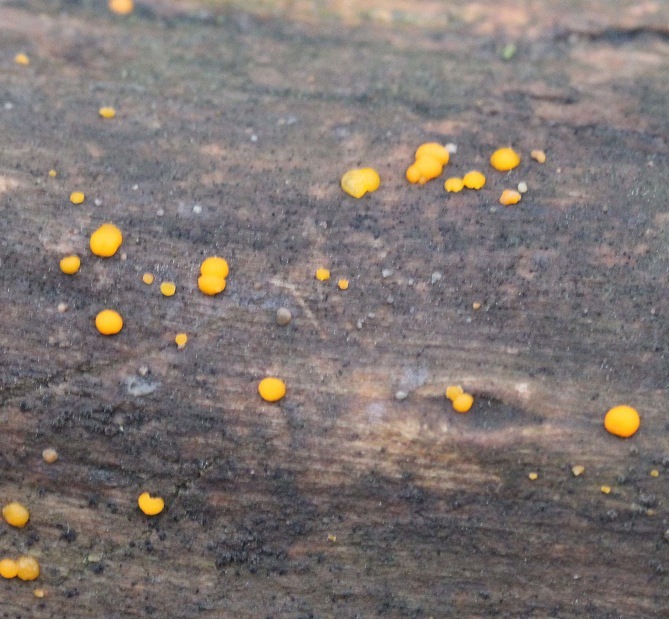 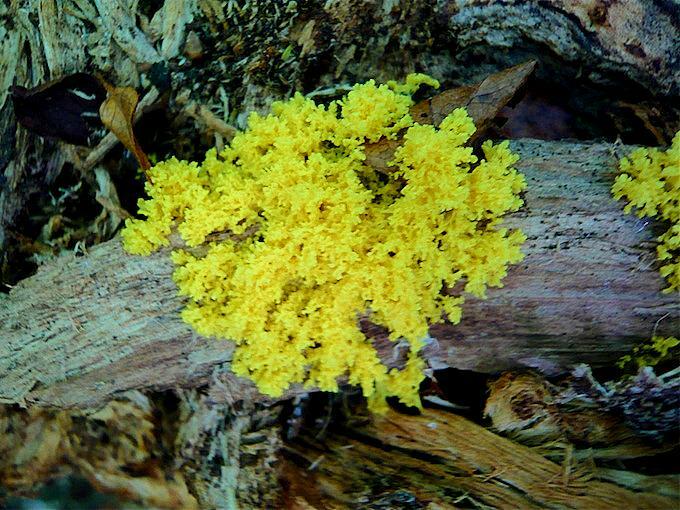 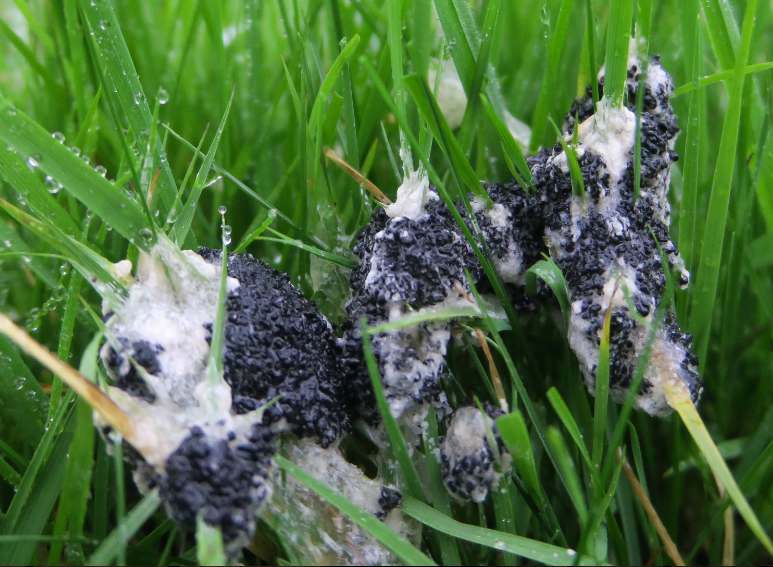 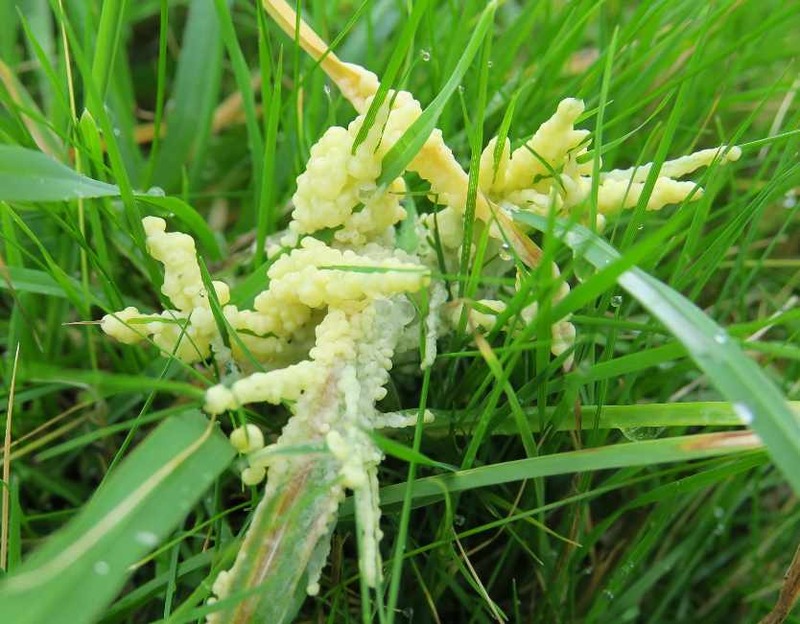 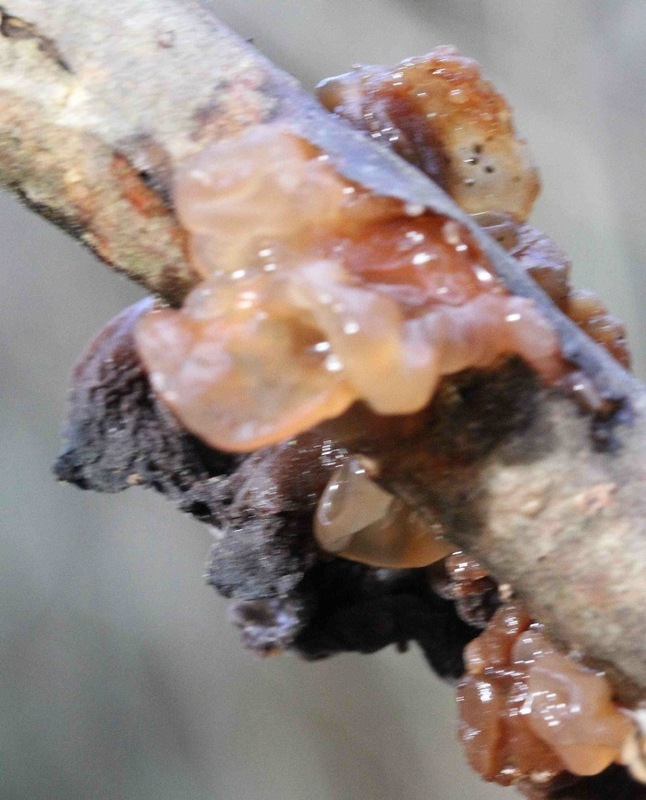 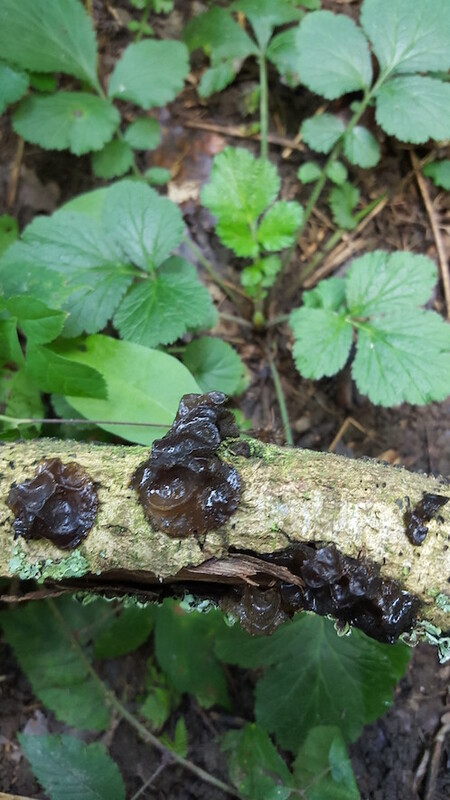 Slime Moulds are classified in the kingdom protista, along with algae and protozoans. 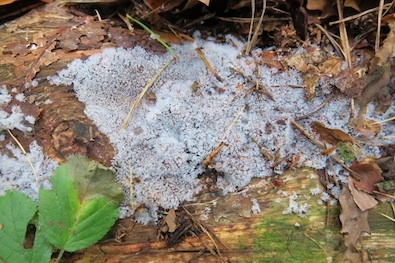 Slime Moulds are essentially masses of protoplasm without distinct cells. 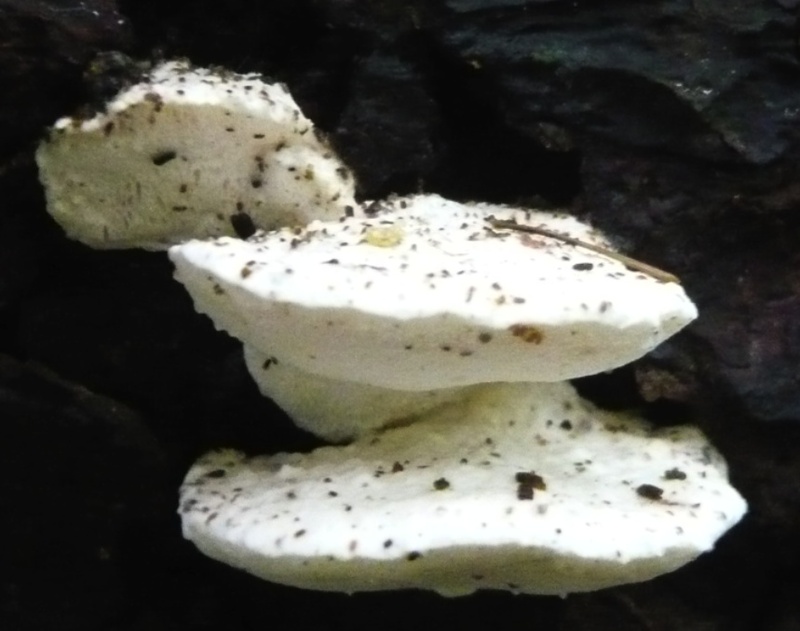 They can move, creeping or flowing along a surface to find more food. 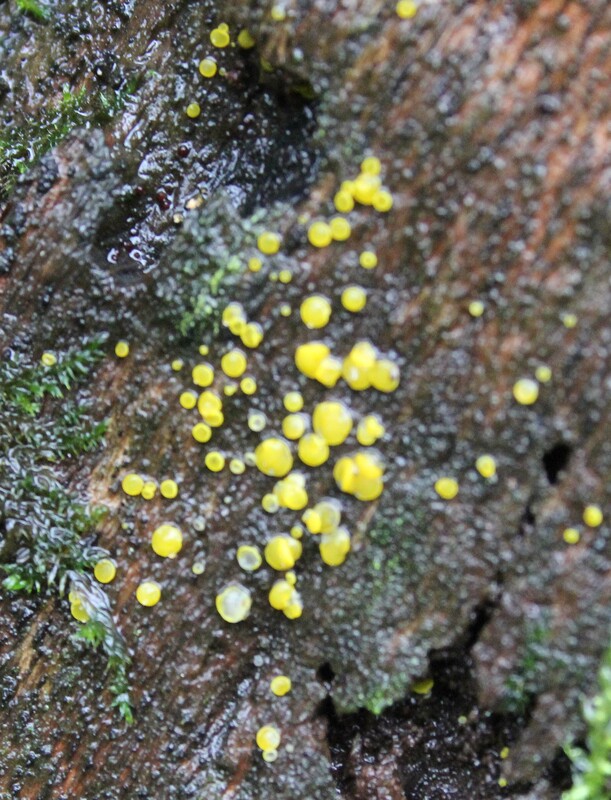 Slime Moulds are classified in the kingdom protista, along with algae and protozoans.